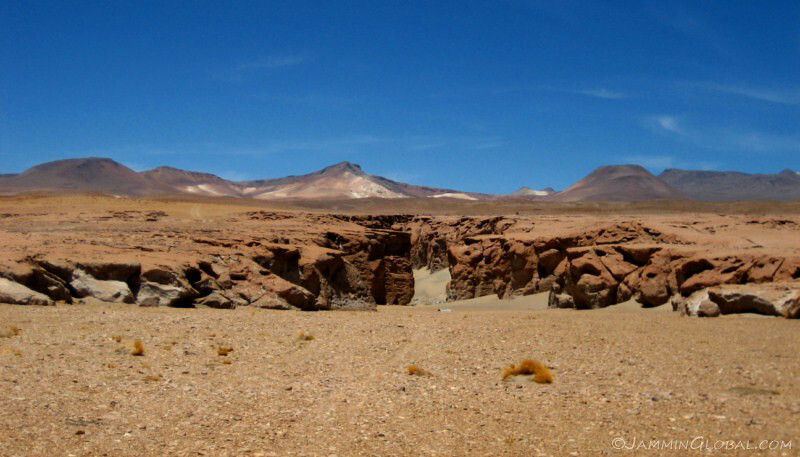 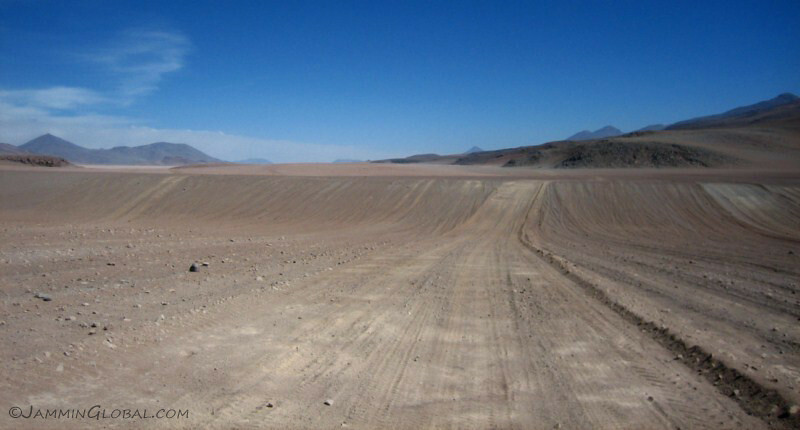 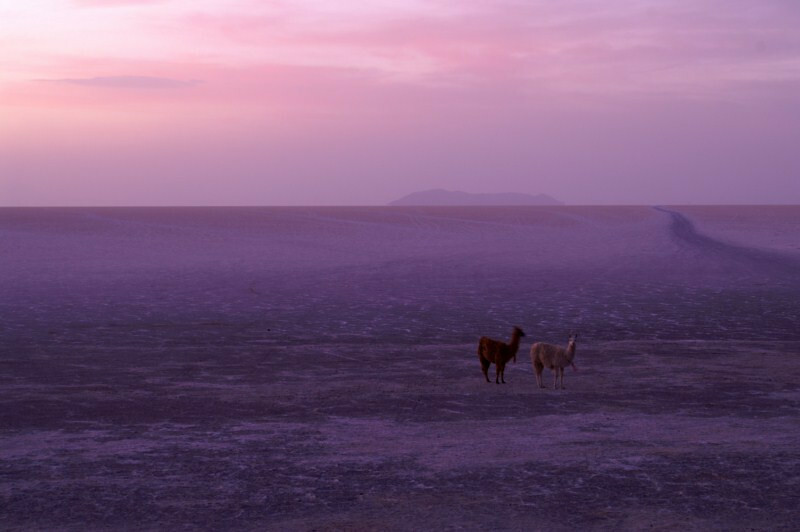 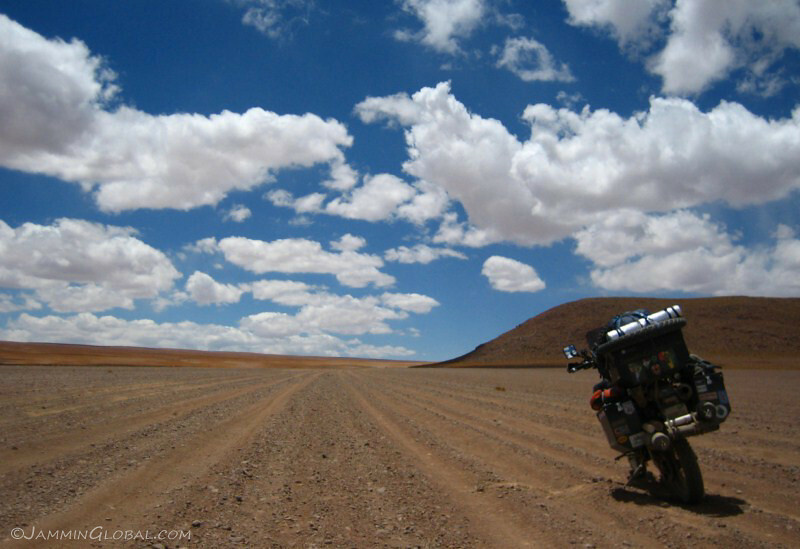 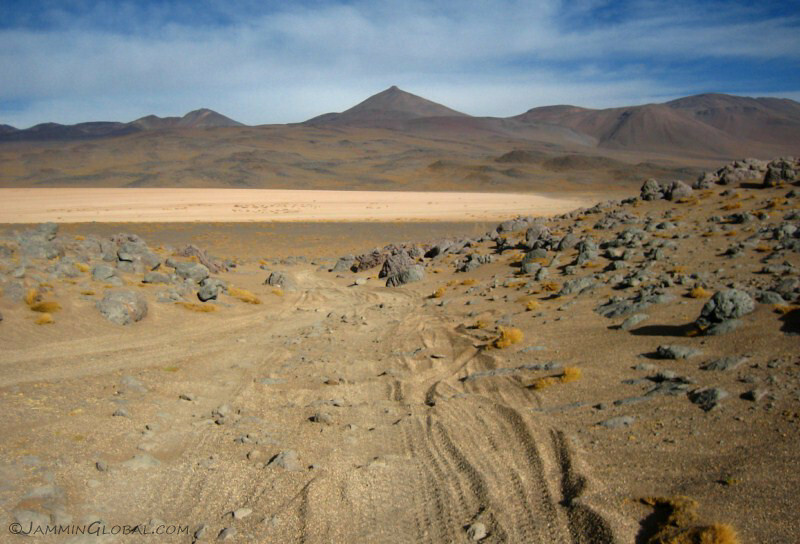 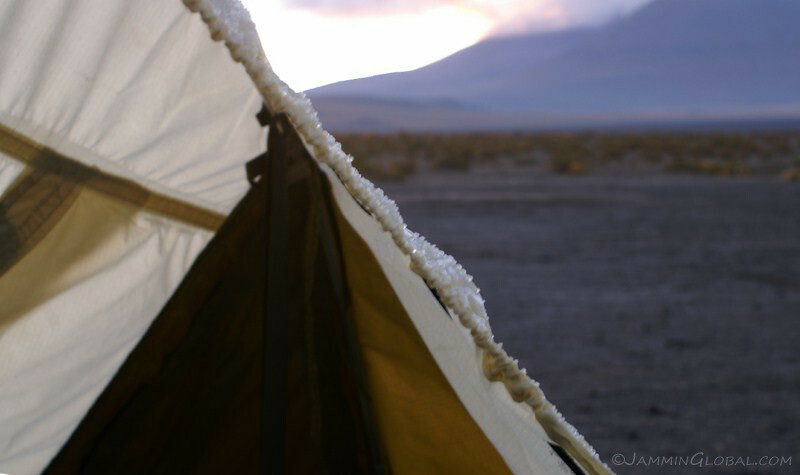 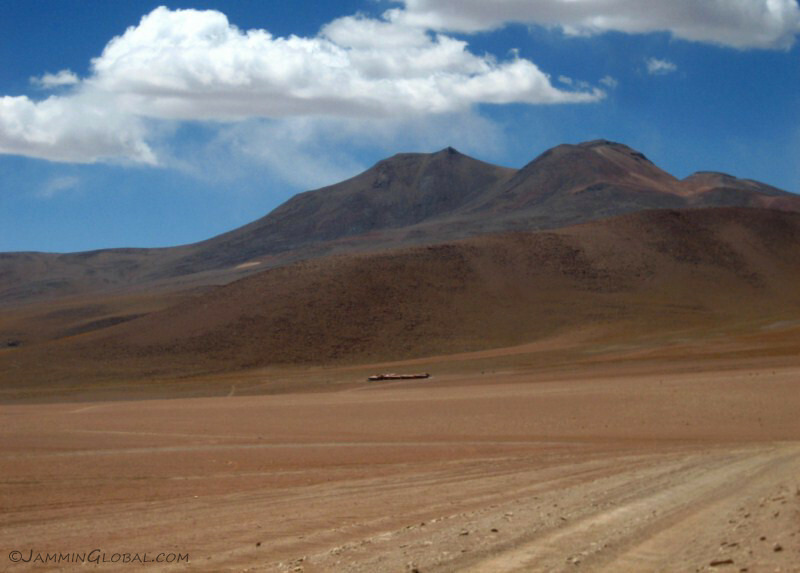 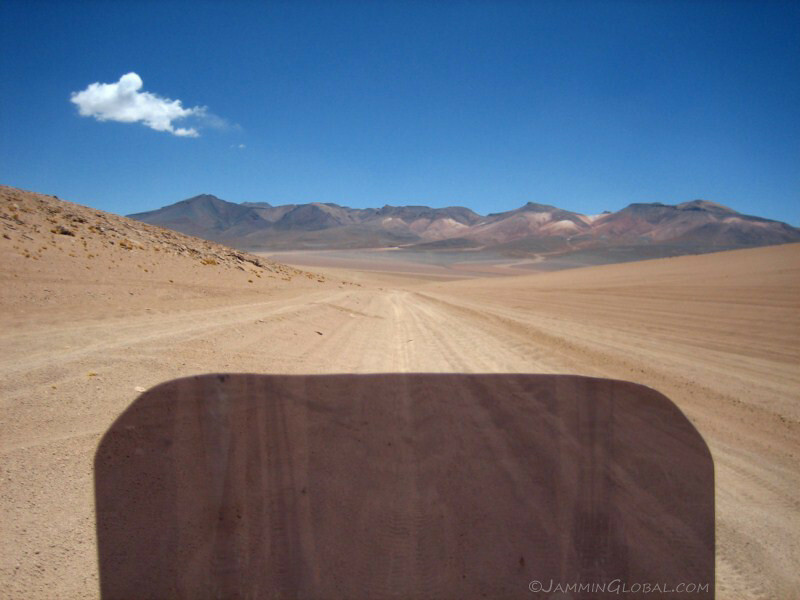 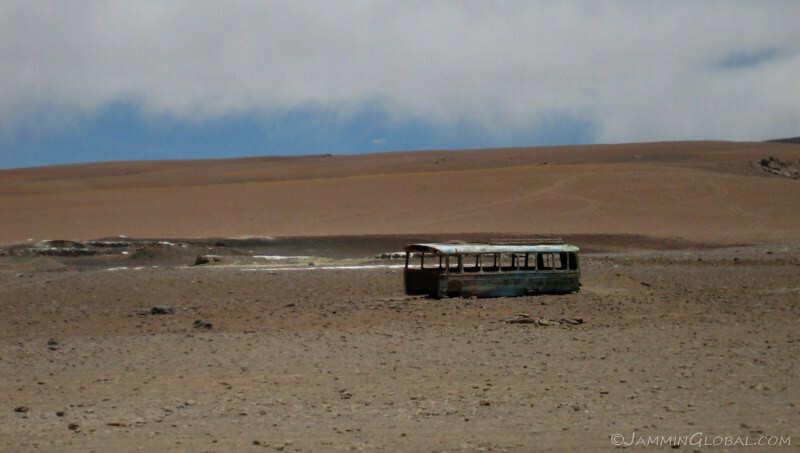 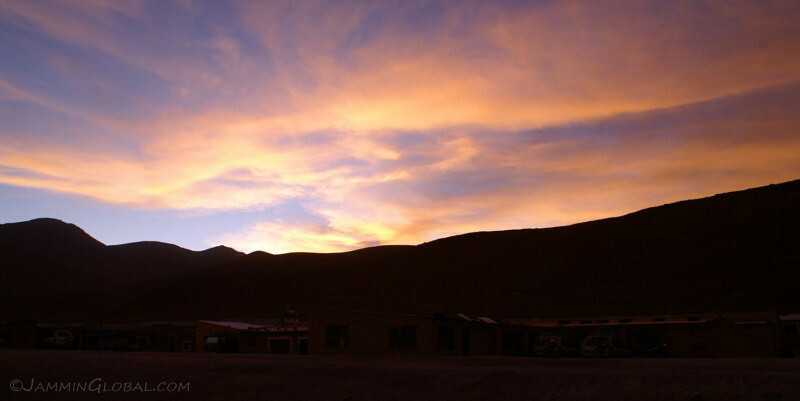 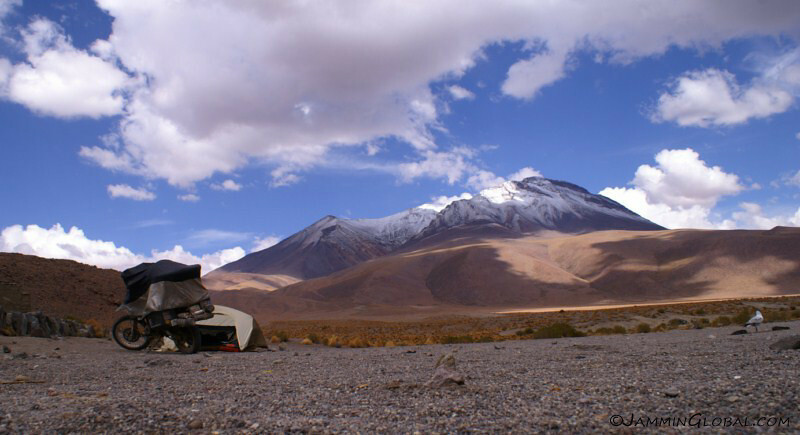 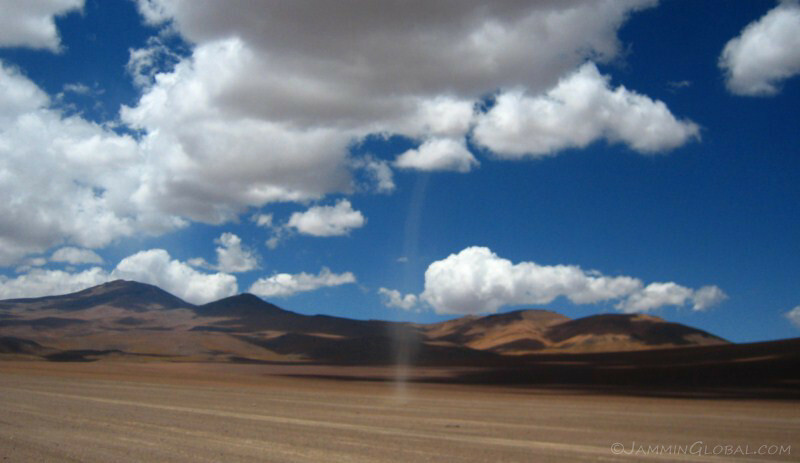 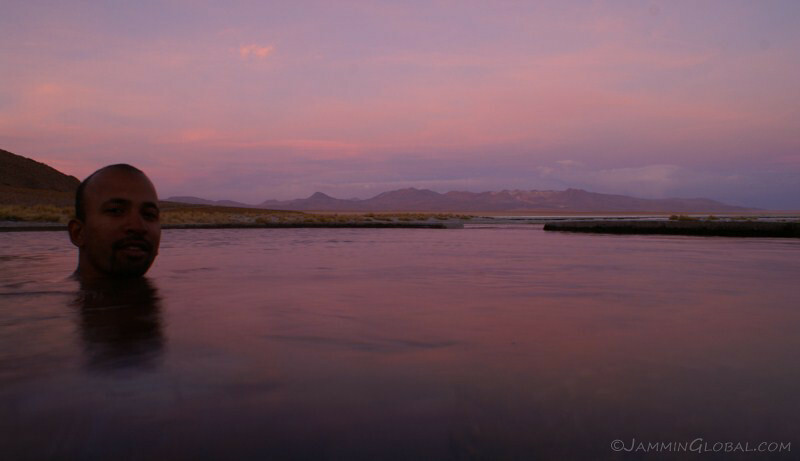 6 days across remote high-altitude southwestern Bolivia in a strange Mars-like landscape. 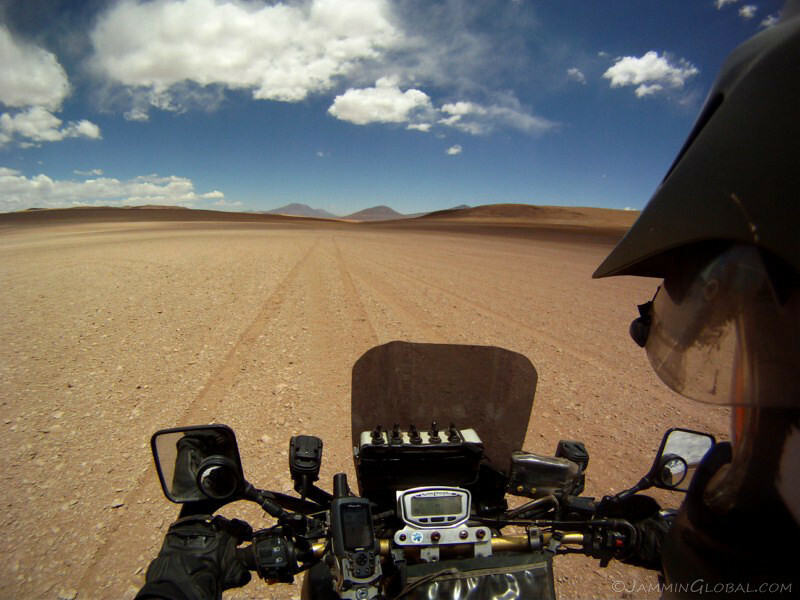 The toughest riding I’ve done with lots of deep sand and rocks for 500 kms. 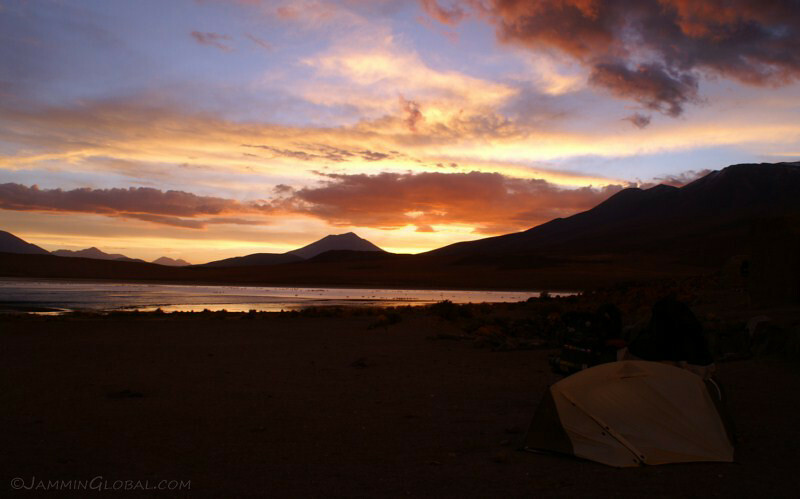 Epic views and camping. 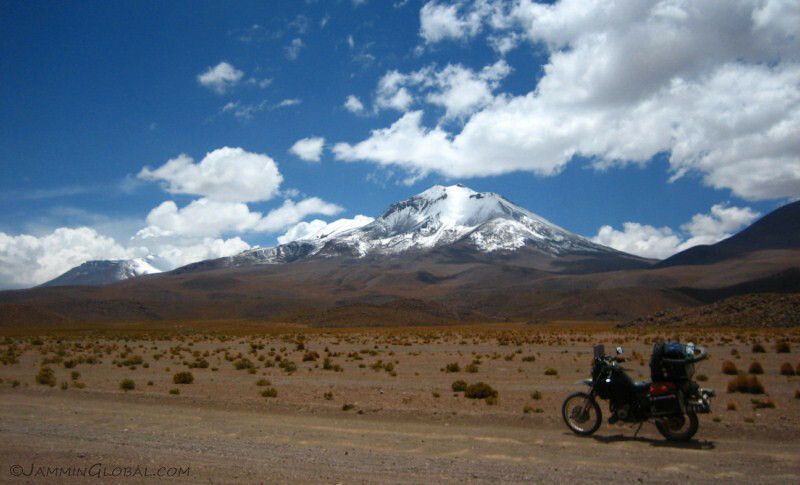 Average altitude was around 4,000 m (13,000 ft), peaking at 5,000 m (16,400 ft). 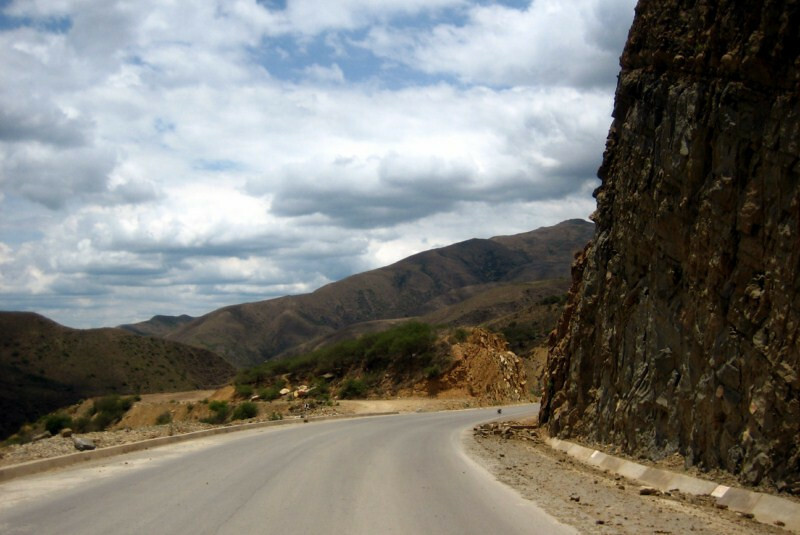 I spent a few days in Sucre, getting acclimatized and making final preparations for the Lagunas Route. 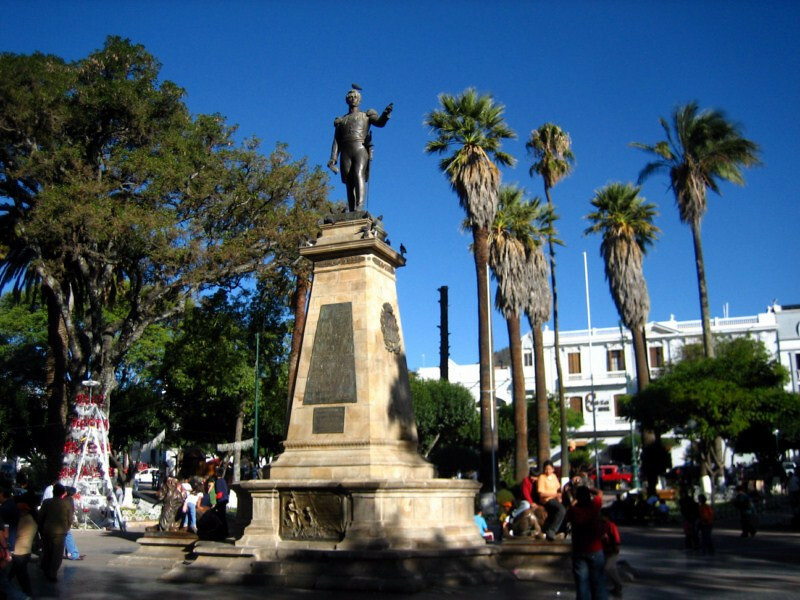 A prominent statue at the center of revolutionary leader Antonio José de Sucre, whom the city is named after. 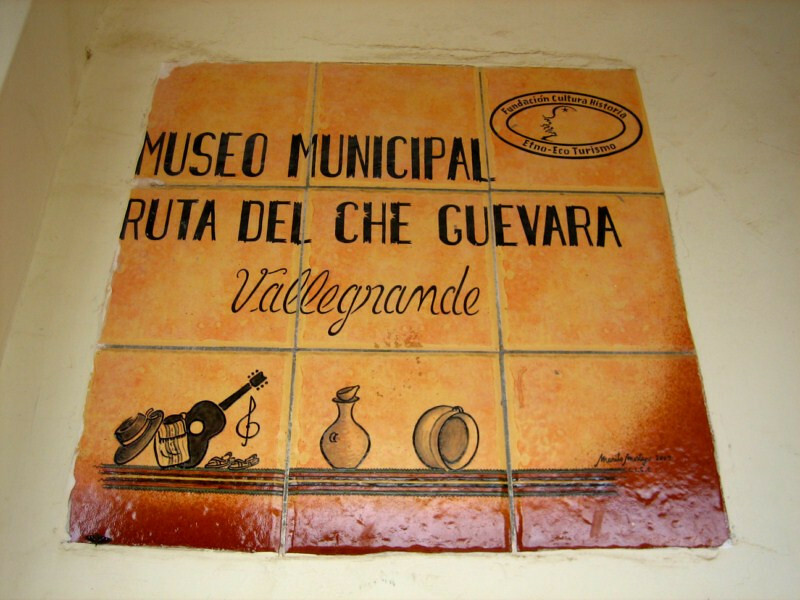 He was a Venezuelan general and the right-hand man of Simón Bolívar, who together orchestrated the liberation of the Spanish colonies from here north. 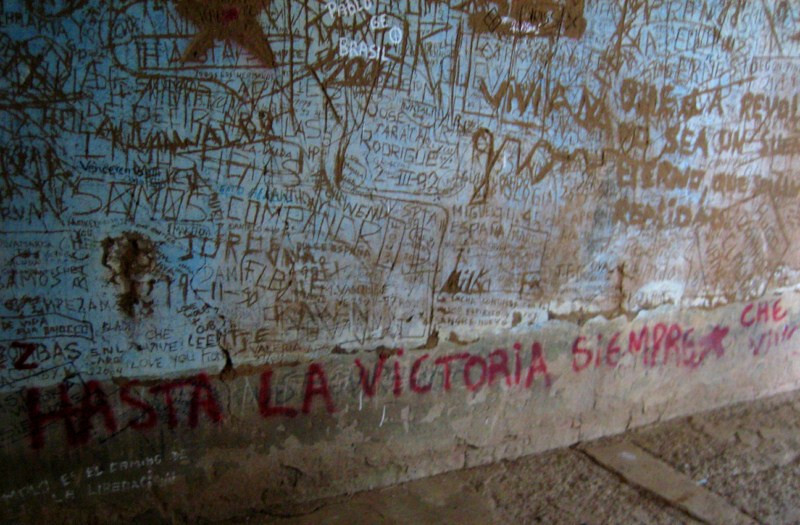 Sucre won the final battle in Ayacucho and thus liberated Alto Peru, which was later renamed as Bolivia, in honor of Simón Bolívar. 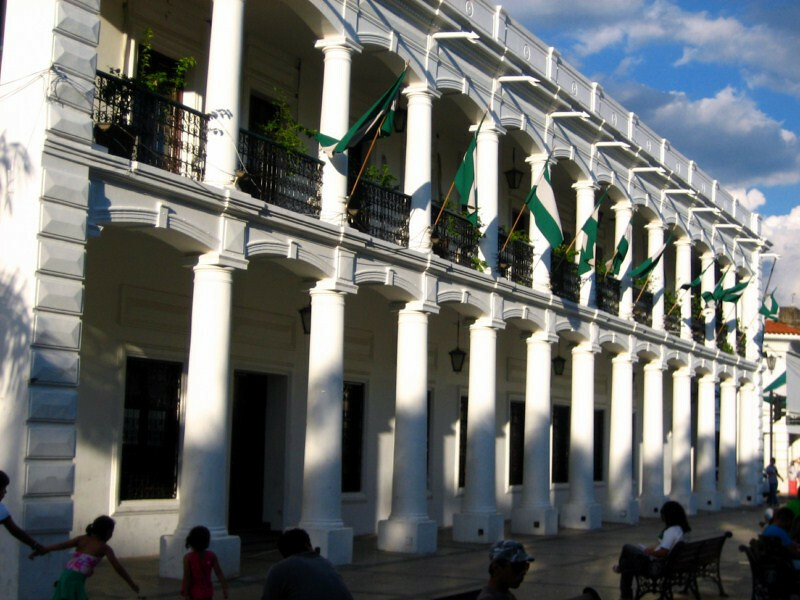 The government house, showcasing Sucre’s colonial architecture. 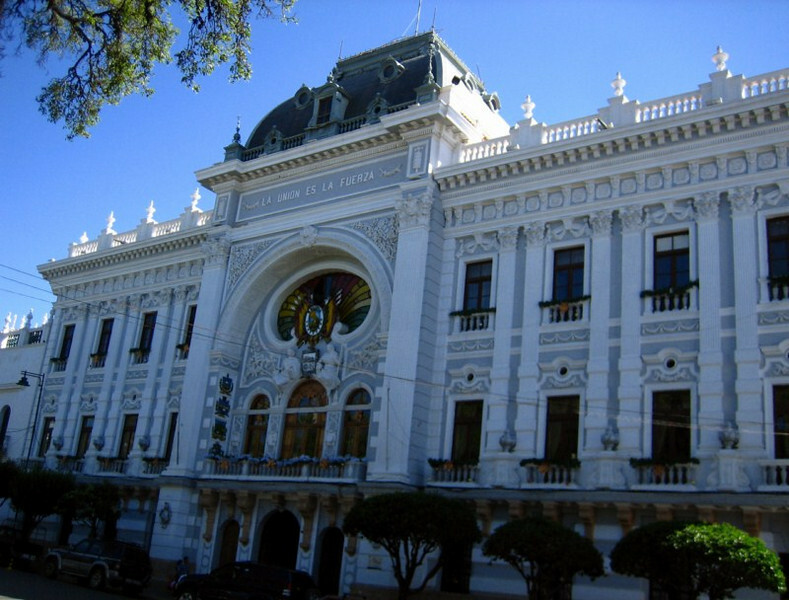 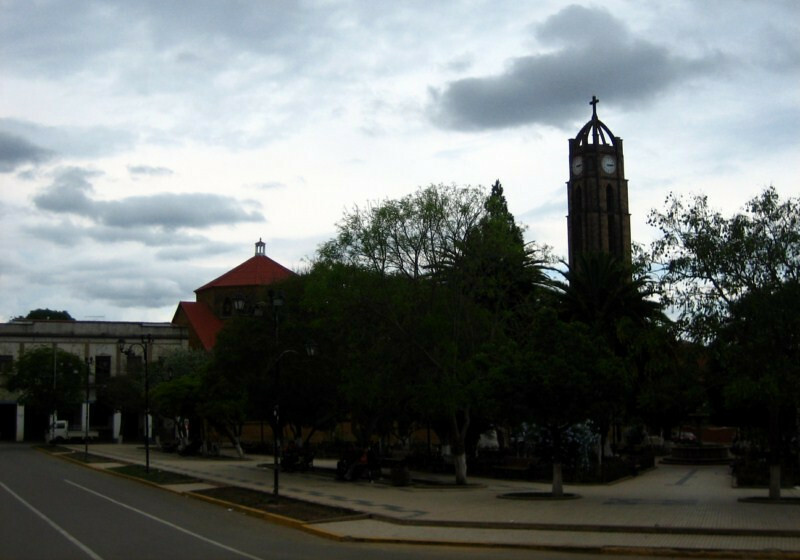 The city was founded in 1538 and features heavily in Bolivian history, being its capital initially and later relinquishing the title to La Paz, but still holding onto the seat of the judiciary, while the legislative and executive branches moved to the new capital. 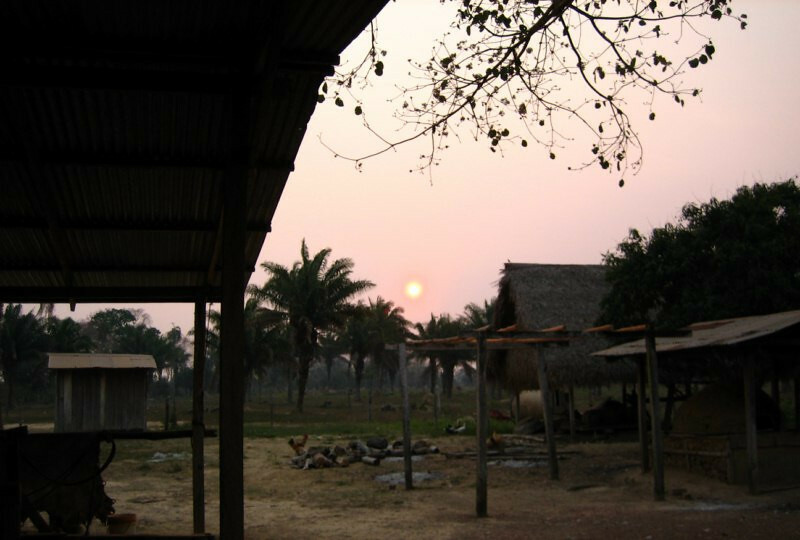 Nearing on almost half a millenia of continued inhabitation, it’s amazing that so much of its colonial past has been preserved. 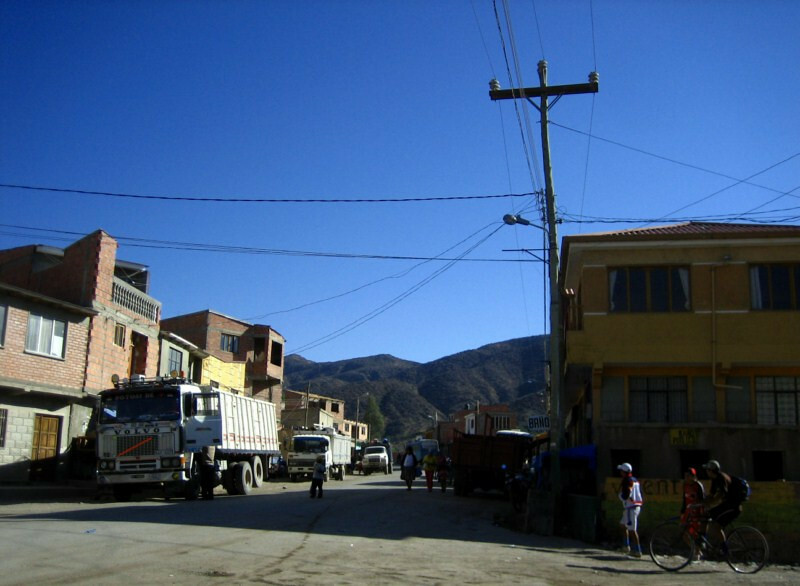 The city has sprawled out into the nearby mountains, but the center still retains much of its architectural glory, typified by whitewashed buildings. 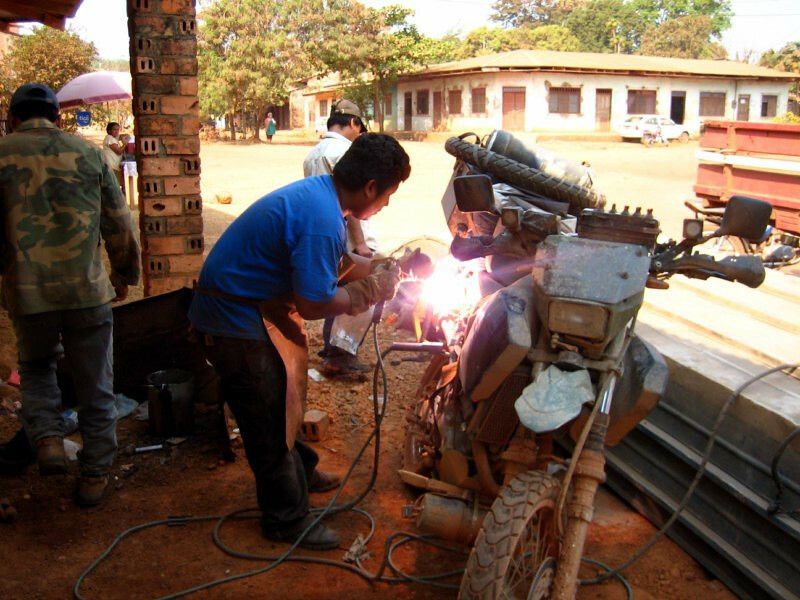 After welding up a small crack in my pannier frame (from the cobble-stoned road), I figured this was a good place to finally fix my shortened side stand. 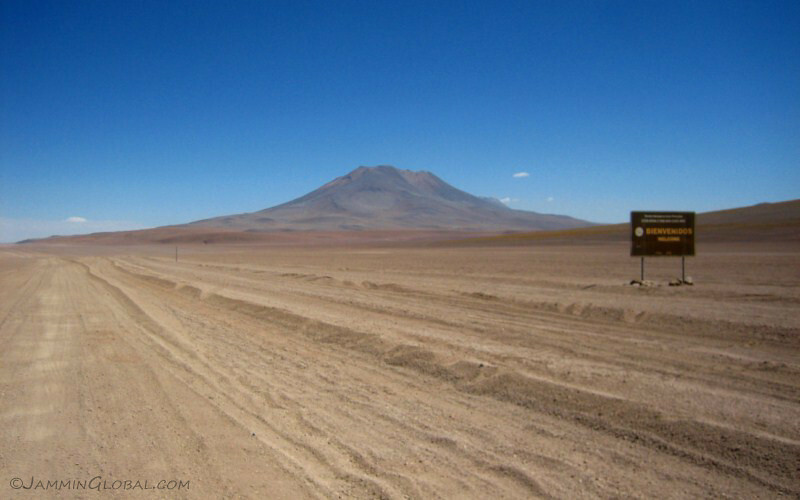 I had cut off an inch of it before the trip since it appeared too long with the weight of all the luggage. 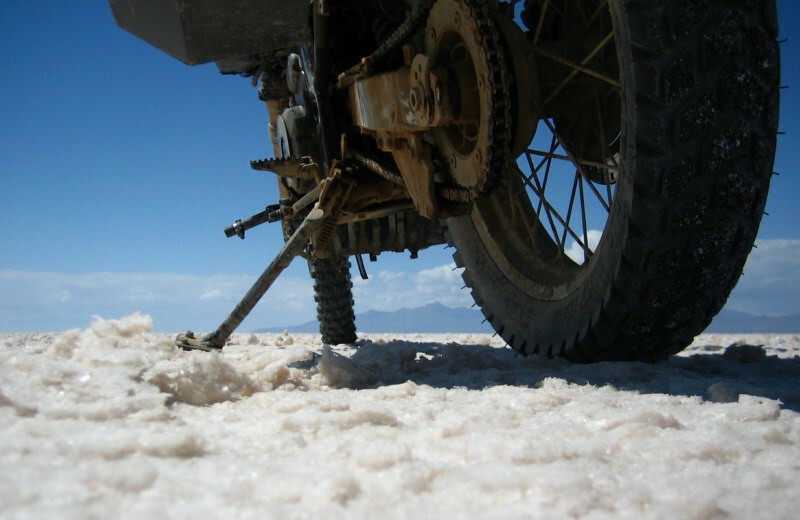 However, I later realized that cranking up the compression of the rear spring was the correct way to compensate for the heavy load and this in turn raised the rear of the bike, making it precarious to park with the shortened side stand. 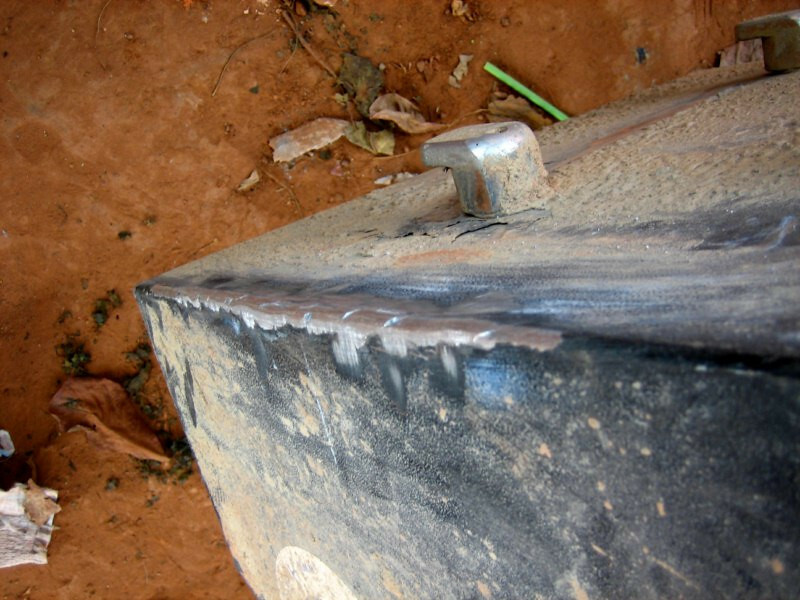 I made a temporary fix in São Paulo by adding a few extension bolts but here I could correct it properly. 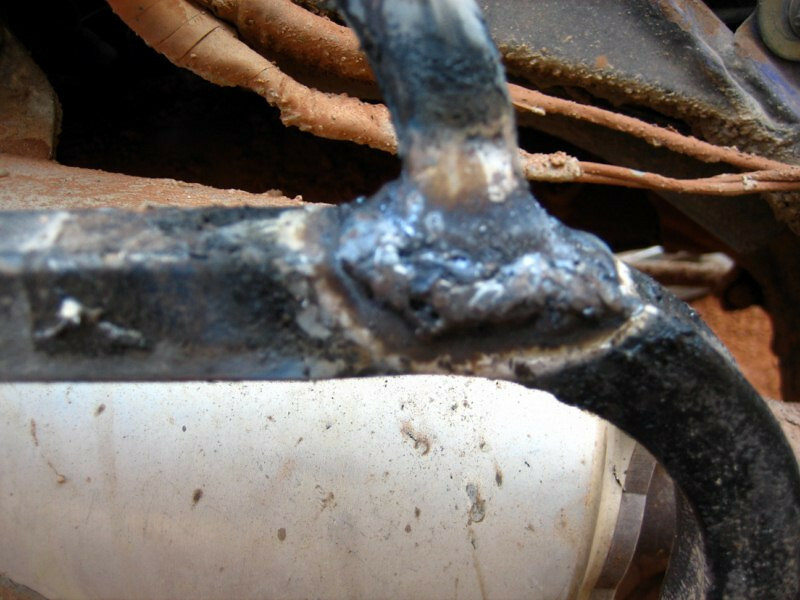 The welder spliced in an inch of steel tube and did a good job. 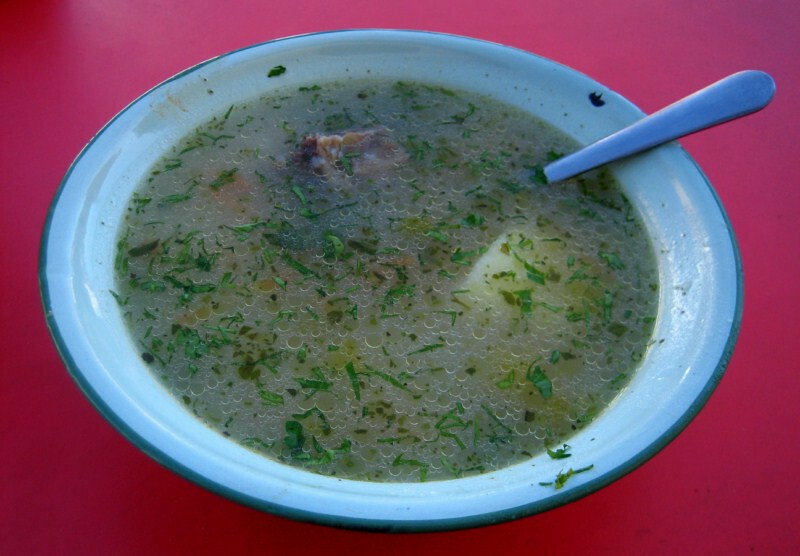 All for B40 (US$6). 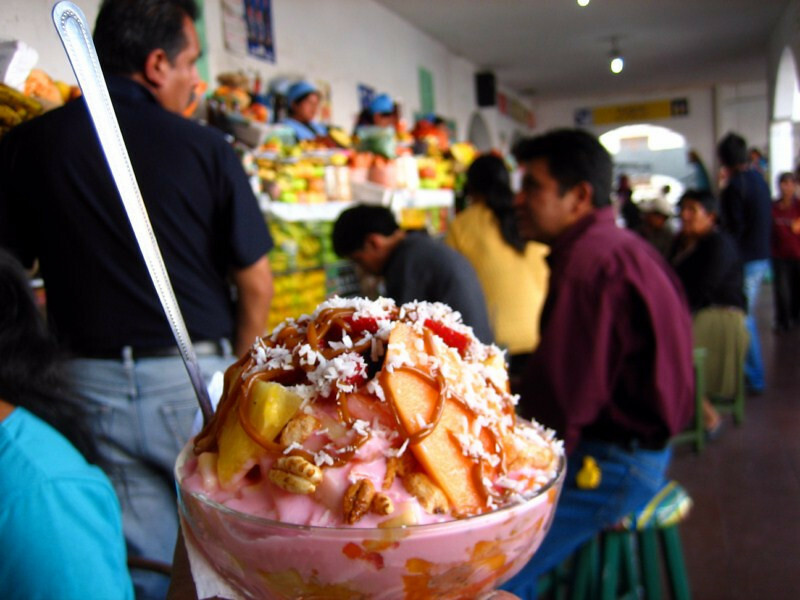 Having a huge bowl of fruit salad for lunch, for B6 in the central market. 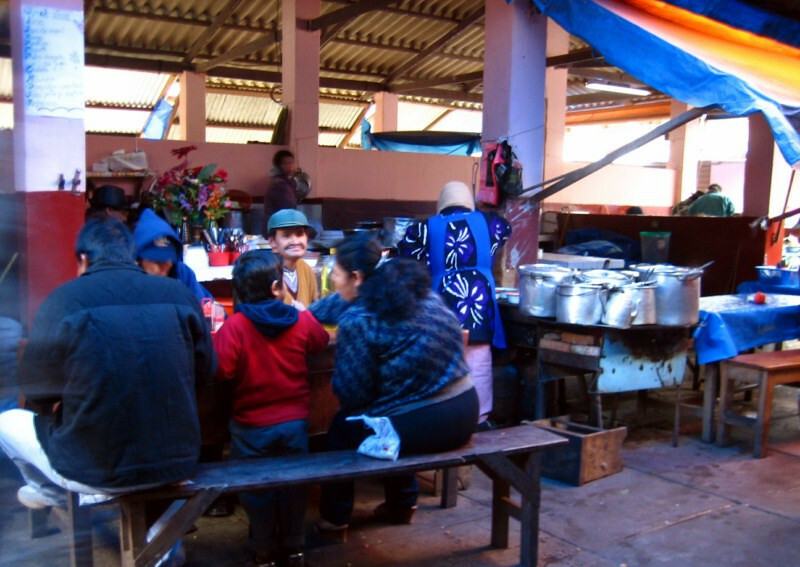 This was a common sight in most Bolivian cities; stalls selling fresh fruit juices and salads with yogurt and granola. 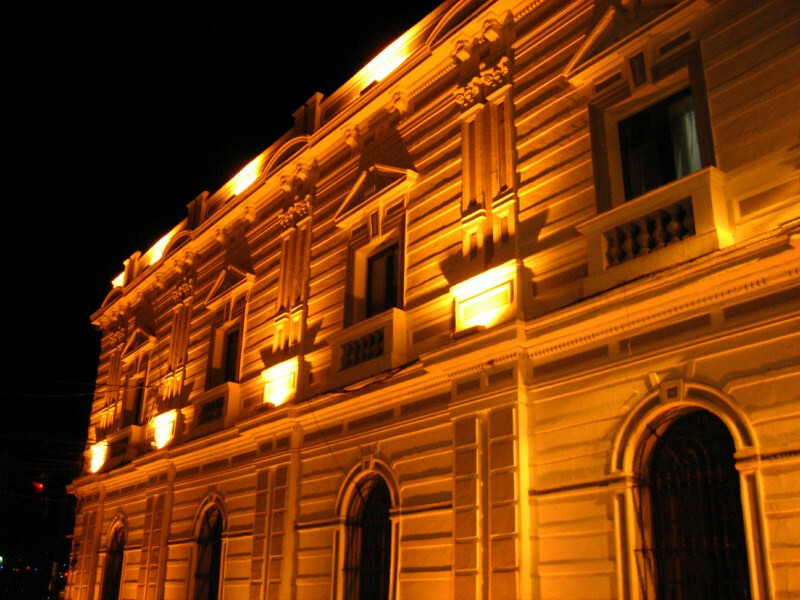 At night, the lit-up whitewashed buildings glow in all their grandeur. 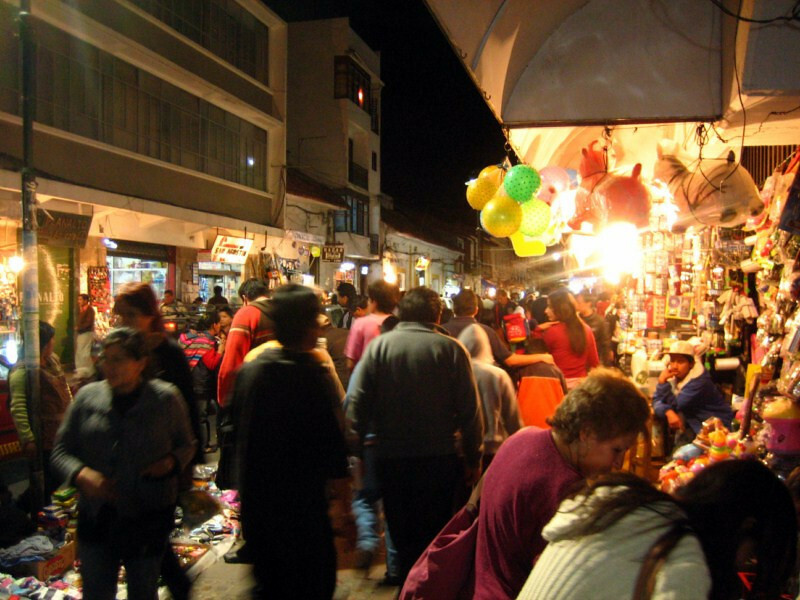 The street markets come alive at night as people are heading home. 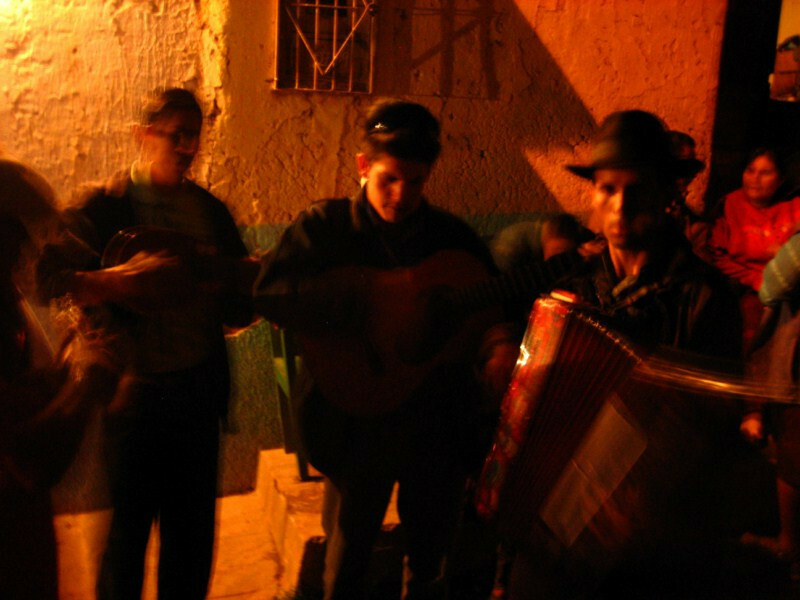 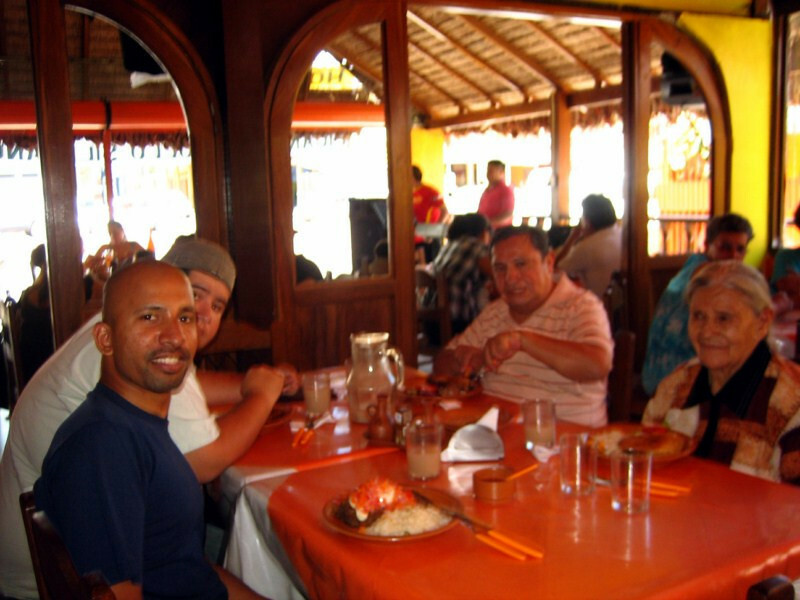 Eating at the mercado is usually the cheapest option but this is also primarily a daytime activity. 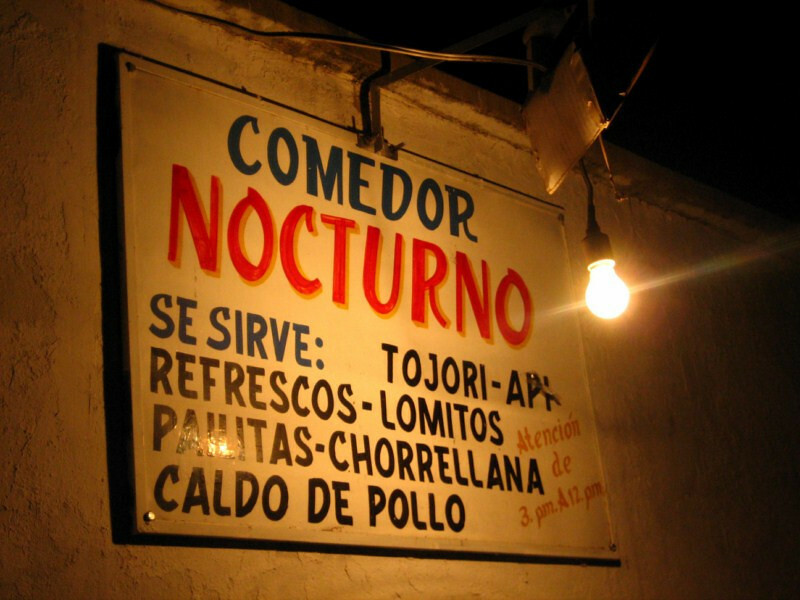 Strolling around the center, looking for a cheap place to eat at night, I was directed to a back entrance of the central market to the Comedor Nocturno (night food court), that runs after the market usually shuts down from 3 pm to midnight. 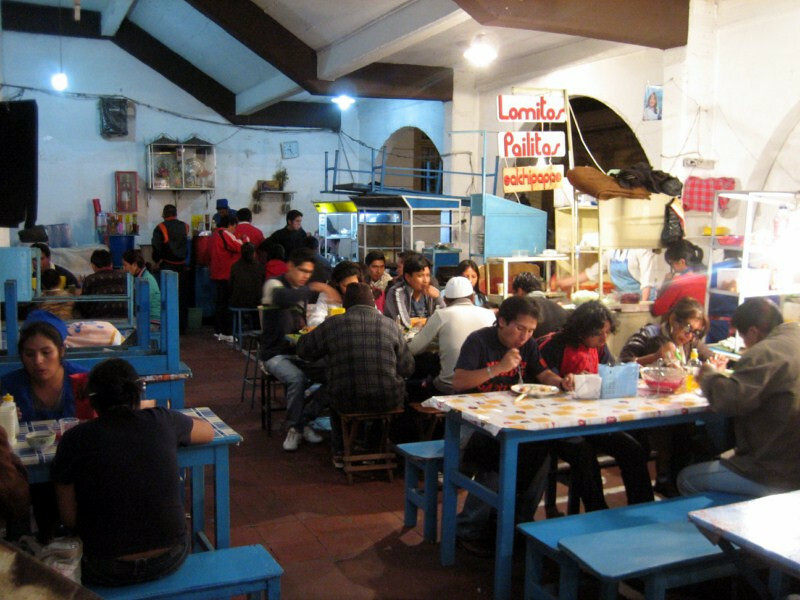 The comedor consists of numerous stalls with each table run by a different family. 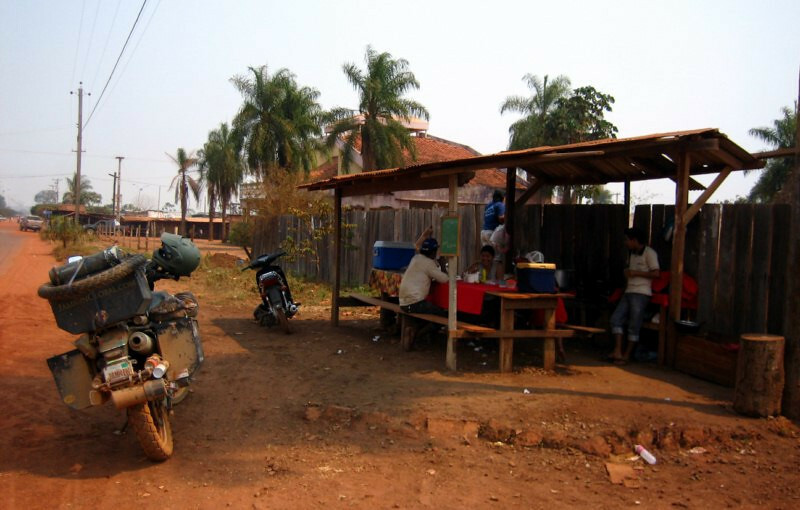 And they’re all jousting to get your business, but it’s hard to pick a table when they’re all serving the same items at the same price, so just sit down anywhere. 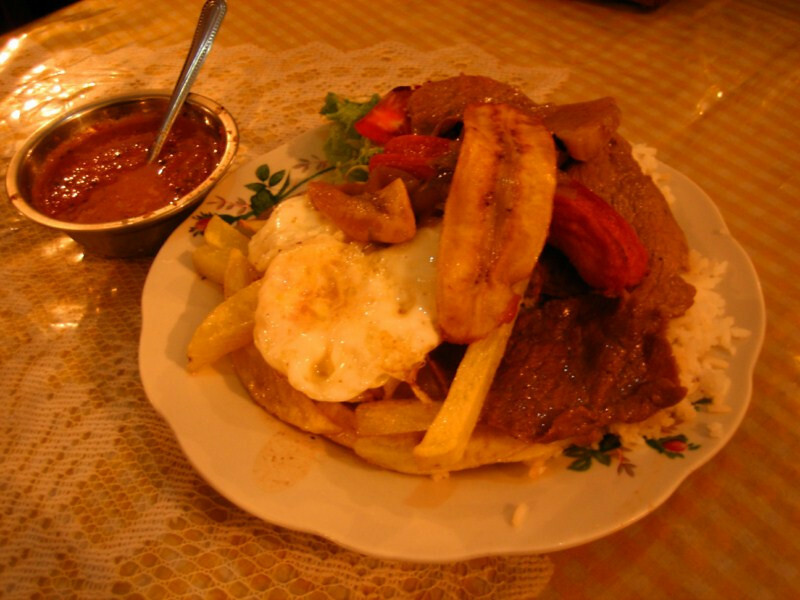 This is the typical meal, lomitos, consisting of a piece of fried beef served on rice and french fries with a fried egg on top with fried plantains and a nominal salad, all for B10. 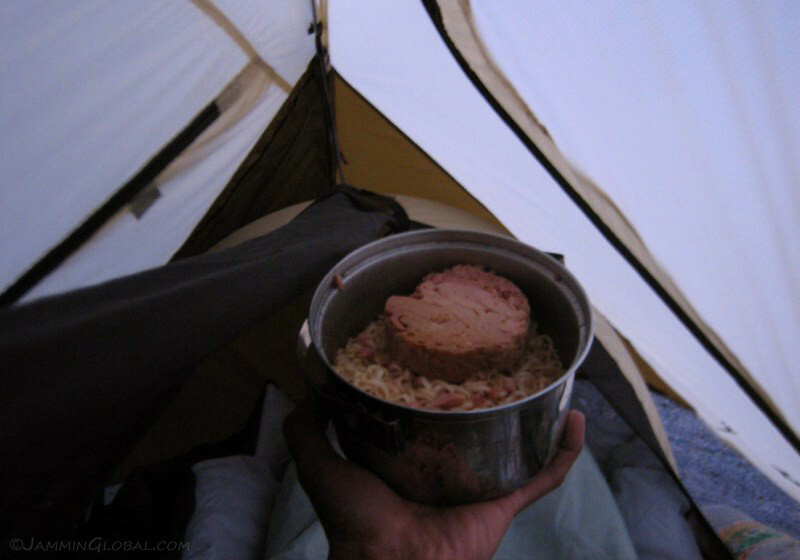 It’s tasty, but oh so greasy. 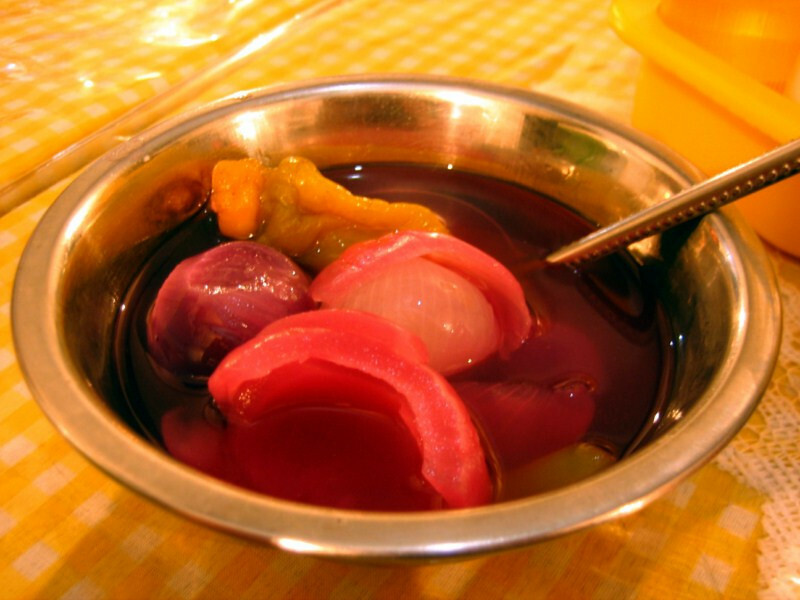 And the tables come with pickled vegetables, which I added to supplant the salad. 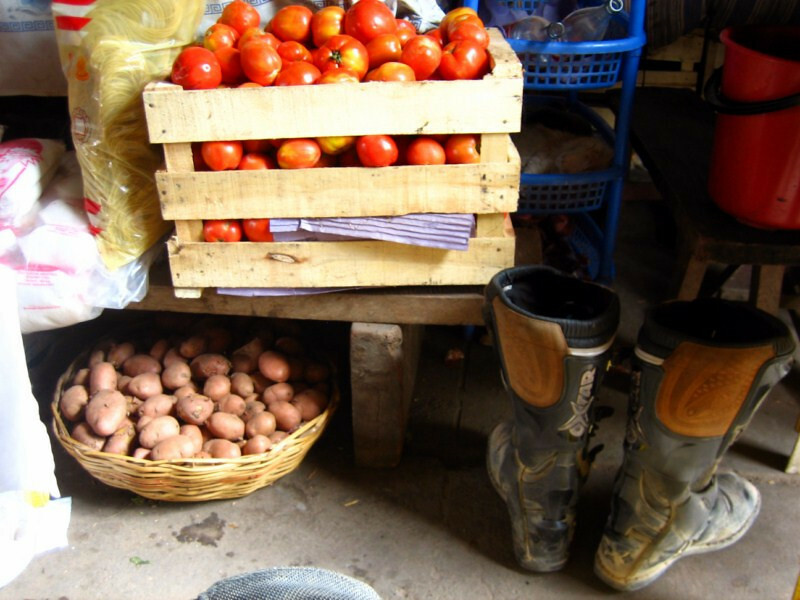 There were onions, sweet peppers and even radishes. 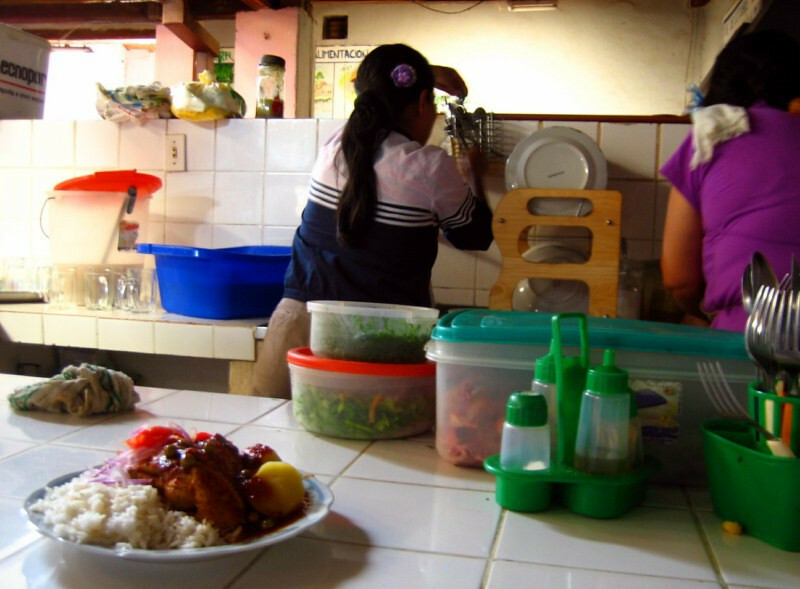 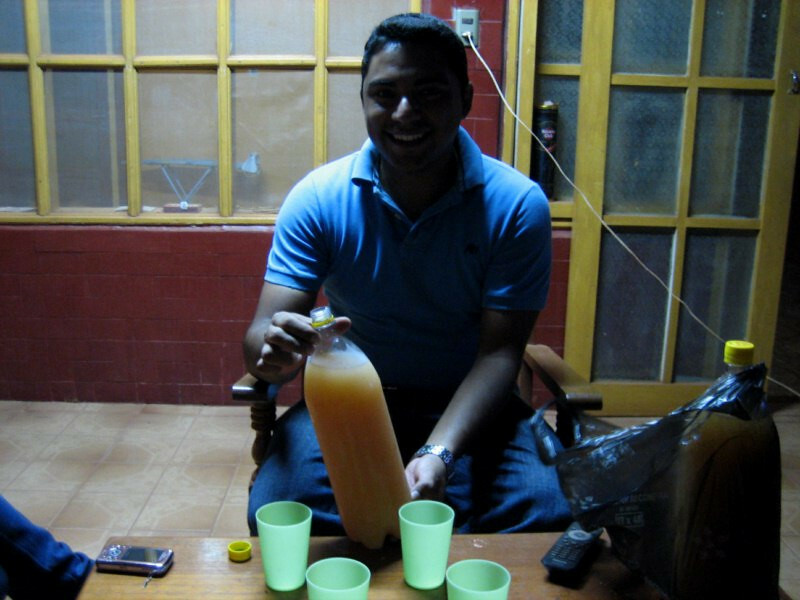 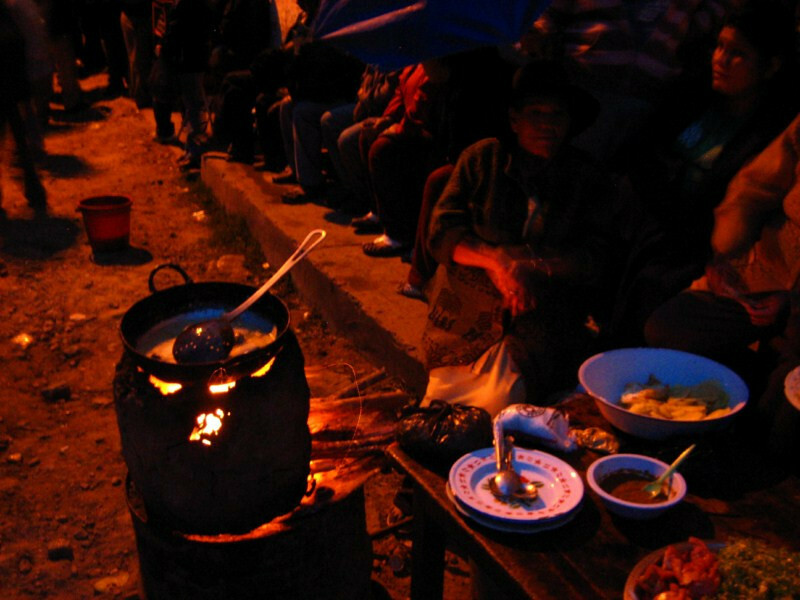 Plus, Bolivia understands hot sauce and it’s widely available where food is served, usually homemade and very spicy. 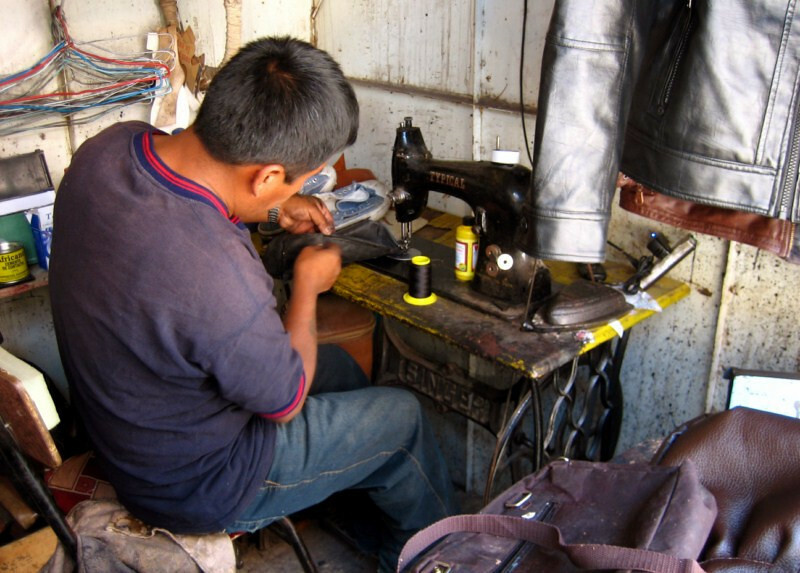 At the mercado campesino (street market for the normal folk) stitching up my five year old toiletry bag, which was bursting at the seams and was held up with staples for the longest time. 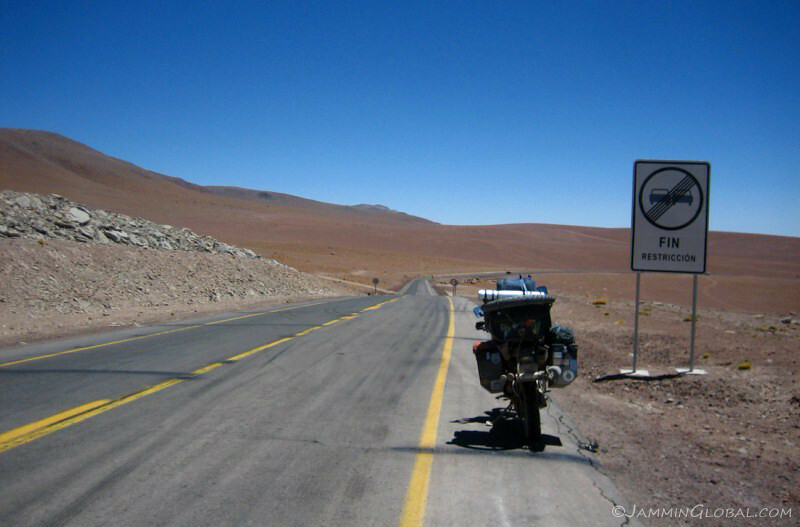 I figured this was the last stop to get things repaired before I entered Chile and Argentina. 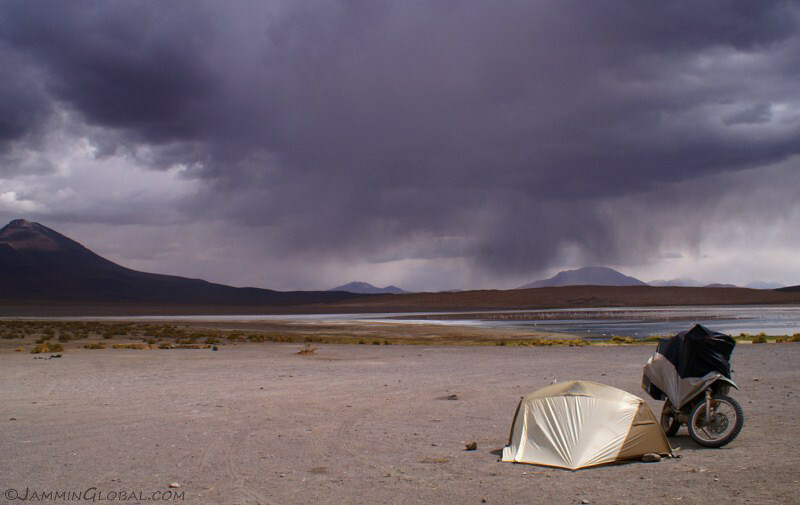 I also managed to find a real goose down sleeping bag for around US$30, as I would need that for the cold nights at high altitude on the salar and into the Lagunas Route. 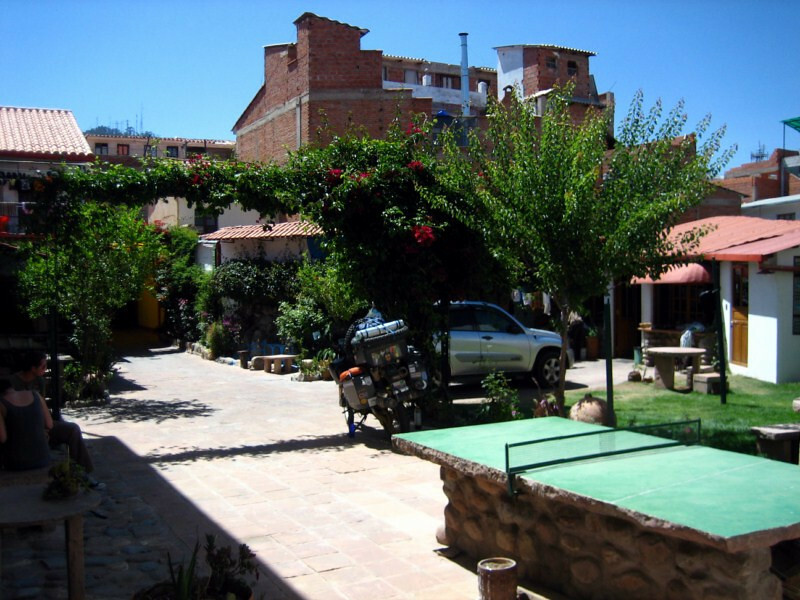 Spending a few days at Hotel Pachamama, which was recommended by other bike travelers. 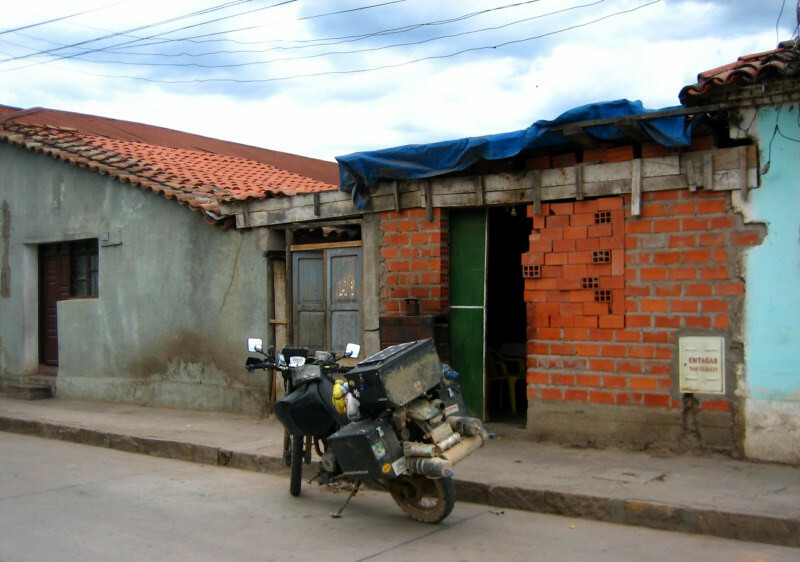 A bed could be had for B40 a night with courtyard parking for the bike, hot showers and prime location between the center and the mercado campesino. 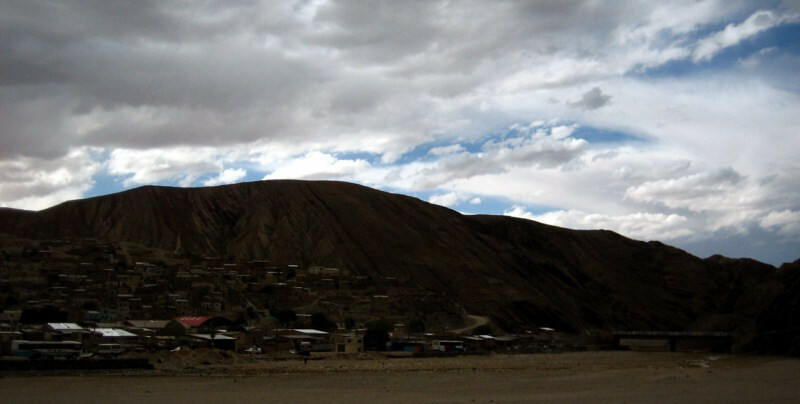 As Sucre is located at around 2,800 m (9,200 ft), it was a good place to acclimatize to the elevation and walking the hills around town was a good way to introduce my blood to the reduced oxygen up here. 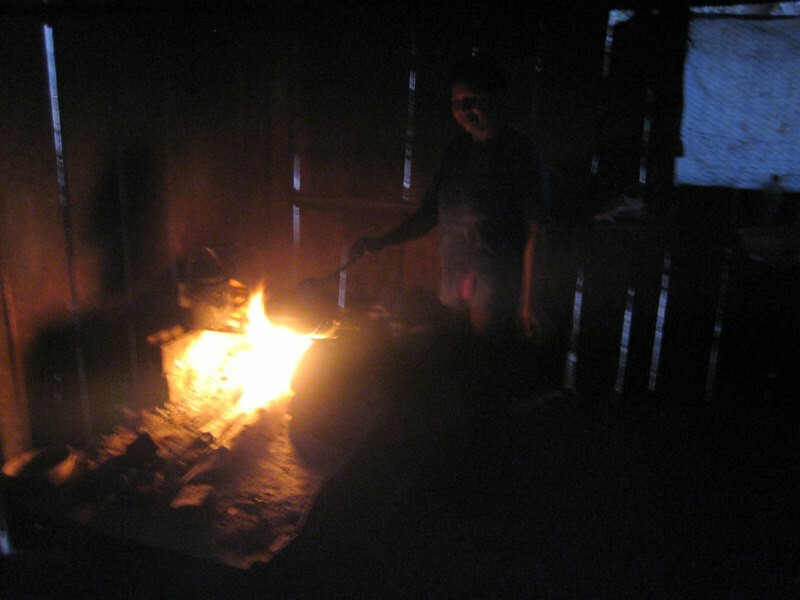 I also adjusted sanDRina’s air/fuel mixture in the carburetor by reducing the flow of fuel to get the combustion mixture as close to stoichiometric as possible (14.7 molecules of oxygen for 1 molecule of hydrocarbons). 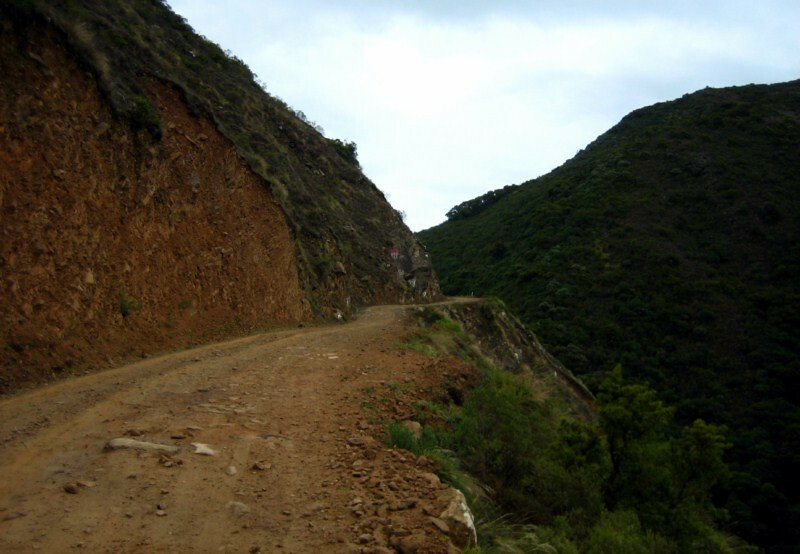 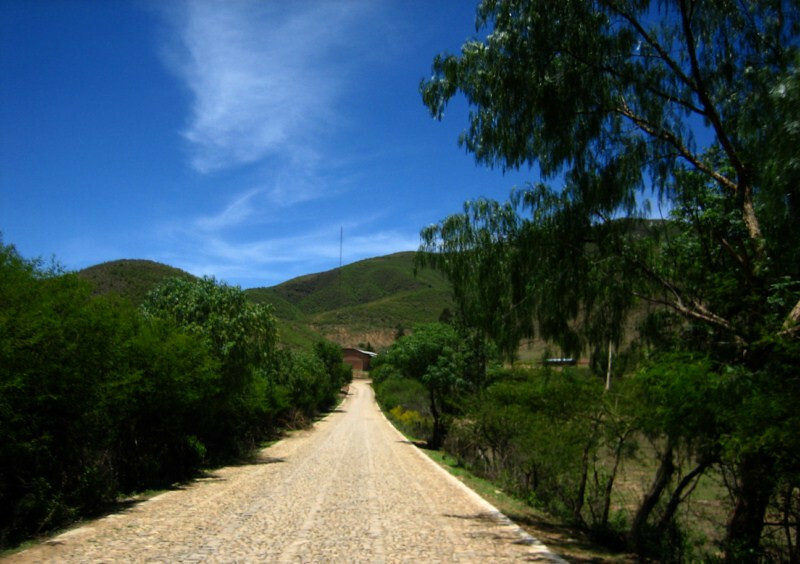 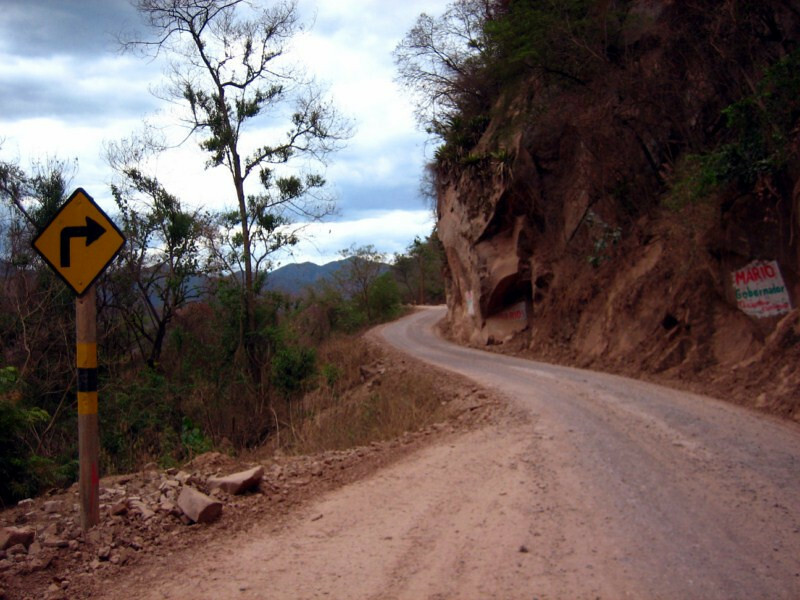 Heading out from Sucre, the road climbs steadily up to Potosi. 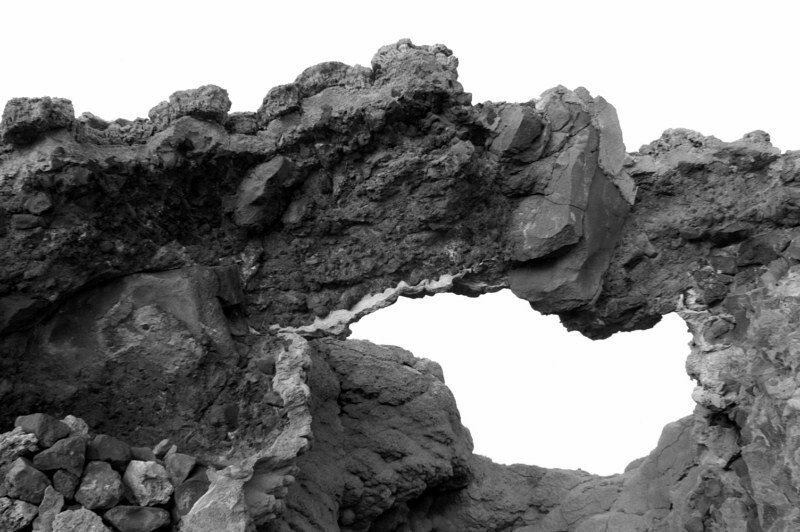 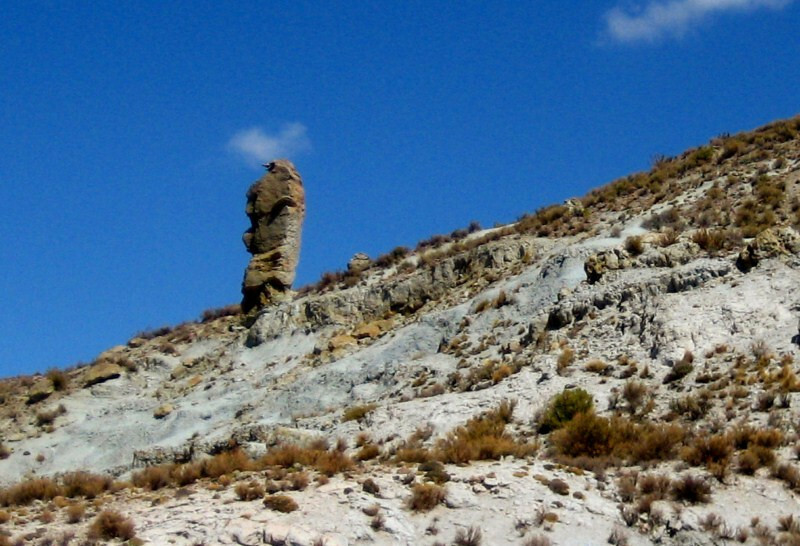 A taste of the geological wonders from here on. 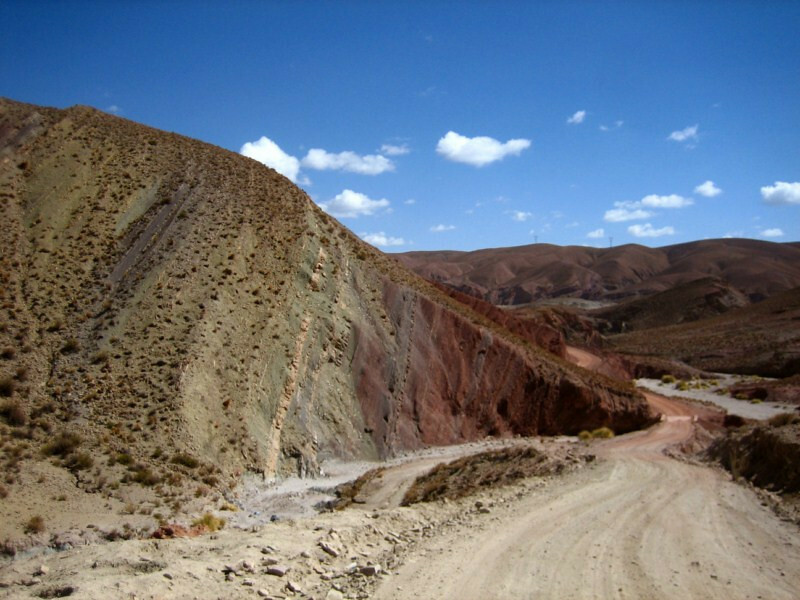 Flat sedimentary layers pushed almost vertical as the South American plate steadily crashes into the Nazca and Pacific plates. 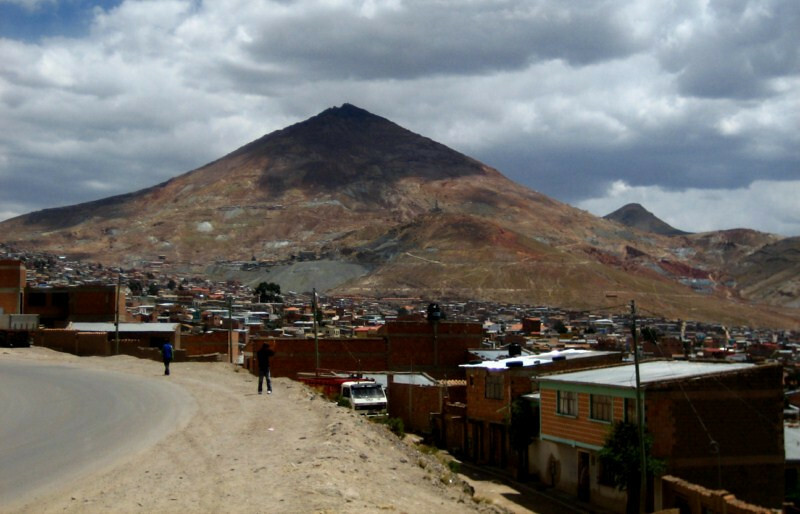 Cerro Rico and the world’s highest city of Potosi at 4,070 m (13,350 ft). 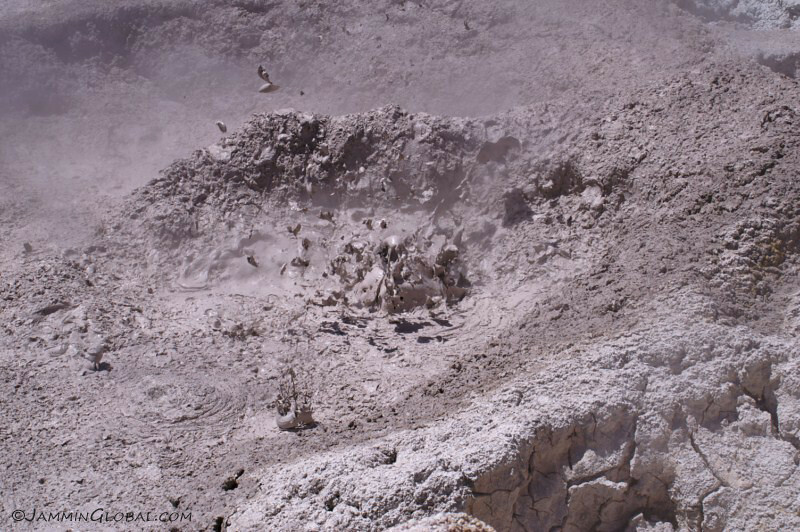 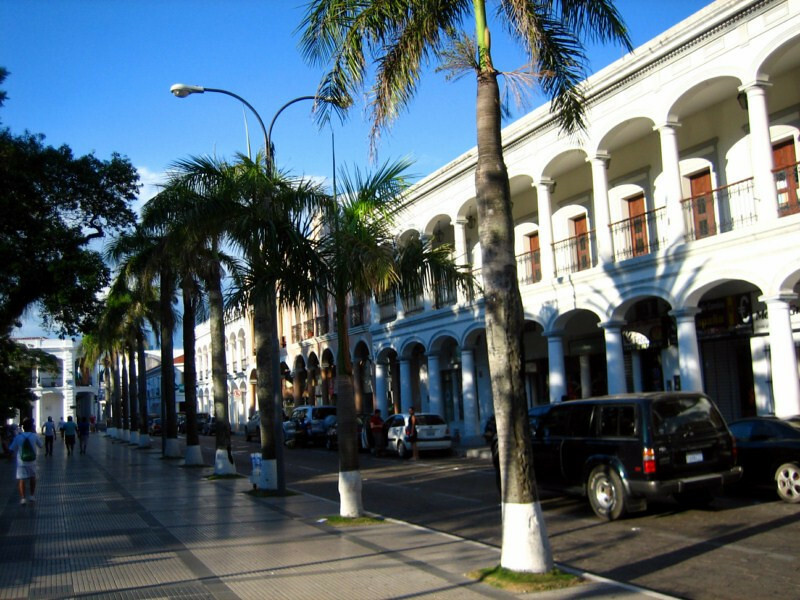 The discovery of huge quantities of silver in 1545 made this the richest city in Latin America by the 19th century and this location alone bank-rolled the entire Spanish empire for nearly two centuries. 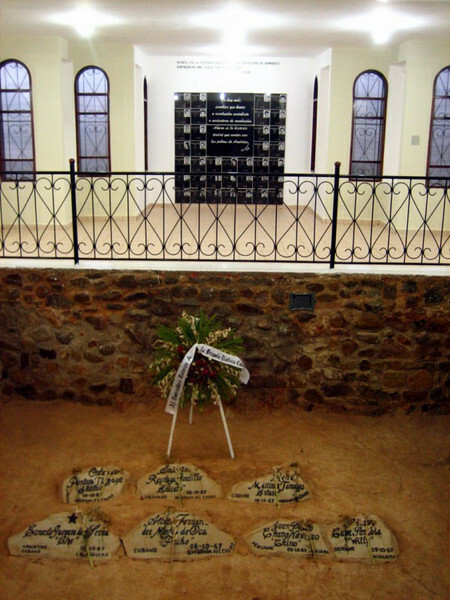 Millions of indigenous people and African slaves were forced into the bone-chilling mines to create wealth for the colonial powers. 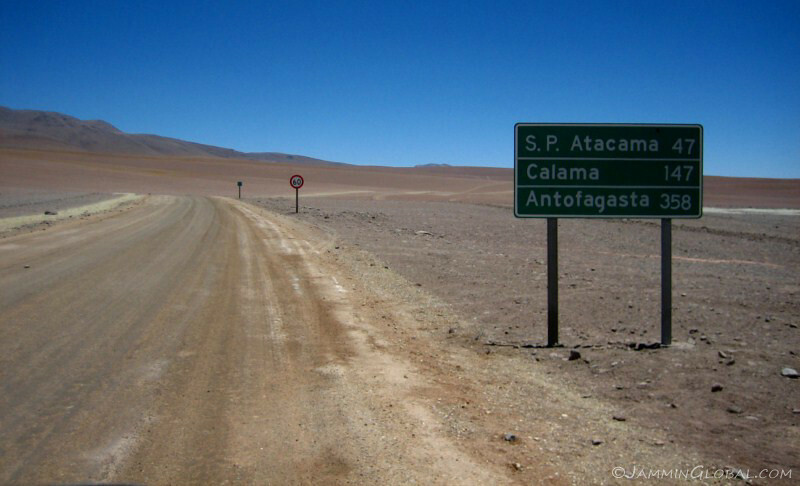 Most of the towns I passed through in northern Argentina were setup along the supply route to Potosi from the port at Buenos Aires. 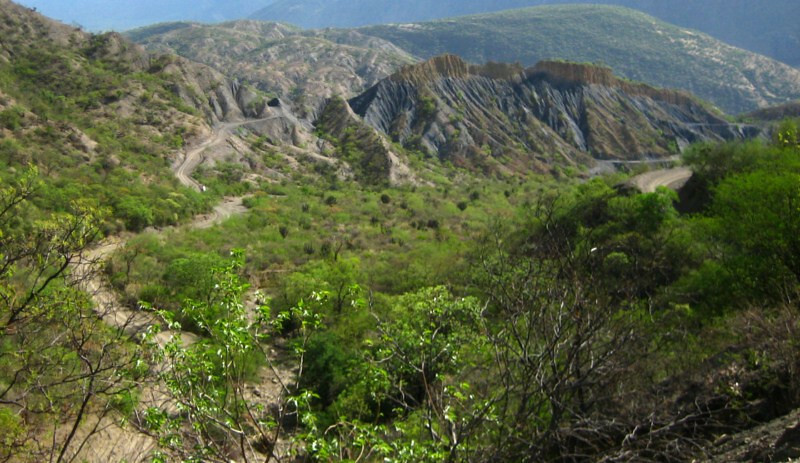 Just think, if it wasn’t for the discovery of exploitable natural resources, where would the colonial powers be today? 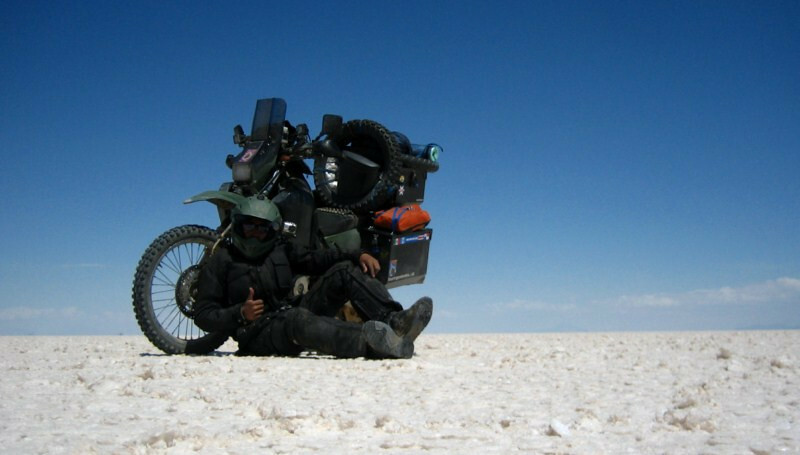 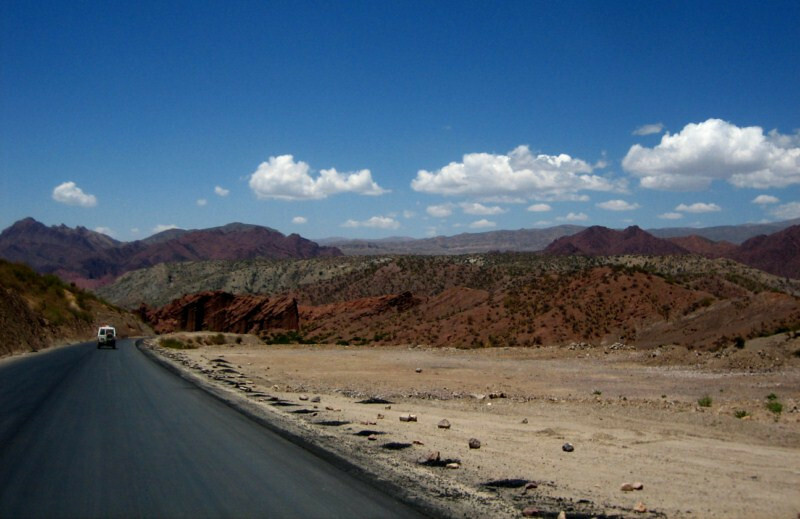 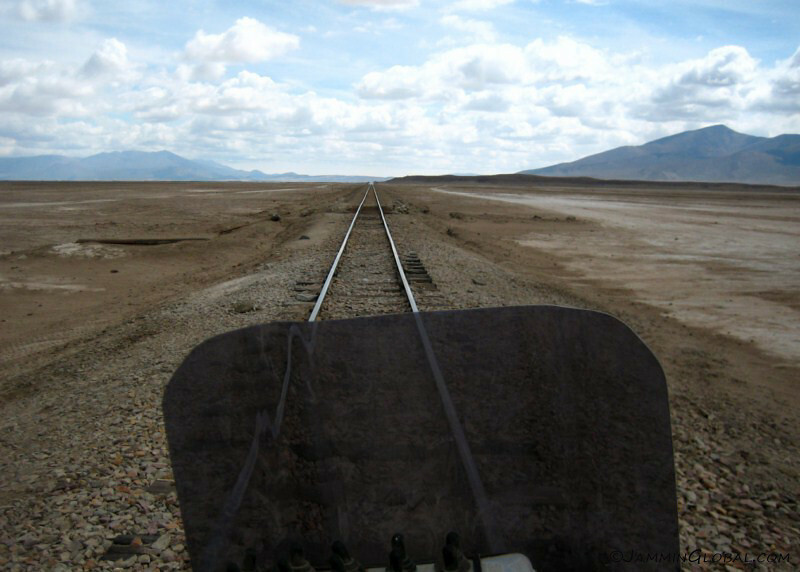 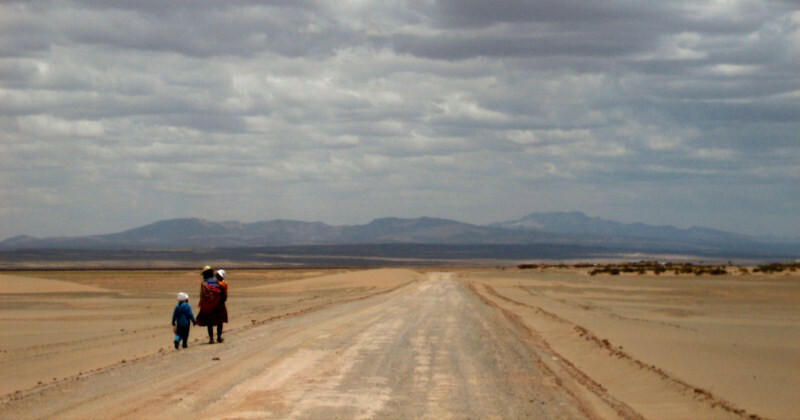 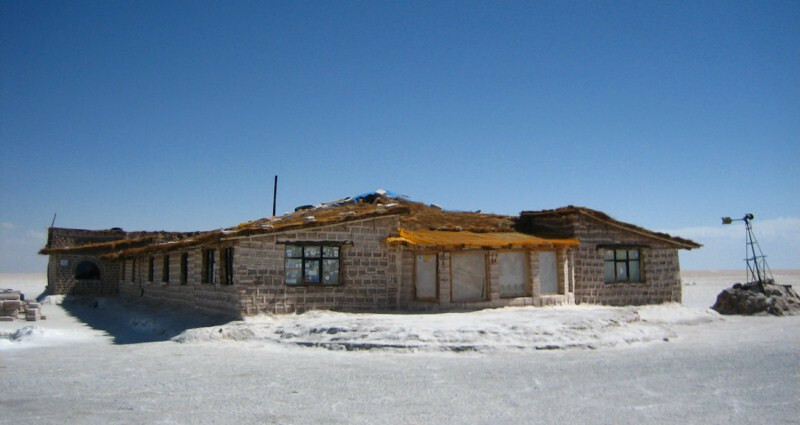 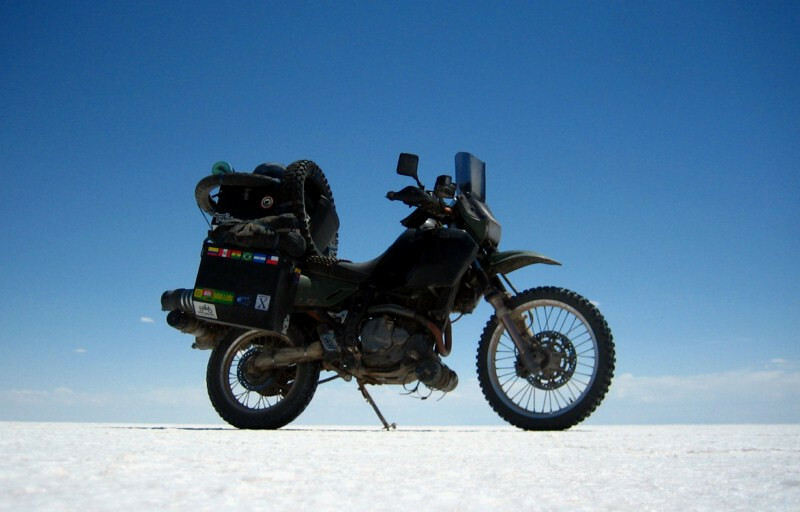 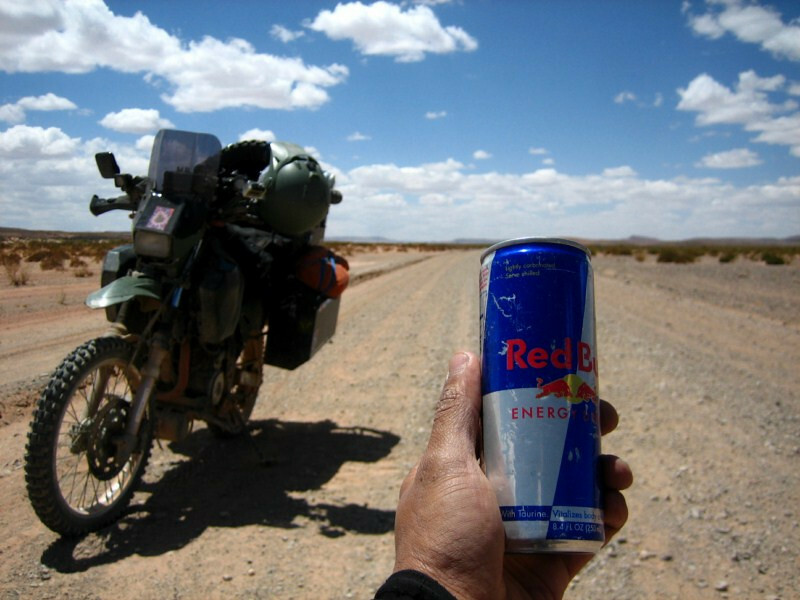 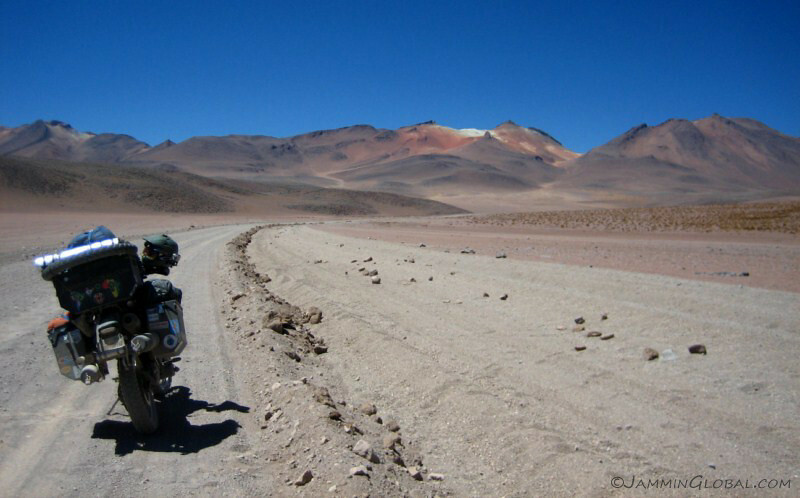 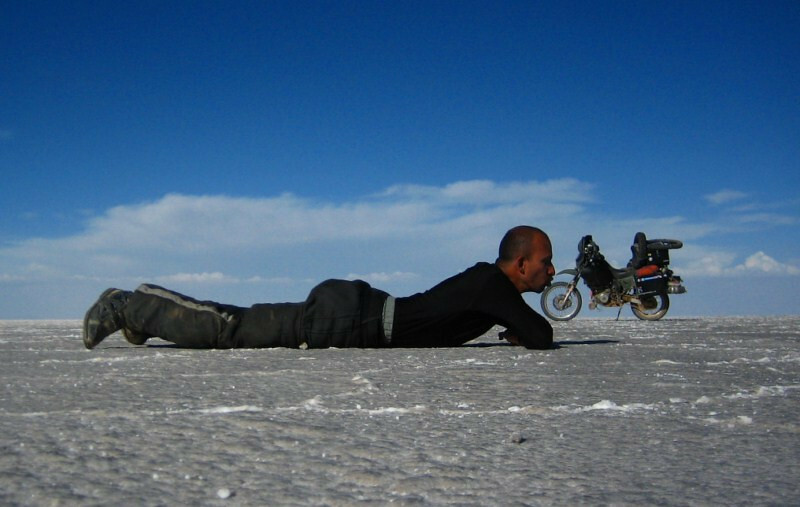 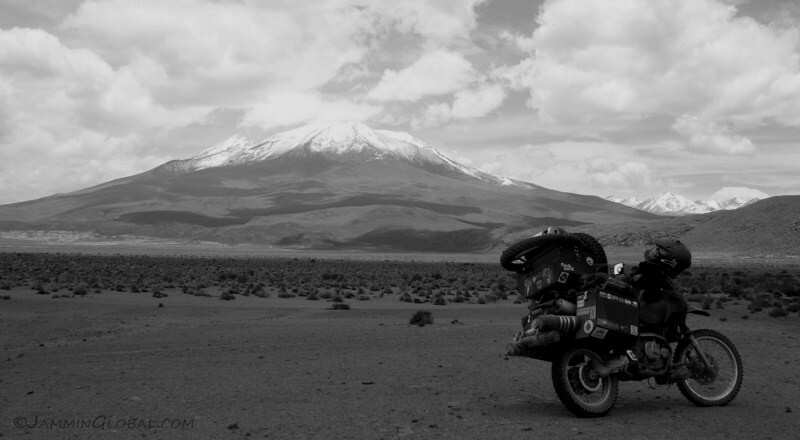 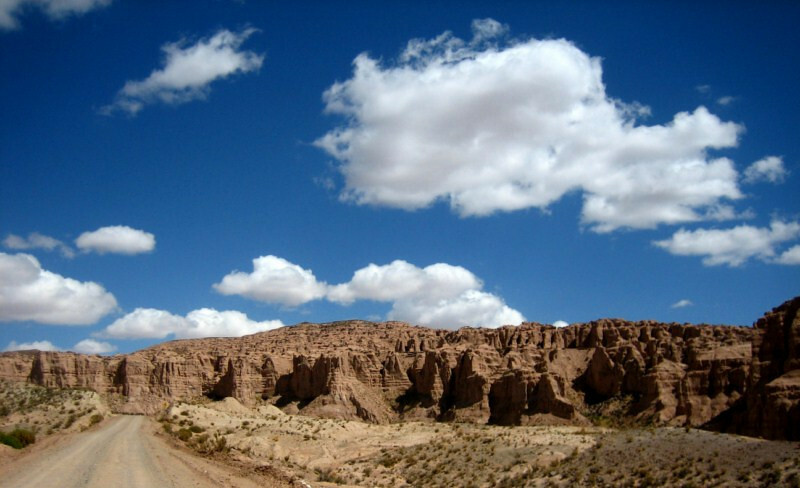 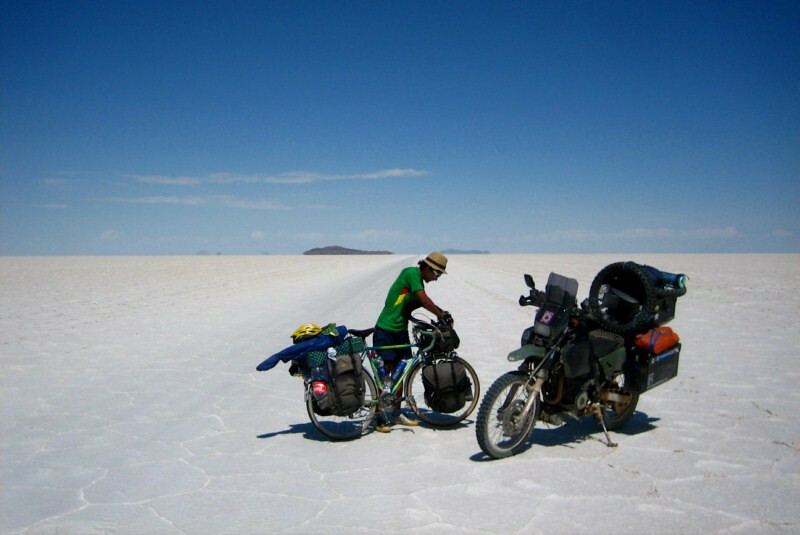 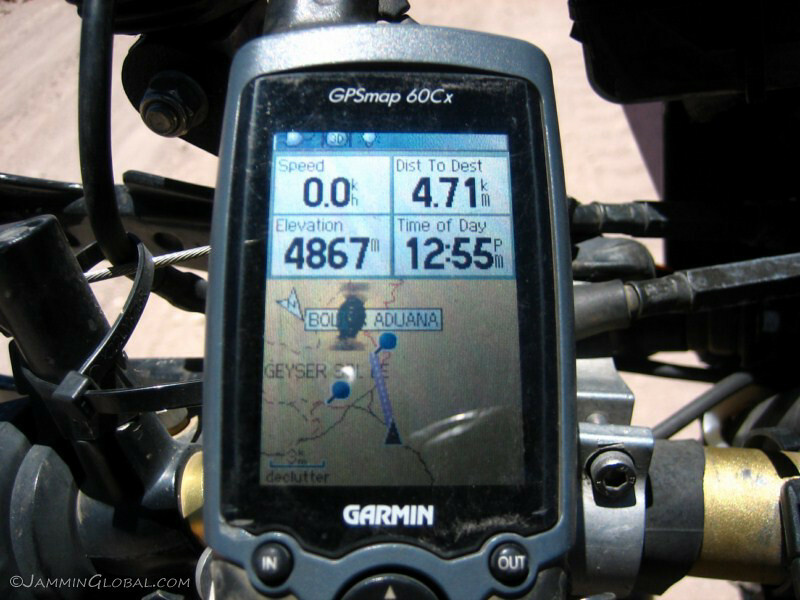 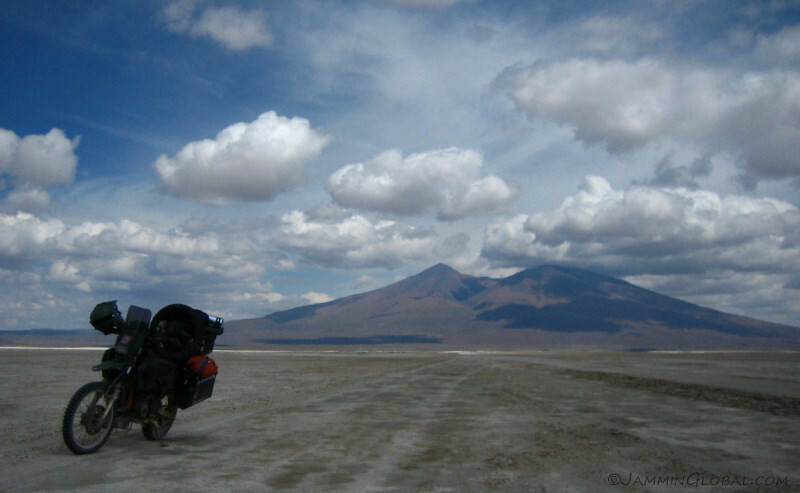 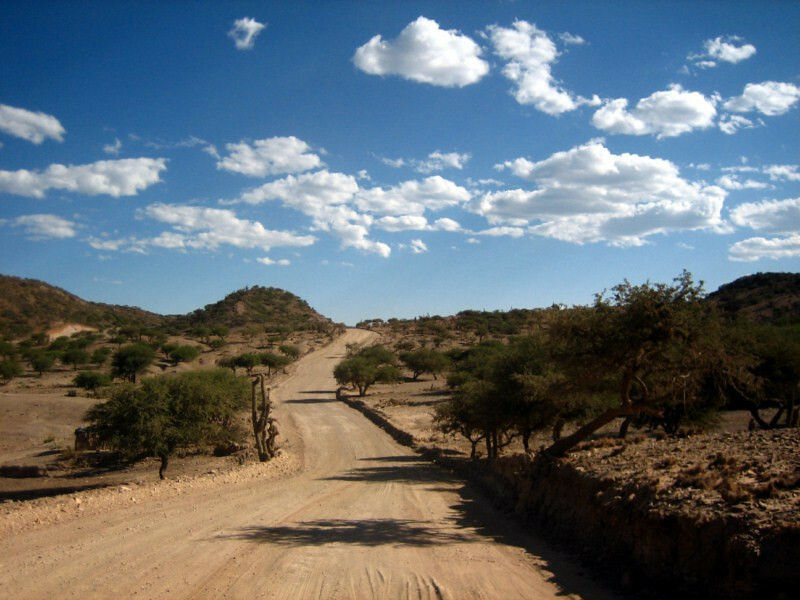 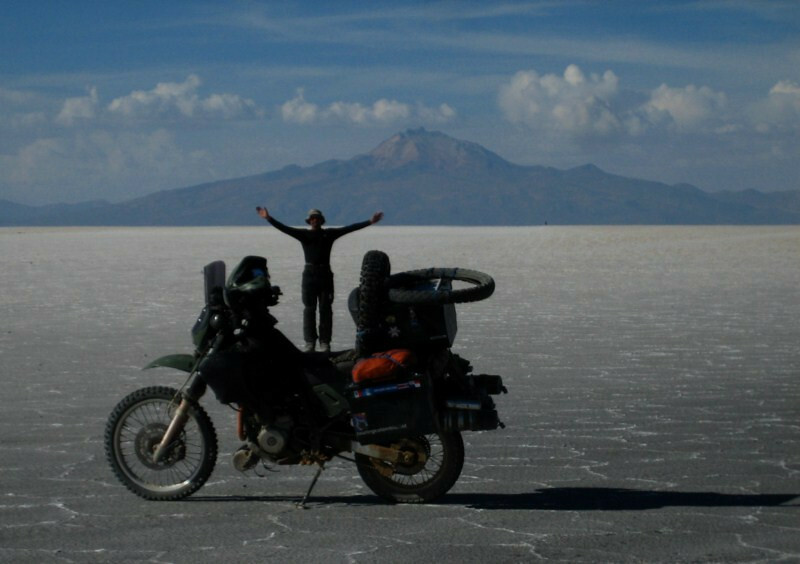 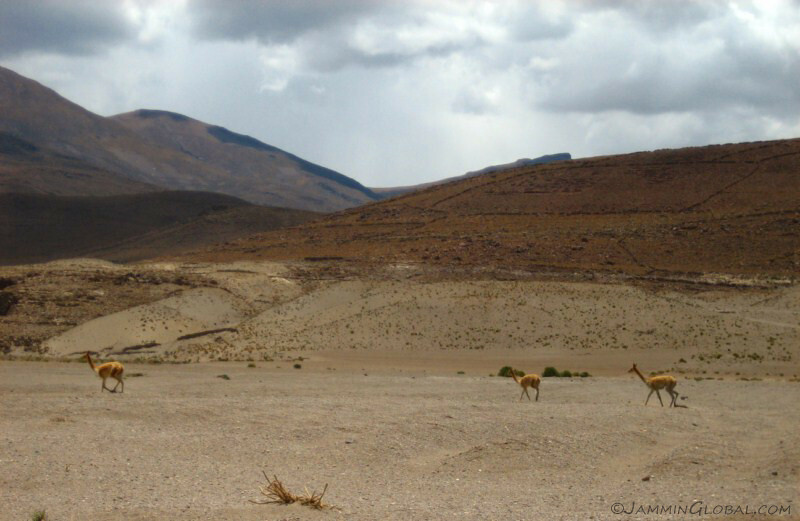 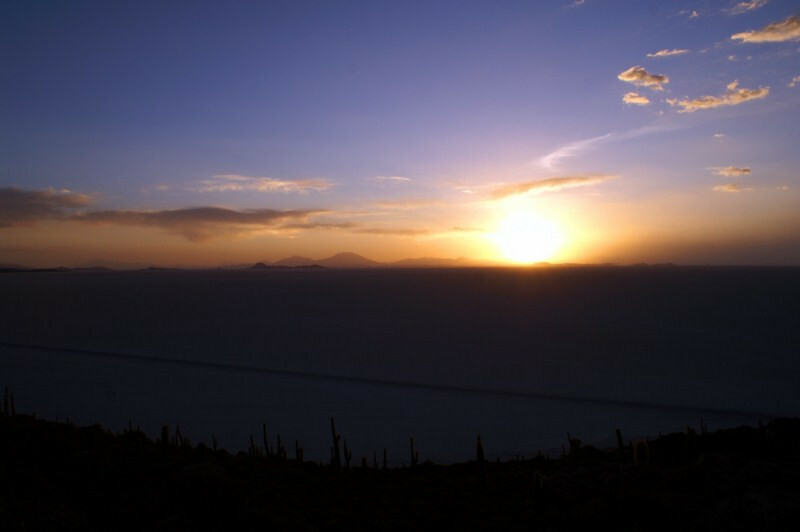 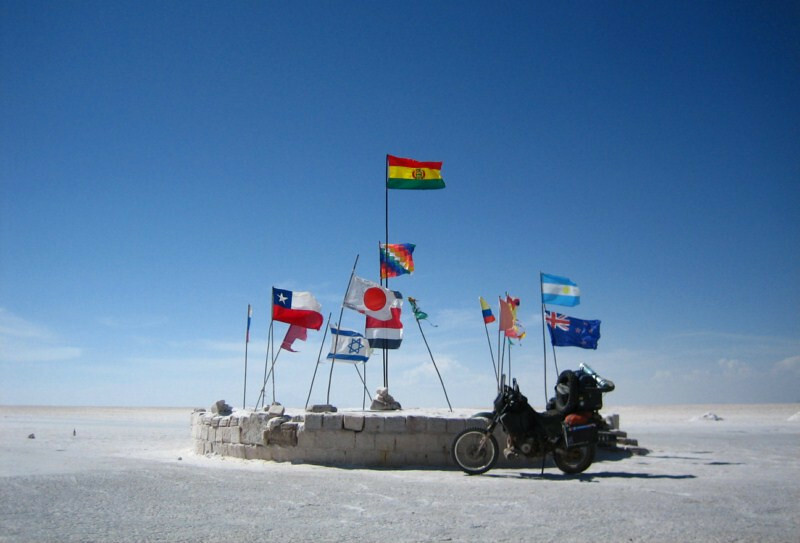 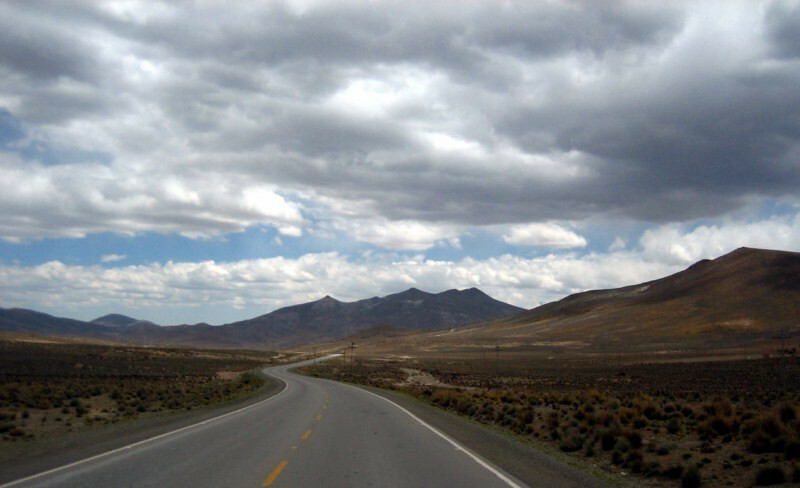 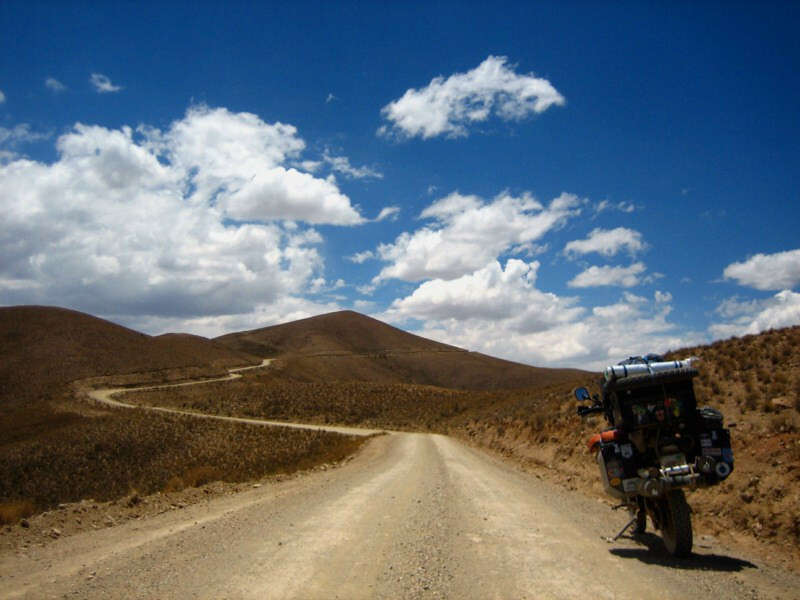 From Potosi, I headed south to Tupiza on word that the route from Tupiza to Uyuni should not be missed. 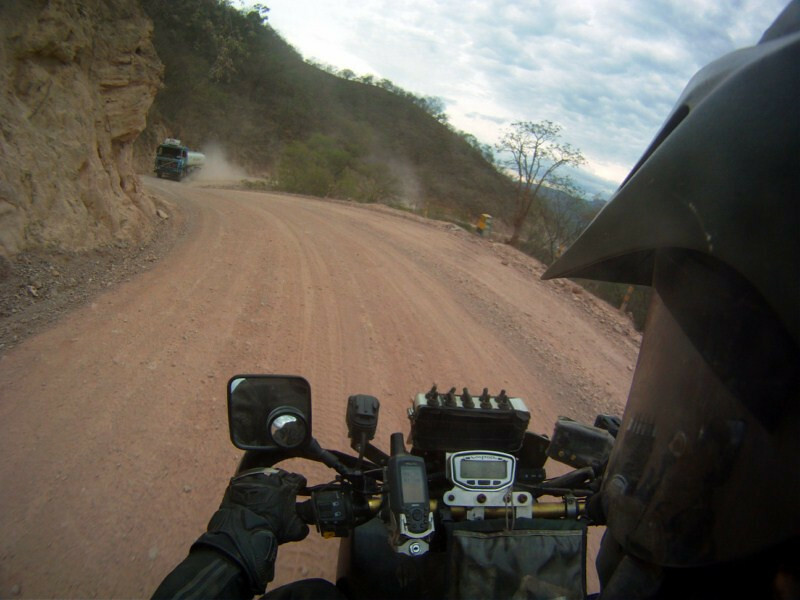 There was some good off-road riding but this was mostly a construction detour as the route is being paved. 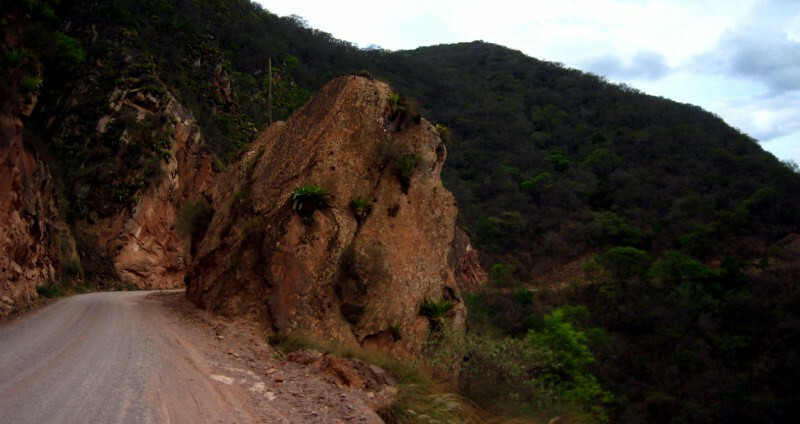 The route snaking through a valley. 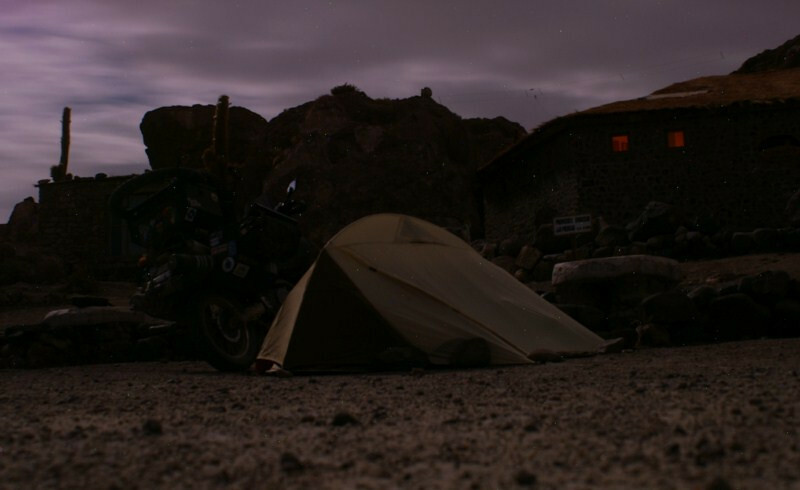 I gained and dropped elevation throughout the day and not yet being fully acclimatized, I got a serious headache by late afternoon, similar to my first experience with huge variations in elevation in getting to Quito. 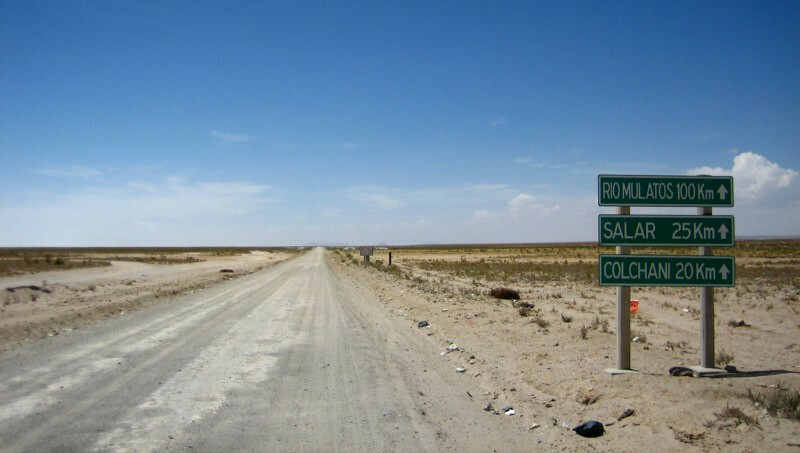 I found a room in Cotagaita, a town halfway to Tupiza, popped a few paracetamol, applied some tiger balm and slept it off. 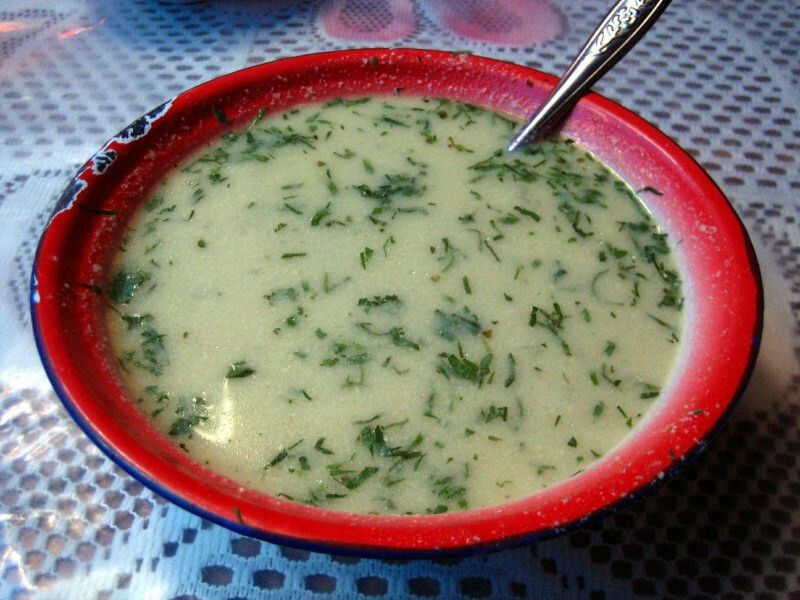 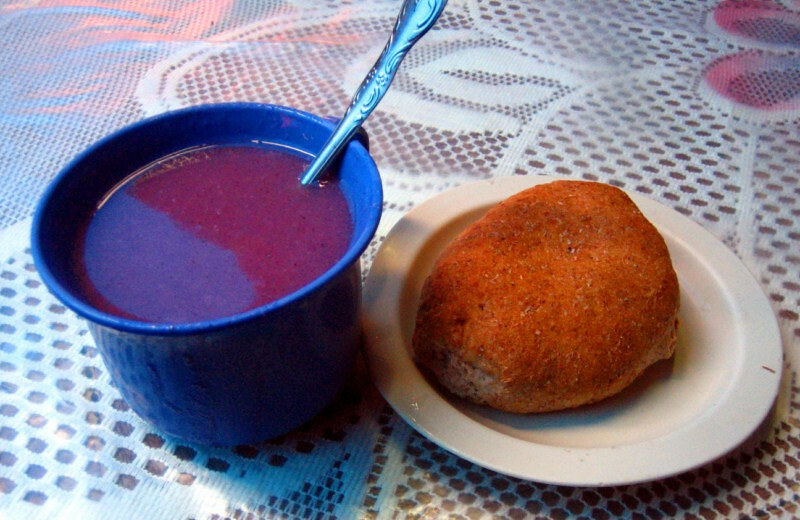 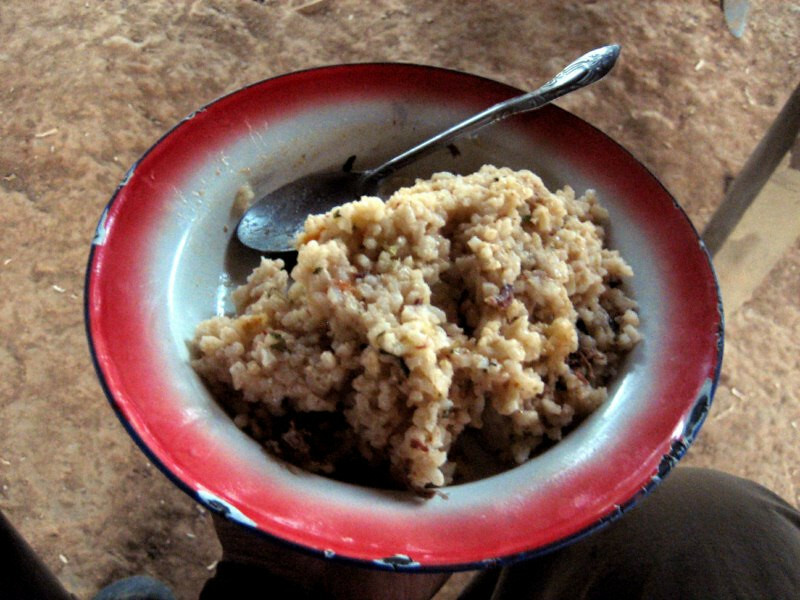 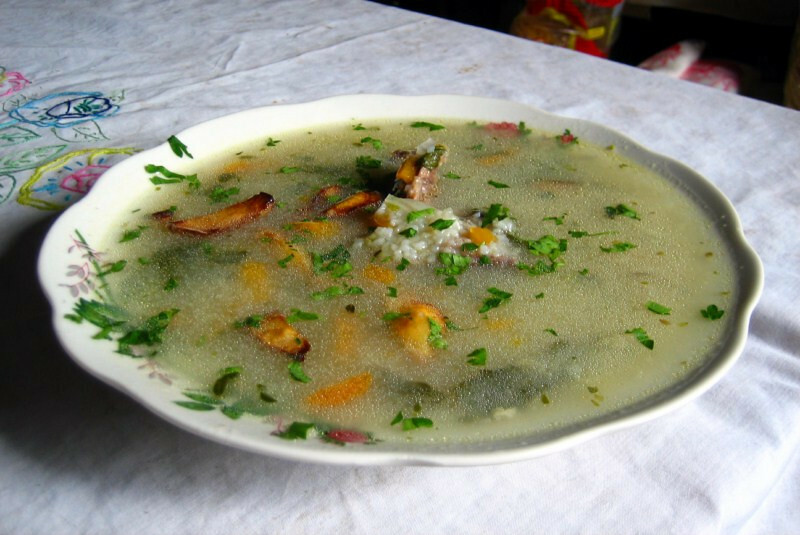 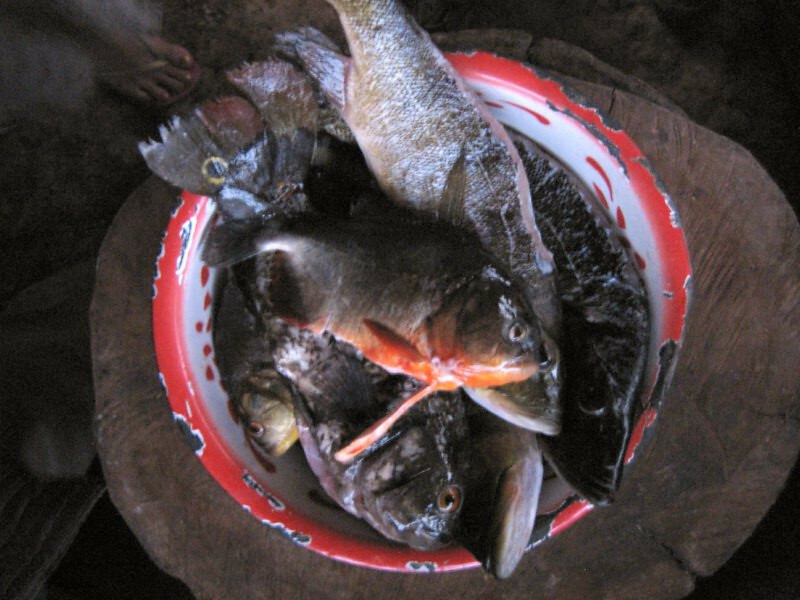 It was all good in the morning and I had some typical breakfast of a salty soup with some meat and potatoes, which are considered by the locals as a good source of energy, maybe cause the potato might have been the only source of energy for long periods in their history. 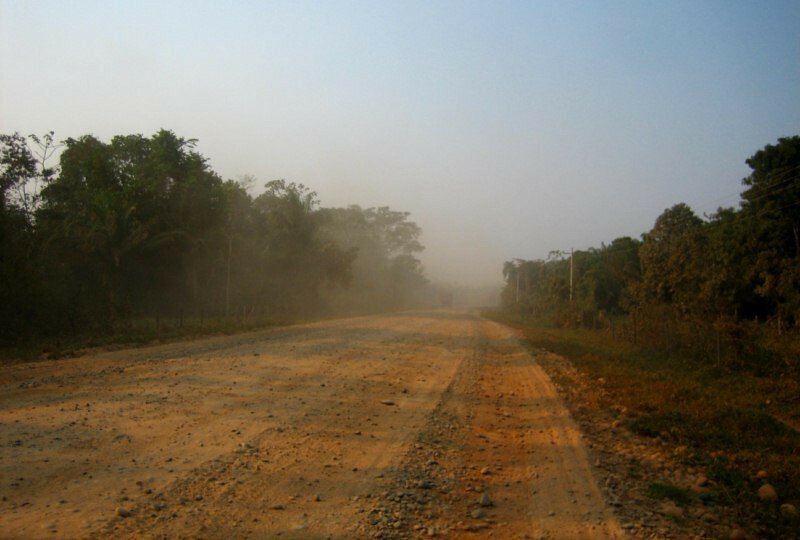 There were some interesting sights on the ride to Tupiza, but most of it was shrouded in construction dust. 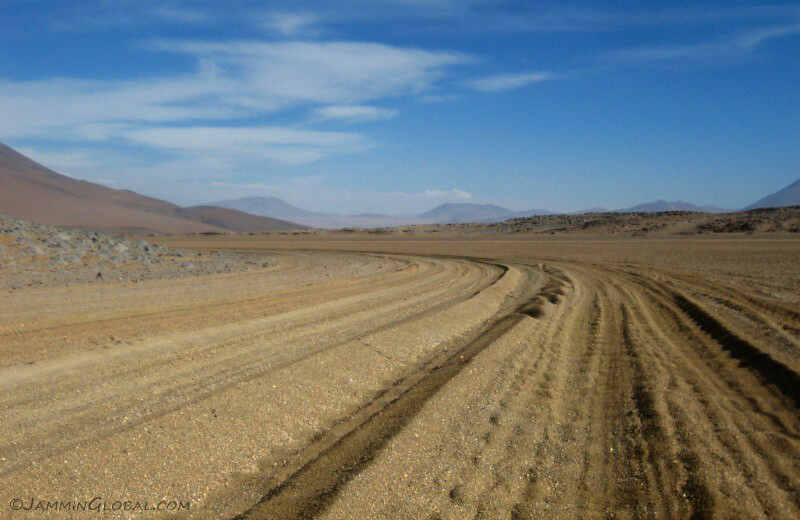 Following a rural Land Cruiser ambulance on a stretch of freshly-laid tarmac with colorful mountains ahead. 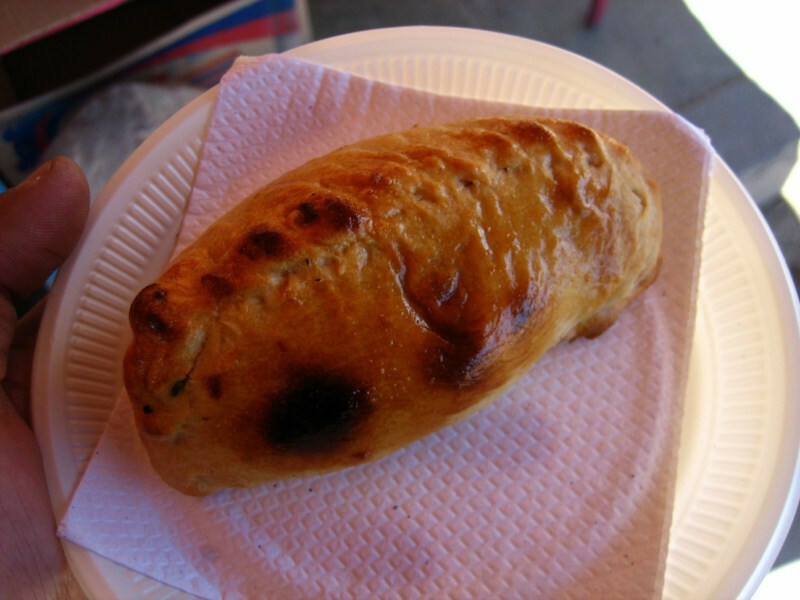 Having some tasty Salteñas for lunch in Tupiza. 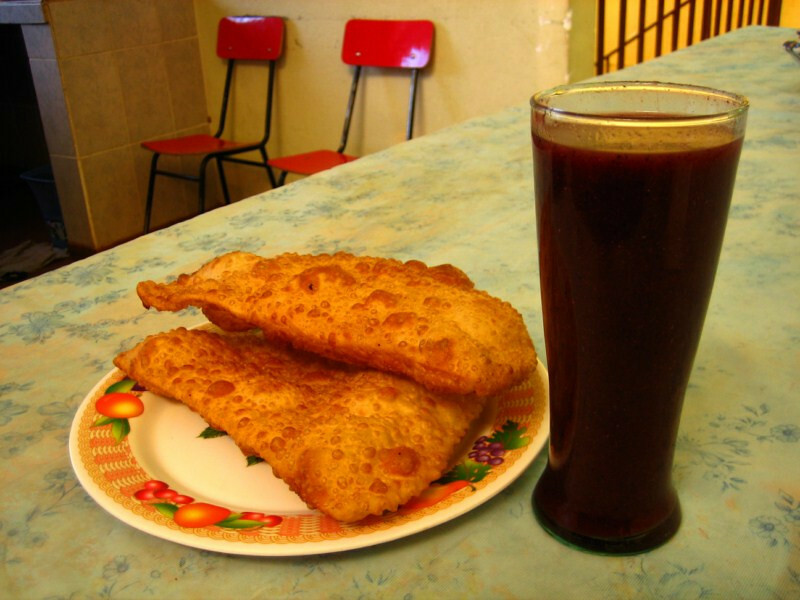 These are a form of empanadas and are very tasty. 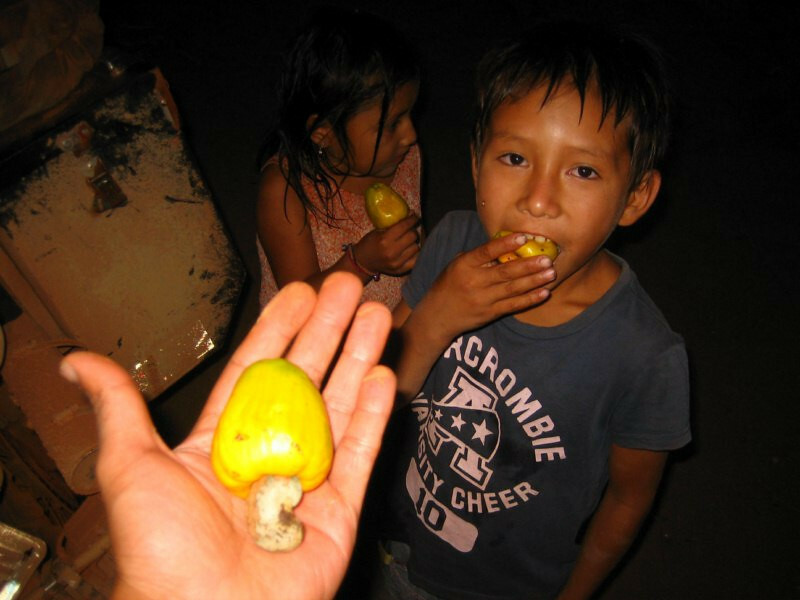 An Argentine couple from Salta was exiled to Bolivia where they started selling these emapandas and the craze soon spread around the country. 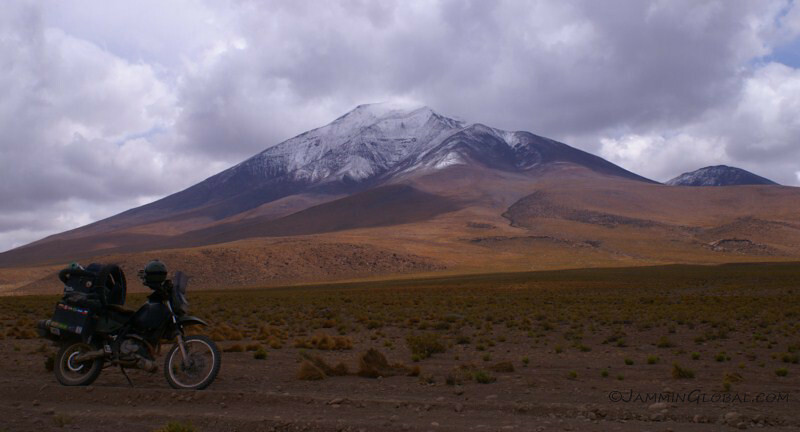 While in Tupiza, I also picked up a bunch of altitude sickness pills (10 for B35, $5) from a local pharmacy, because I could not afford any more headaches in the rough terrain coming up. 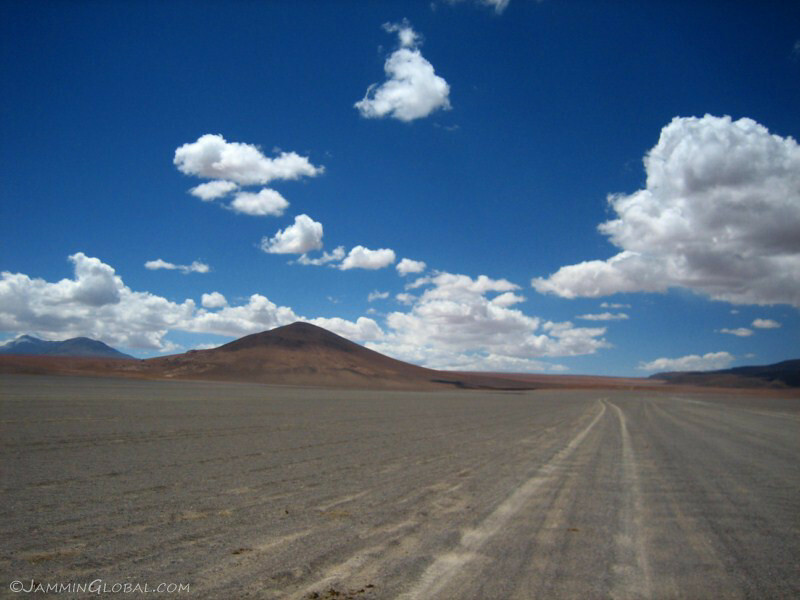 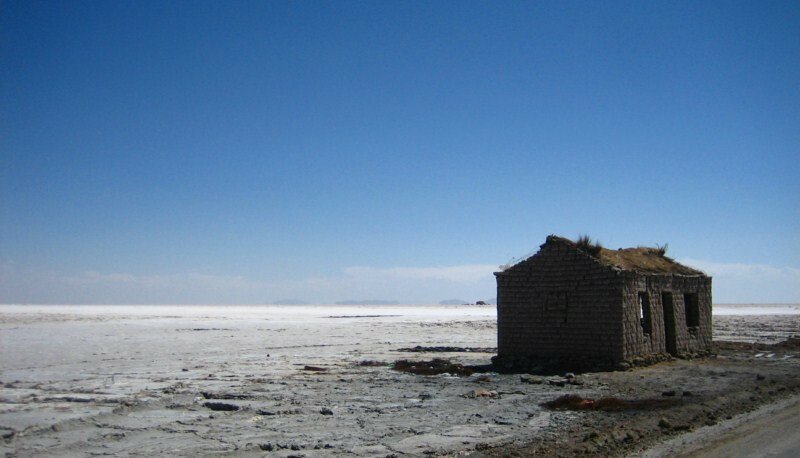 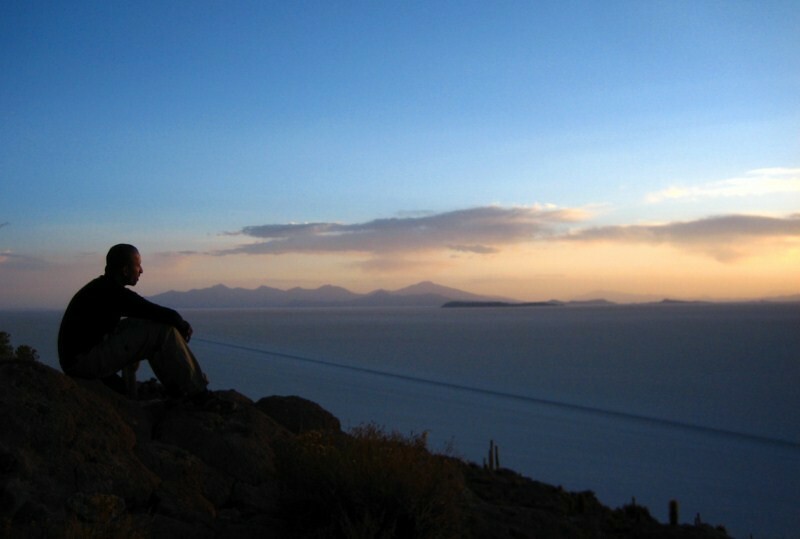 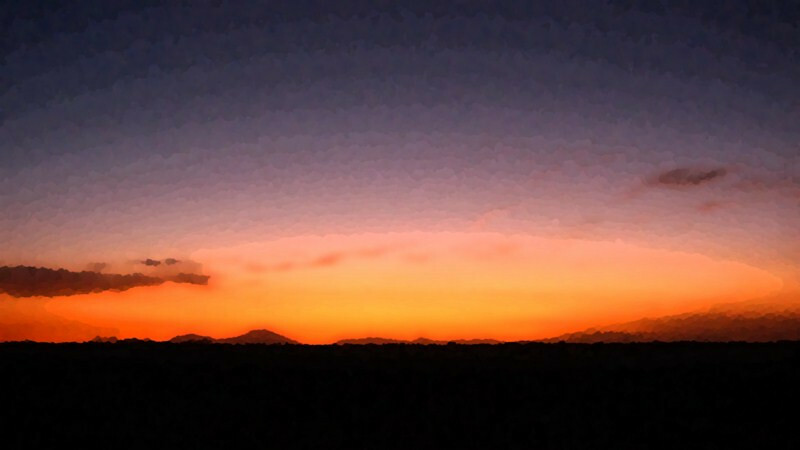 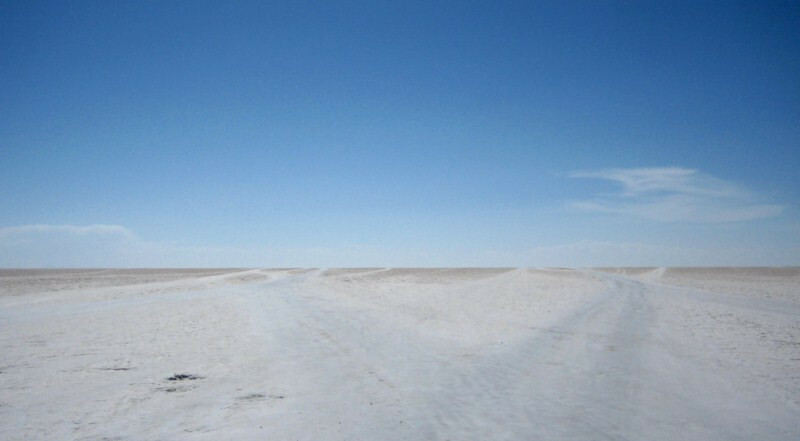 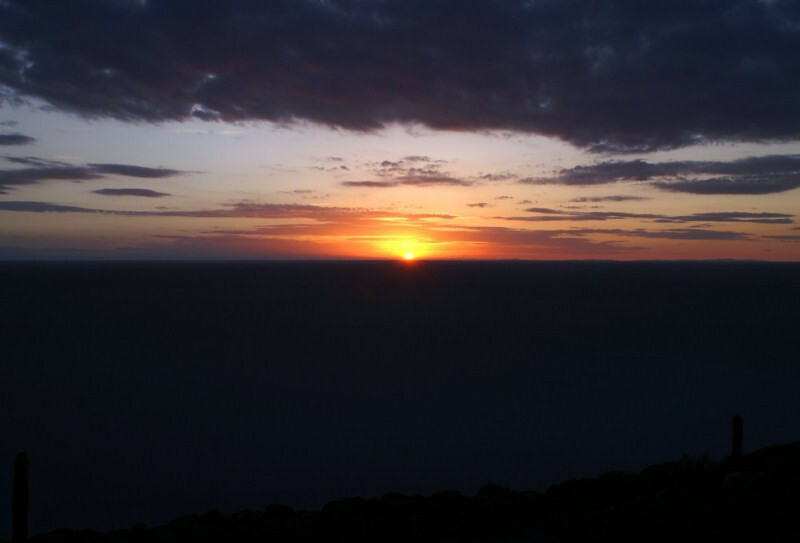 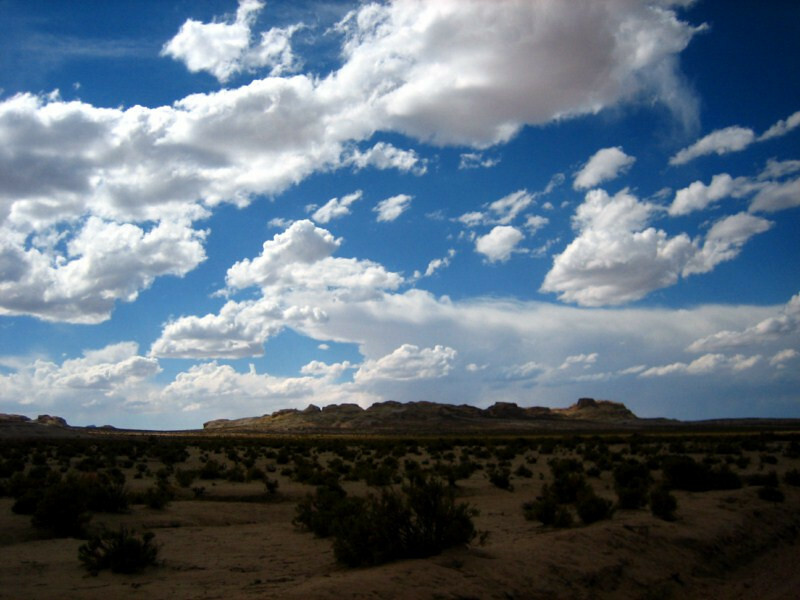 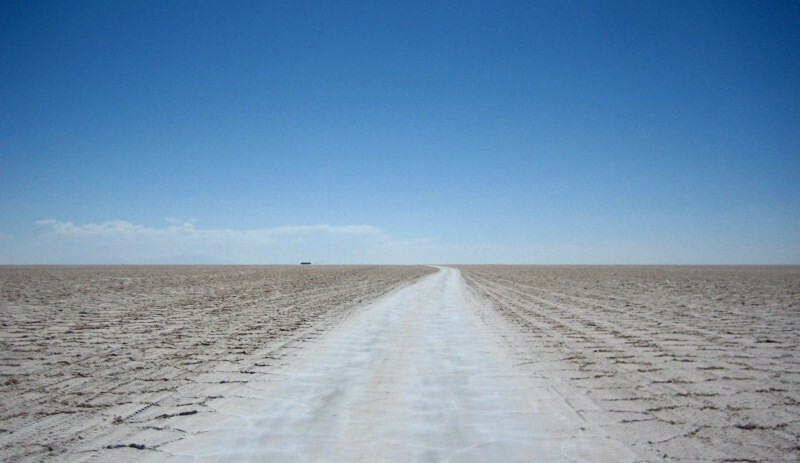 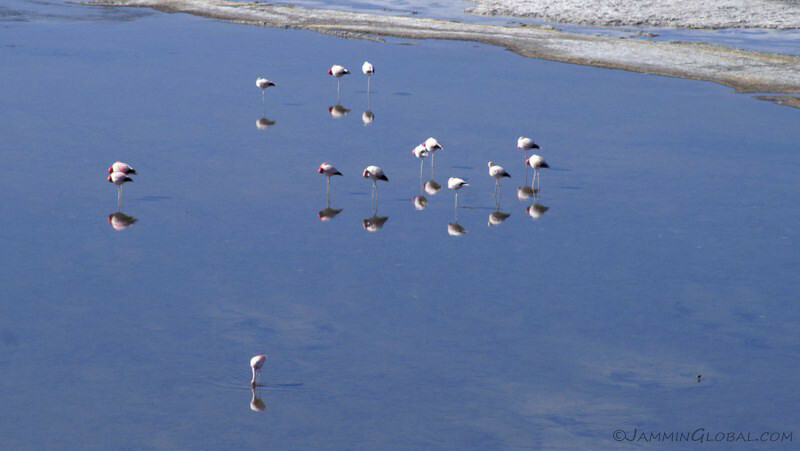 From Tupiza, I turned north towards Uyuni and stayed the night at Atocha. 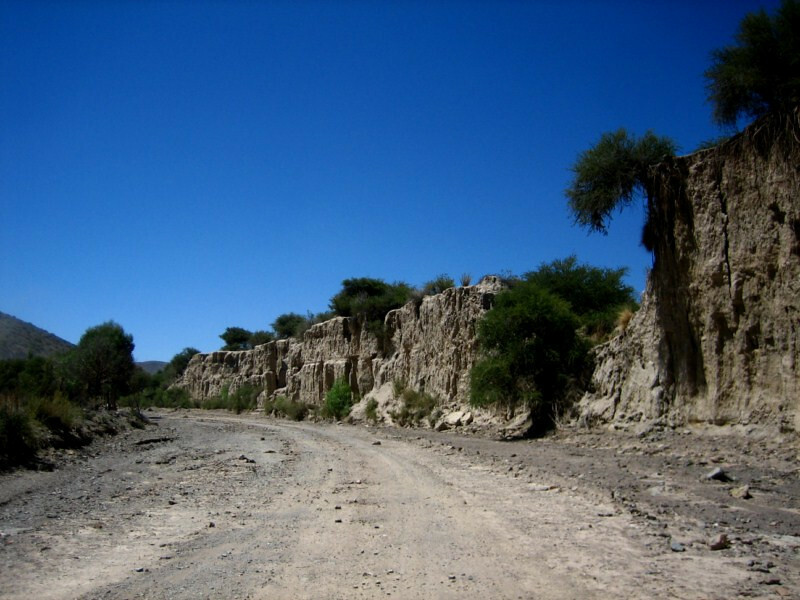 I was told this route was full of geologic marvels and was not disappointed. 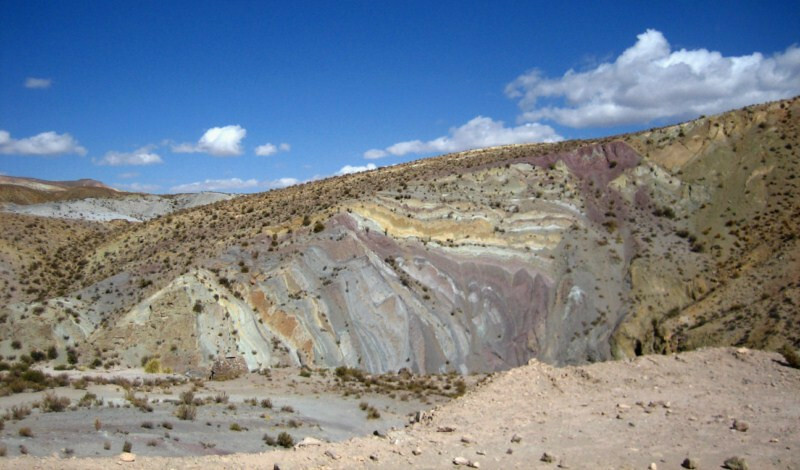 Vertical sedimentary layers. 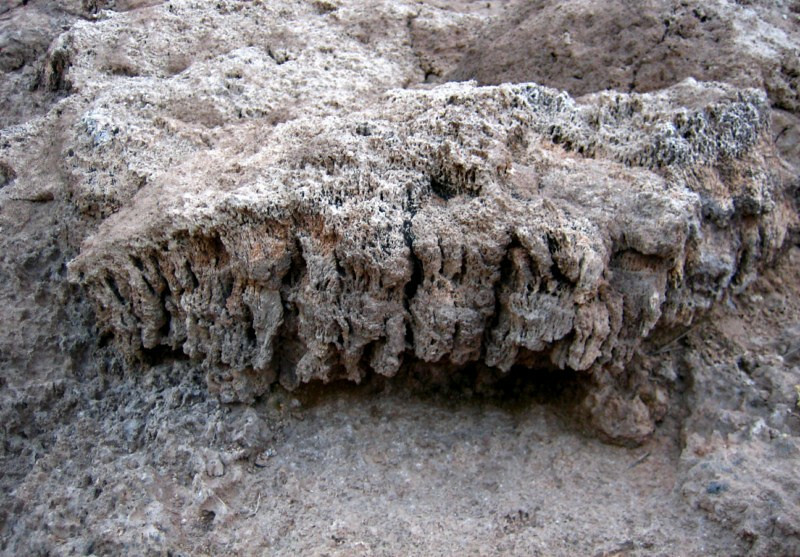 Twisted and contorted layers of rock. 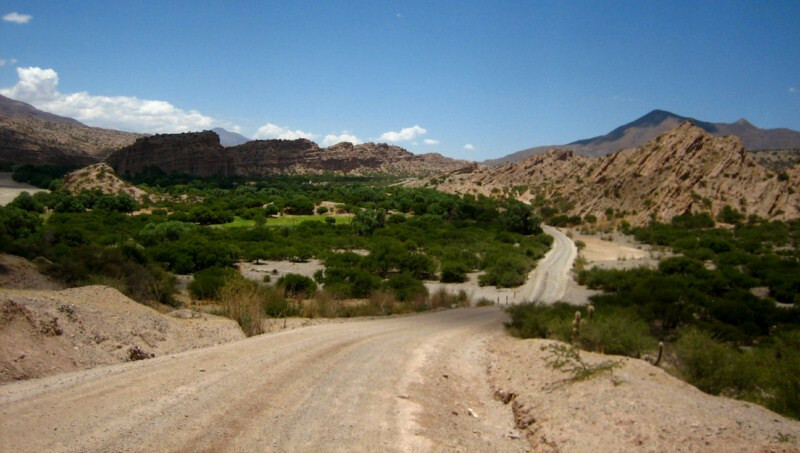 There was farmland in some valleys, but the route was mostly quite remote. 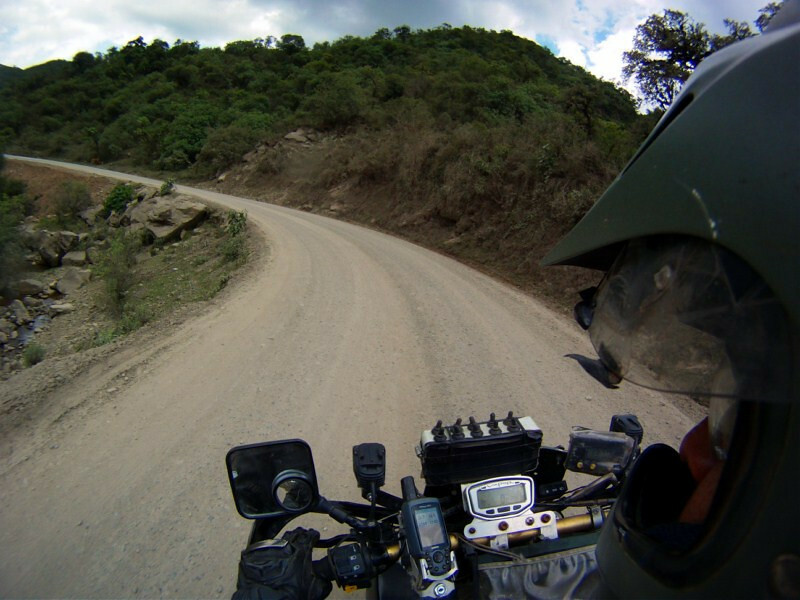 With hardly any traffic, it was an enjoyable ride. 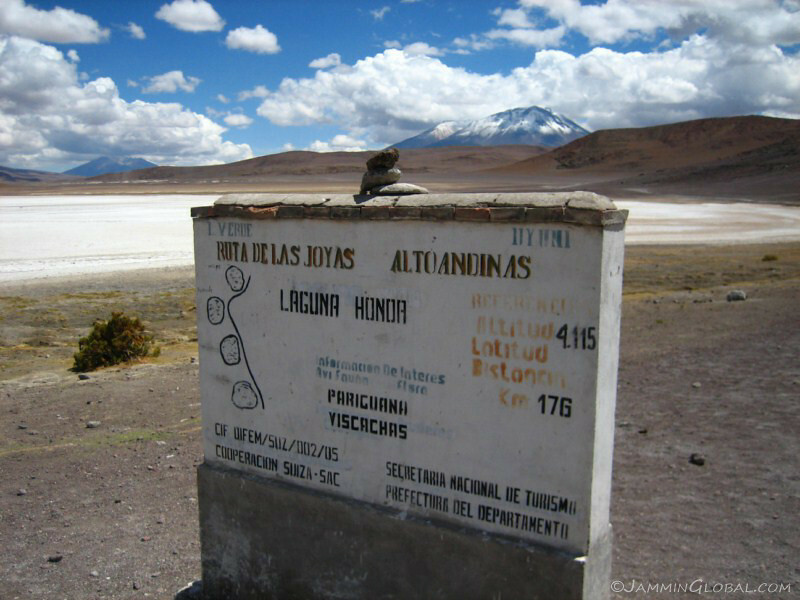 A huge obelisk of stone right by the road. 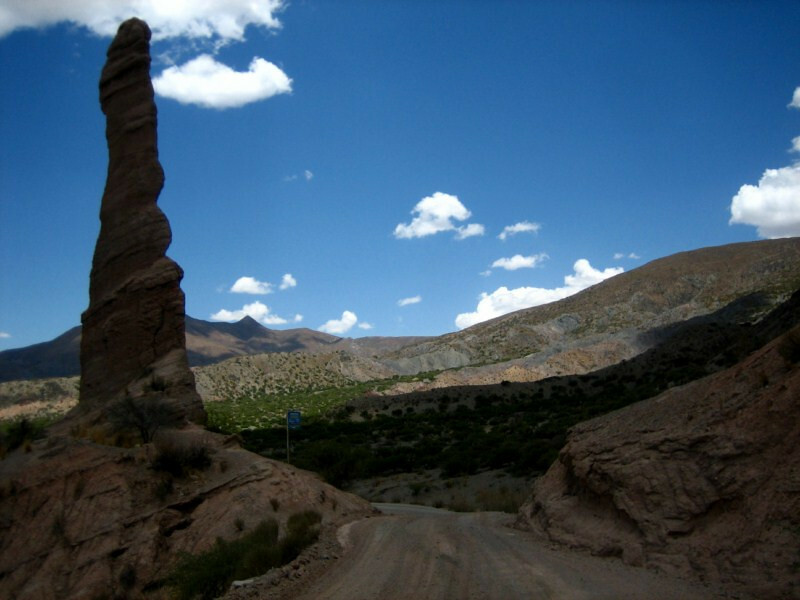 With more people around, I could see this sculpture being worshiped for fertility due to its uncanny phallic resemblance. 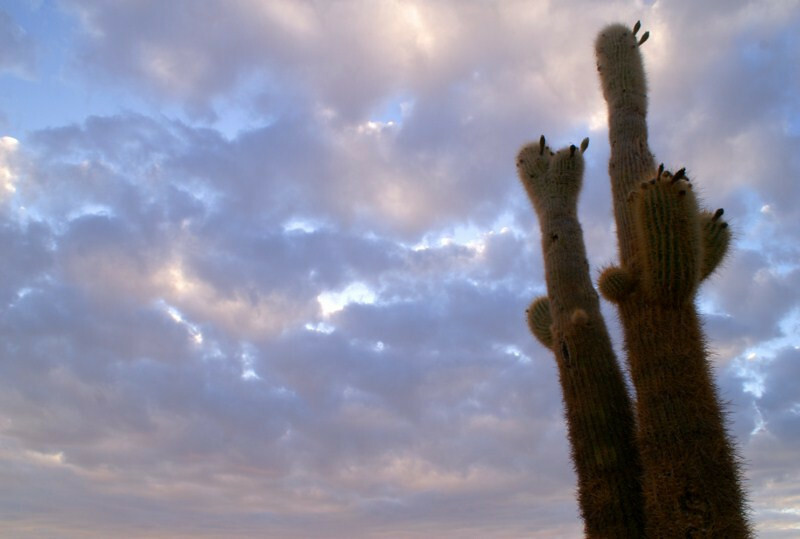 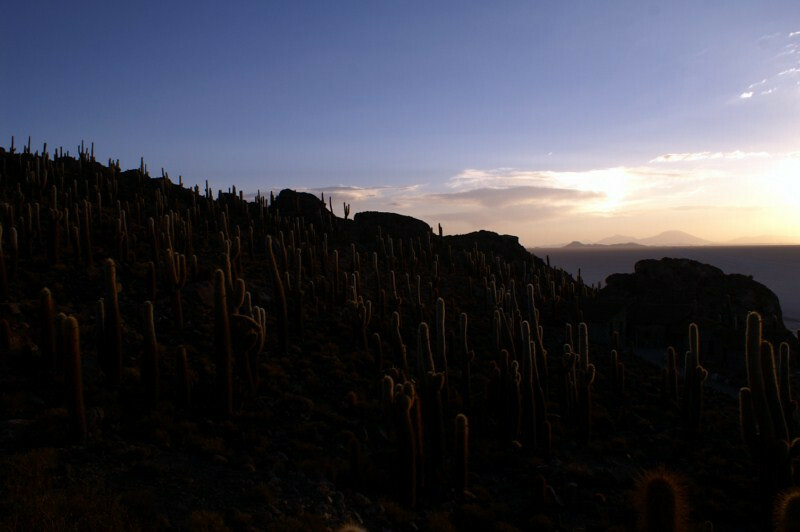 As I gained elevation, the terrain became more arid and cactus took over from the shrubs. 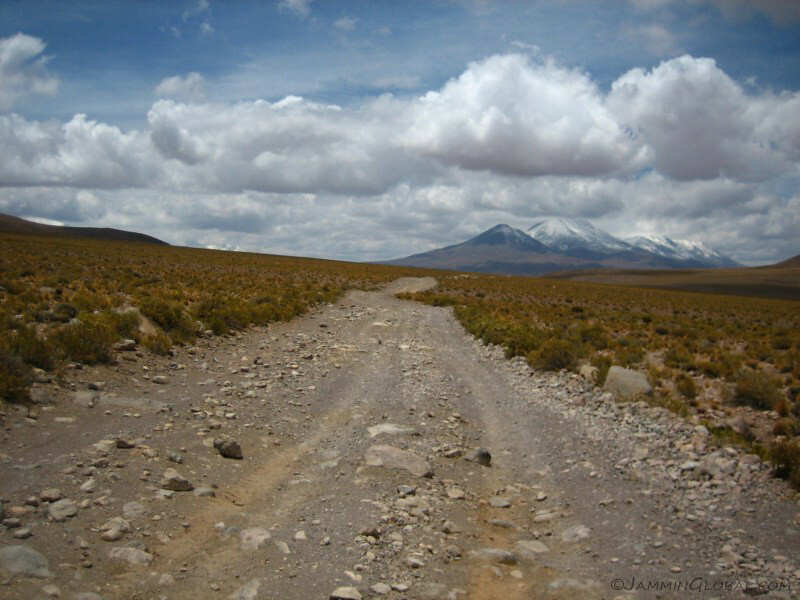 Taking a break at 3,800 m (12,465 ft) and noting the path as it slowly made its way along this sparse mountain ridge. 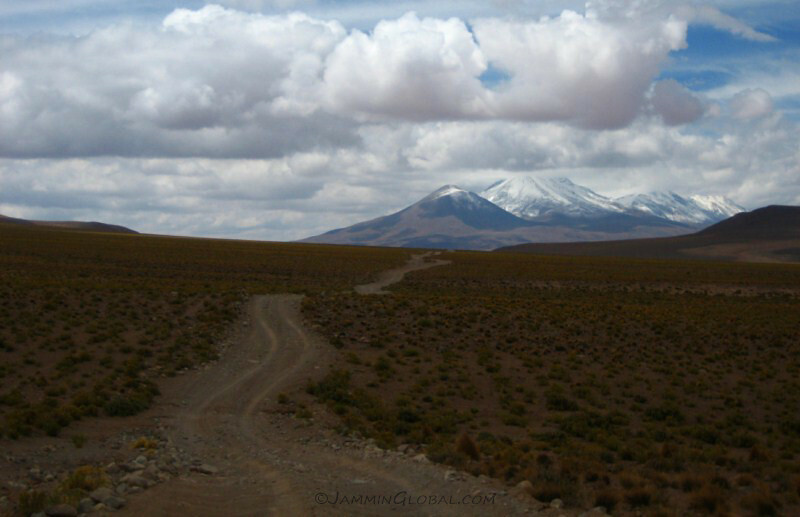 I was heading to that little volcano you see in the distance. 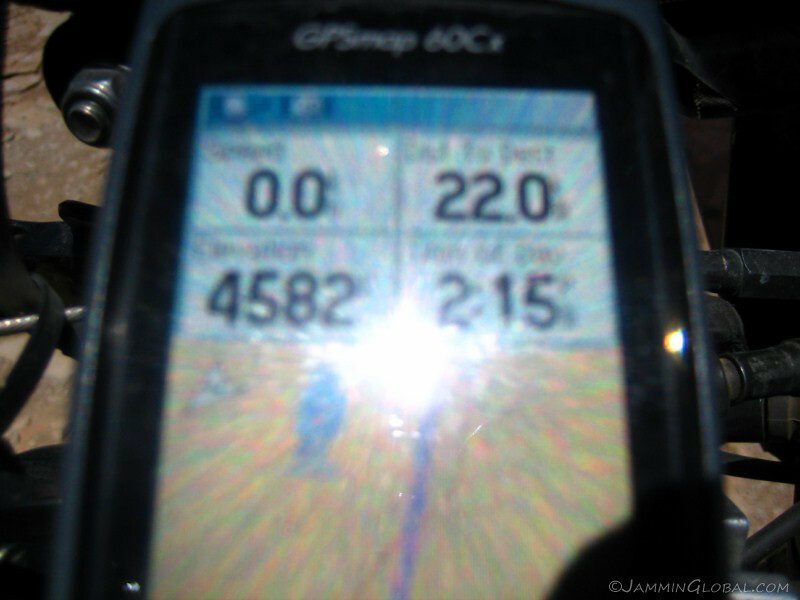 Yup, it was thaaat steep. 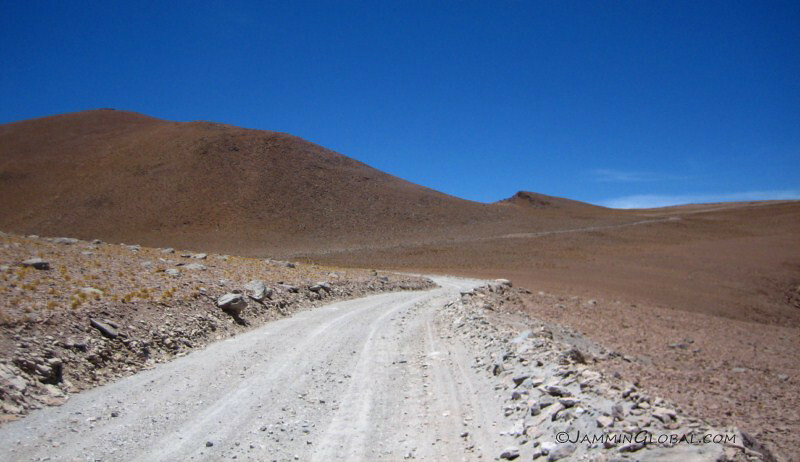 Coming down after summitting near 4,050 m (13,300 ft). 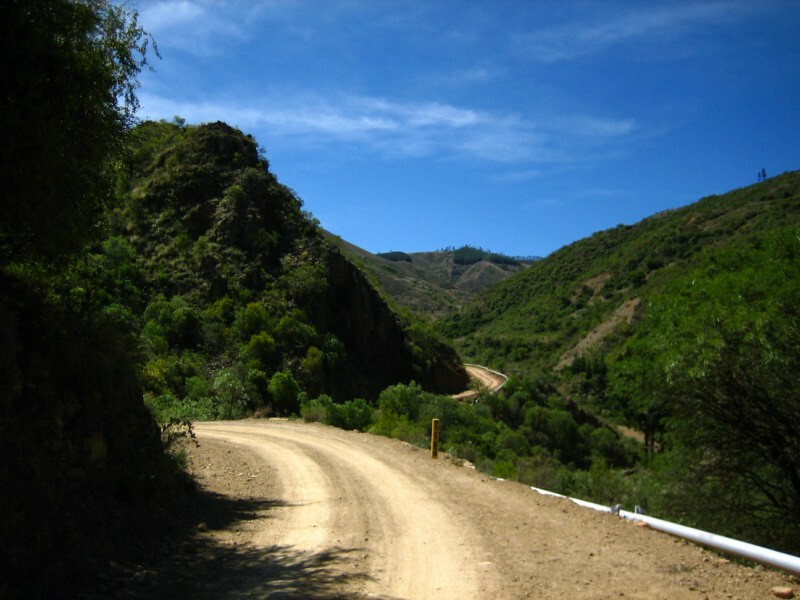 There’s something to appreciate in a route following the natural curves of the land, rather than a straight path being bulldozed in the name of efficiency. 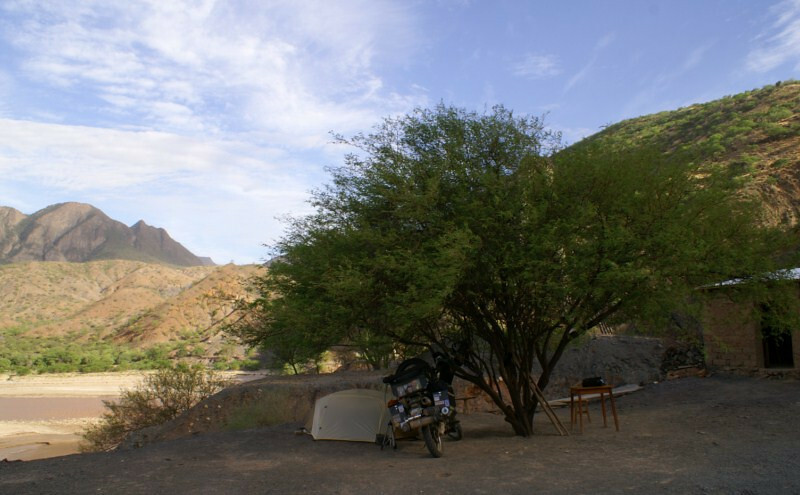 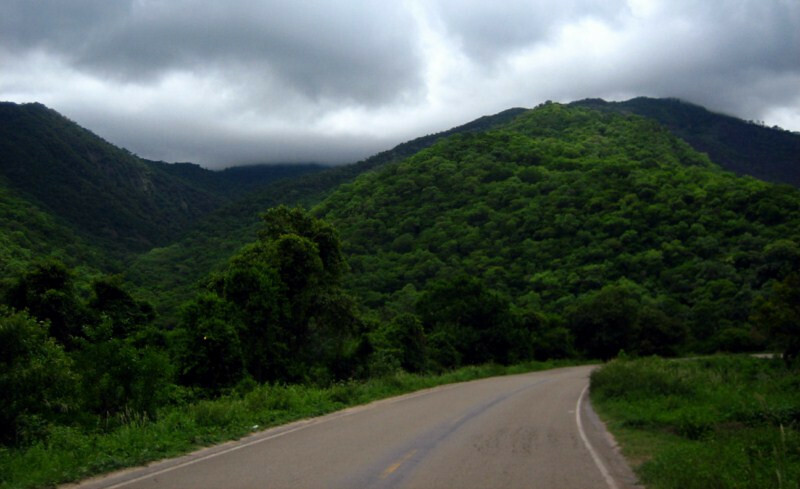 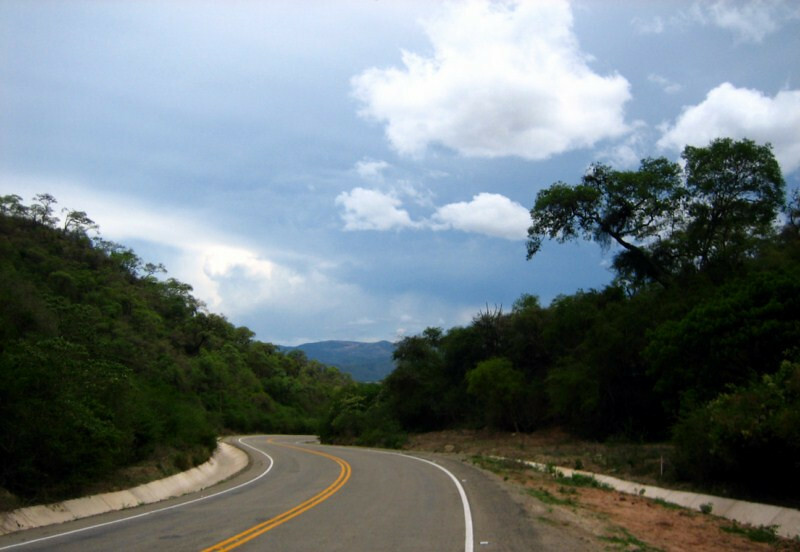 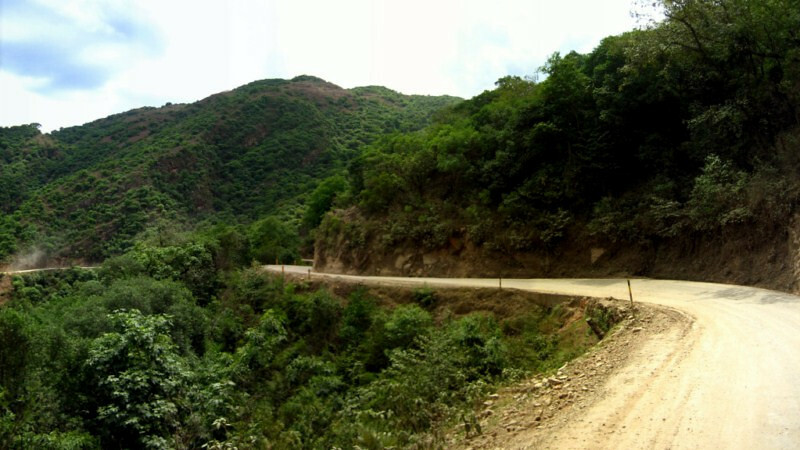 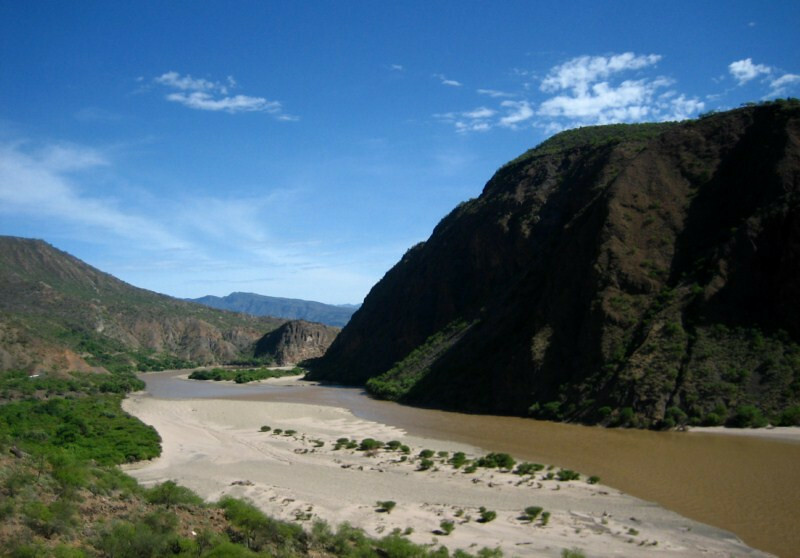 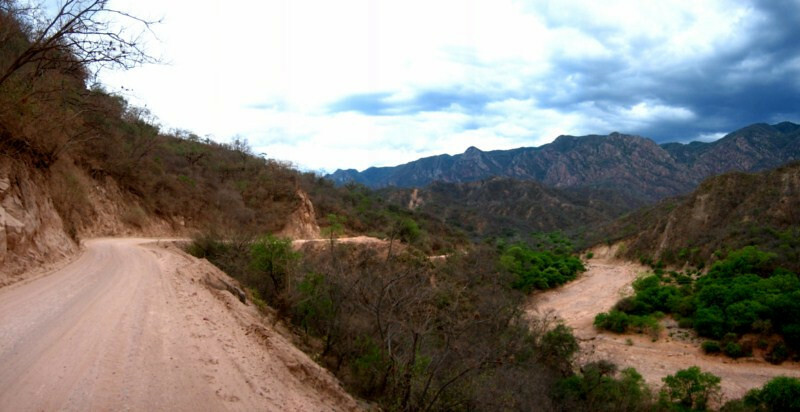 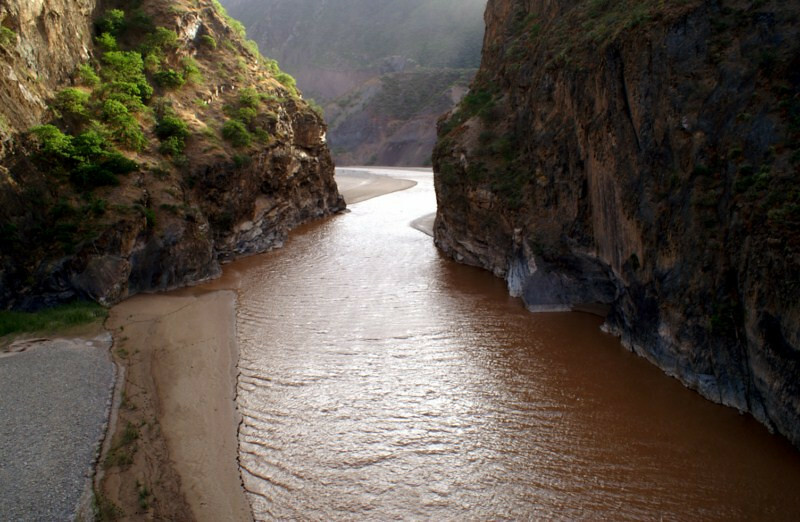 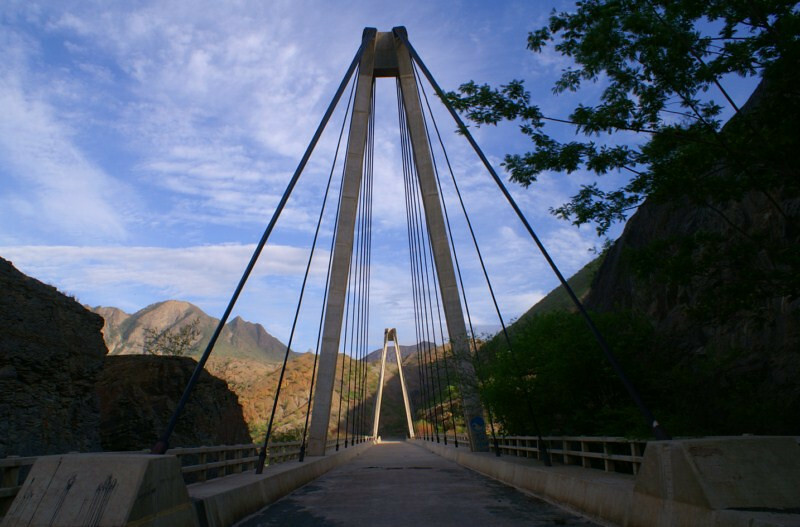 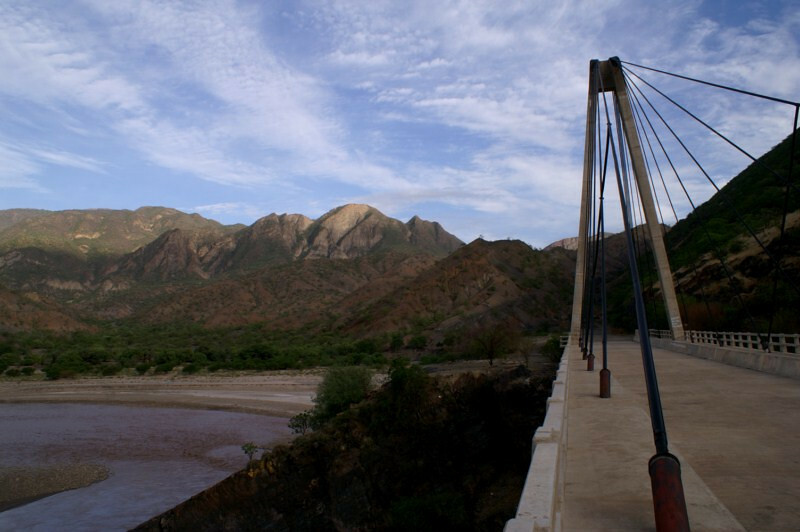 This route is known in the motorcycling community for its frequent arroyo crossings, which are dried river beds for most of the year and swell up in the short rainy season, which was supposed to begin right about now, but was delayed. 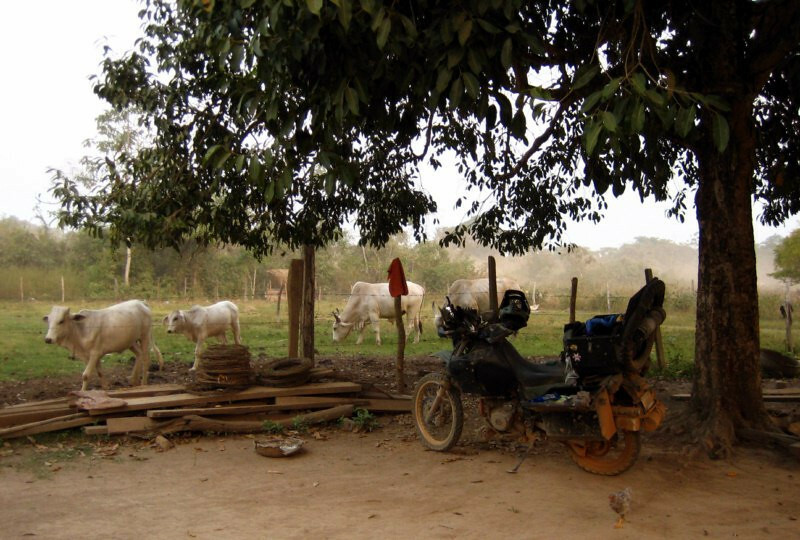 A flash flood could be coming and that cow would have no idea. 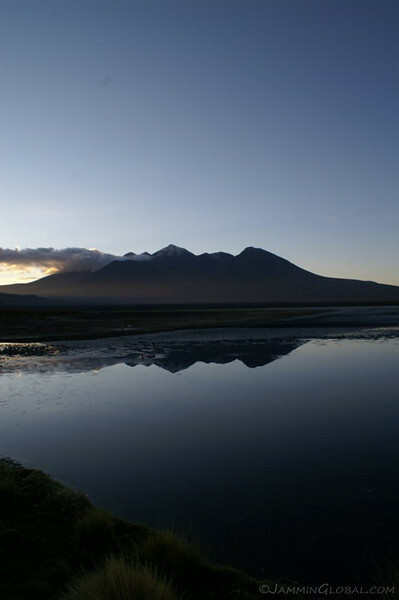 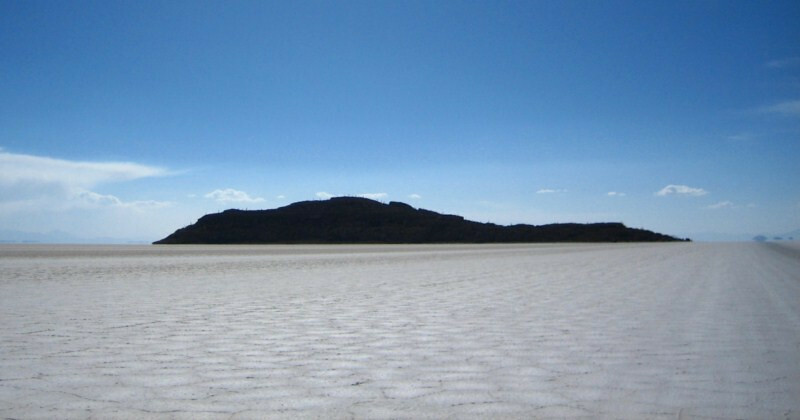 A wide-angle view showing the prominent landmark of that volcano, which was visible for most of the route in this big sky landscape. 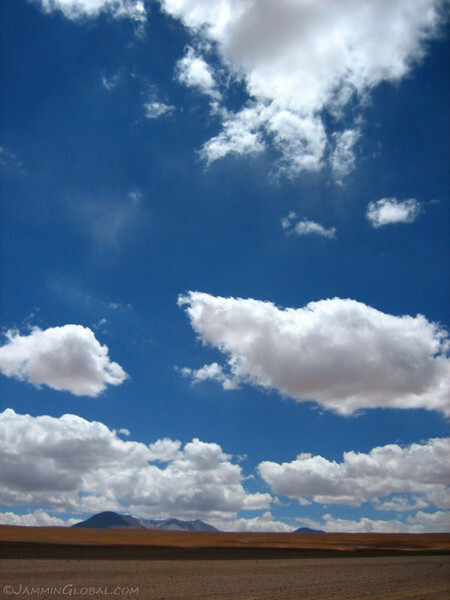 The clouds feel close enough to touch. 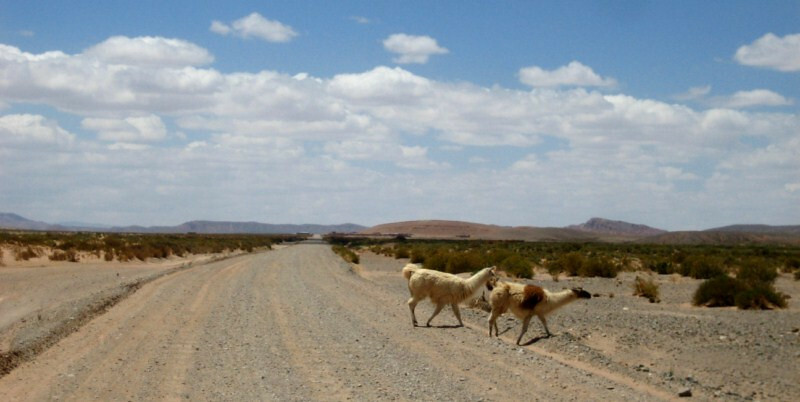 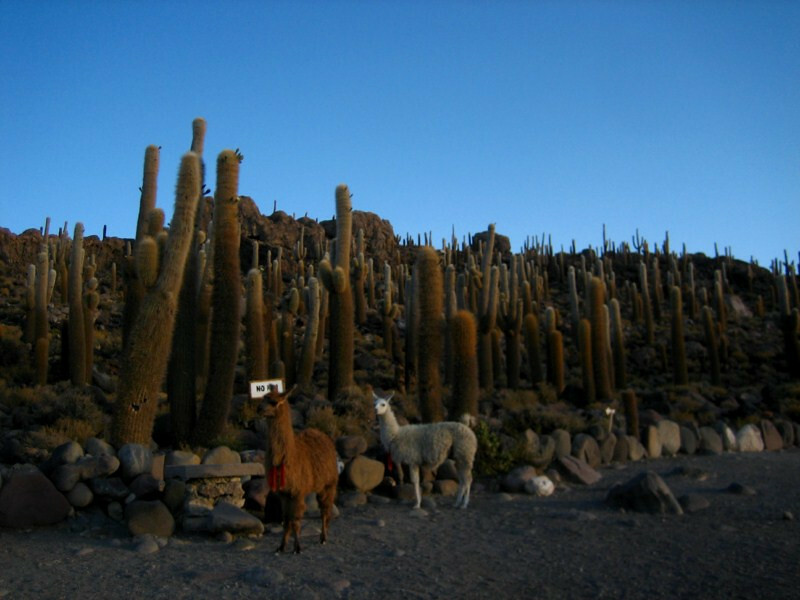 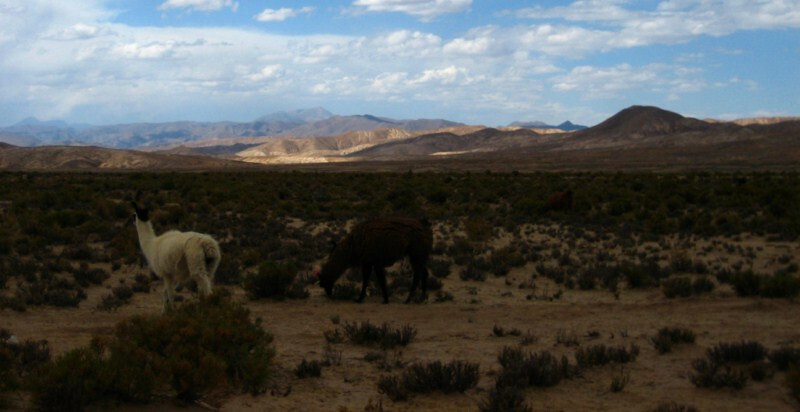 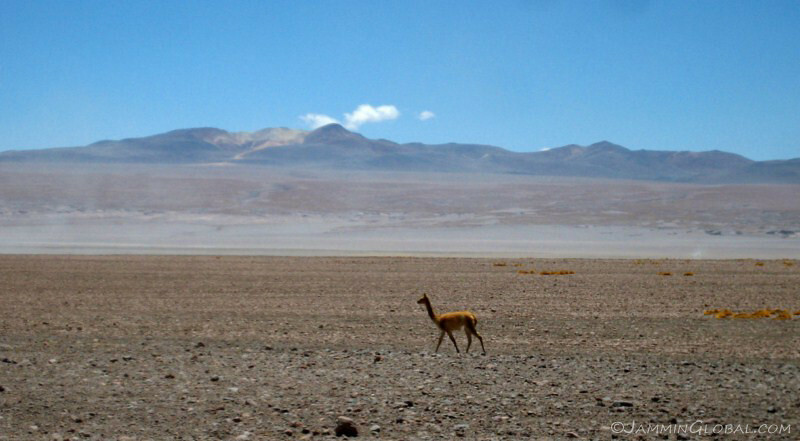 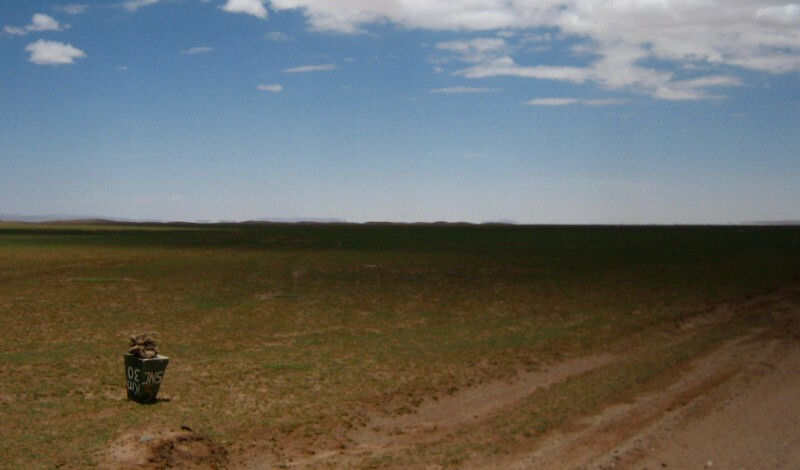 Domesticated llamas were the only visible wildlife. 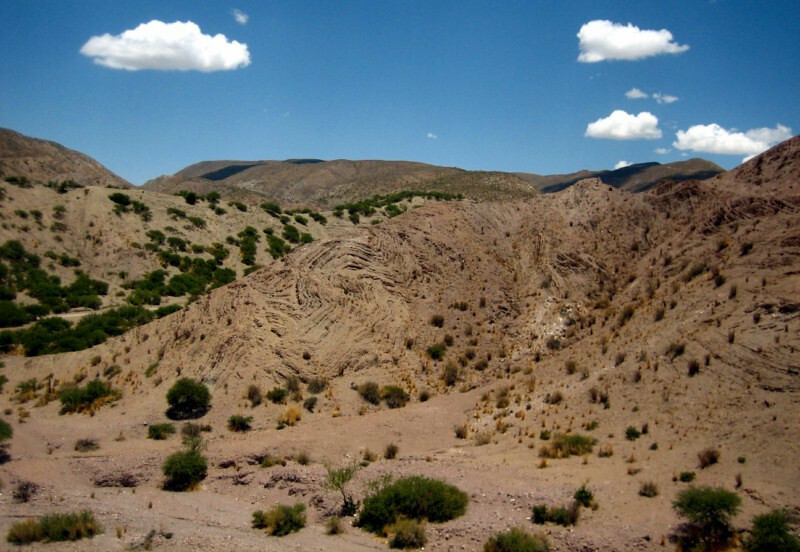 A landform, plying its way through time under the open sky. 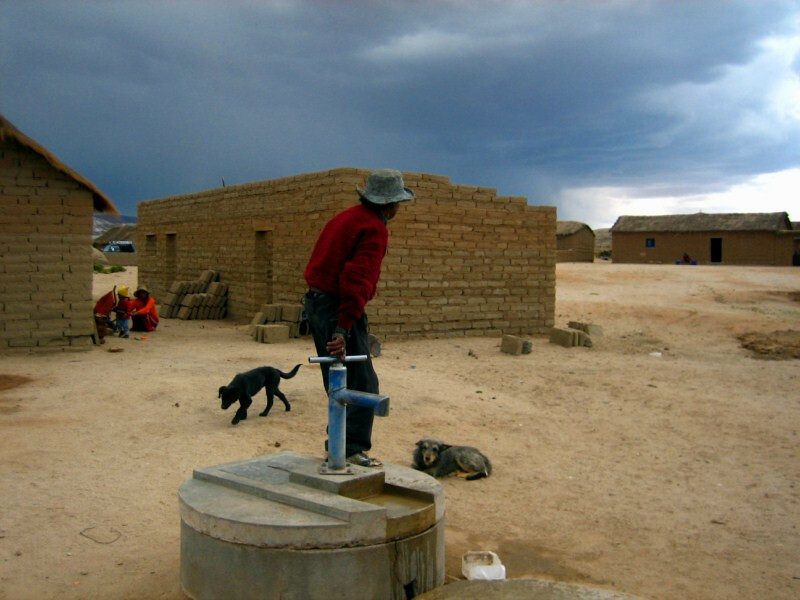 I stopped in this little village after seeing the public water pump and this man jumped on top and happily put some energy down the pump to bring up the water. 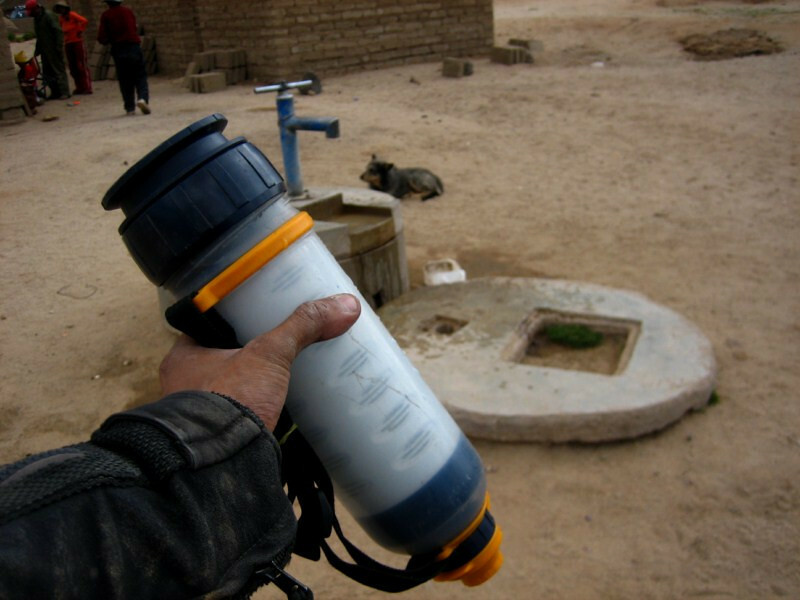 I’m sure it was a pure and clean source, coming from deep underground, but just in case, I ran it through my LifeSaver filter, which I’ve been doing for most of my trip and have avoided spending money on bottled water. 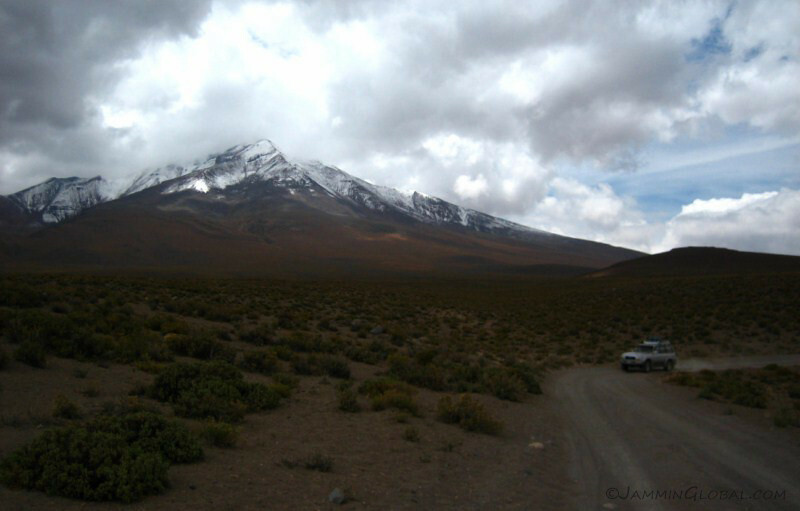 A panorama taking in the route and the ever-present volcano. 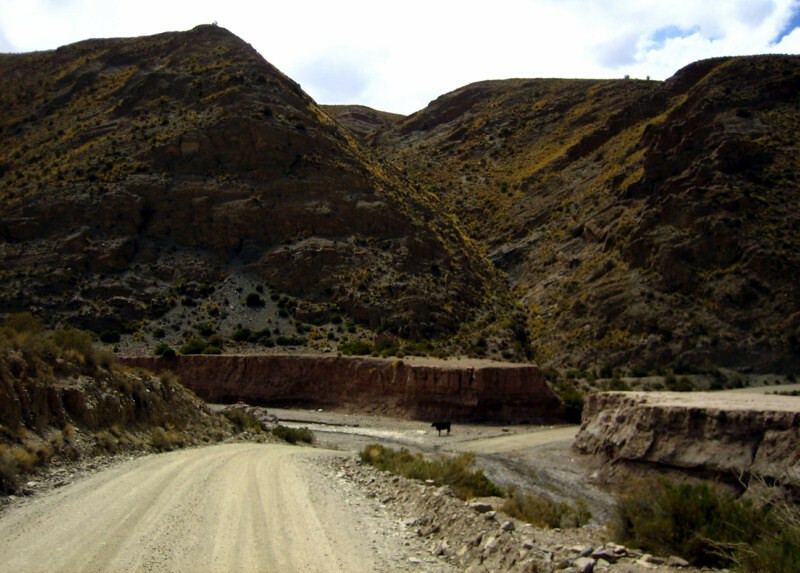 The old route crossing over the muddy arroyo before Atocha. 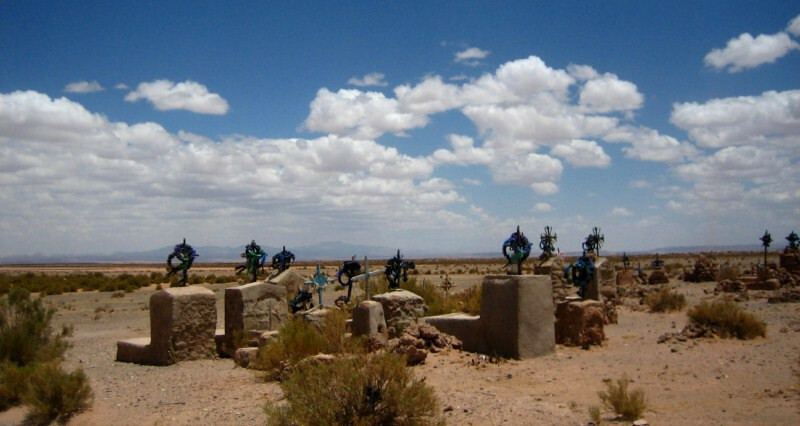 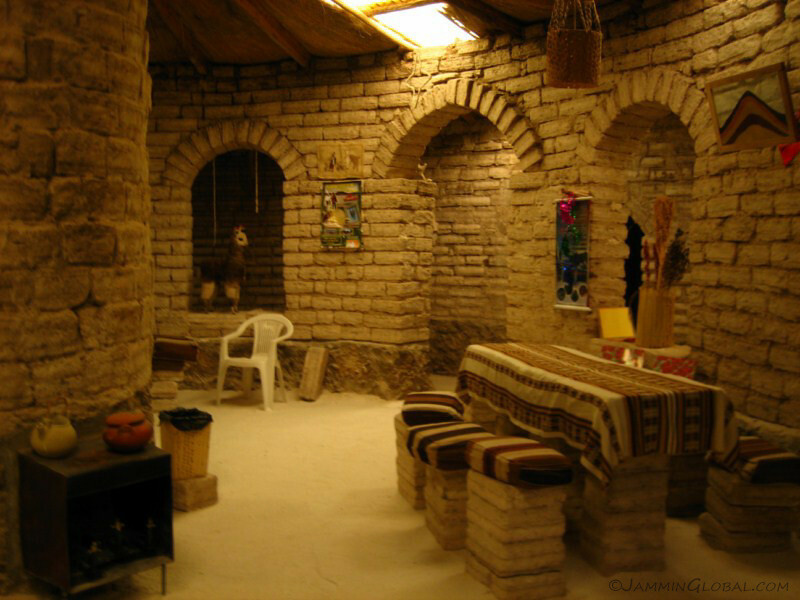 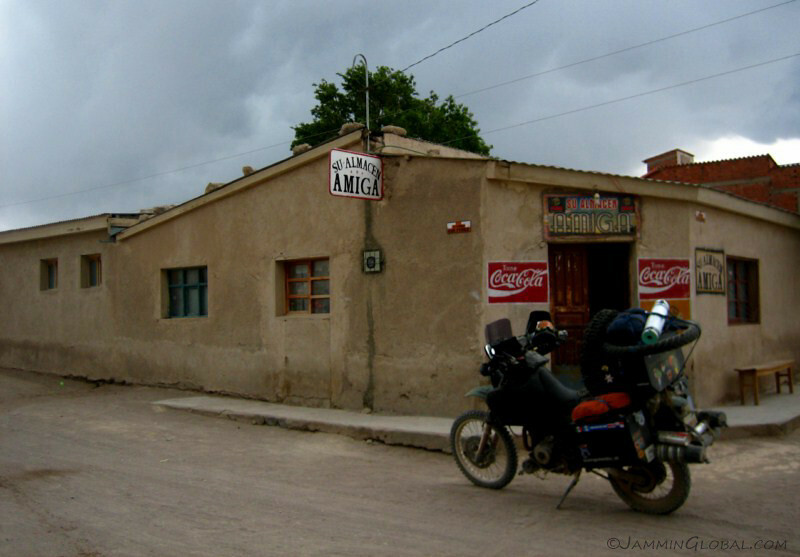 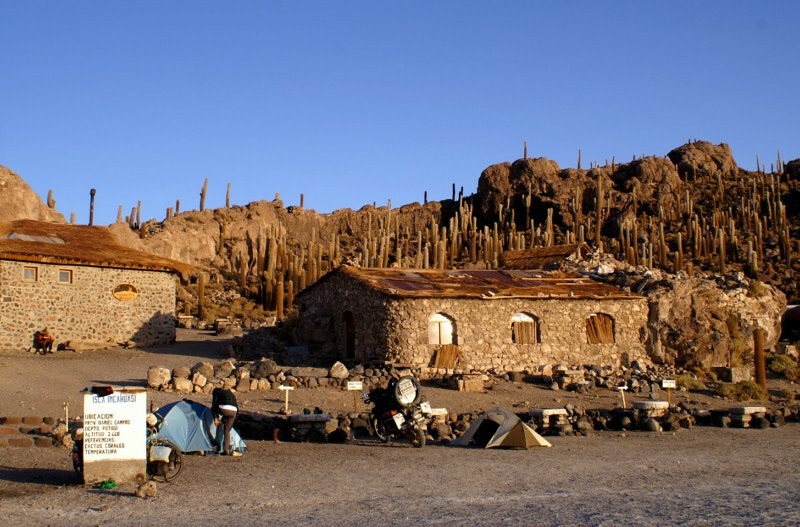 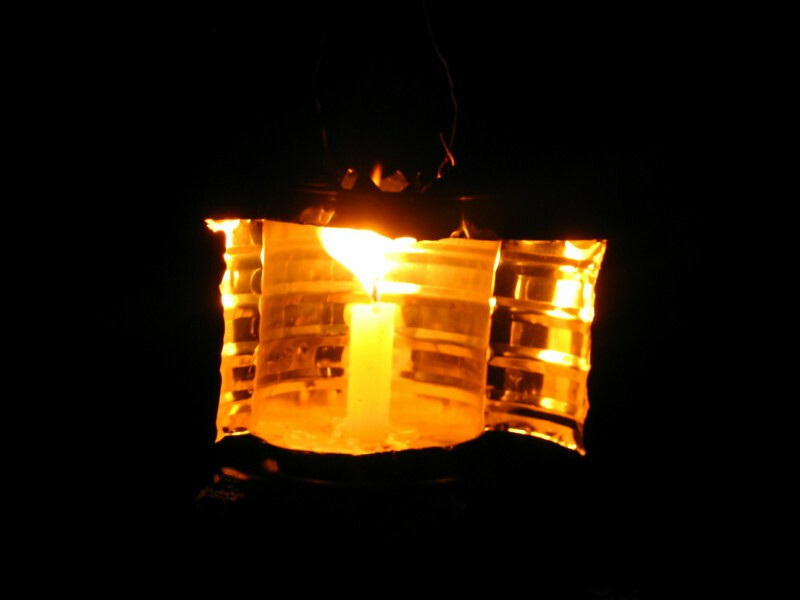 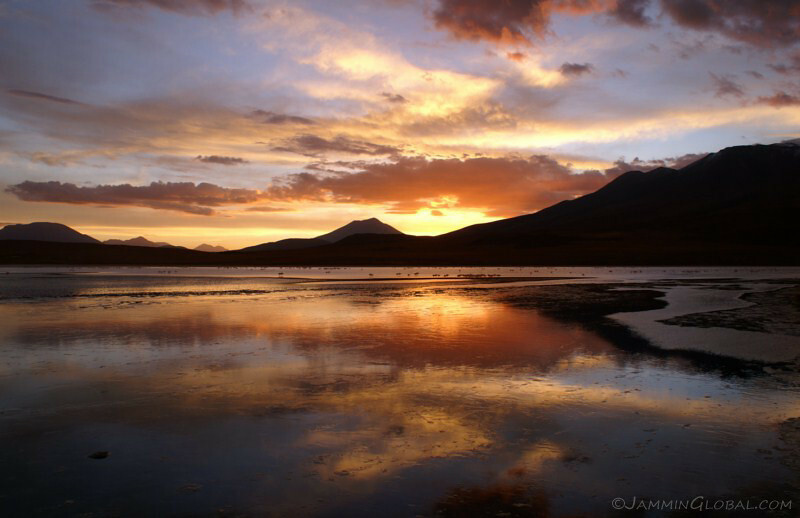 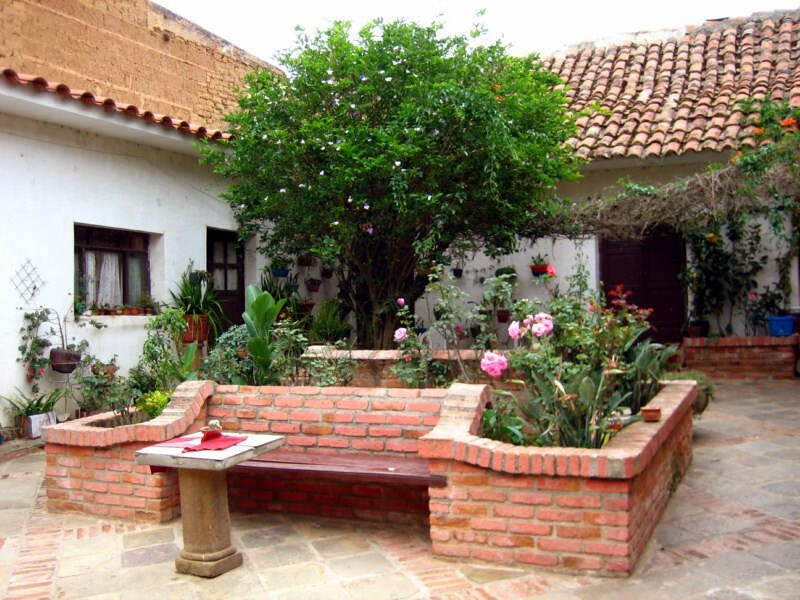 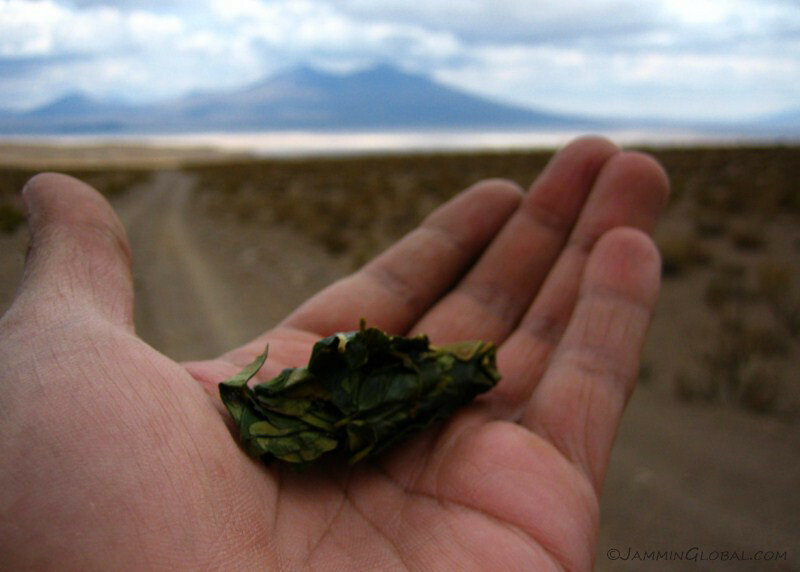 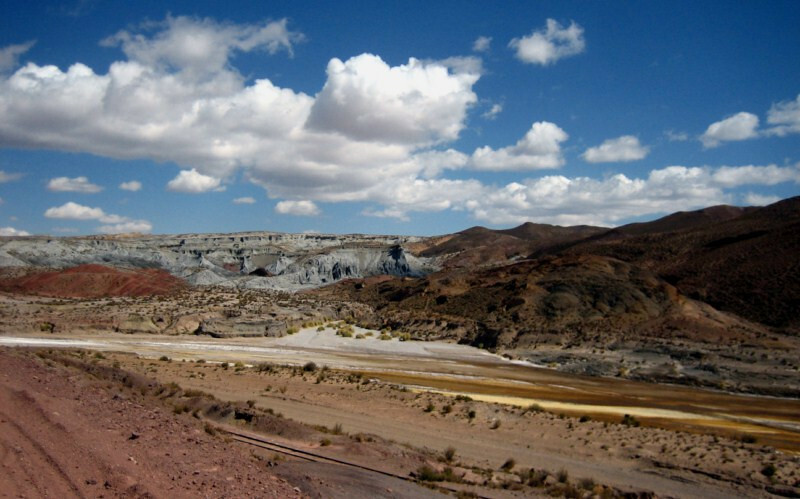 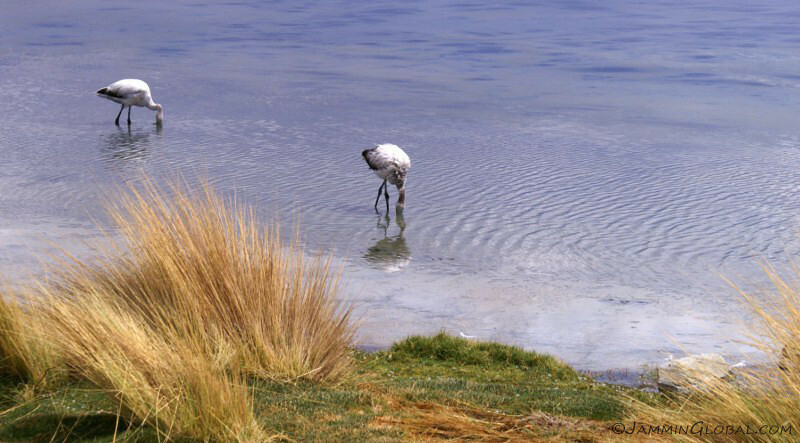 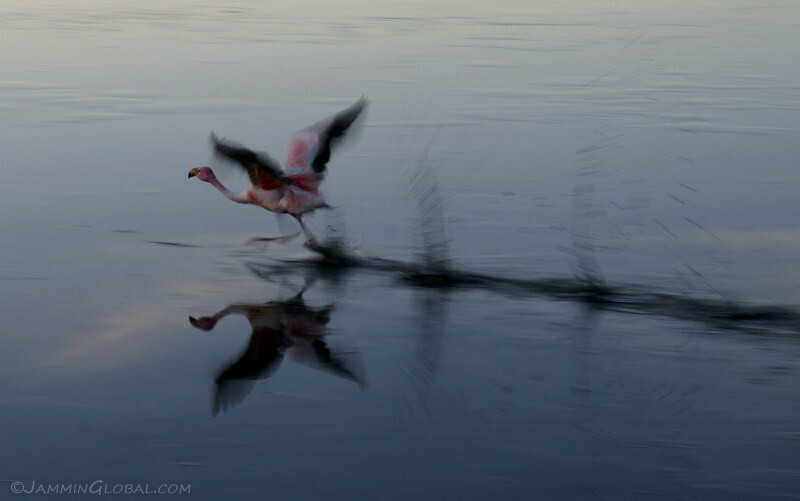 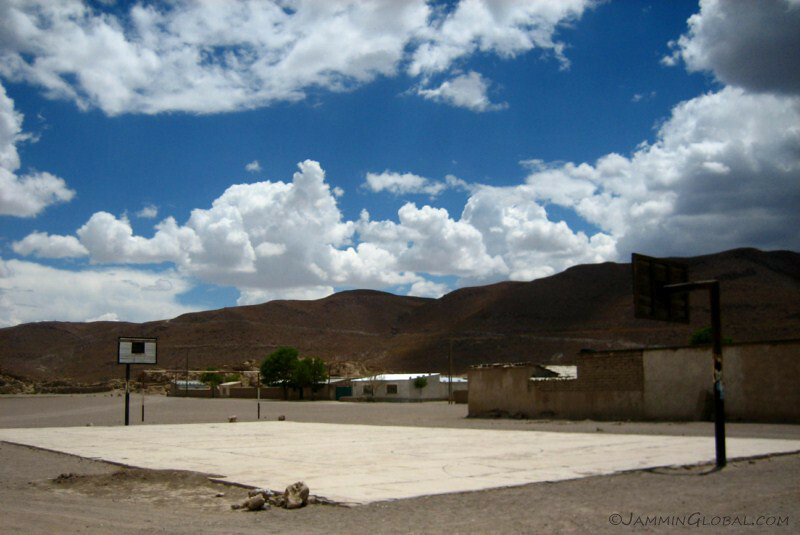 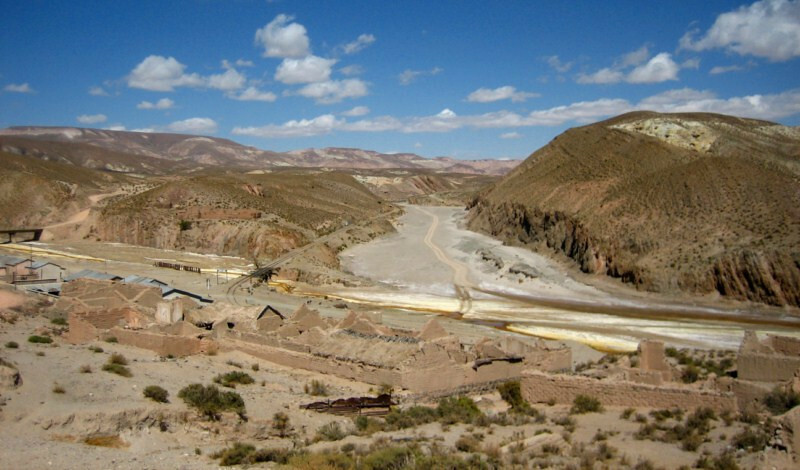 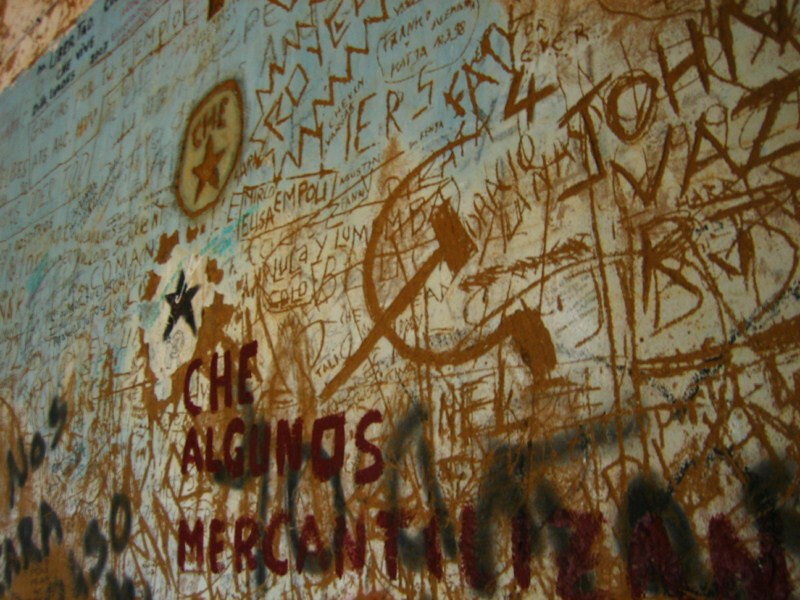 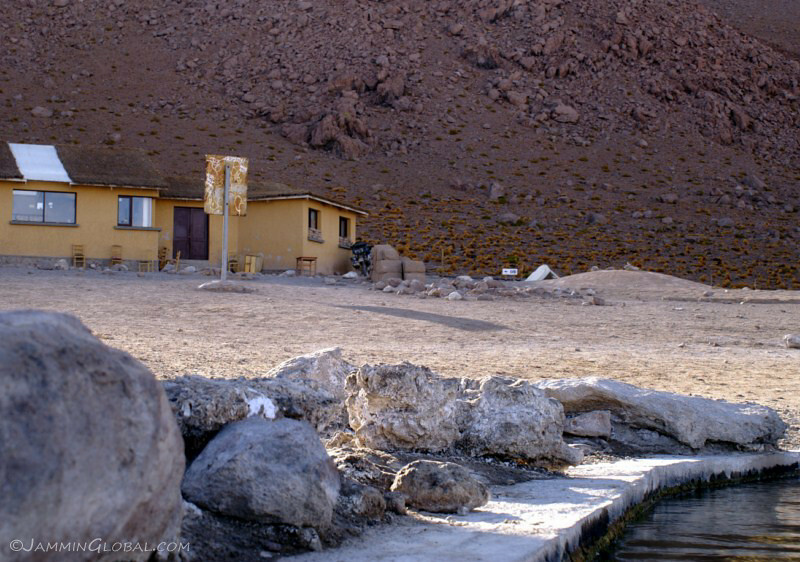 …arrive in Atocha, a small mountain town halfway to Uyuni. 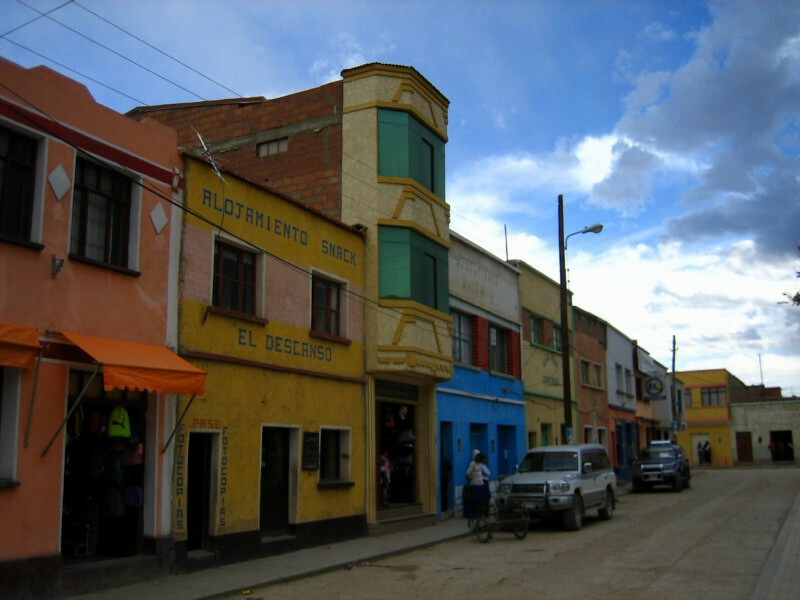 The brightly colored buildings were a stark contrast to the surrounding natural hues. 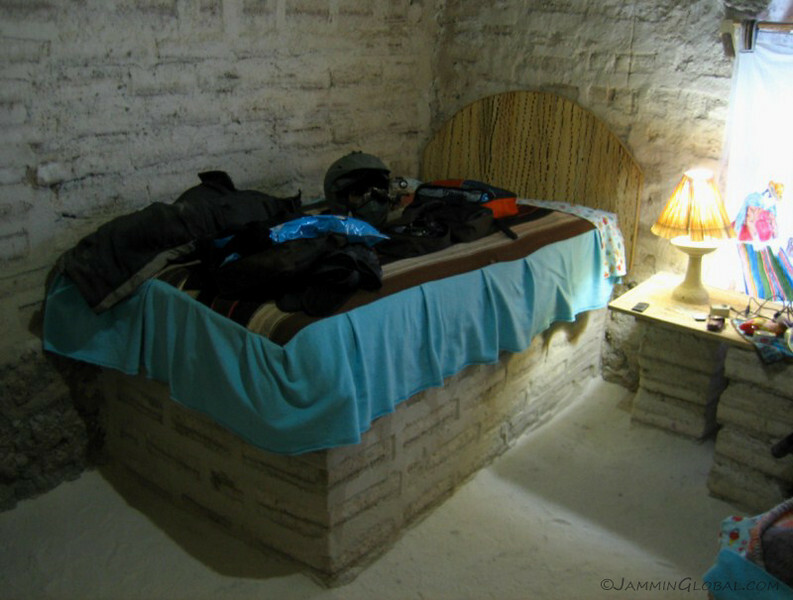 I got a room there for B20. 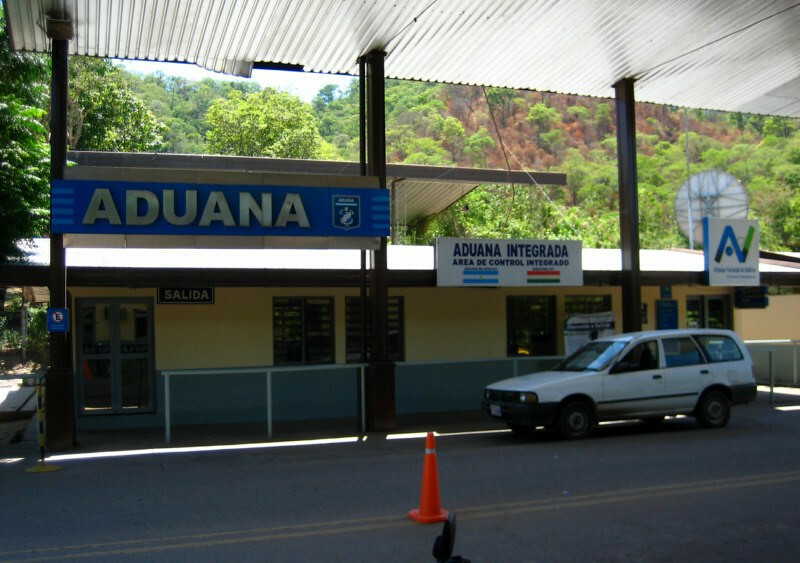 The bus station and airport all in one place. 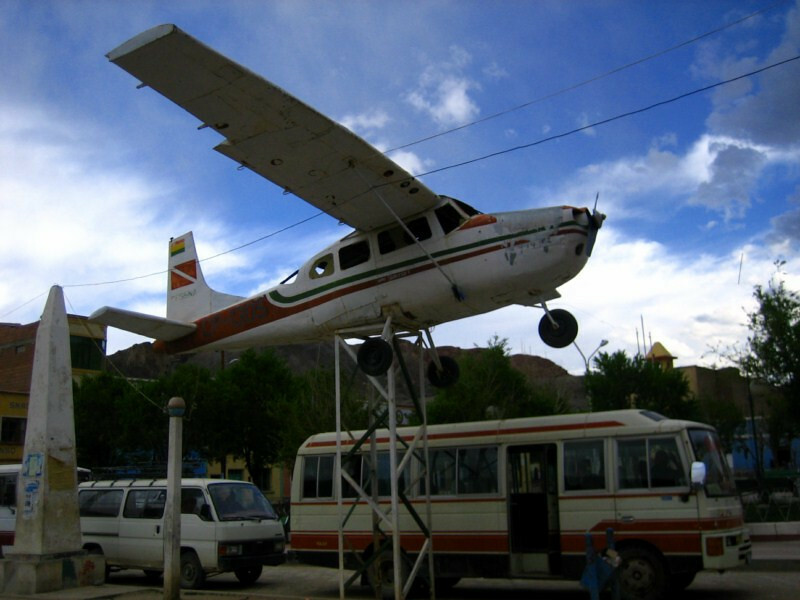 I guess when the wind picks up, you could just unbolt it from the tower and lift off. 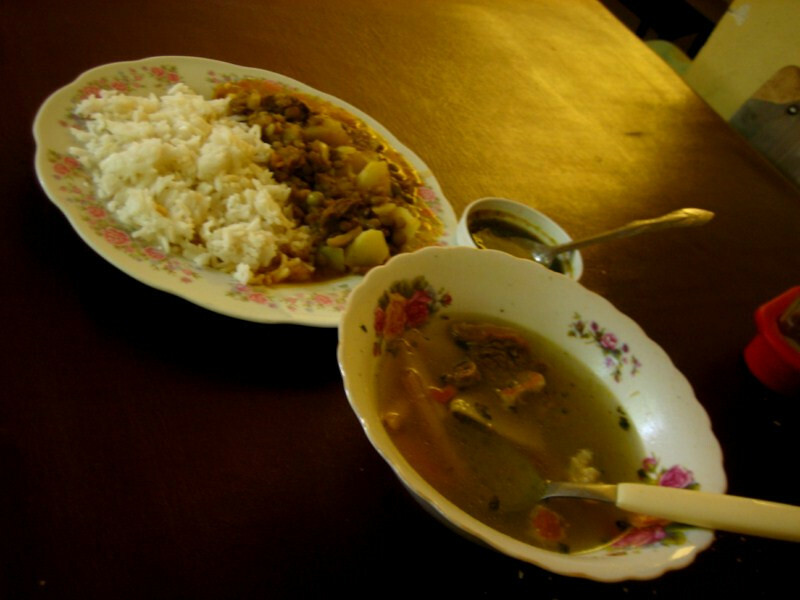 Dinner at the mercado of a warming soup and meat and potatoes with rice. 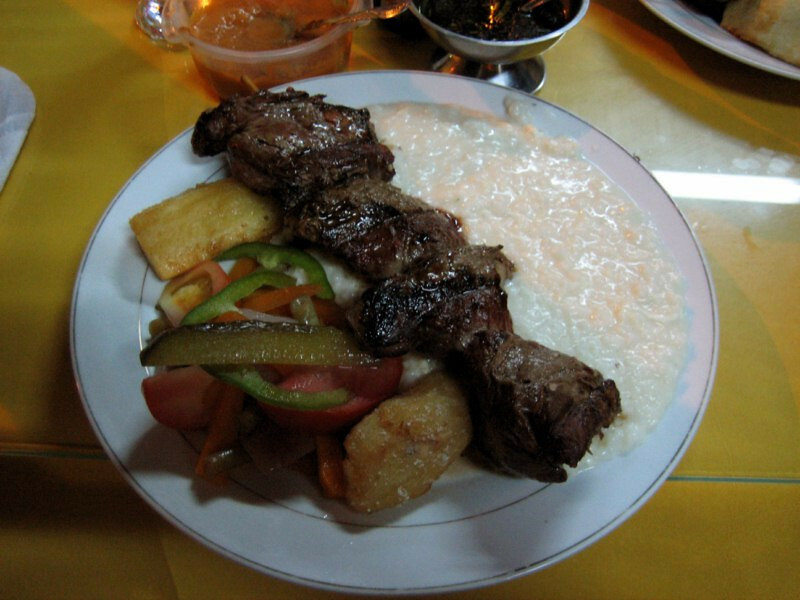 Even if the main dishes stay the same throughout this area, the hot sauce varies. 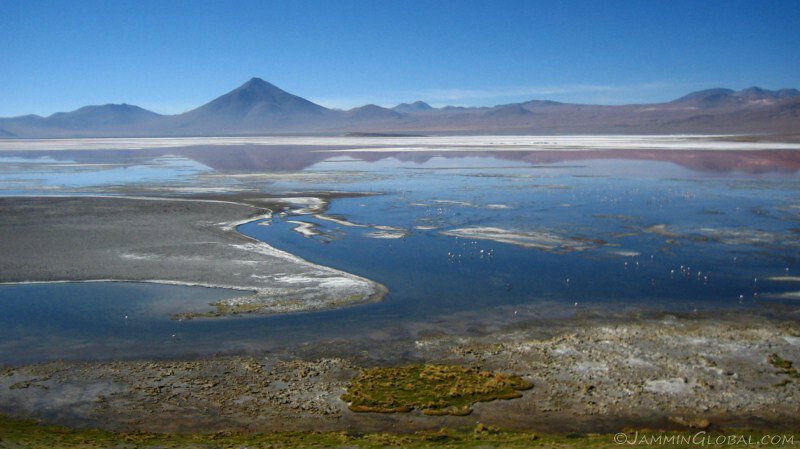 I was back in Bolivia to see parts of this geologic marvel of a country that I missed on my first visit when I came down from the north in July. 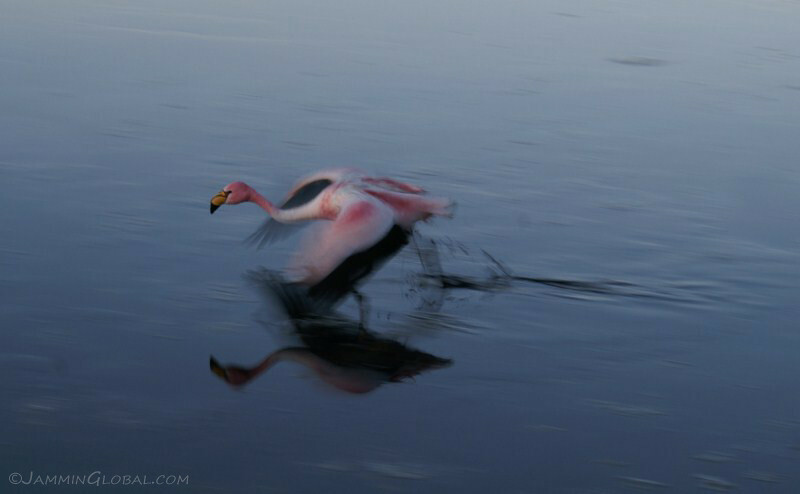 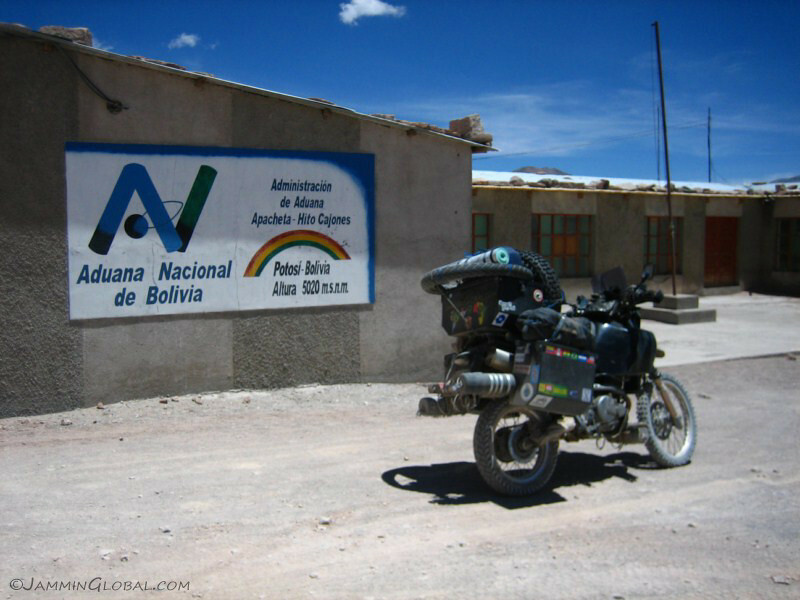 I was on a tight schedule of sorts for Brazil, so I had to skip a tour of southwestern Bolivia after I had my first major breakdown and had to turn north for the Amazon. 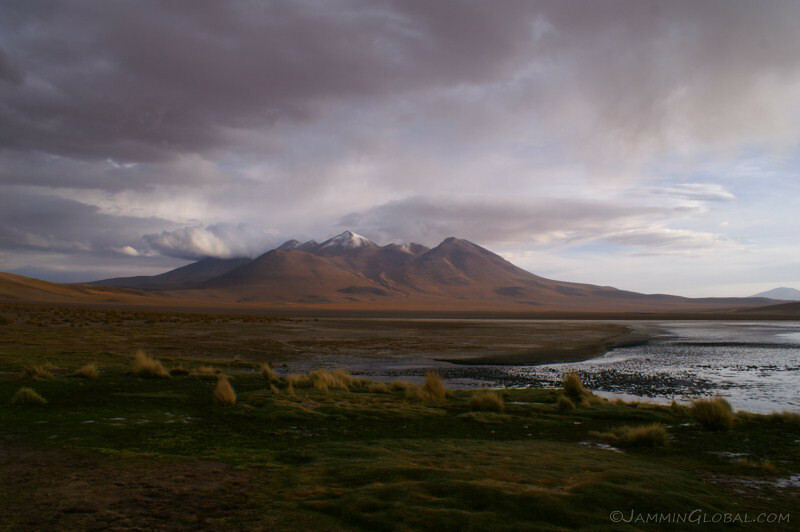 It all works out well in the end, because I got to see much more of this country on this second visit. 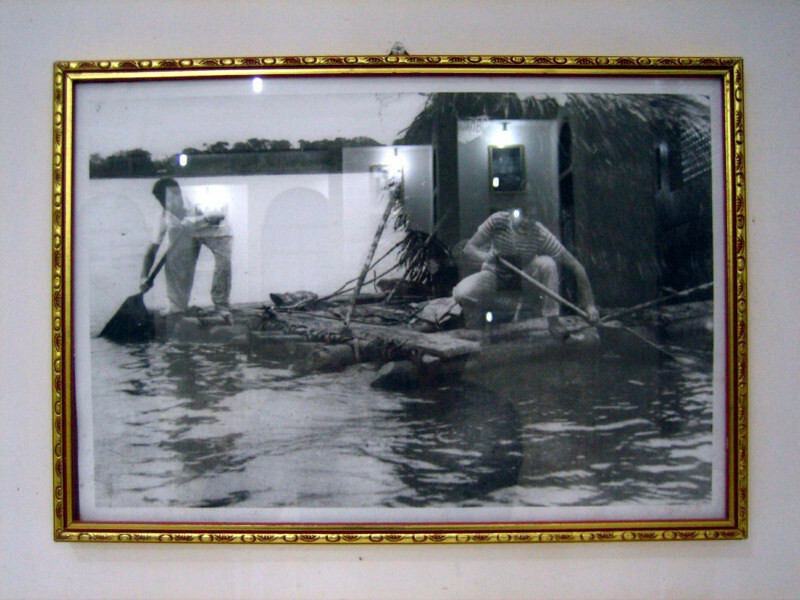 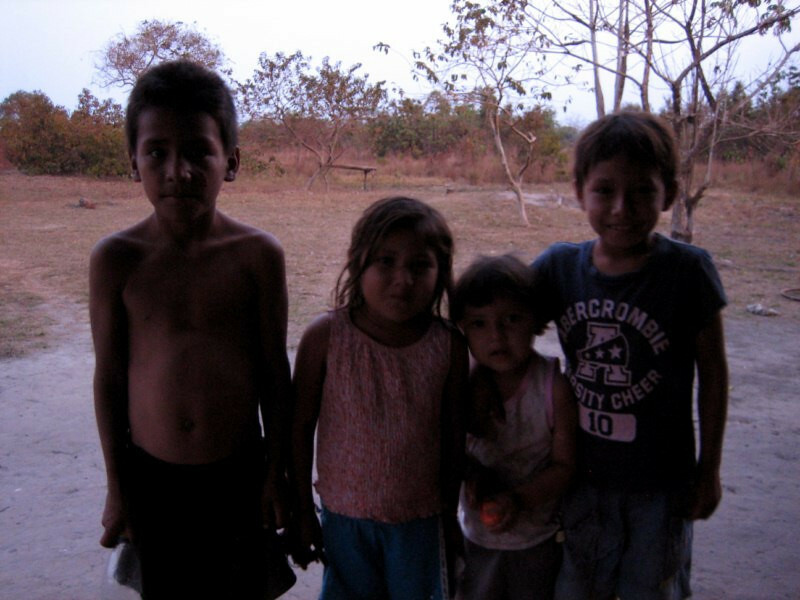 It was also a relief to be back in a less developed country for a change after the expenses of Brazil and Argentina. 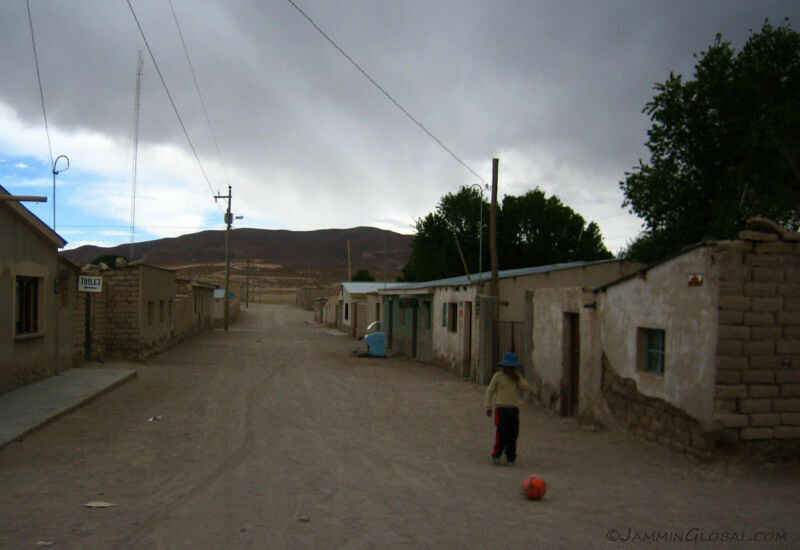 Bolivia is an Andean nation and not that rich compared to its neighbors, but neither is it poor. 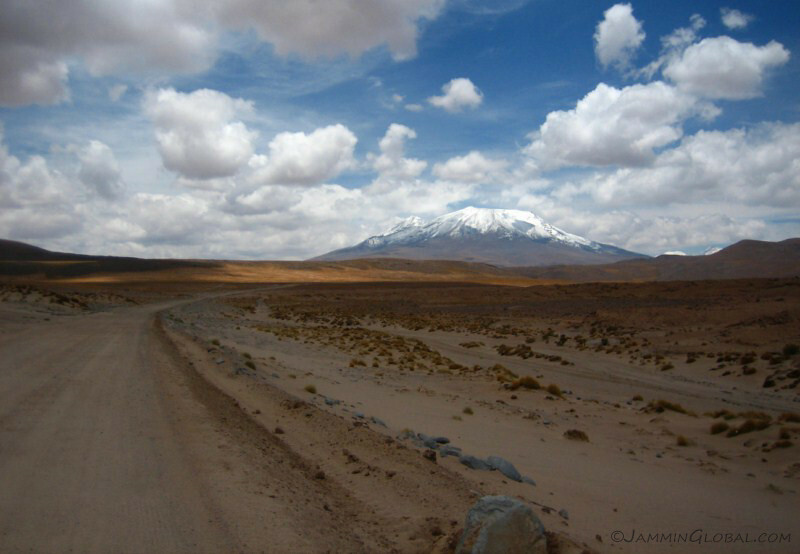 It just seems to keep chugging along and it’s a highlight on travelers’ maps for the amazing landscape the Andes put on and the warm locals they encounter. 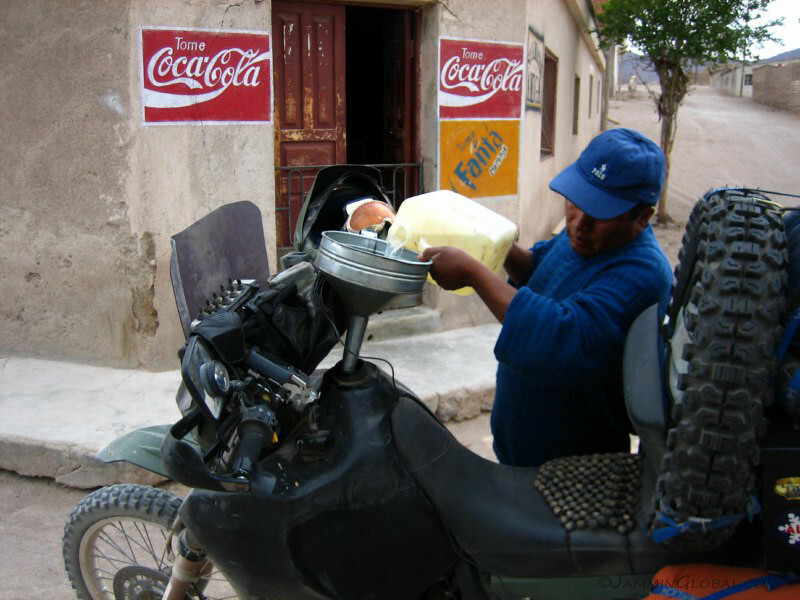 I headed up to the big city of Santa Cruz to refresh sanDRina before the rough off-road riding through the southwest. 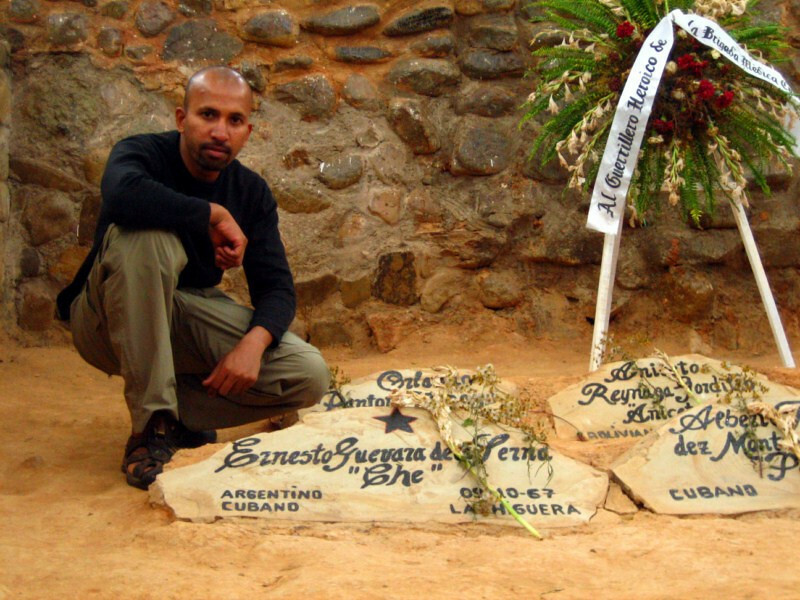 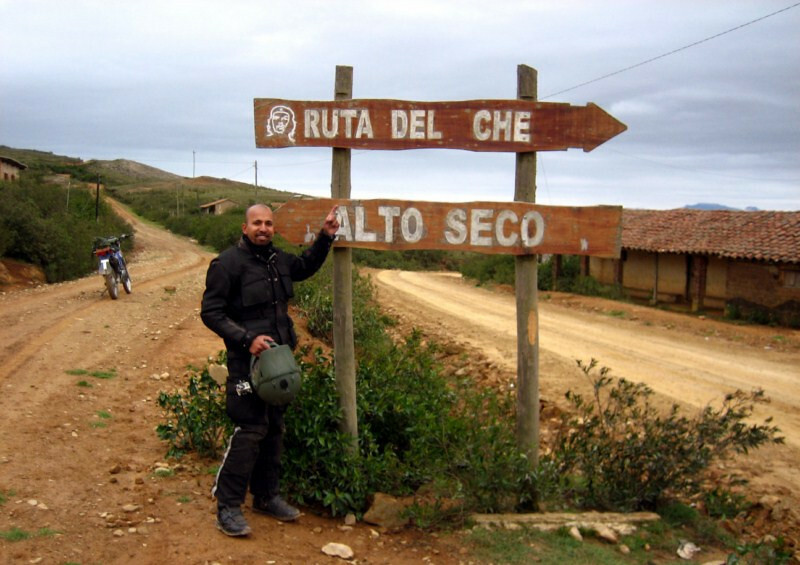 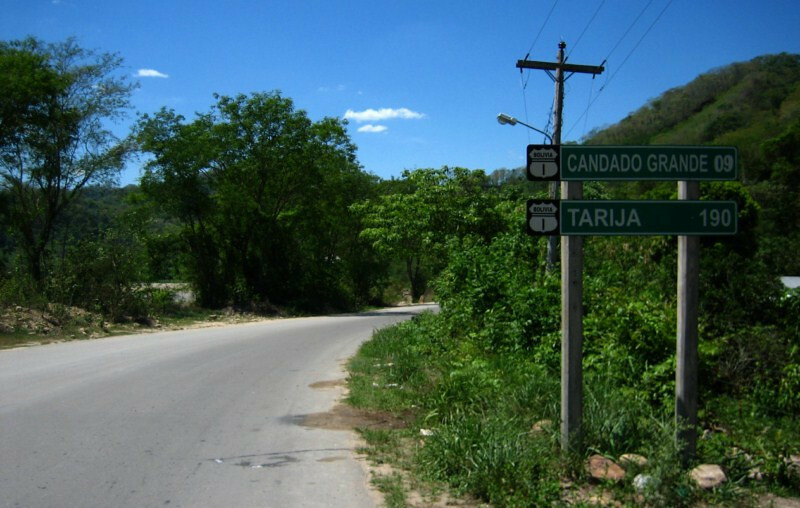 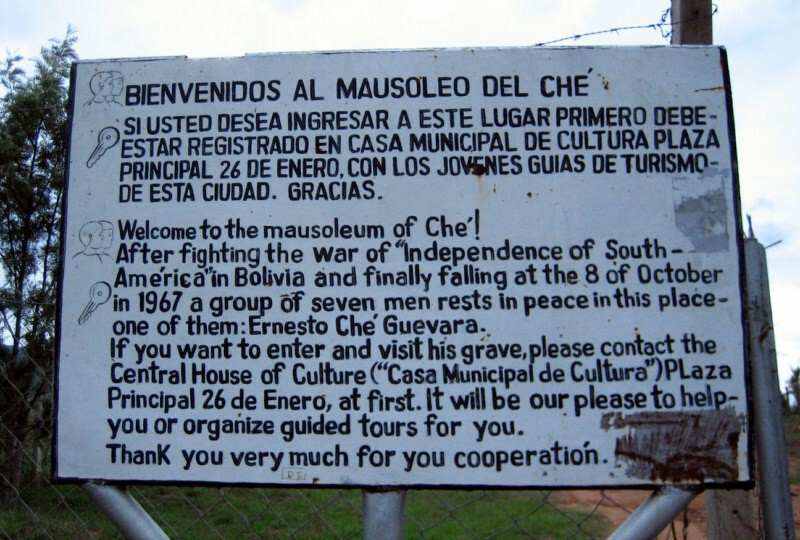 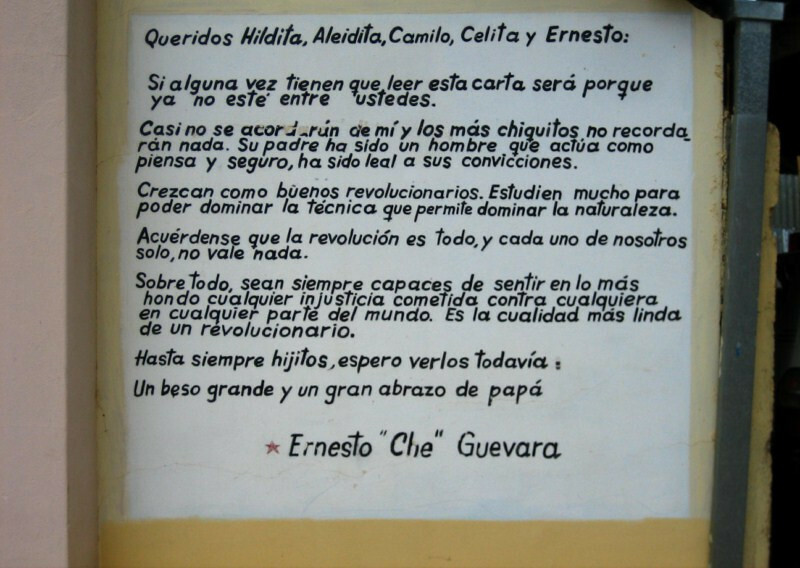 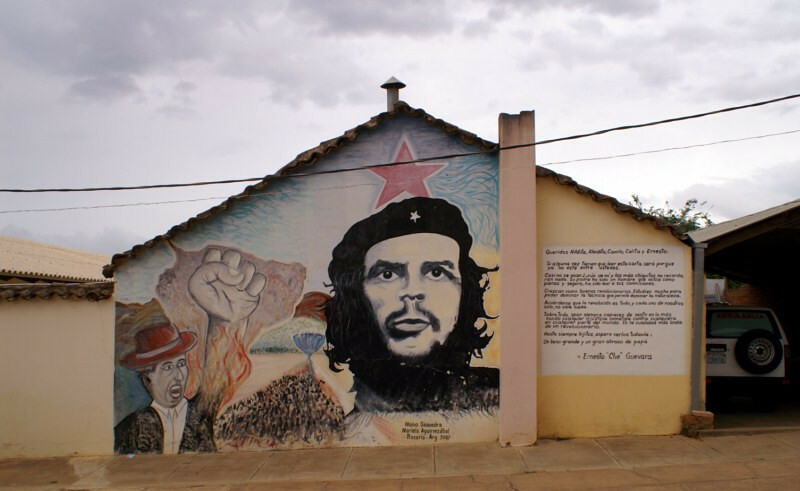 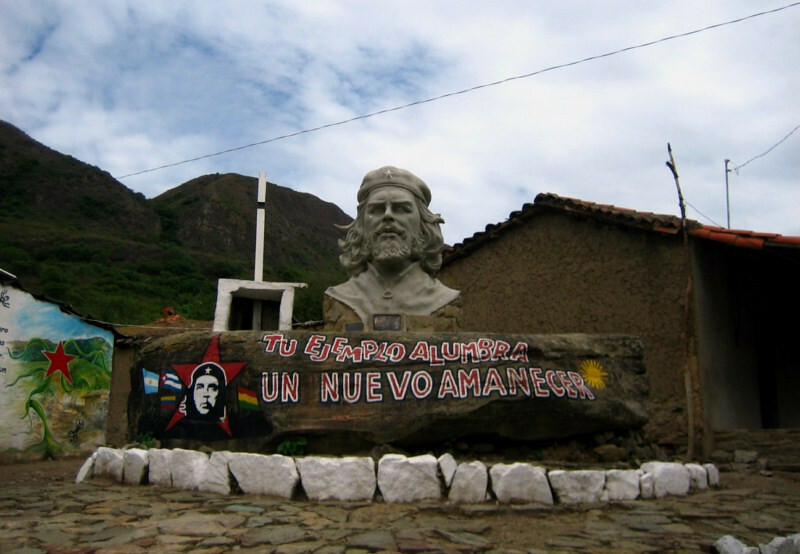 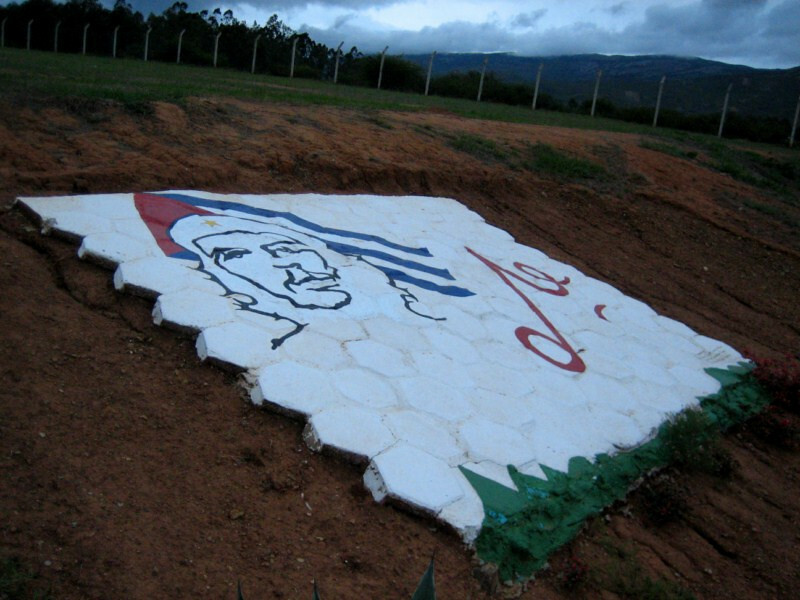 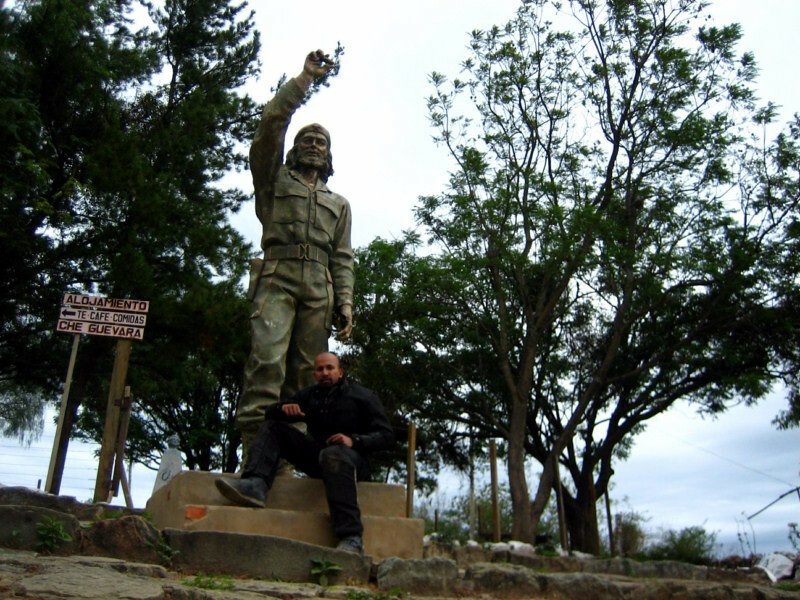 From there, I took the newly developed Ruta del Che, a remote trail following the last days of Che Guevara and getting to Sucre. 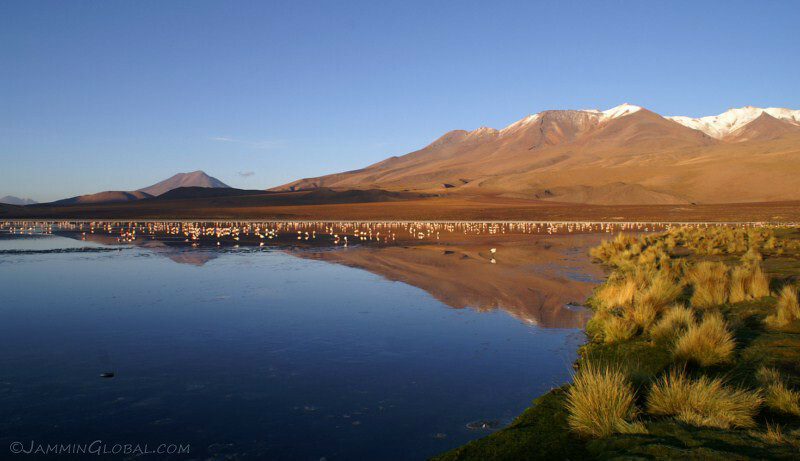 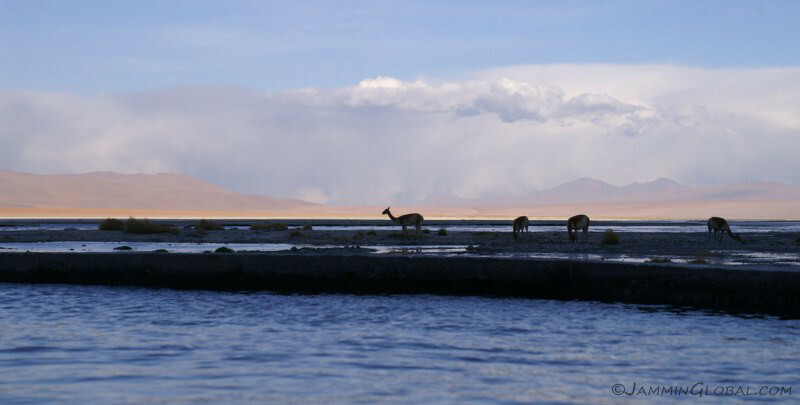 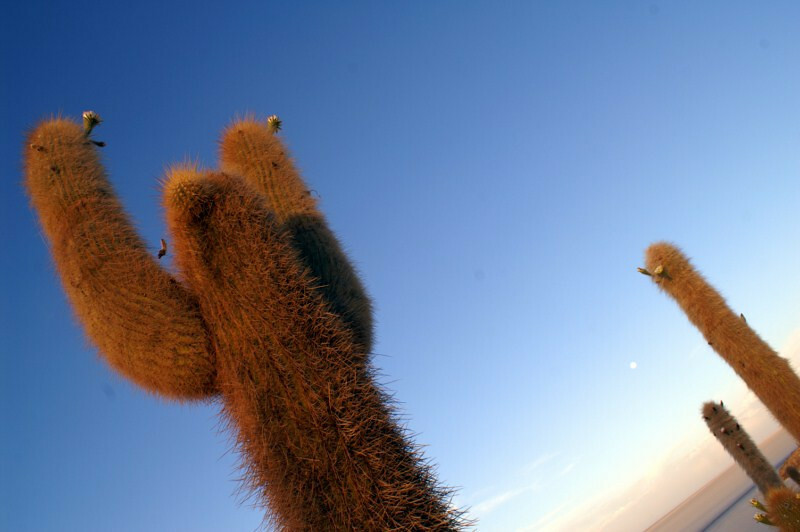 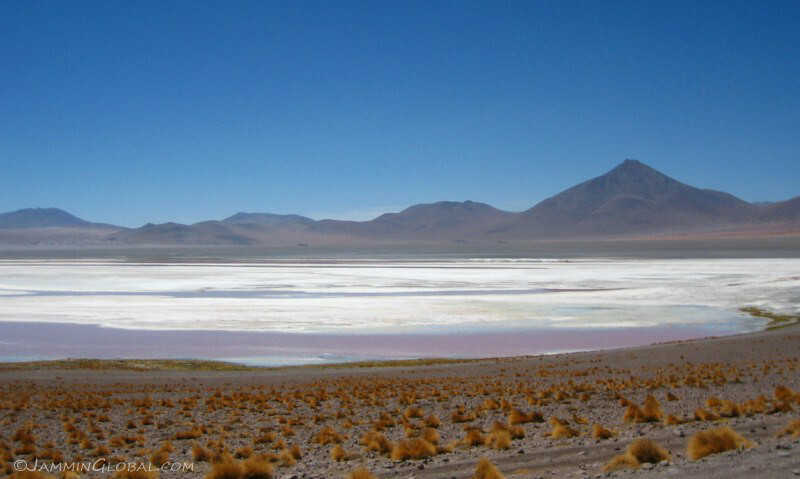 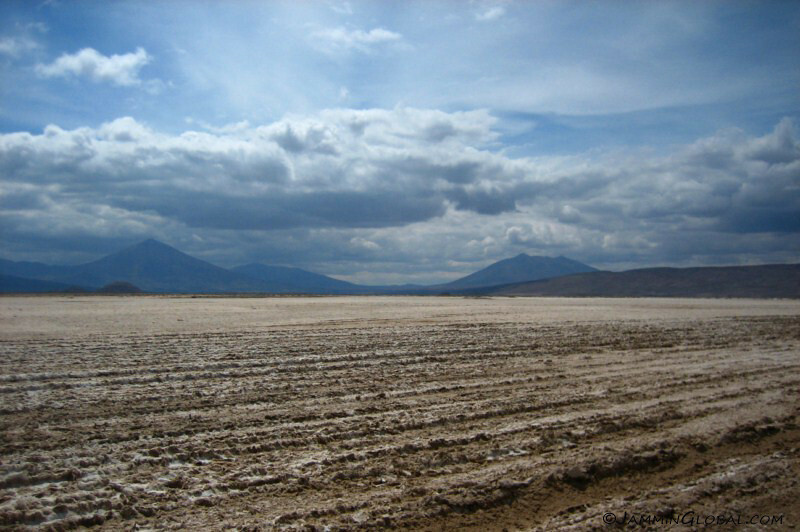 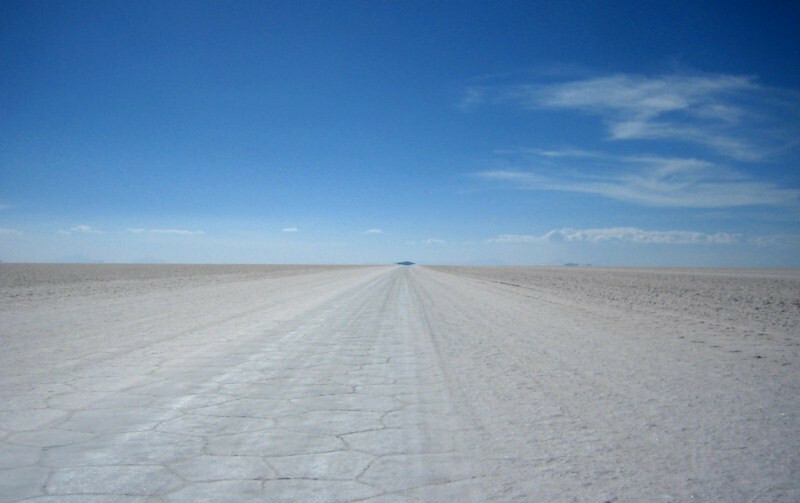 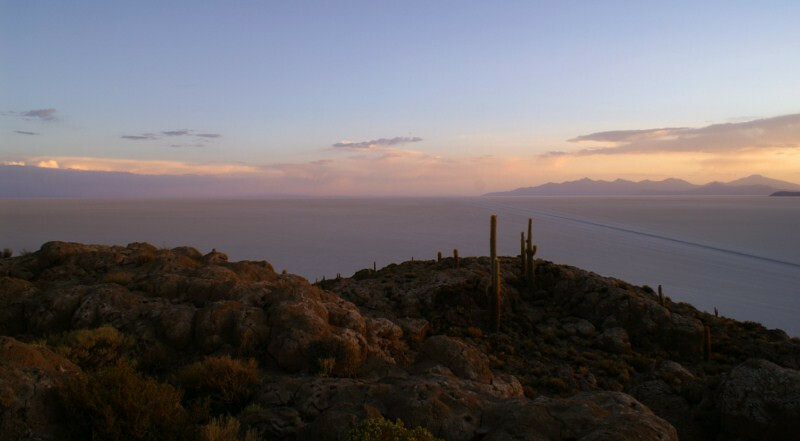 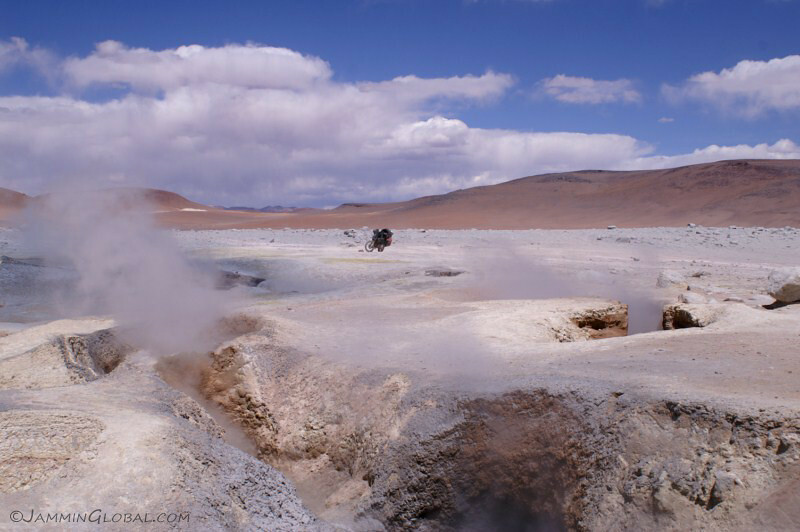 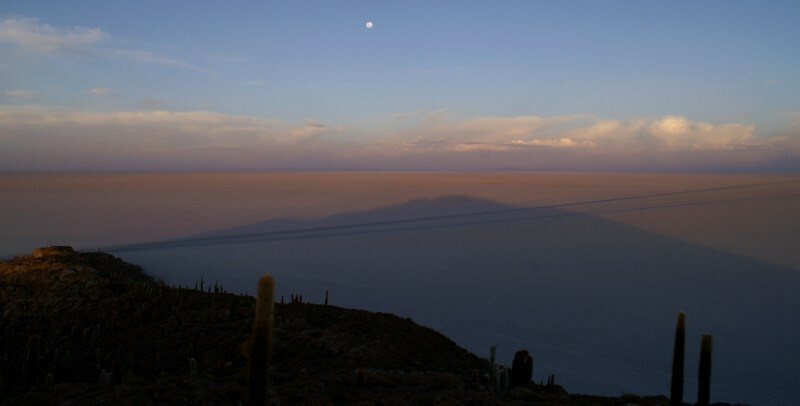 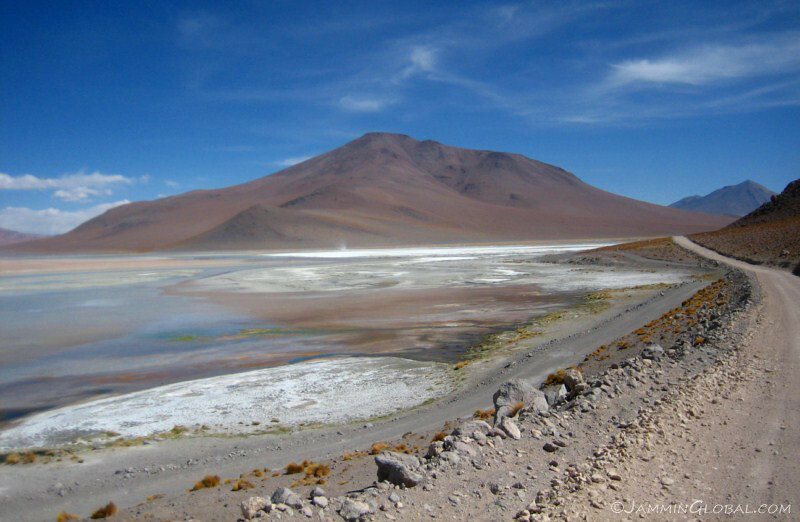 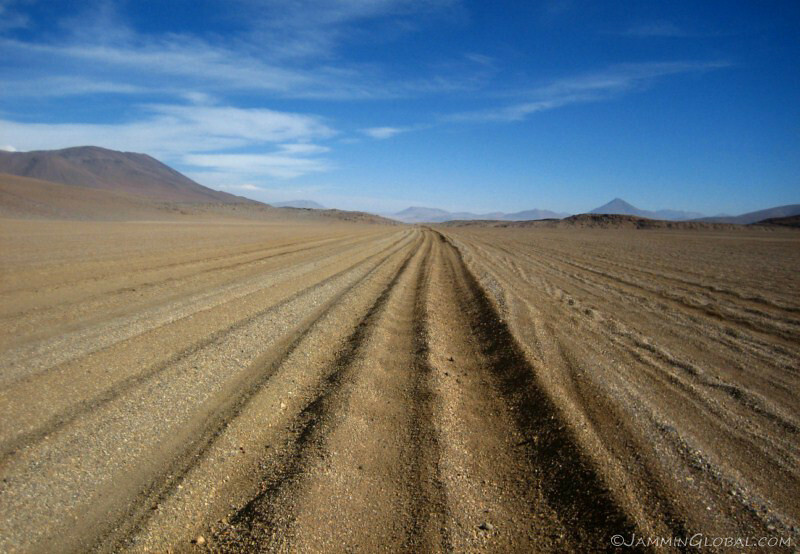 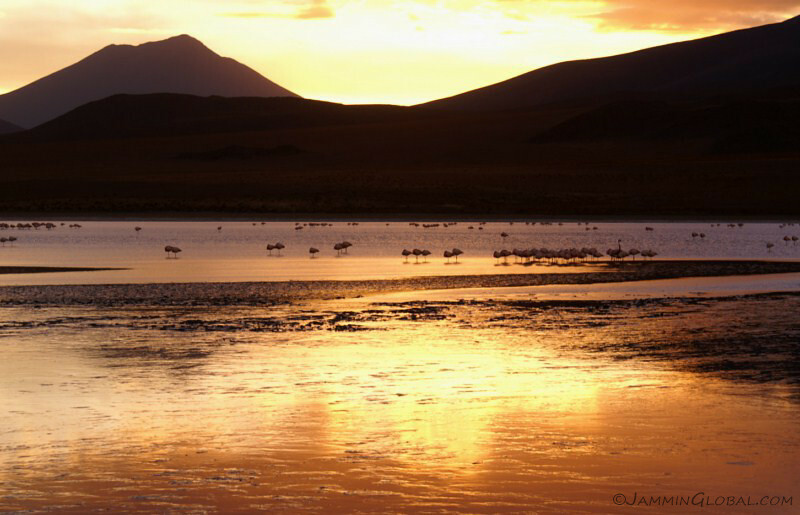 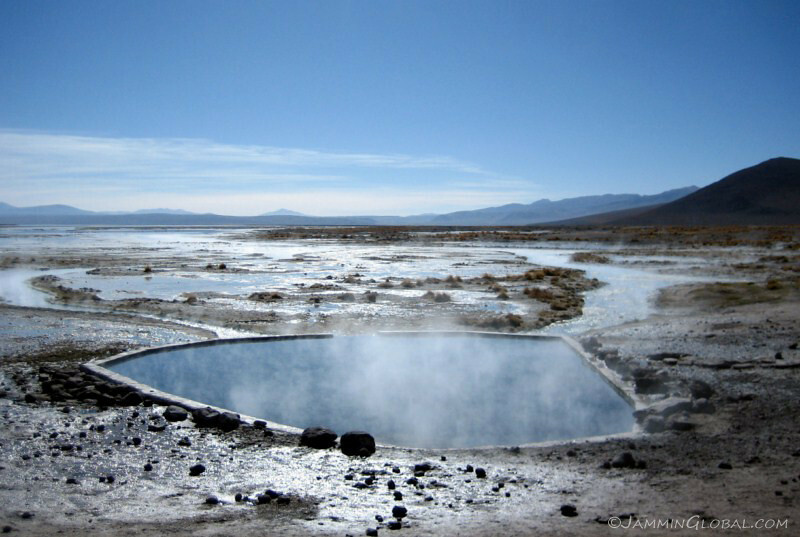 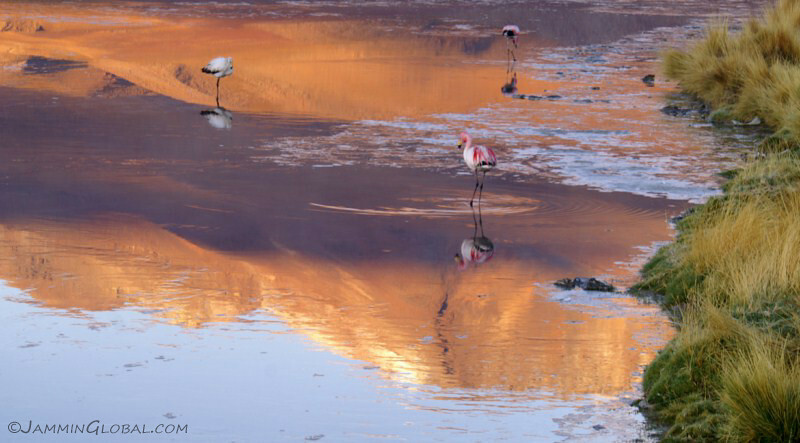 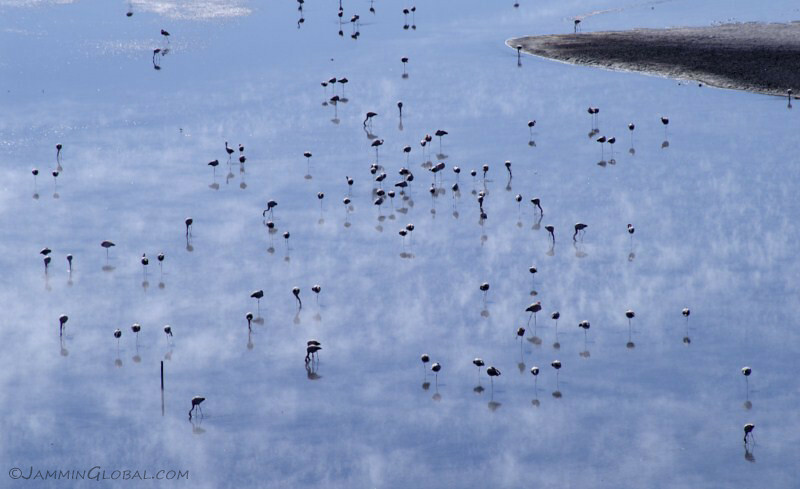 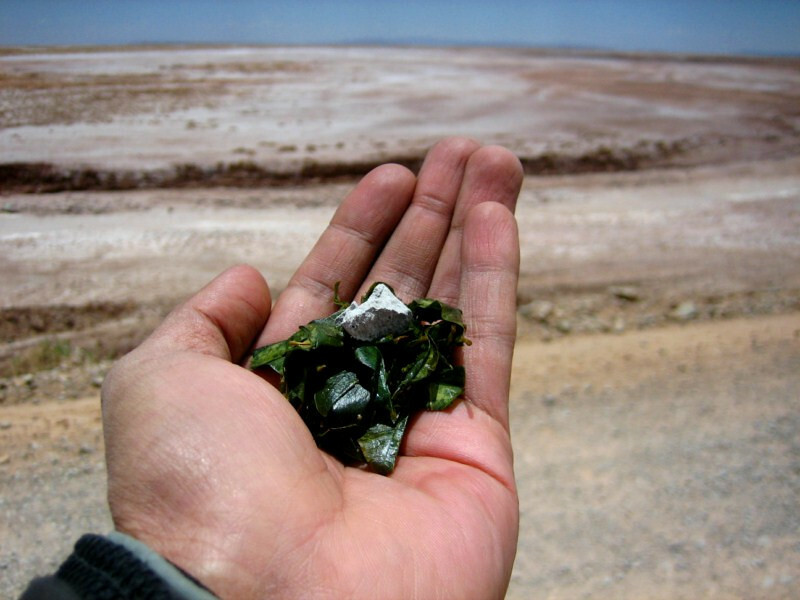 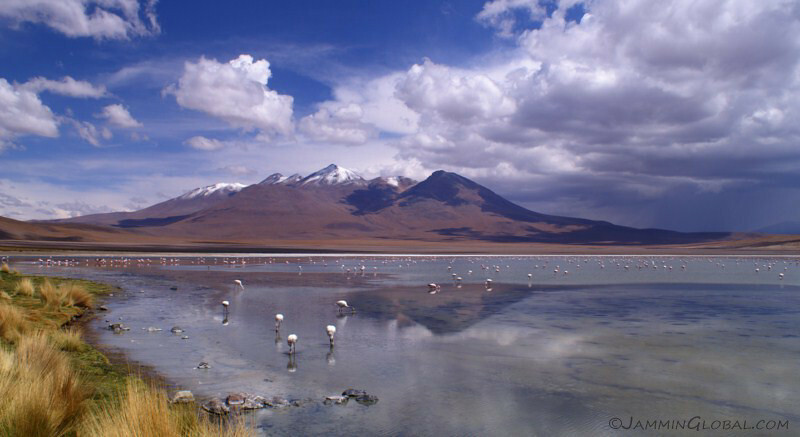 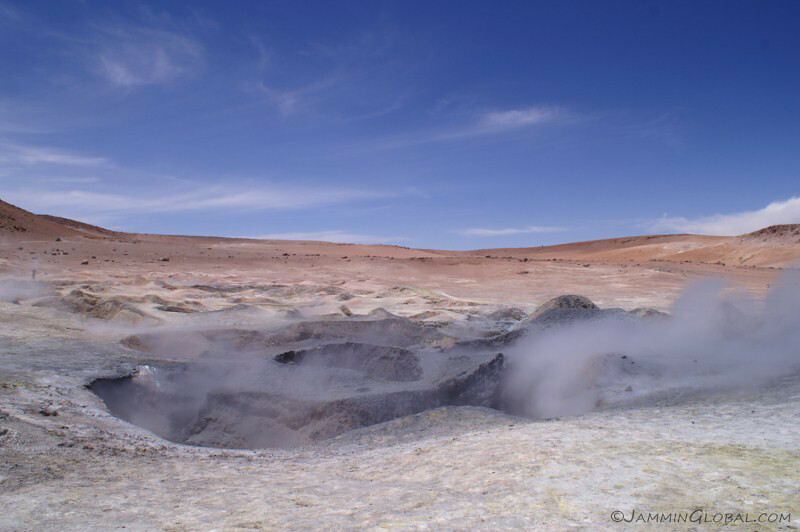 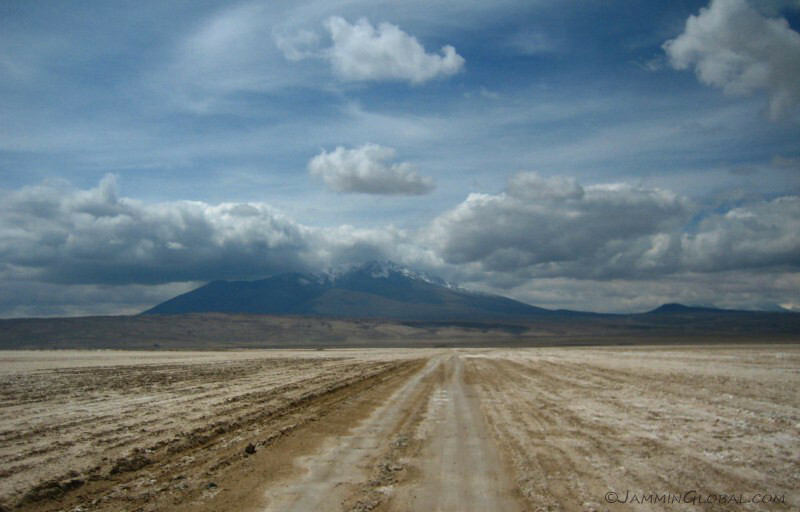 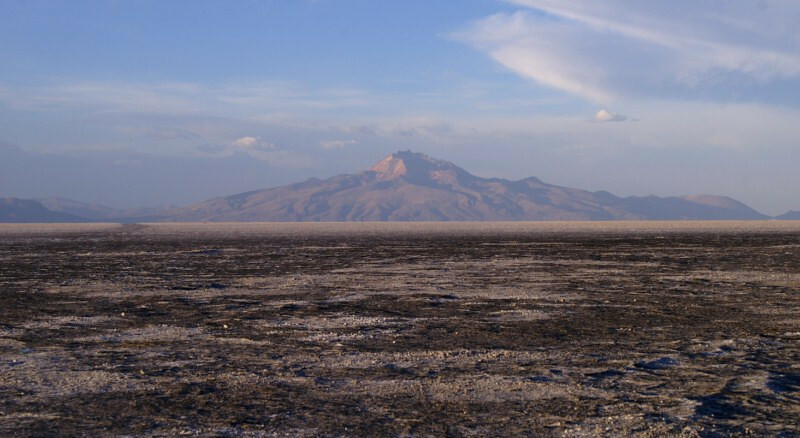 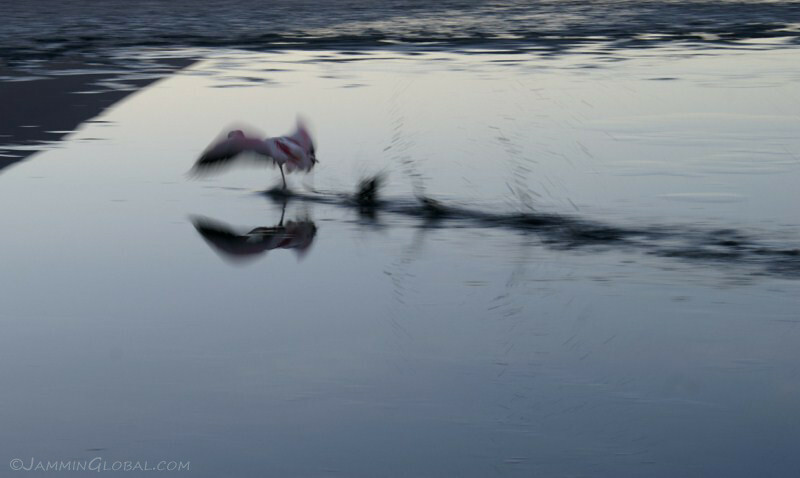 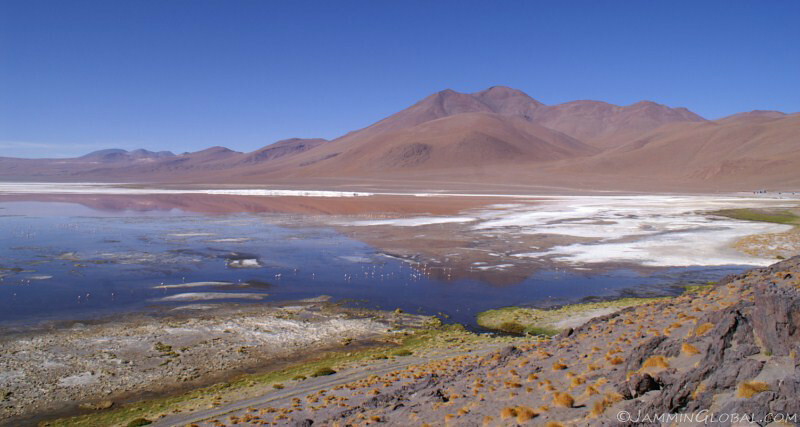 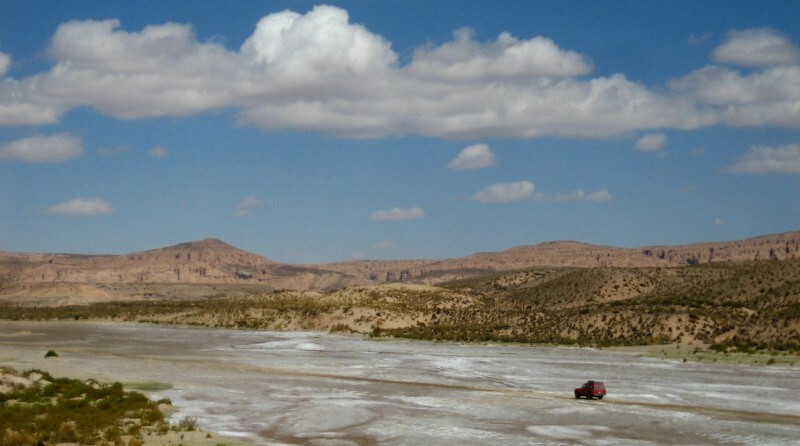 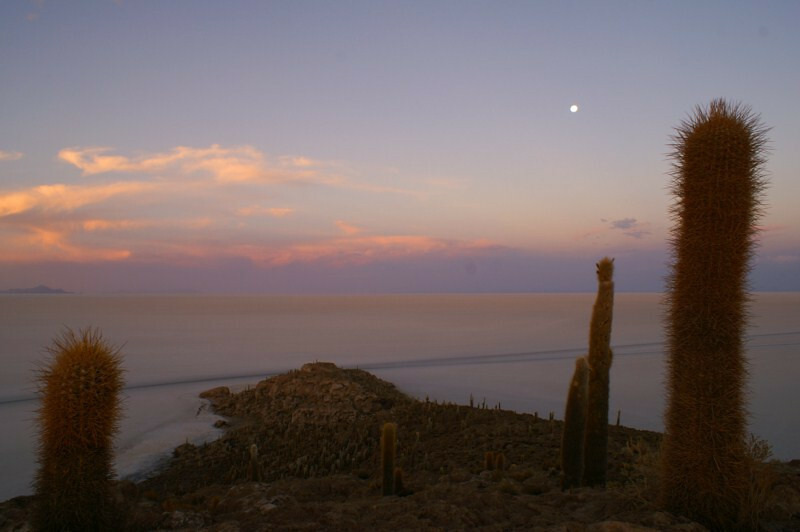 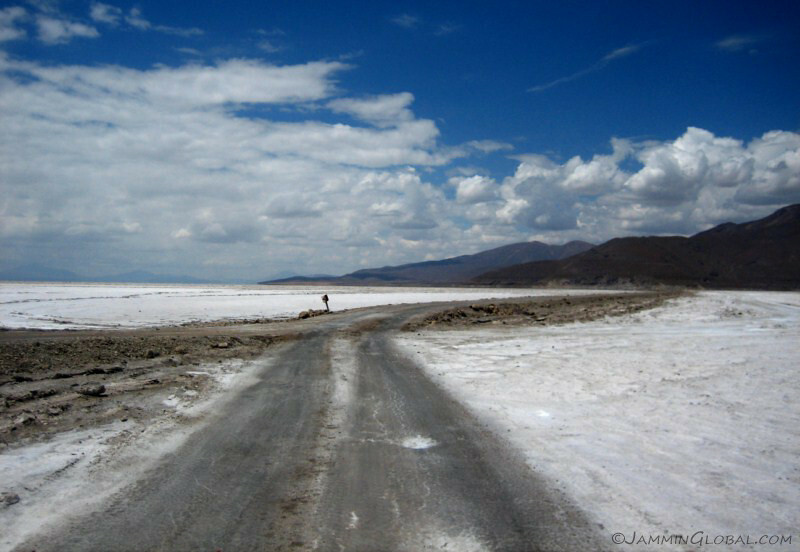 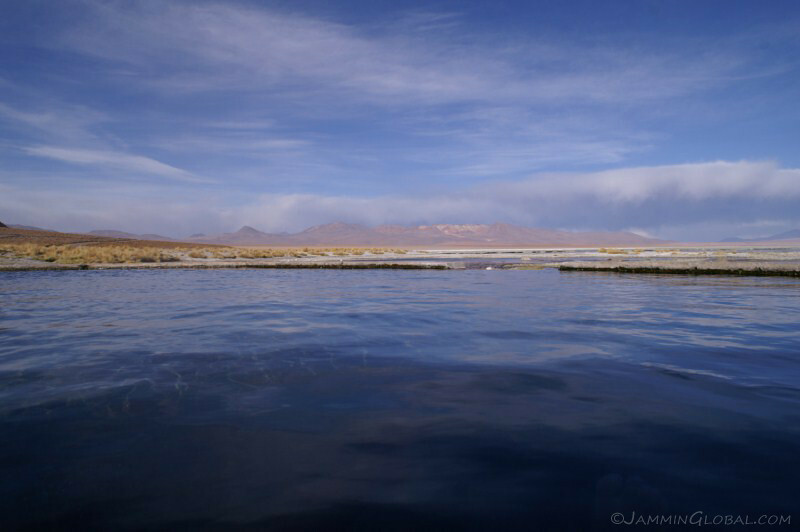 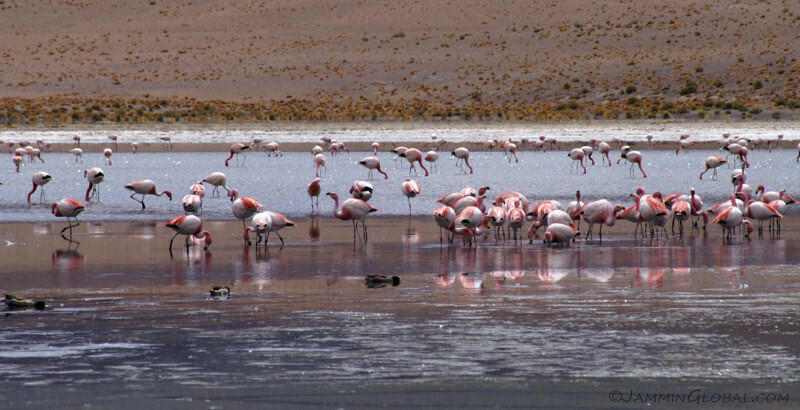 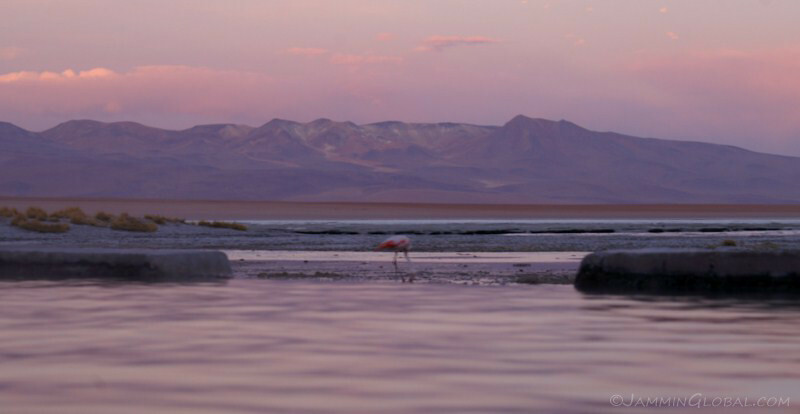 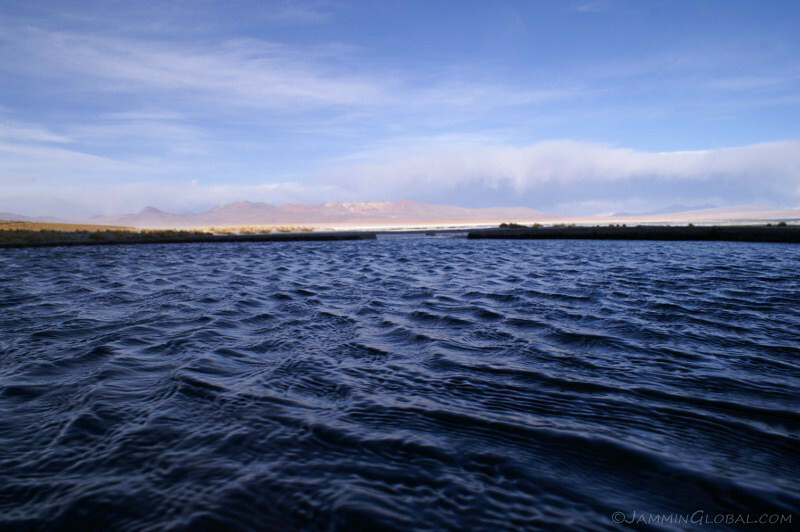 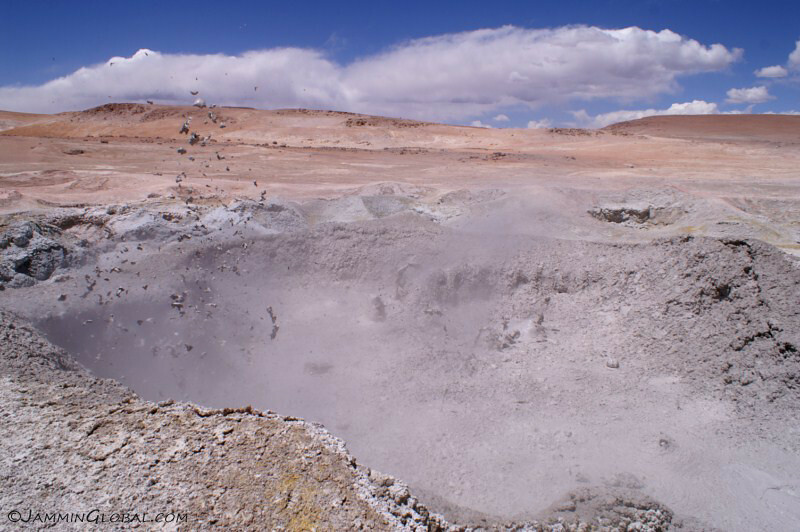 After dipping down to Tupiza, the geologic fun started heading to Uyuni and its Salar. 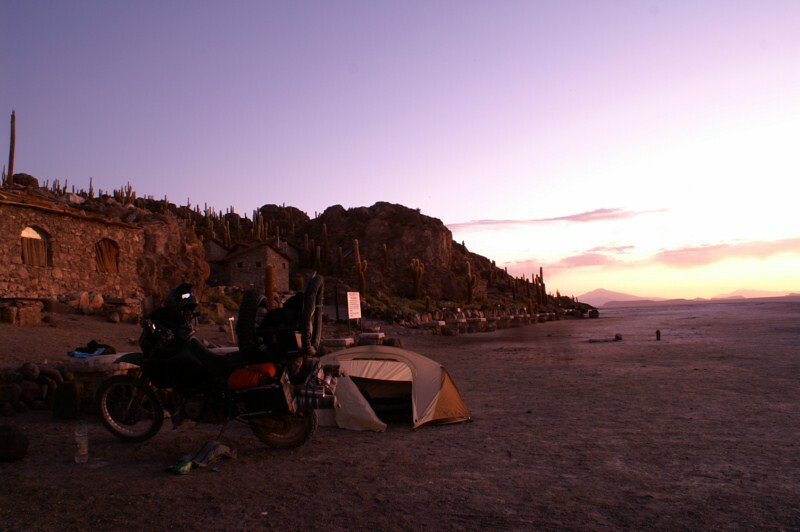 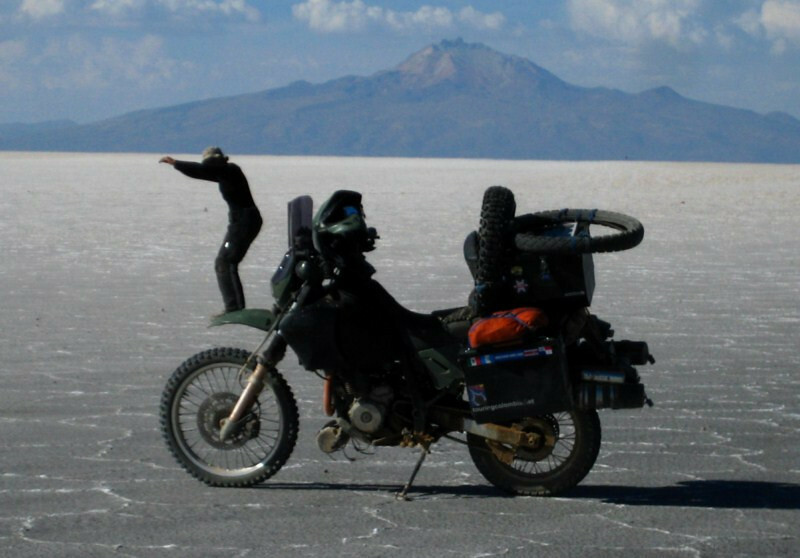 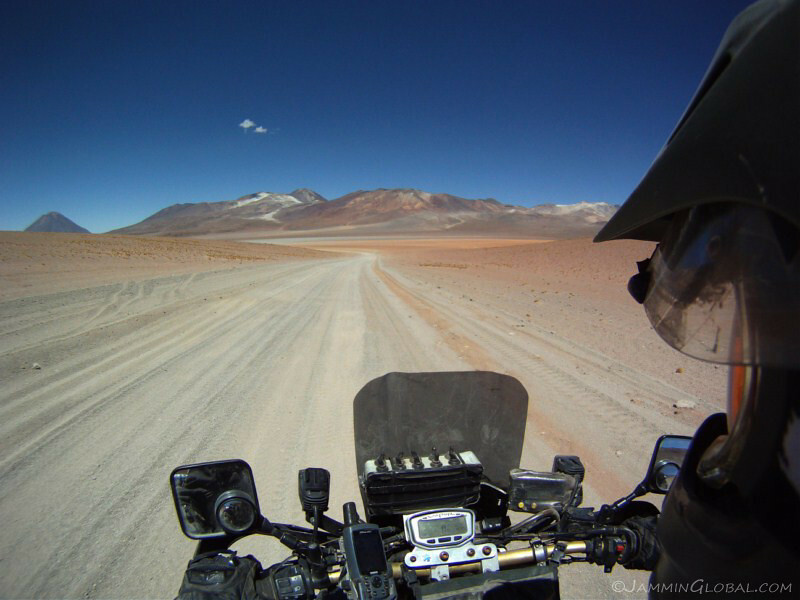 After playing in the bizarre landscape, the experience turned up a notch on the remote, high-altitude crossing via the Lagunas Route to northern Chile, the highlight of my ride thru South America. 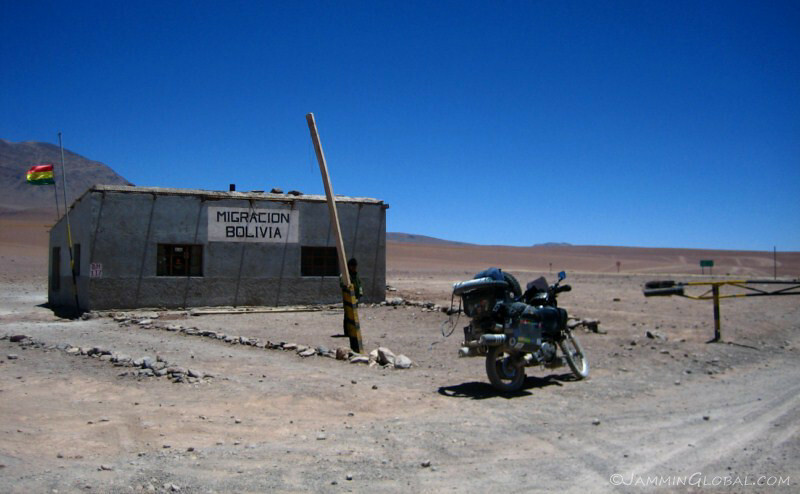 Efficient border crossing at Aguas Blancas (Arg) and Bermejo (Bol). 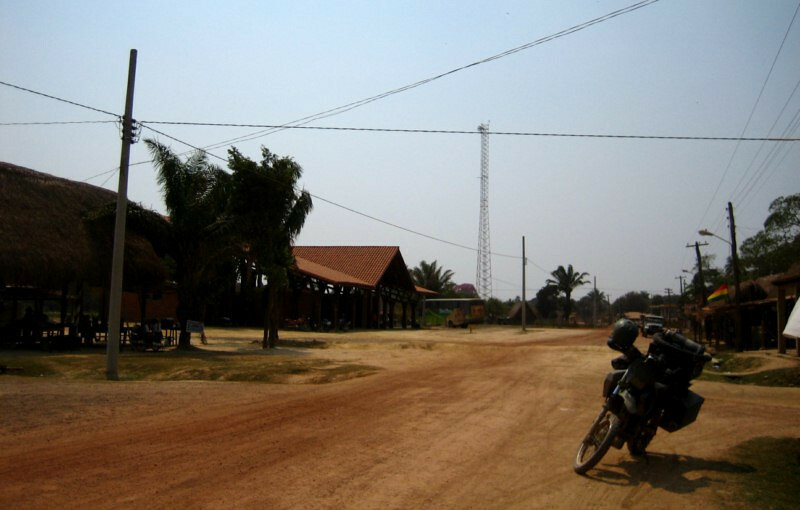 Customs for both countries is in the same building, but immigration is in different buildings. 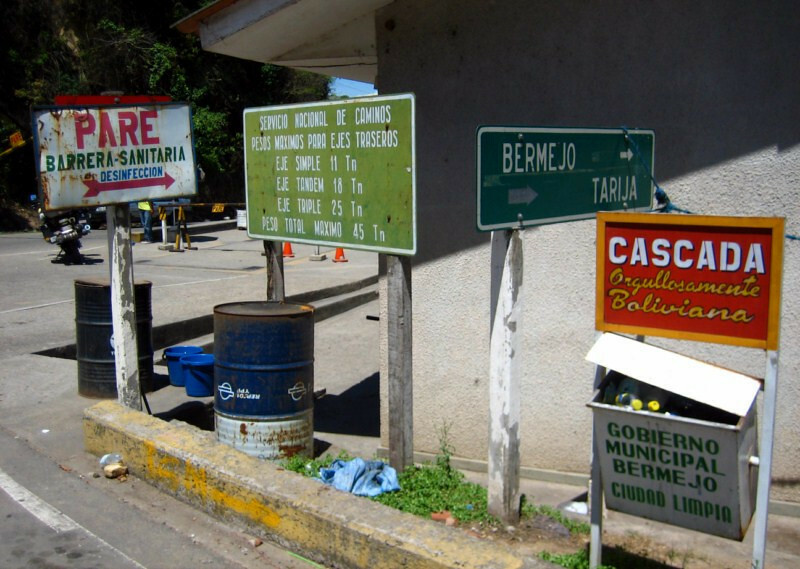 Rather than fast and hard rules for each country, it seems the requirements at a border match what both countries are asking for there. 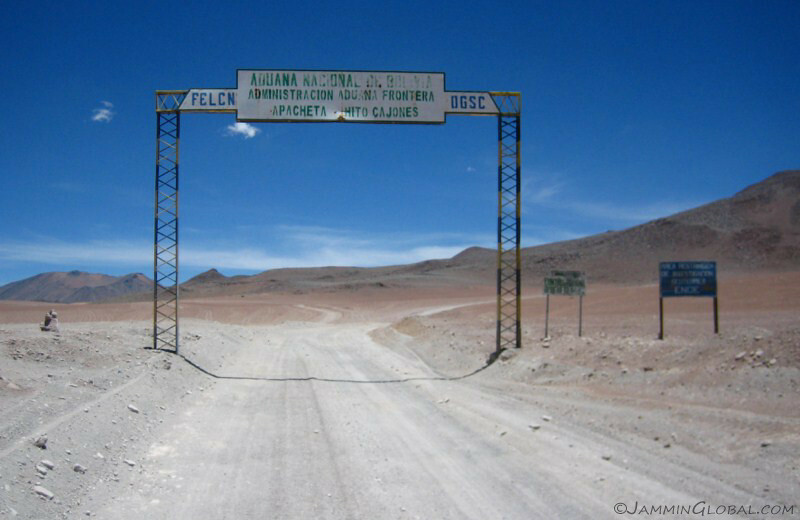 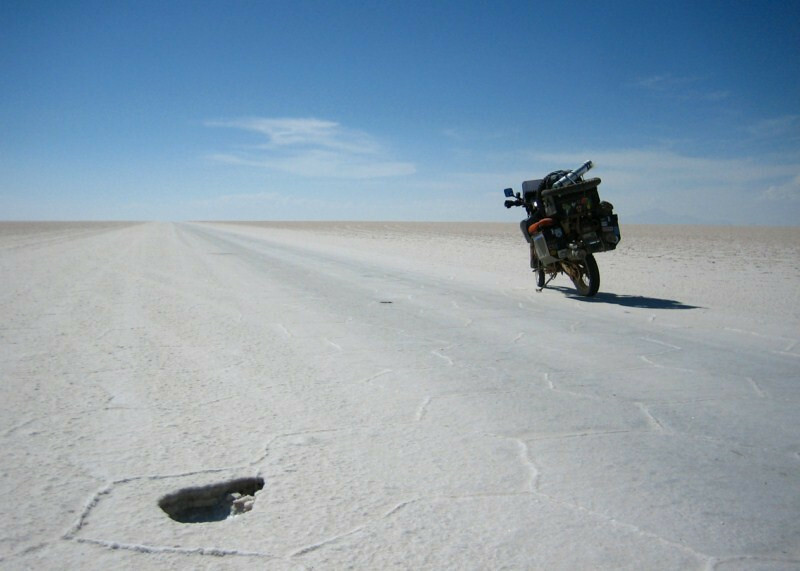 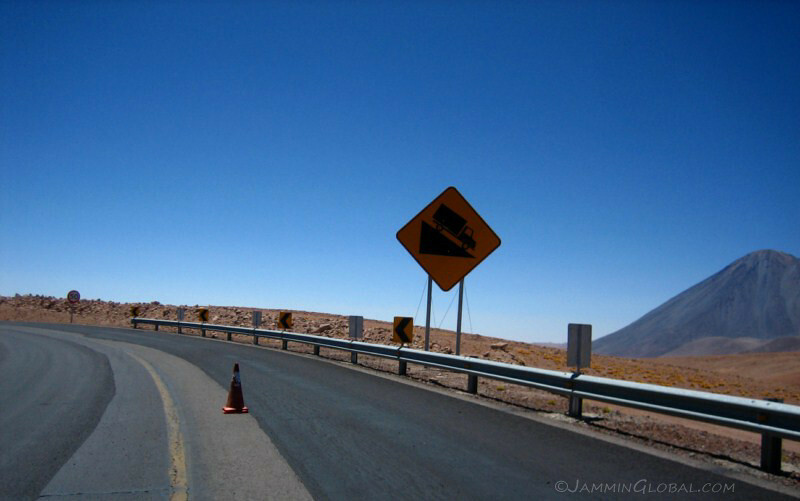 Argentina is now in the habit of asking to see some sort of international motorcycle insurance and therefore, Bolivia also asks to see it when you cross here. 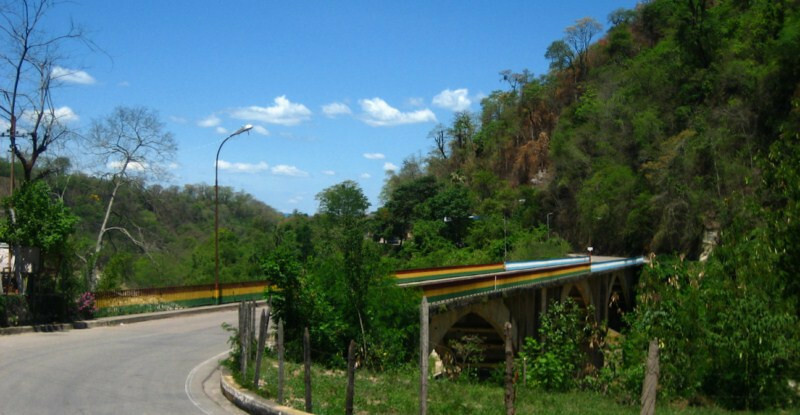 Cheerfully painted bridge across the border in each country’s flag colors. 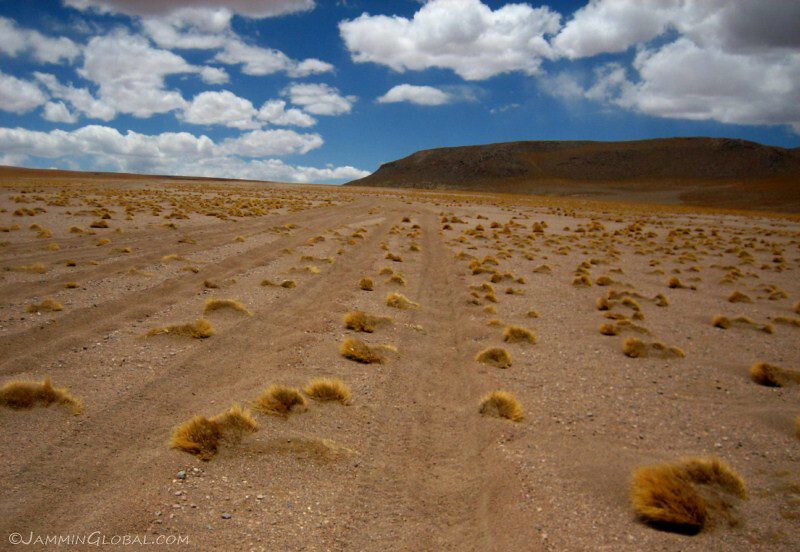 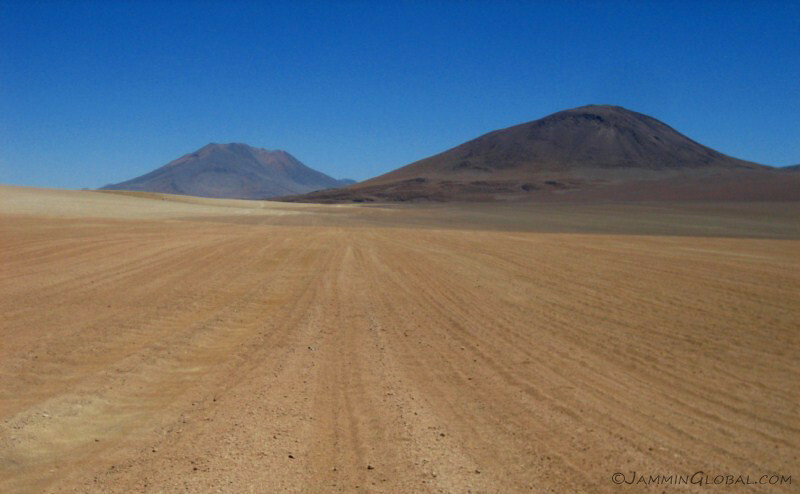 Bolivian immigration once you cross onto Bolivian soil. 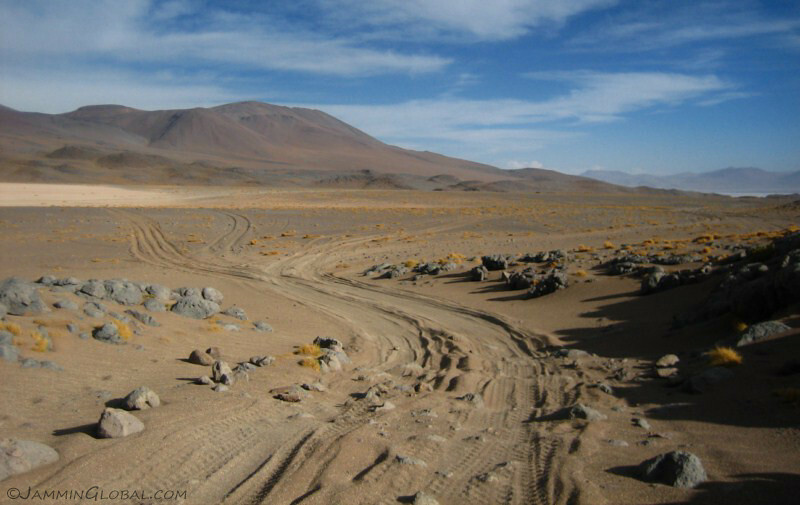 Being from a strange country to them, like India, always takes more time since they have to dig up the rules book and see what the agreement is between each country, regarding how many days you are allowed to stay. 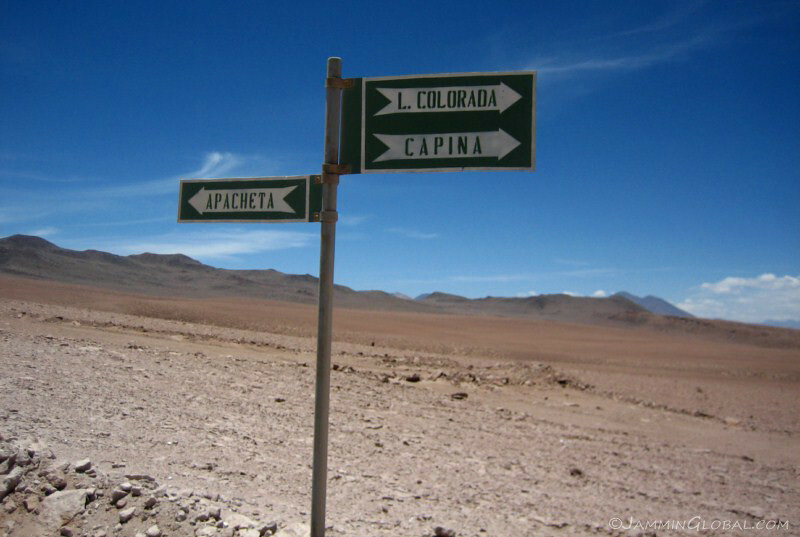 A mini sign-post forest, making it tricky to figure out which way to go. 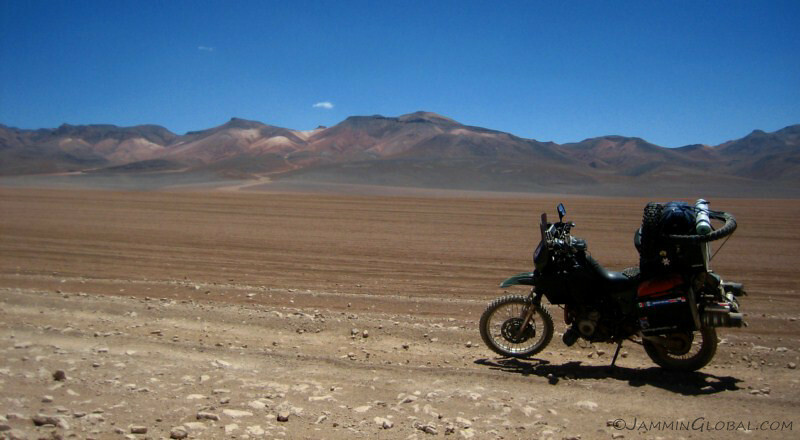 My route through southern Bolivia. 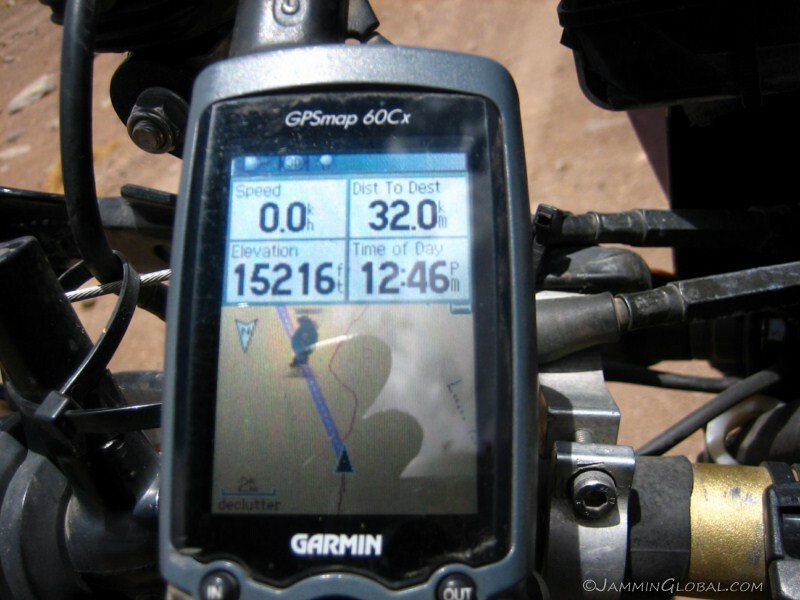 Click on it to go to the interactive version in Google Maps. 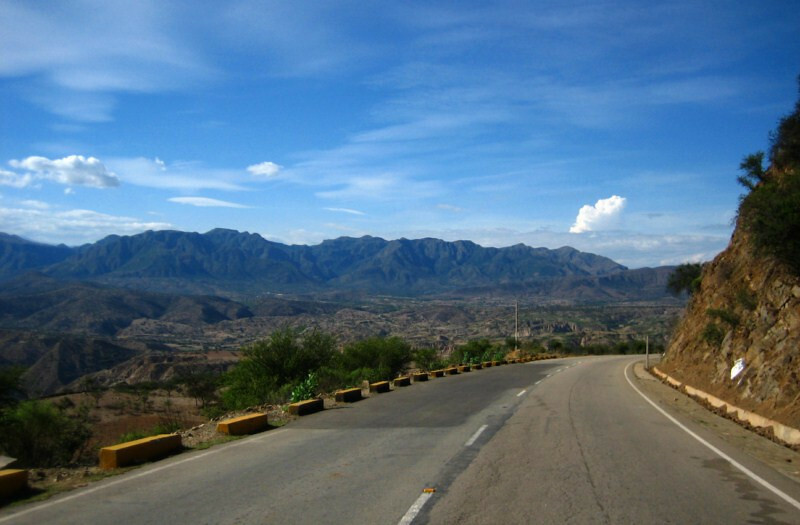 The border crossing took about an hour and I still had enough light to do the 190 kms (120 mi) to Tarija, the big city in the south, where I had a contact to stay with. 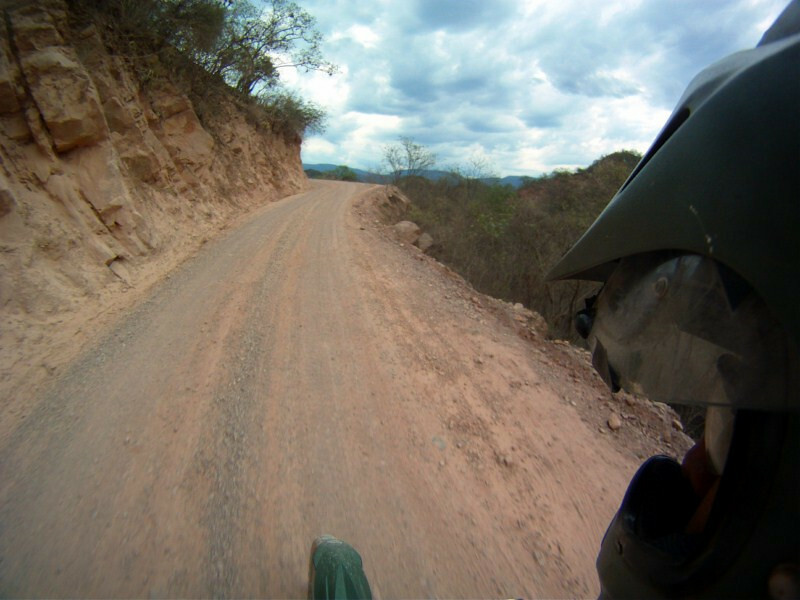 The paved road was very twisty and in excellent condition, making for a fun ride. 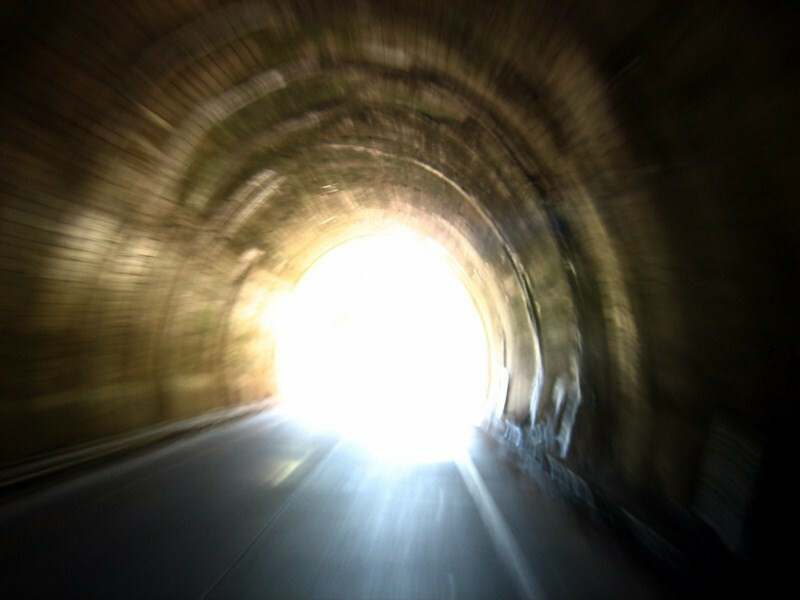 Tunnels – never stops to be a source of joy on a ride. 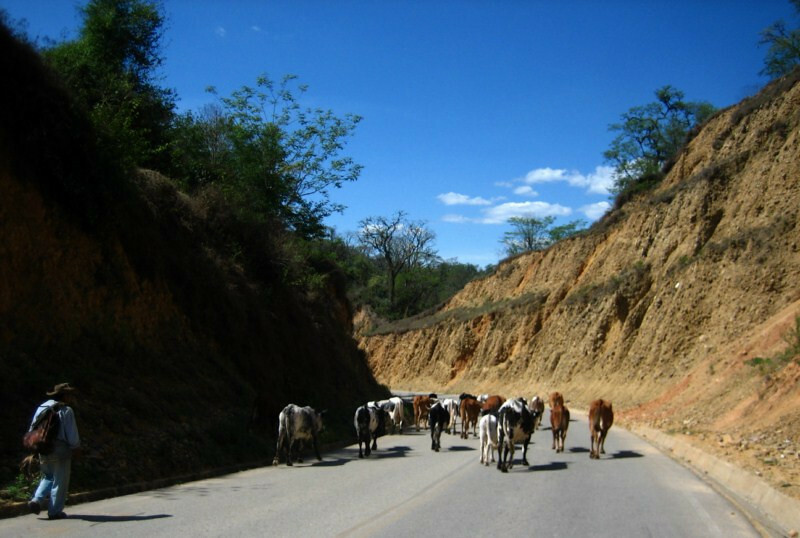 The road was quite empty, except for the occasional hoofed traffic as ranchers move their cattle from winter to summer grazing areas. 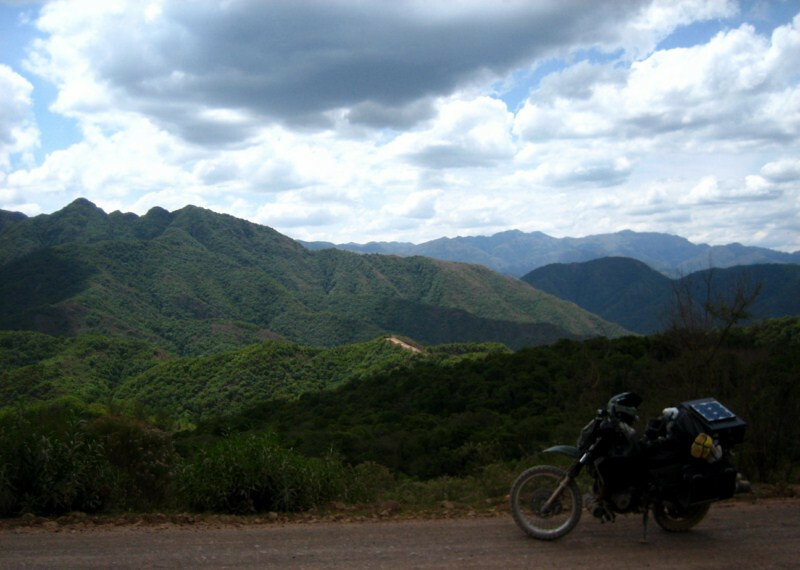 After the flat riding in Argentina earlier in the day, this was a welcome sight; carpets of green covered mountains with a twisting road up its side. 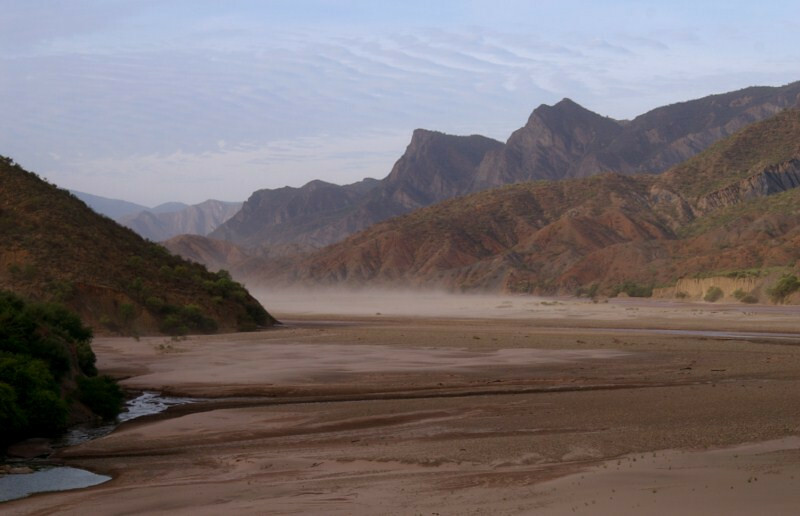 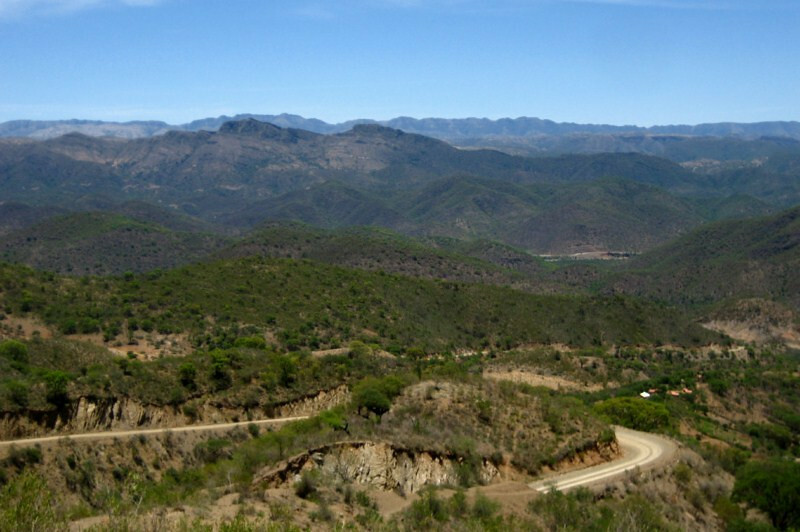 As I got near Tarija, the vegetation dried up, but the elevation kept up, making this an ideal wine-growing region. 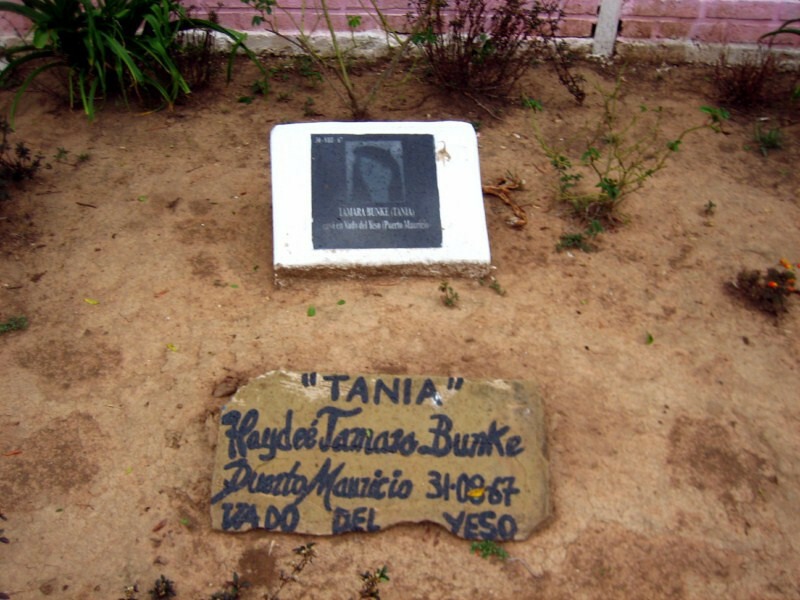 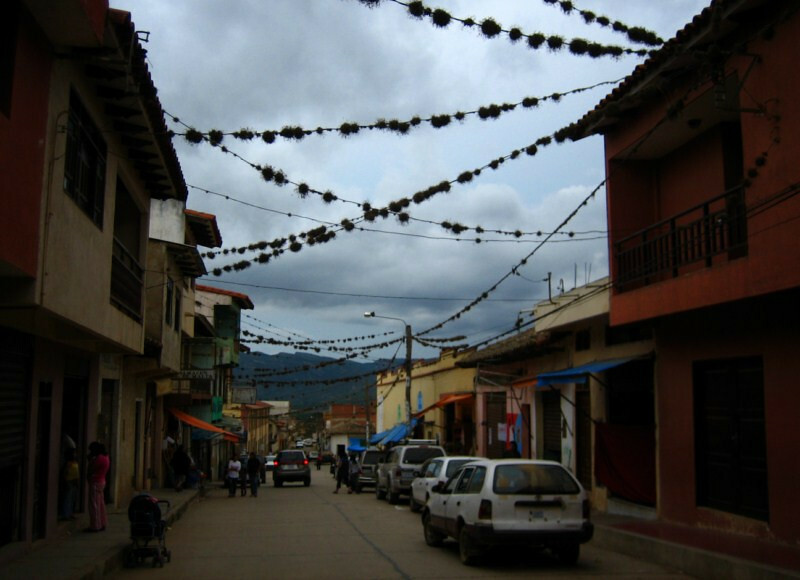 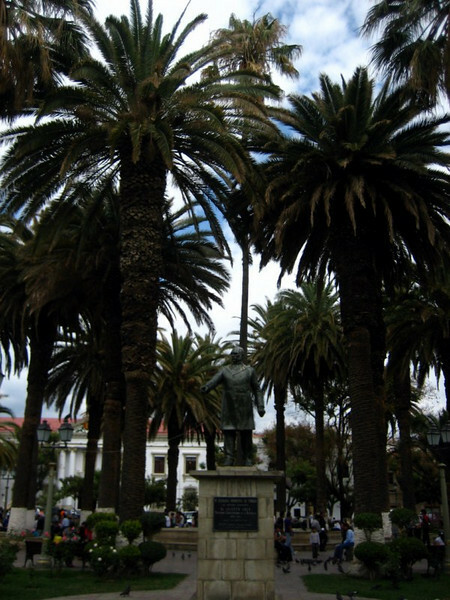 Tarija has almost a Mediterranean feel to it with date palms covering the central plaza. 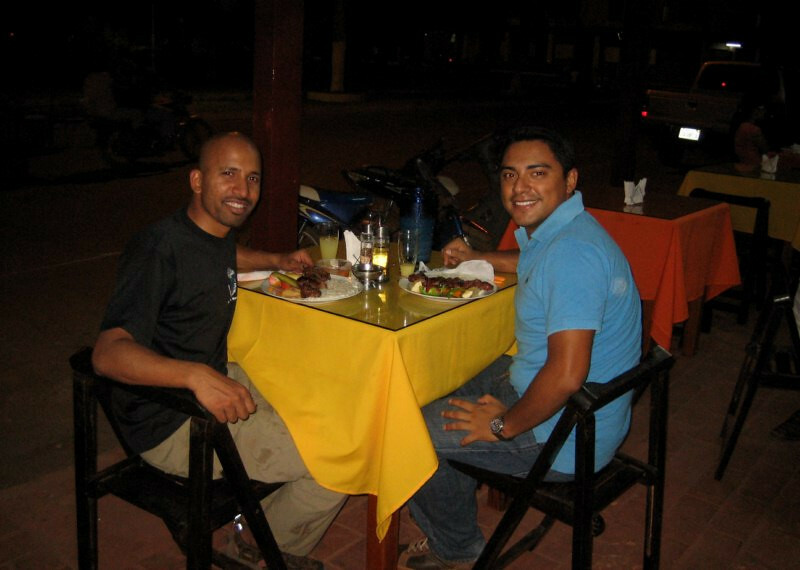 I took out some local currency and met up with Patricia, a cousin of Alfonso, my friend in La Paz. 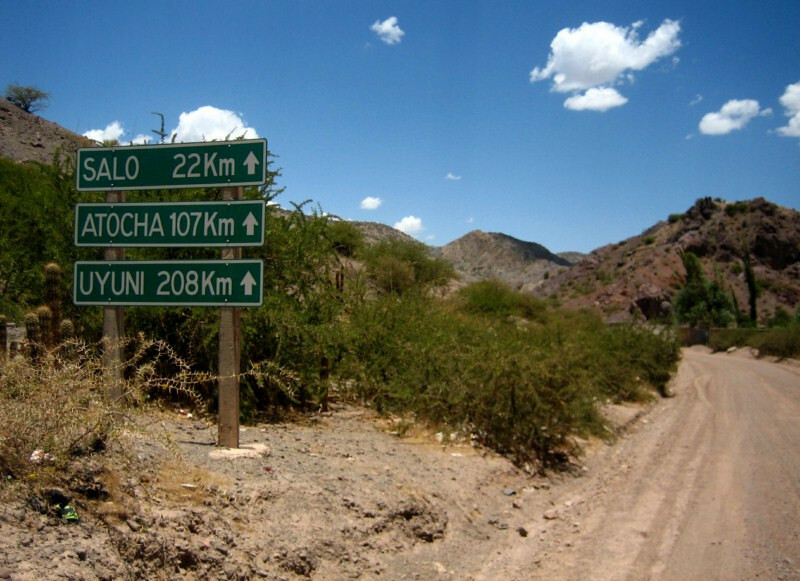 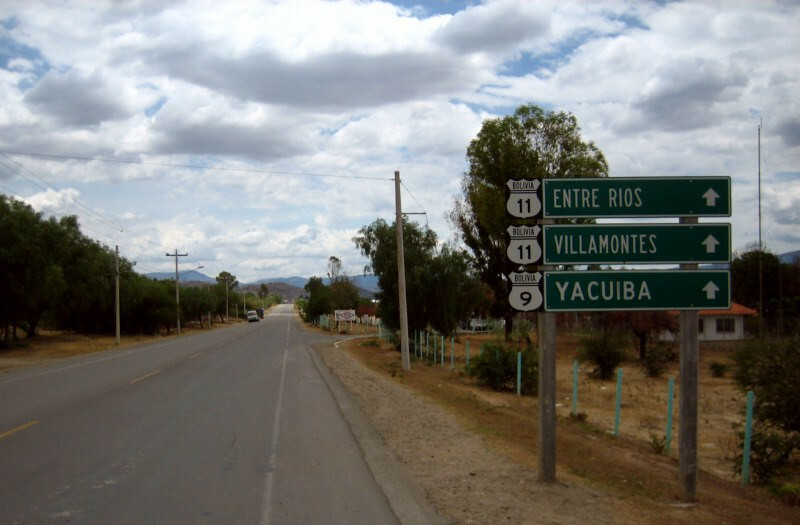 The next day, I headed east on the scenic Ruta 11 to Villamontes, 250 kms (155 mi) away. 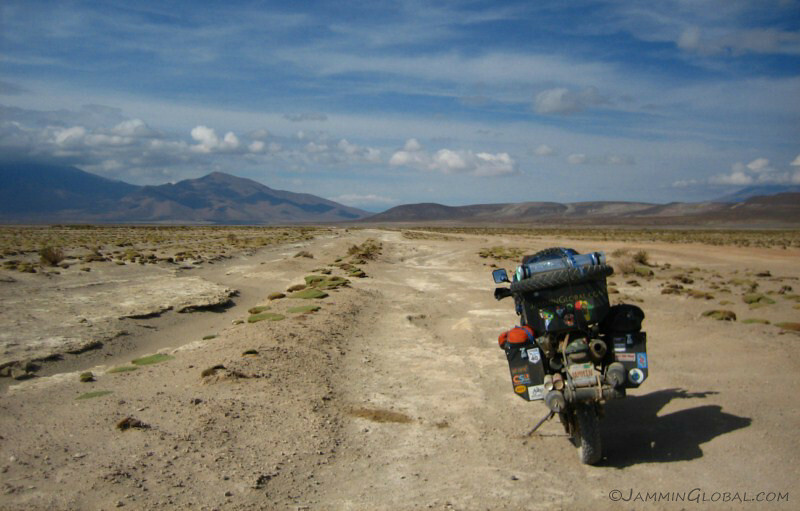 The route was paved initially and I took in the dry landscape. 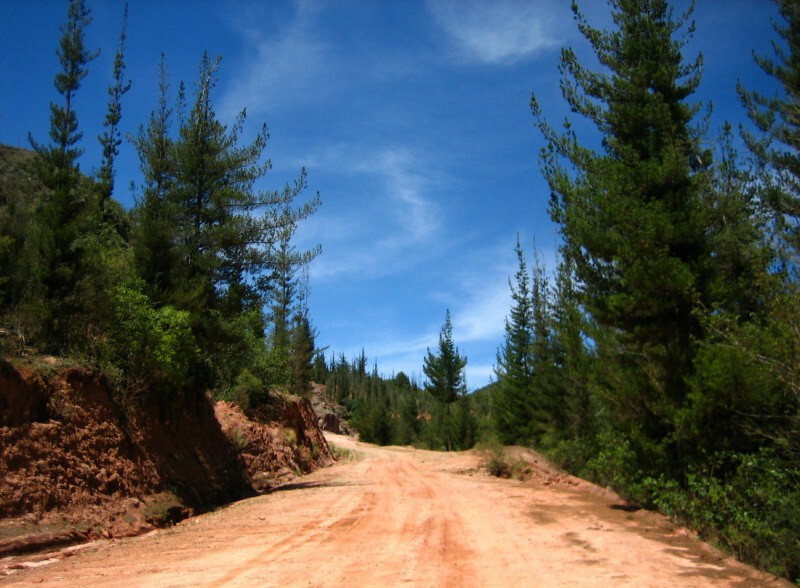 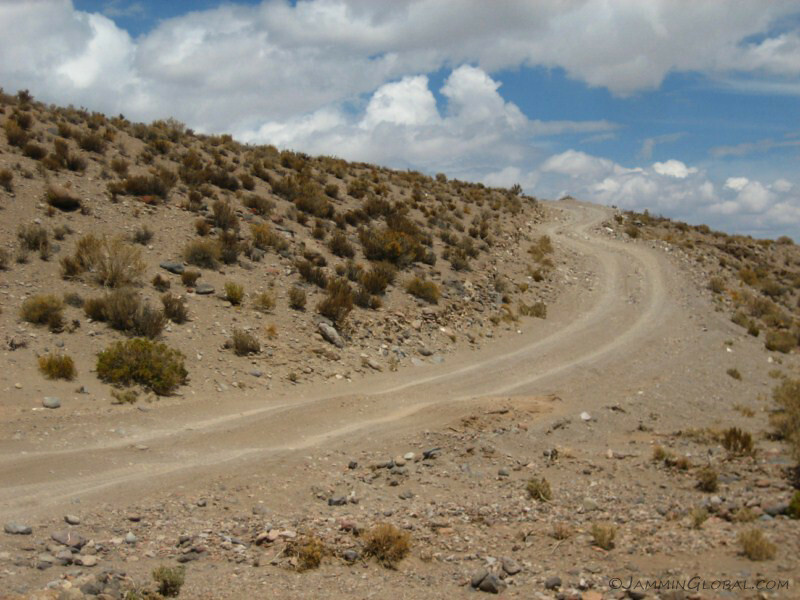 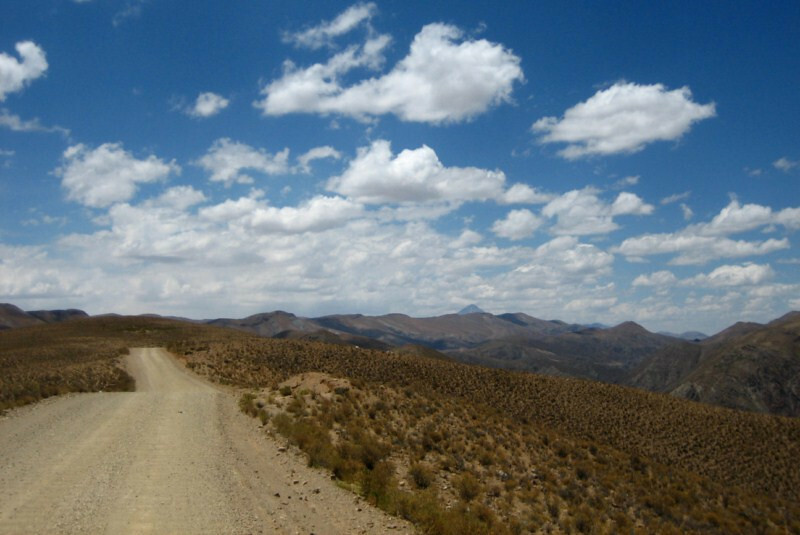 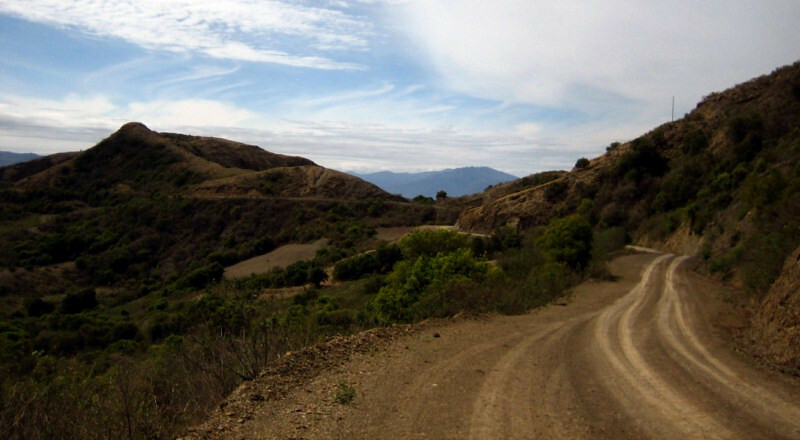 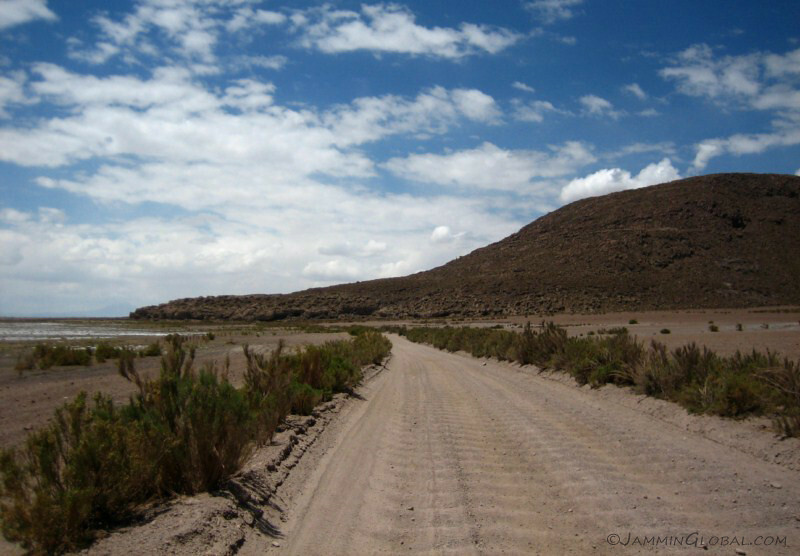 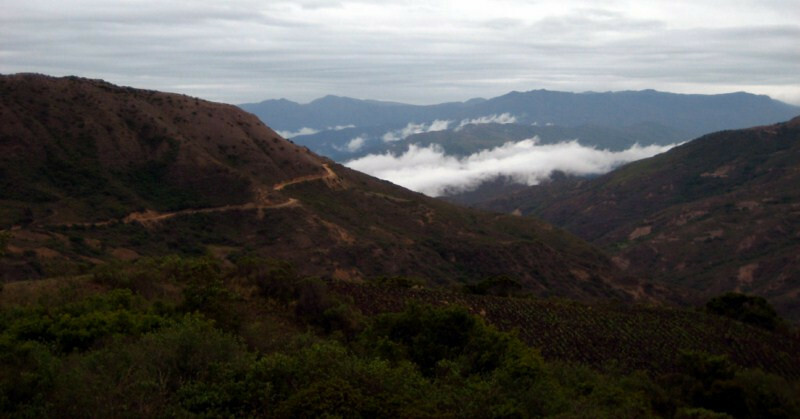 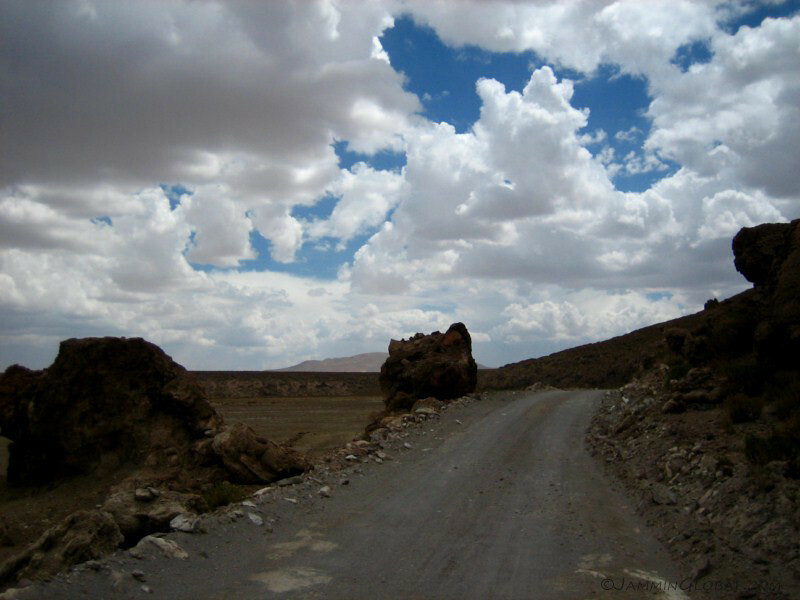 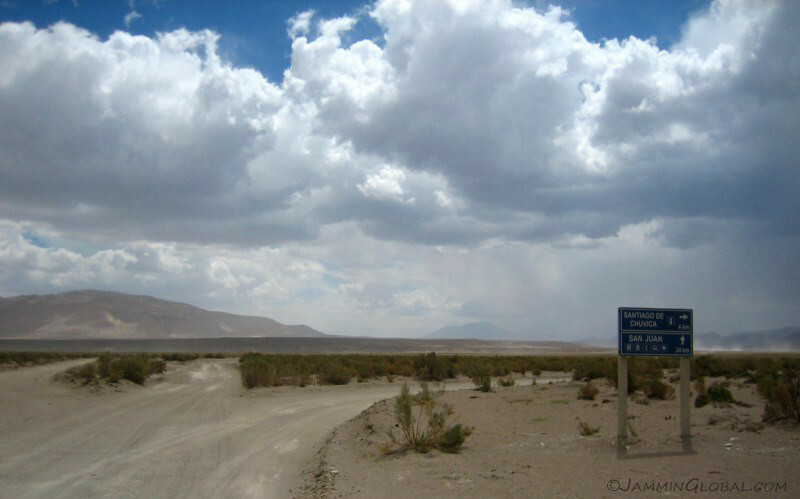 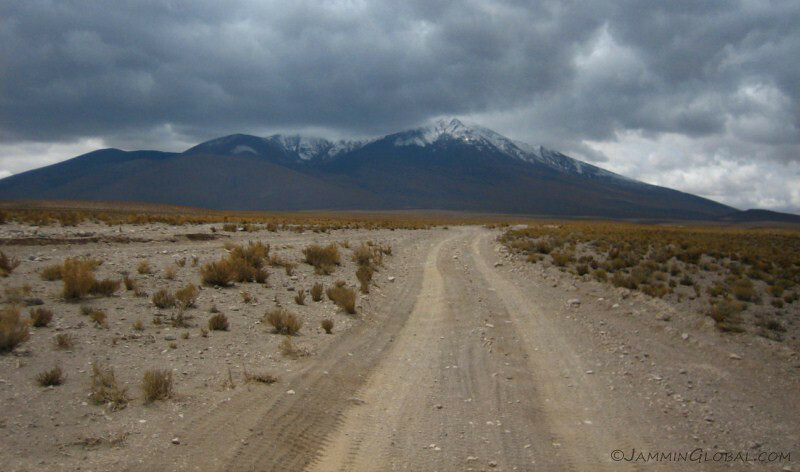 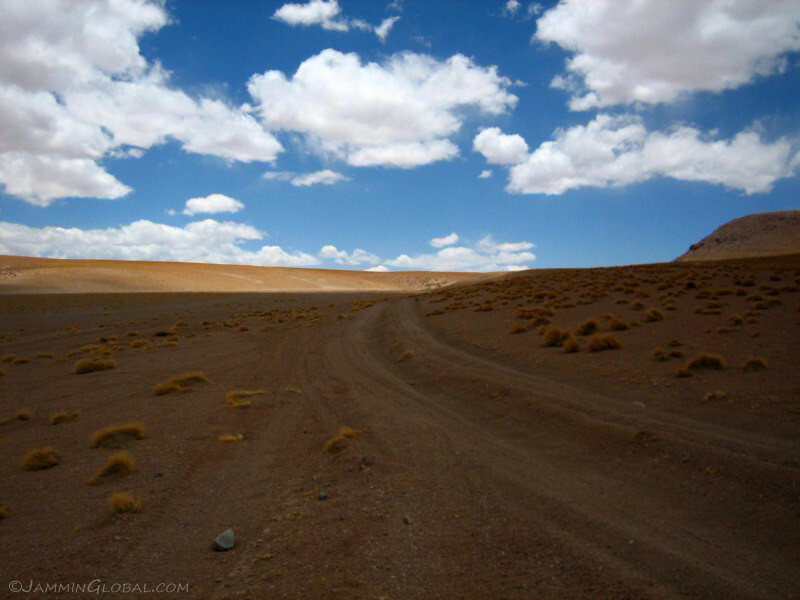 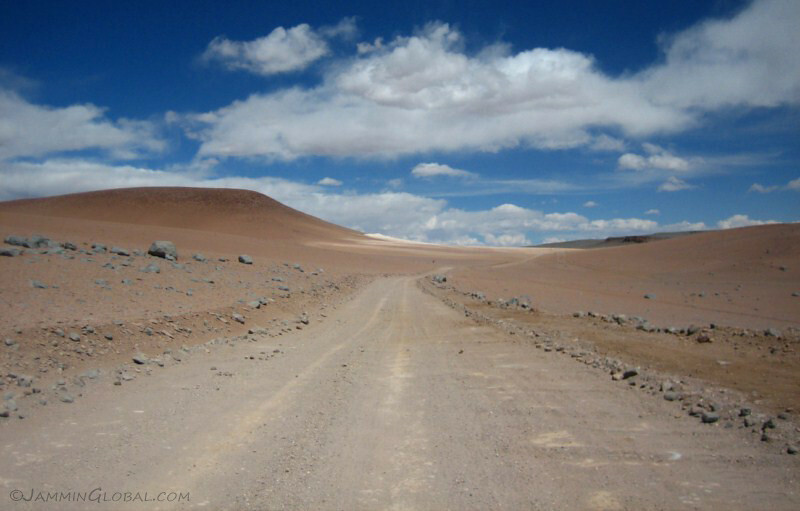 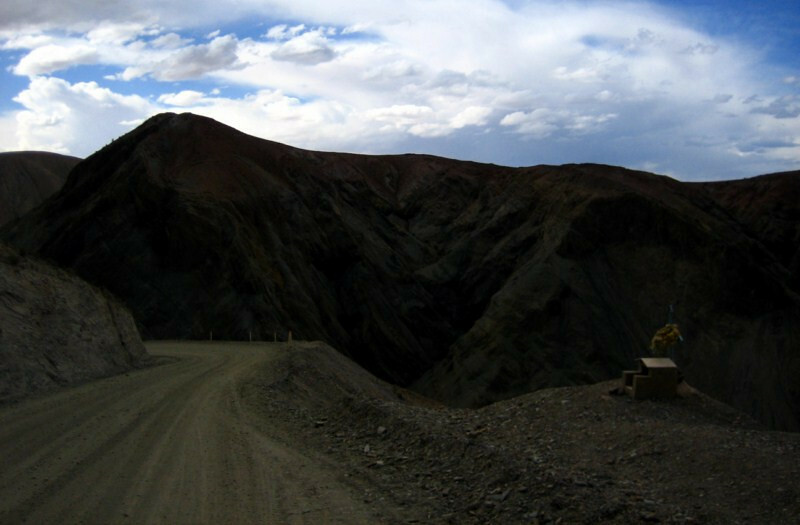 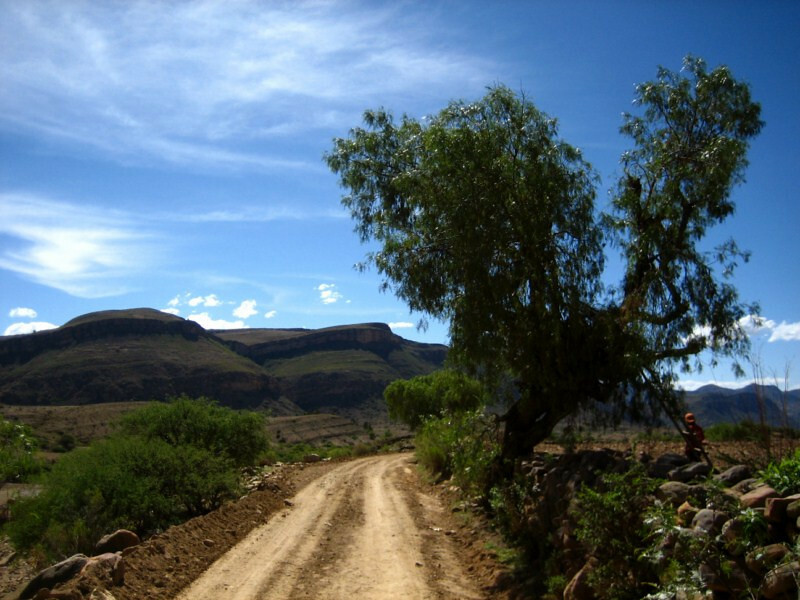 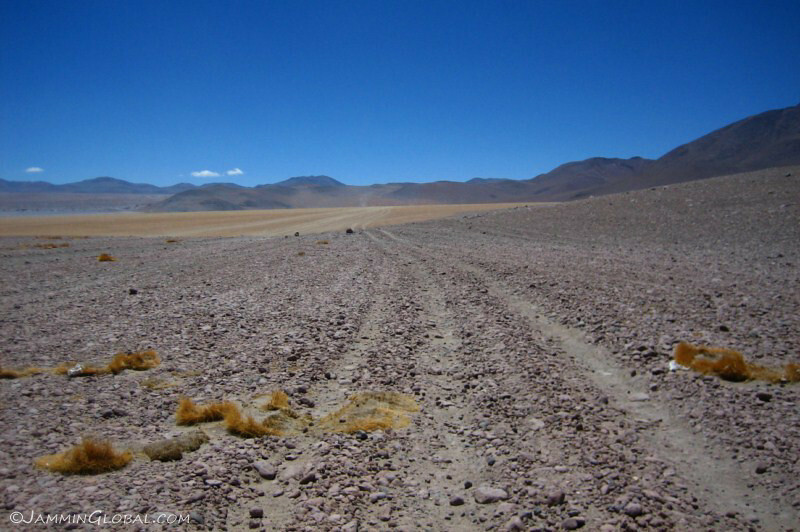 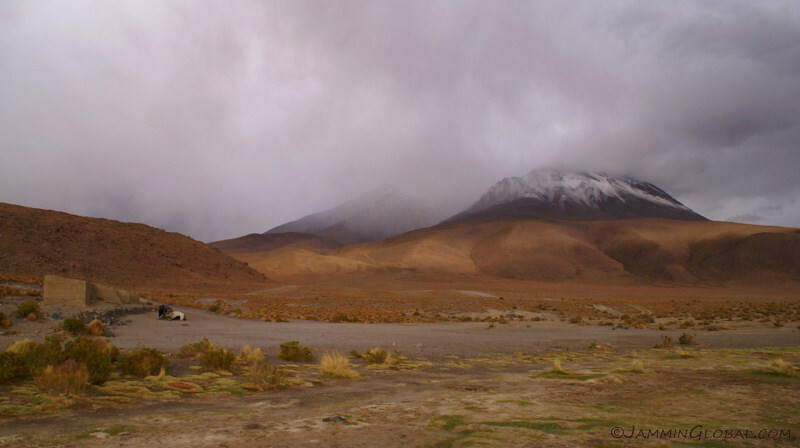 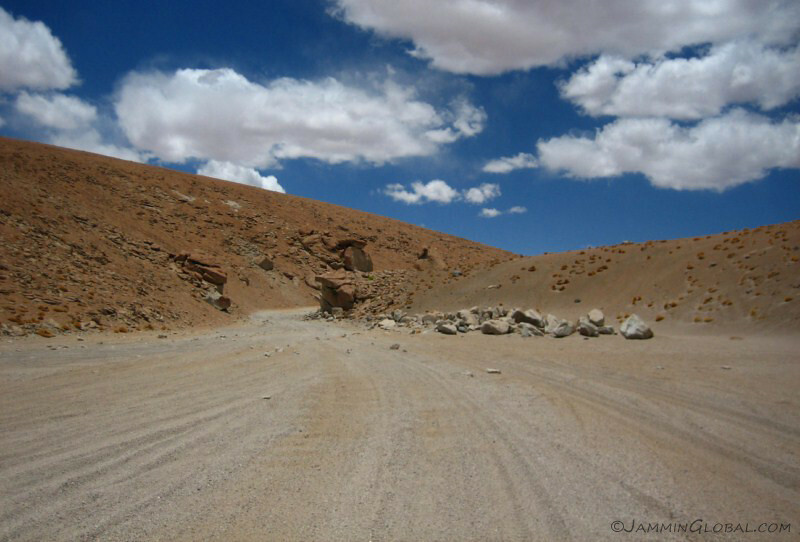 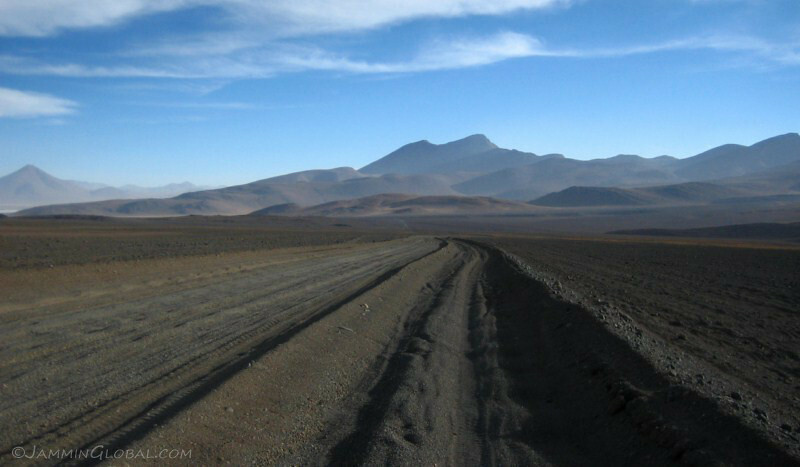 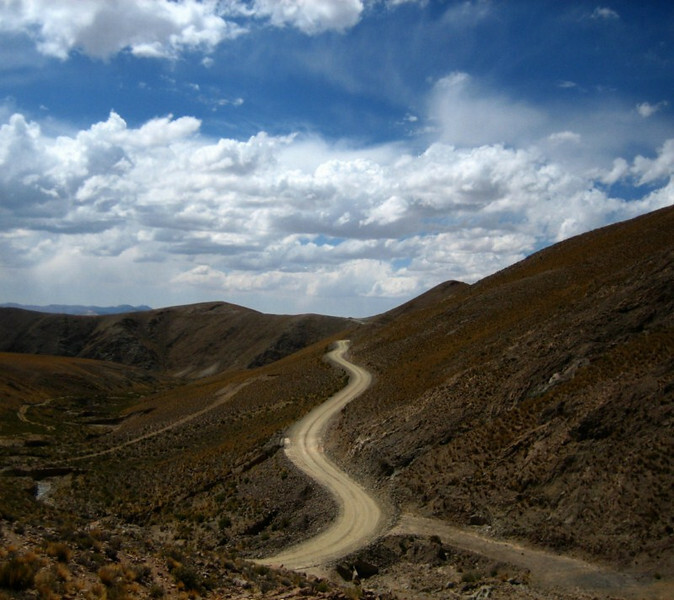 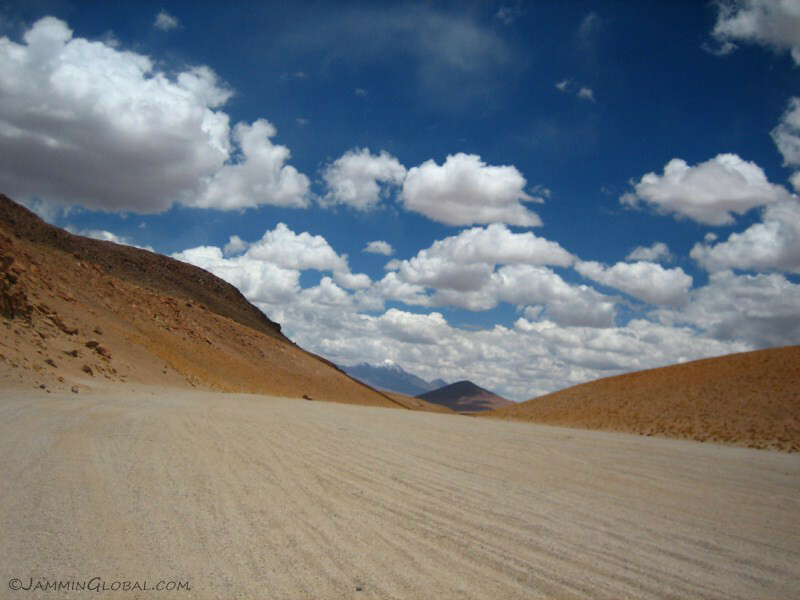 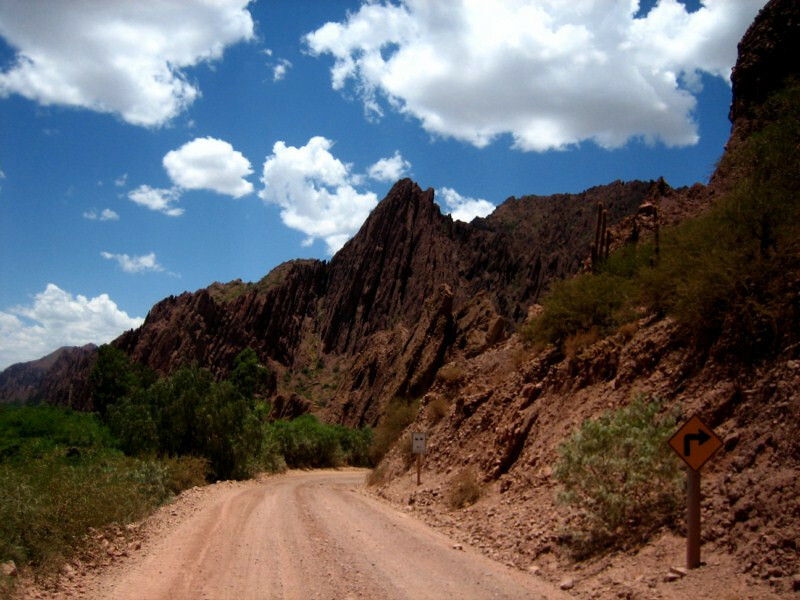 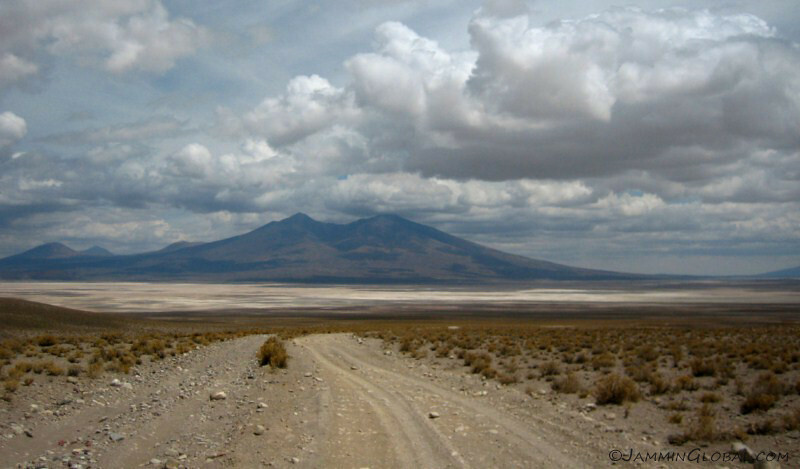 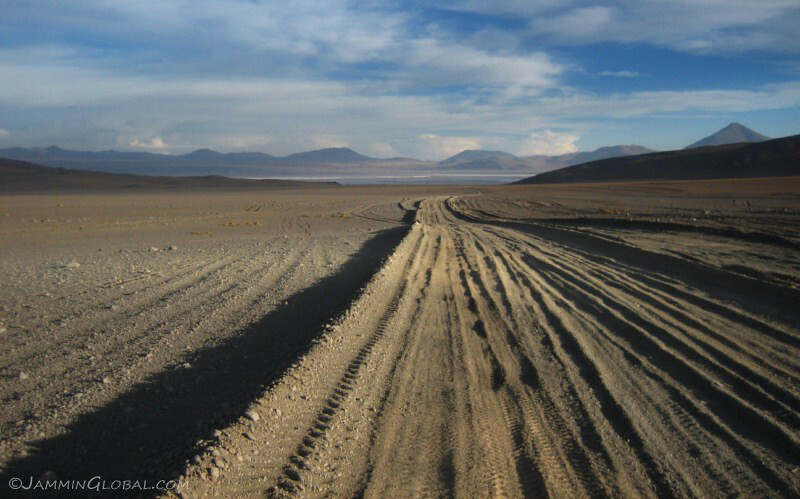 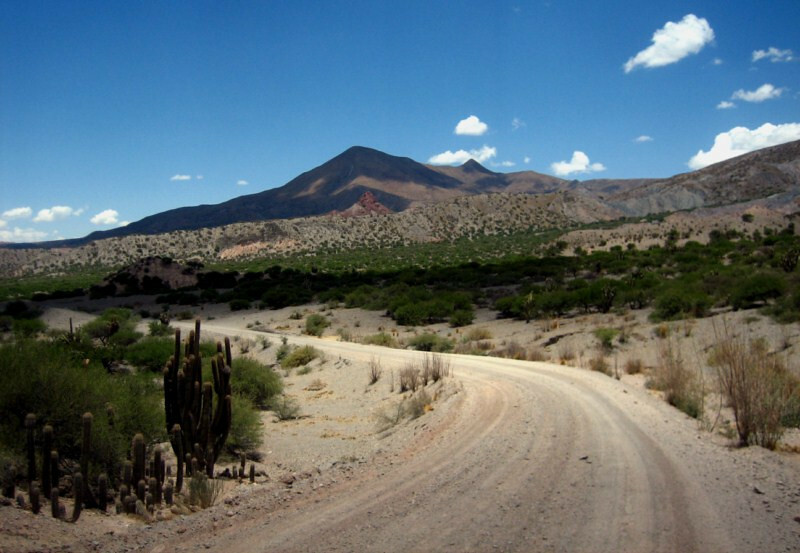 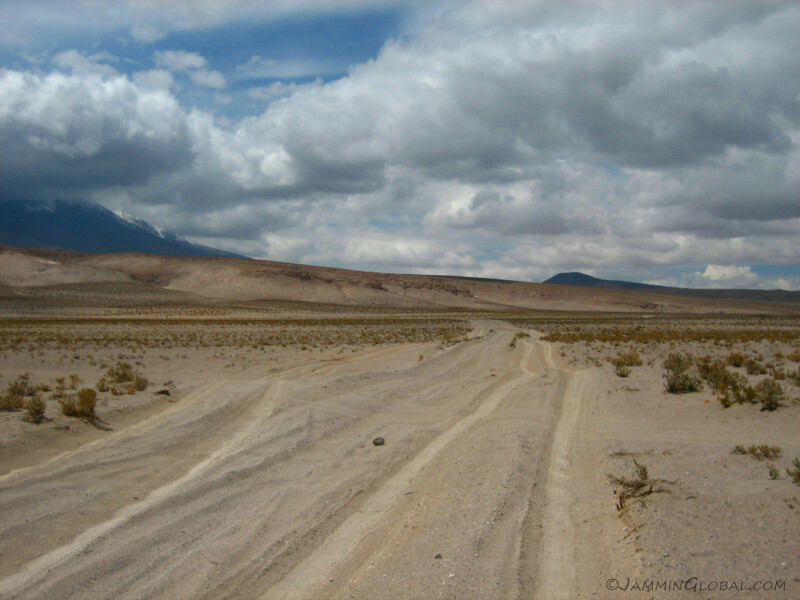 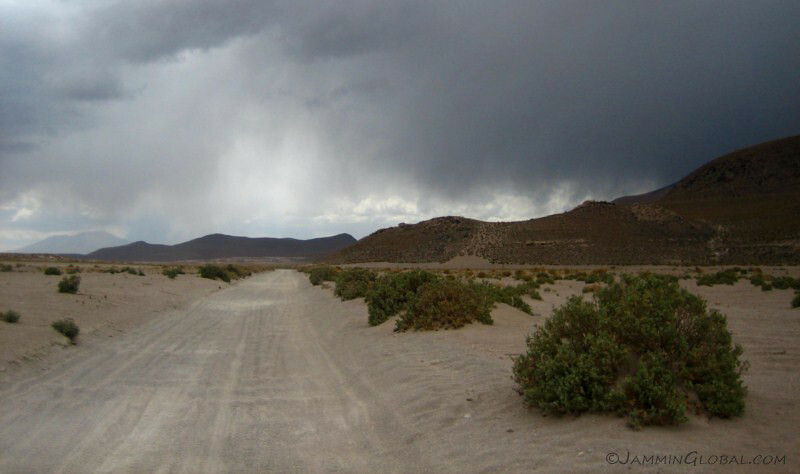 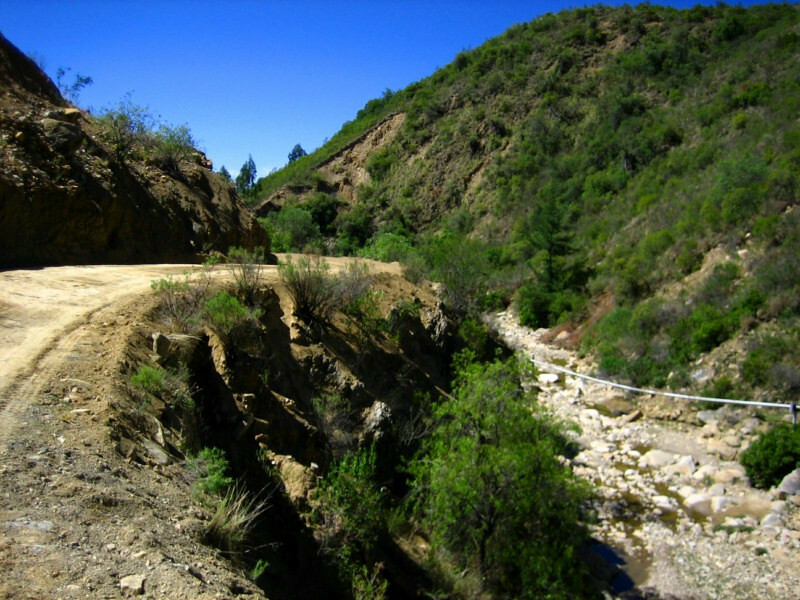 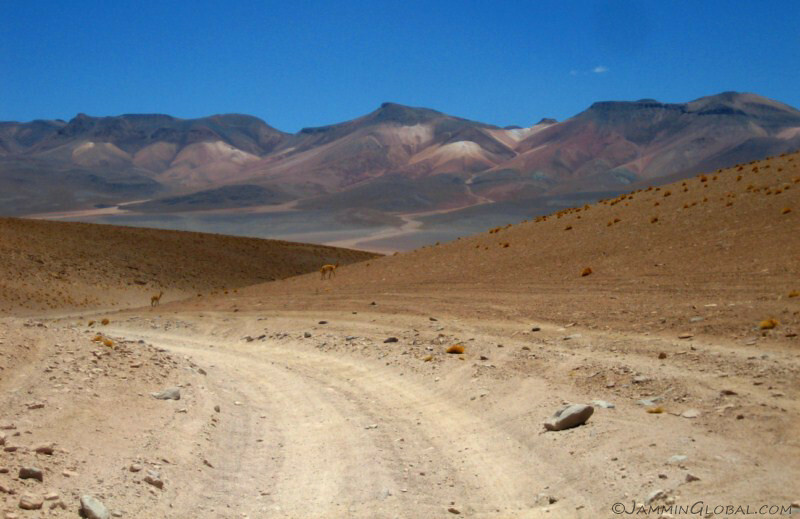 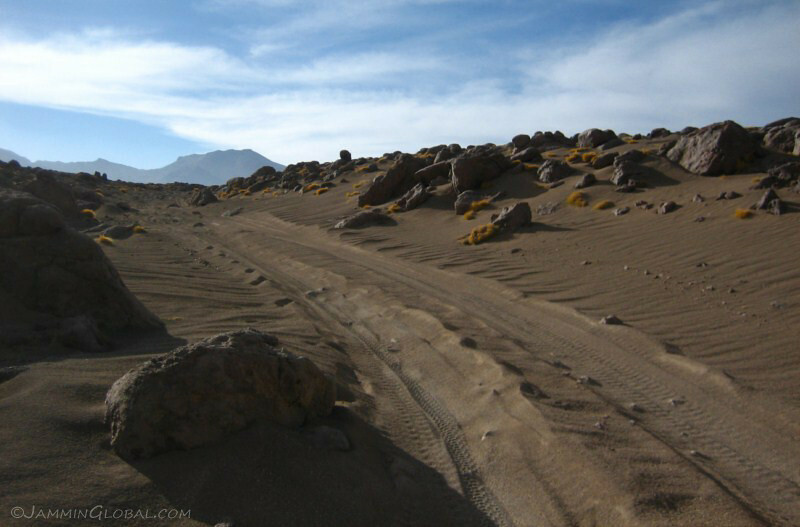 It soon turned into a small dirt road as it wound its way down the eastern flanks of the Andes. 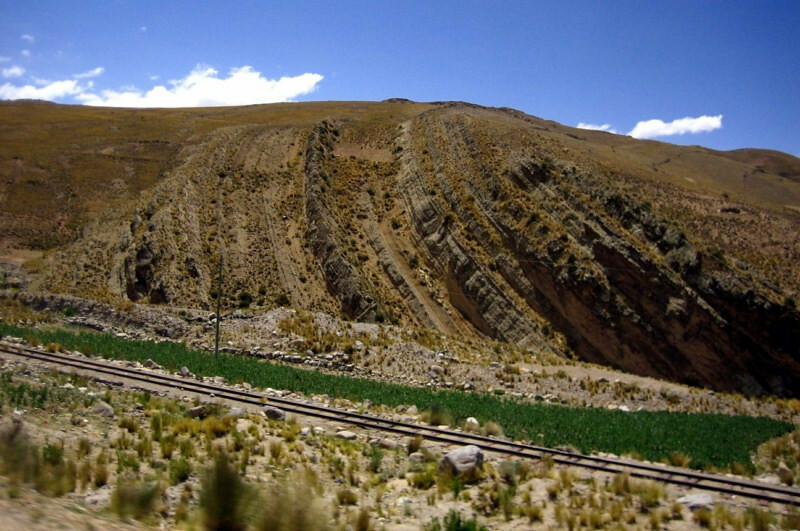 Stone-fenced pens on the dry hillsides. 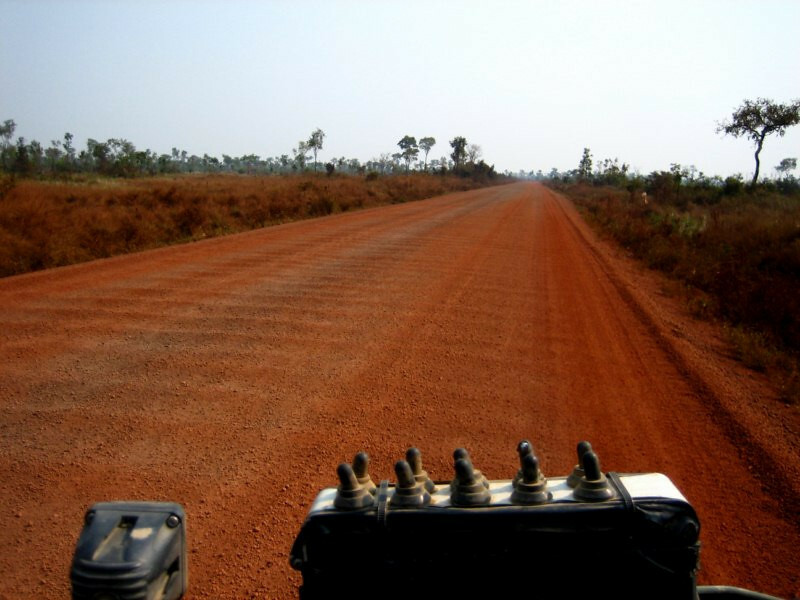 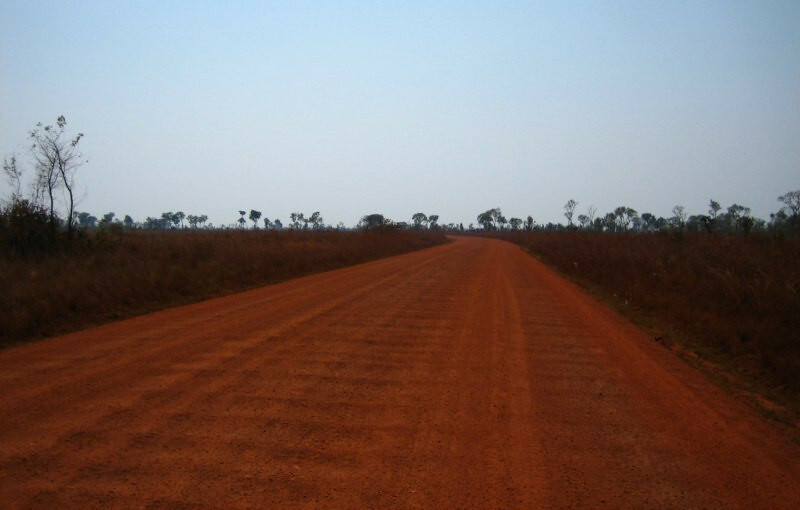 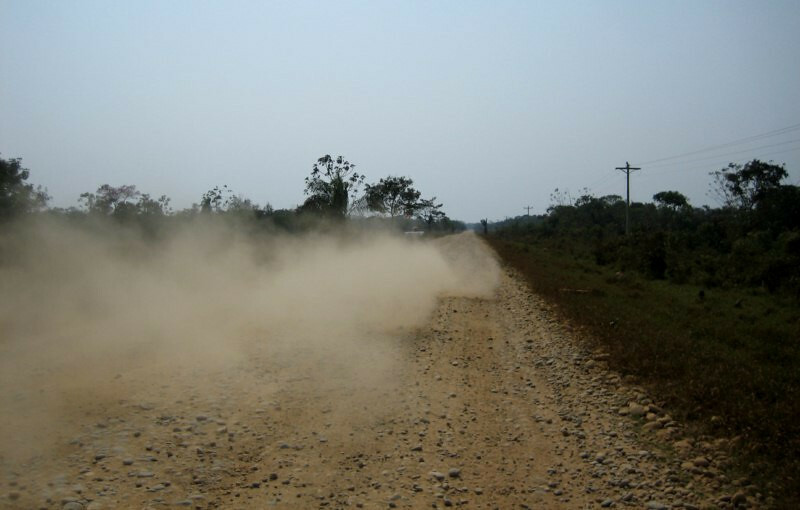 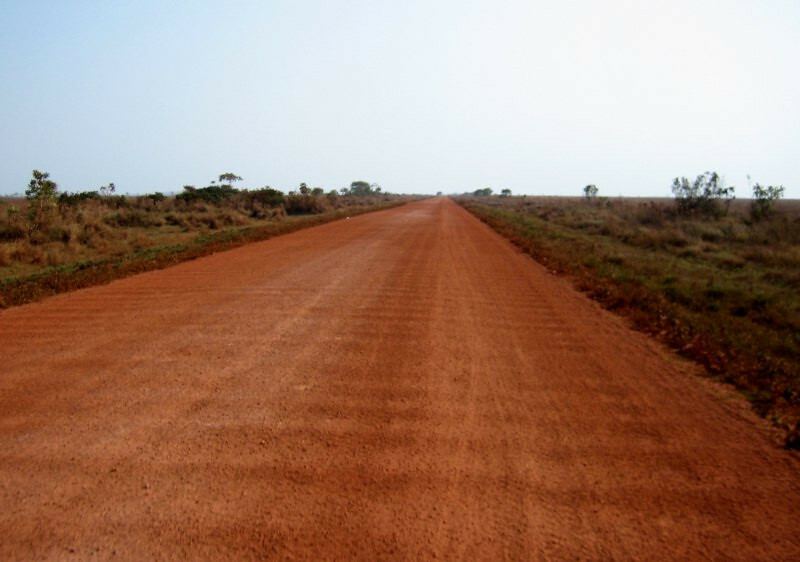 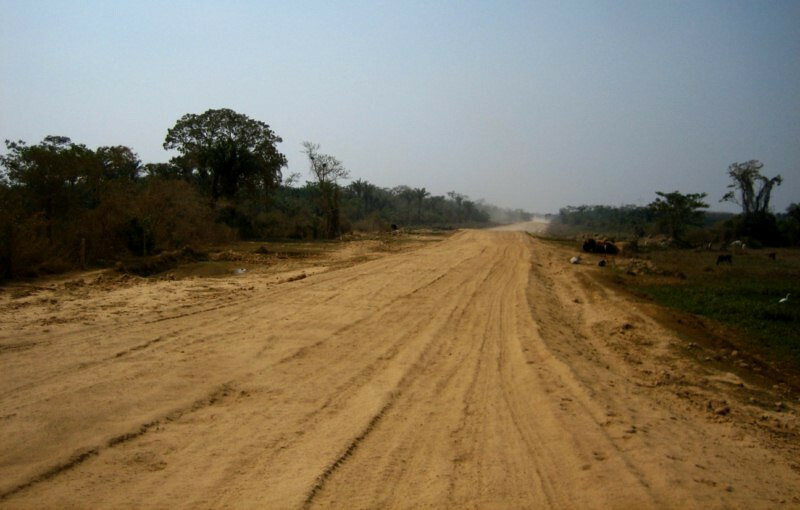 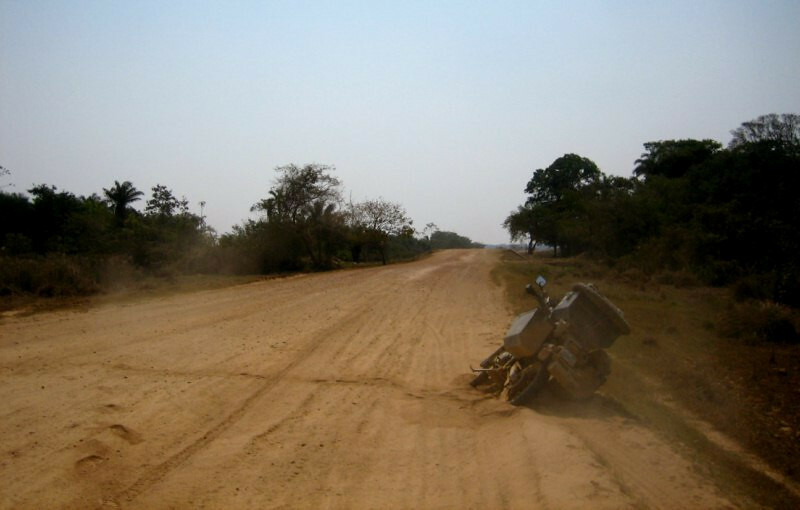 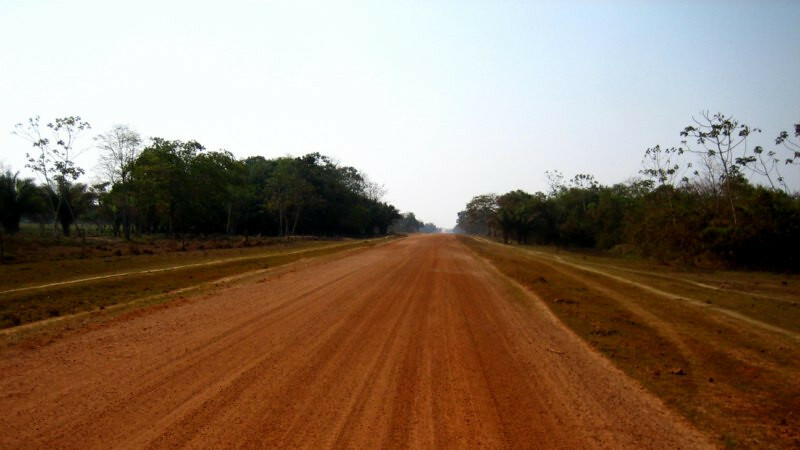 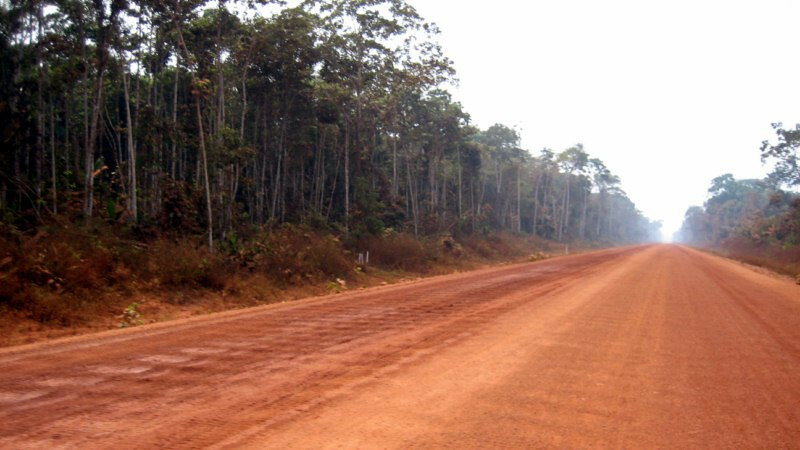 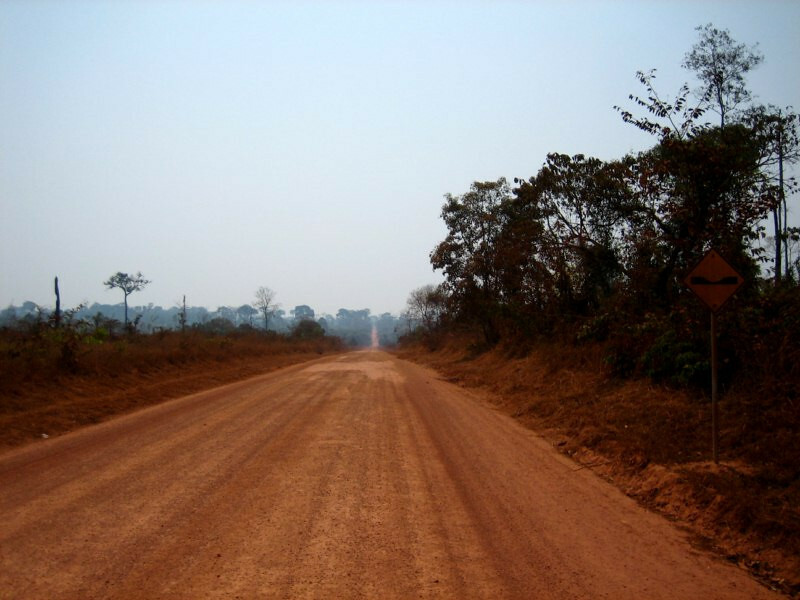 The road was in good condition, being hard-packed gravel with a fine layer of sand on top. 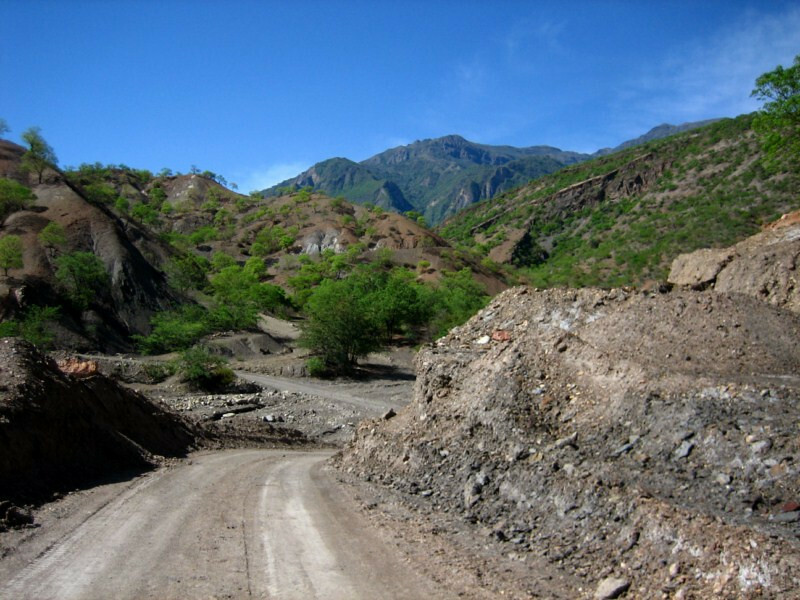 They were paving sections of it in the middle, where the route was accessible to large machines. 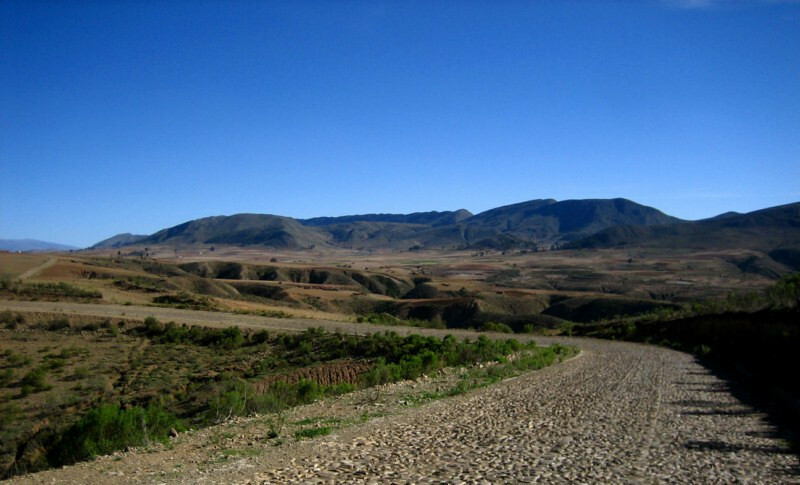 But large parts of it winded tightly along the contours of the hills. 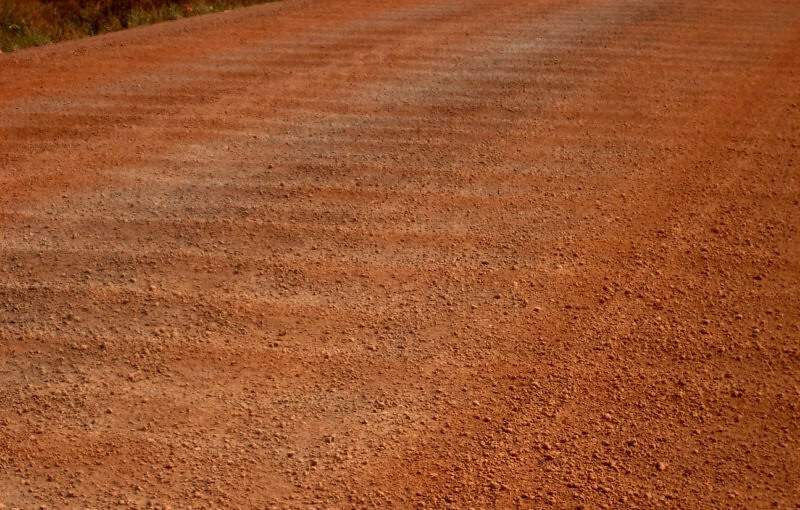 sanDRina’s paint scheme blending in nicely with the natural colors. 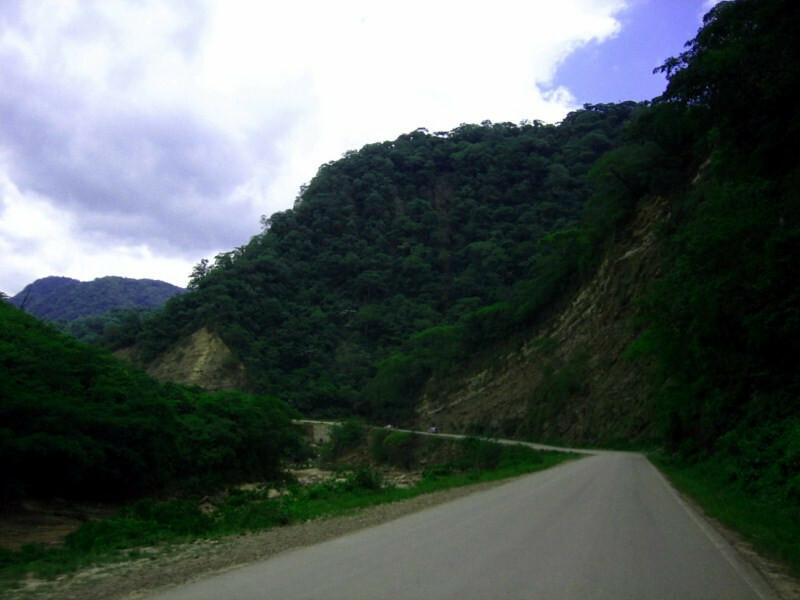 The route was especially enjoyable when it went through tight canyons where the steep sides and tall trees made you feel small. 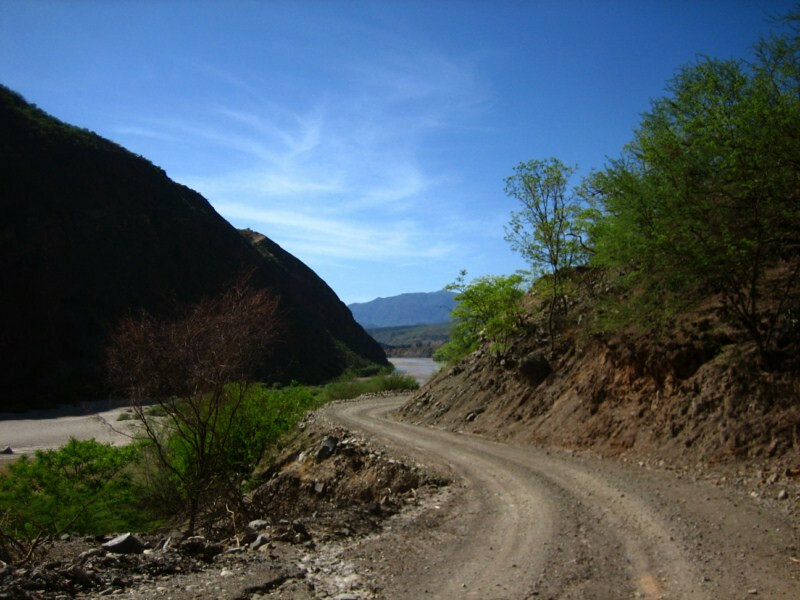 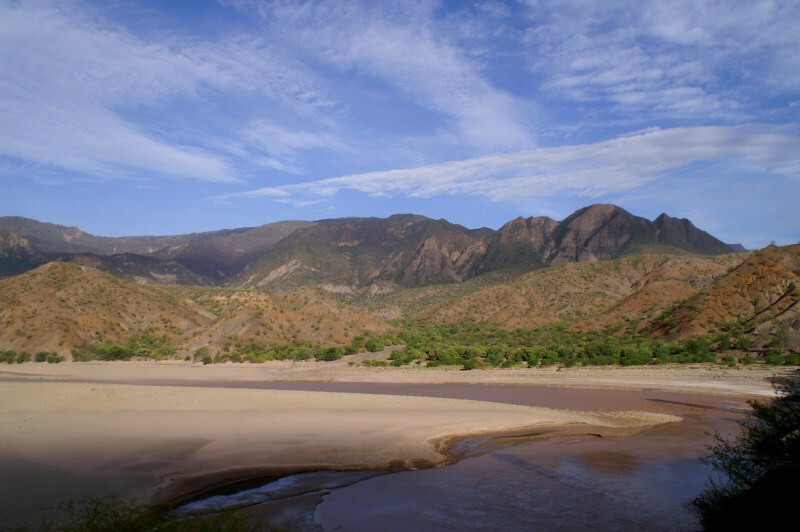 The route opening up near Entre Rios as it passed along the carved cliffs of this dried river bed. 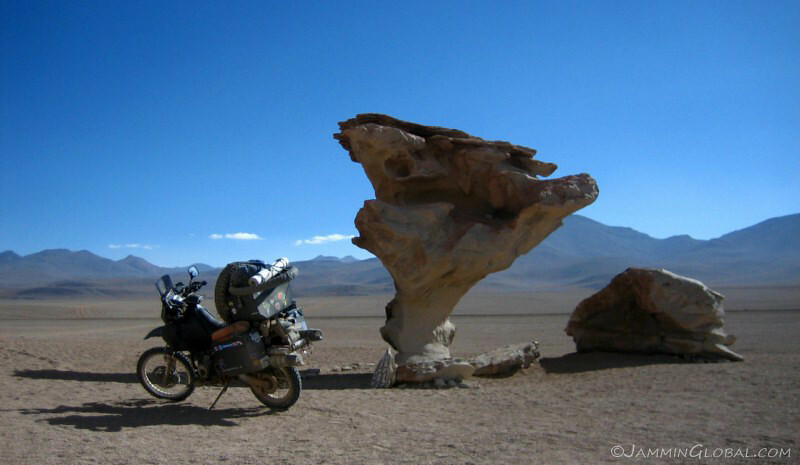 Now, that’s what you call a hole-in-the-wall kinda place. 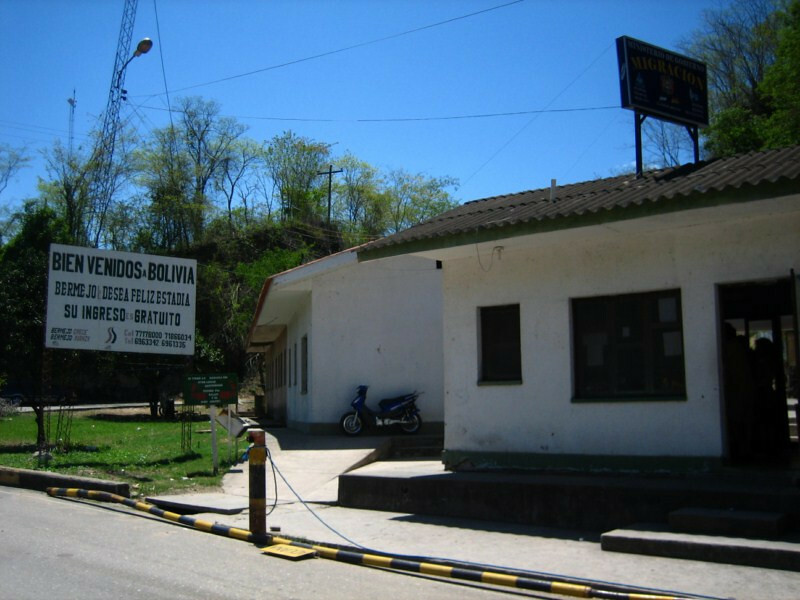 I didn’t want to stop in the busy square of Entre Rios for lunch, to be surrounded by onlookers, so I scoured the surrounding streets and found this open door with a table and chair ready for patrons. 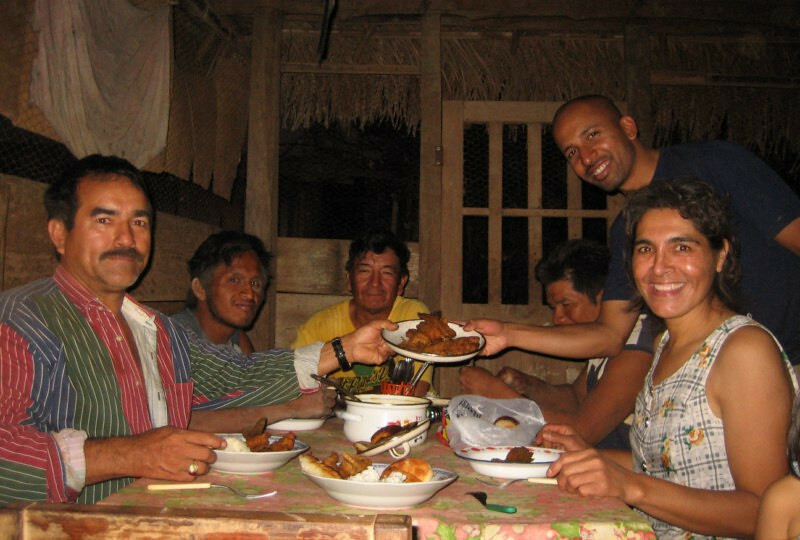 It was a restaurant, but felt more like eating in the owner’s house, especially with the lack of other patrons. 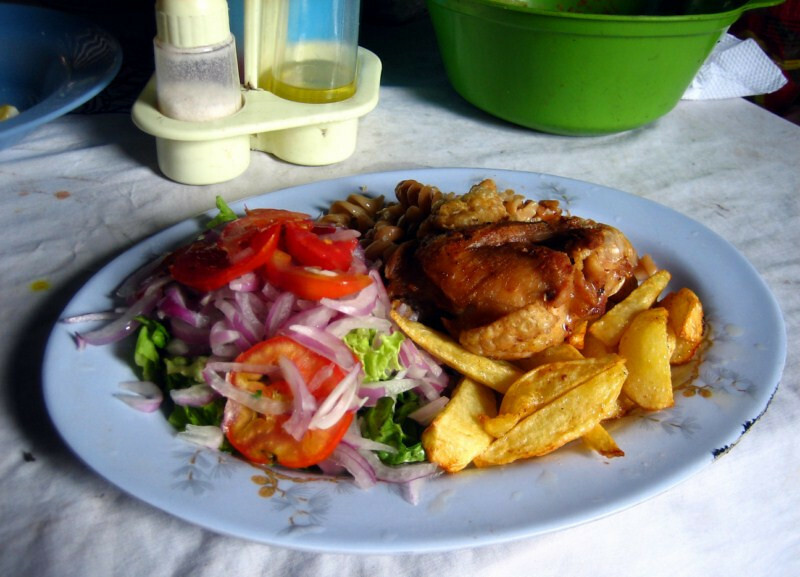 With the secundo (second course, main course) being some friend chicken with pasta, fries and some salad. 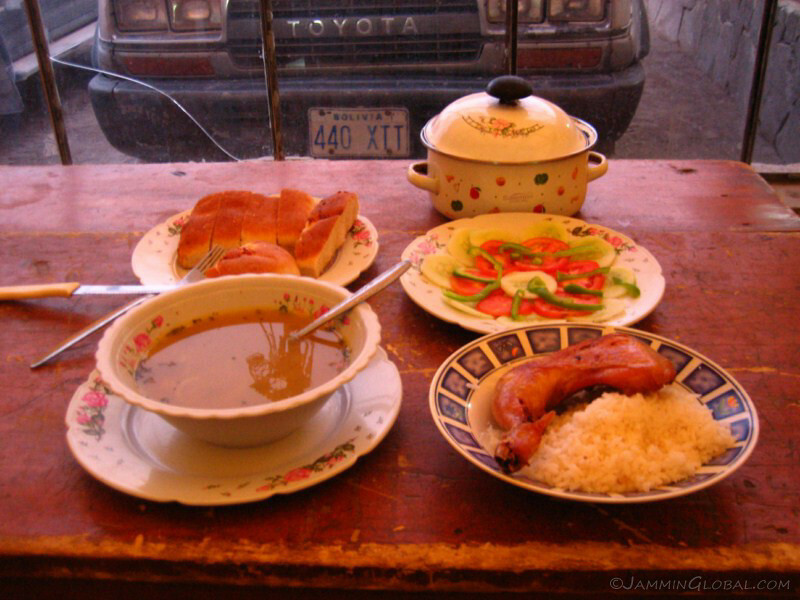 All for 10 Bolivianos (US$1.45). 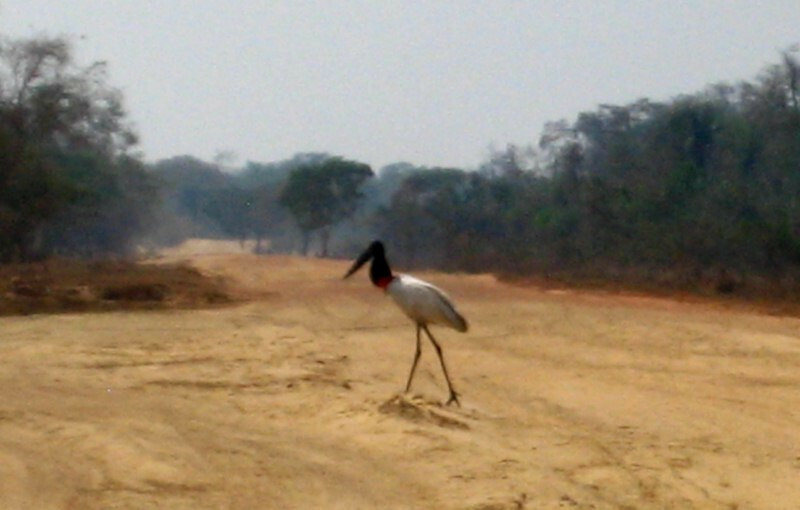 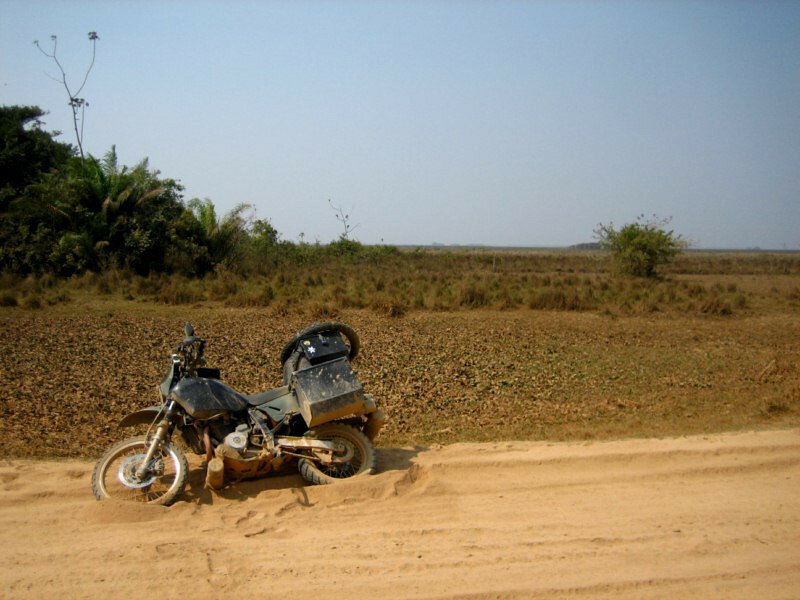 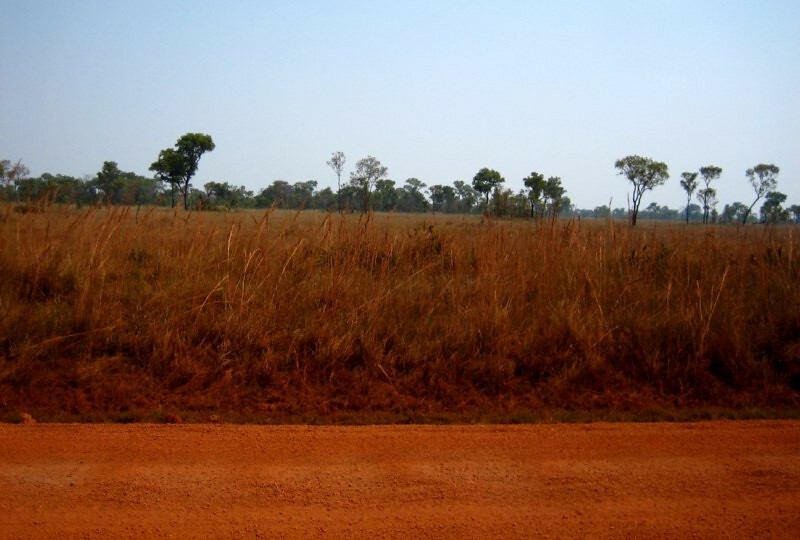 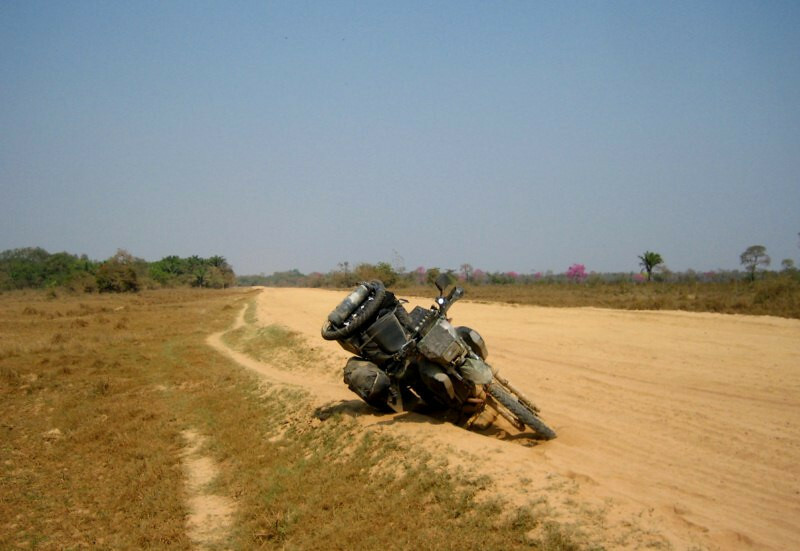 I usually avoid a heavy lunch while riding since it makes me sleepy in the mid-afternoon (when all the blood has rushed down to help digest the meal), but no worries on a dirt road as I discovered while riding the TransAmazonica. 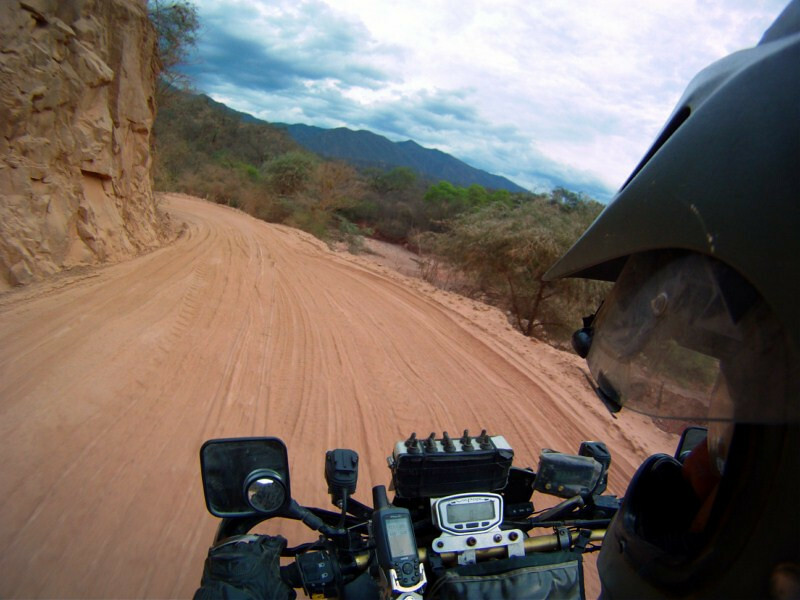 My attention is much more piqued while riding dirt than pavement, since the loose surface can quickly lead to a tip over and this increased use of brain power keeps my attention going the whole day (supplanted with appropriate music, of course). 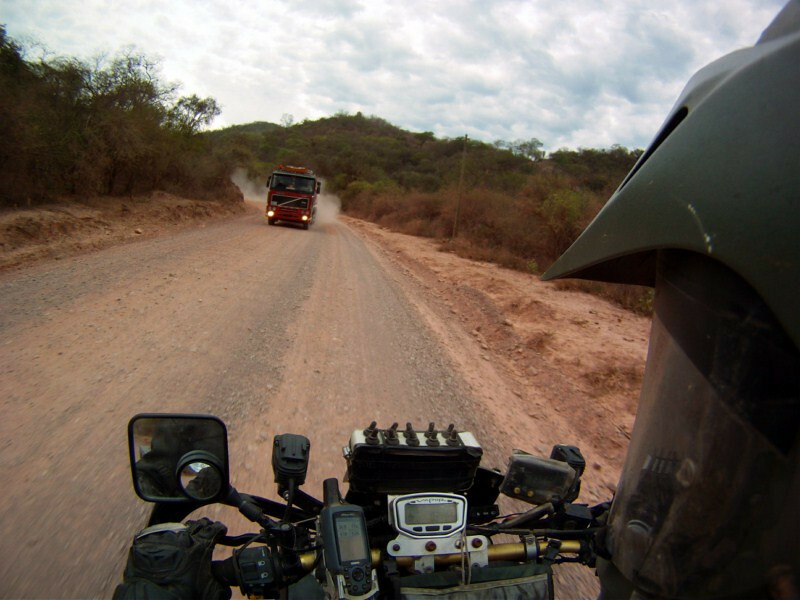 The only downside of this route is the regular truck traffic and the ensuing dust clouds that you must ride through. 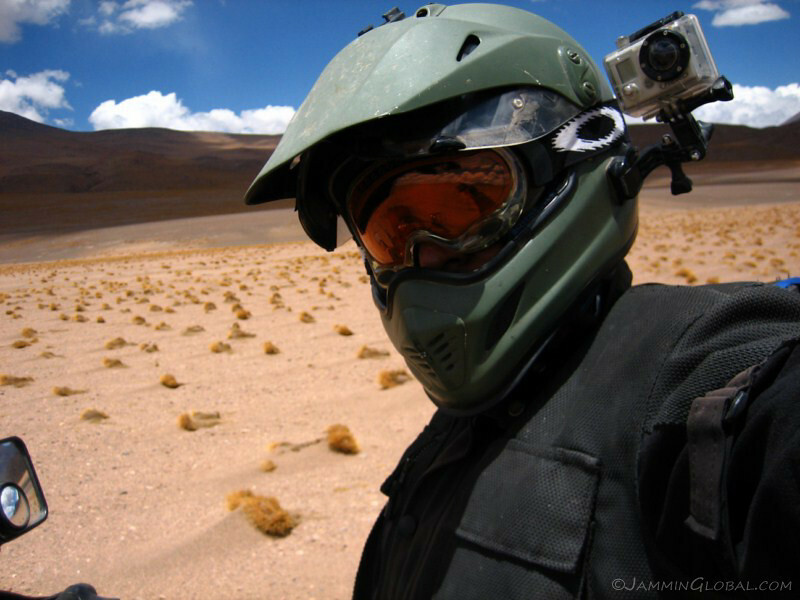 A helmet with a face shield being invaluable as you swim back into clean air. 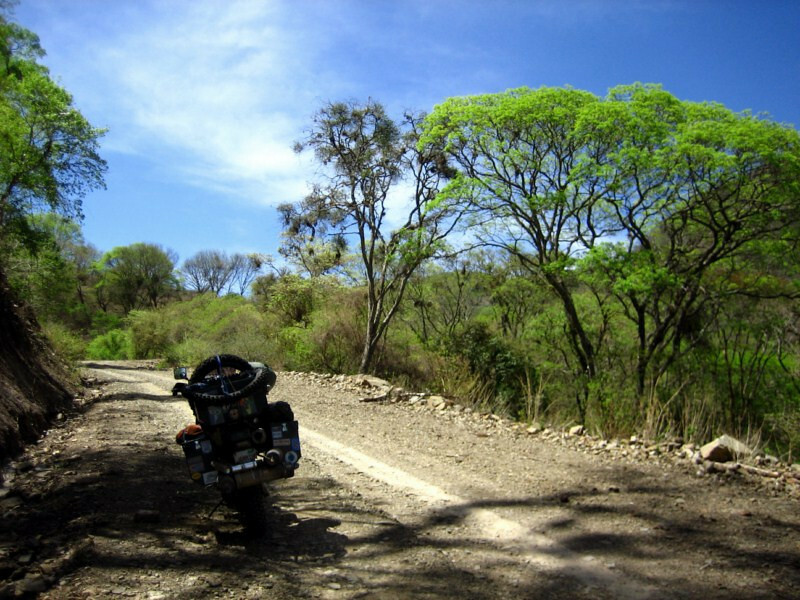 When there was no oncoming traffic, it was a true joy to be riding the pegs on a well-maintained dirt road through captivating landscape. 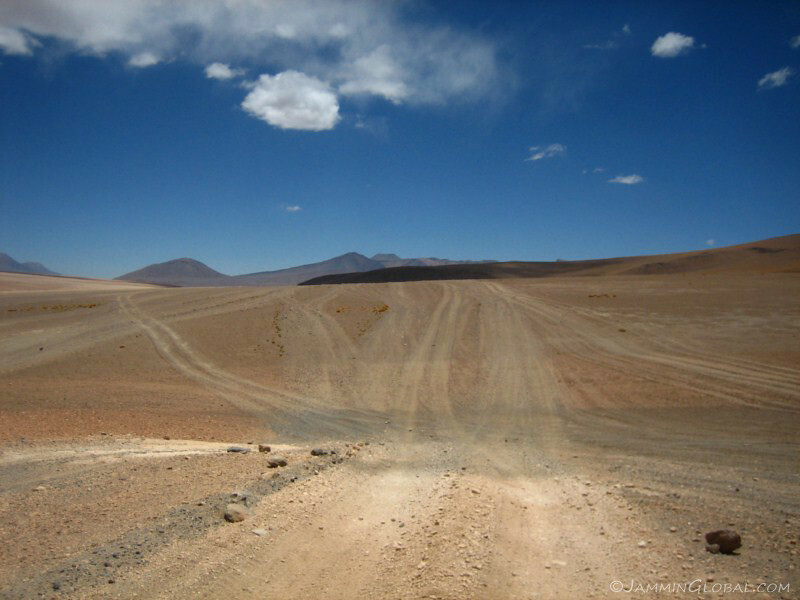 But, the trucks are always there. 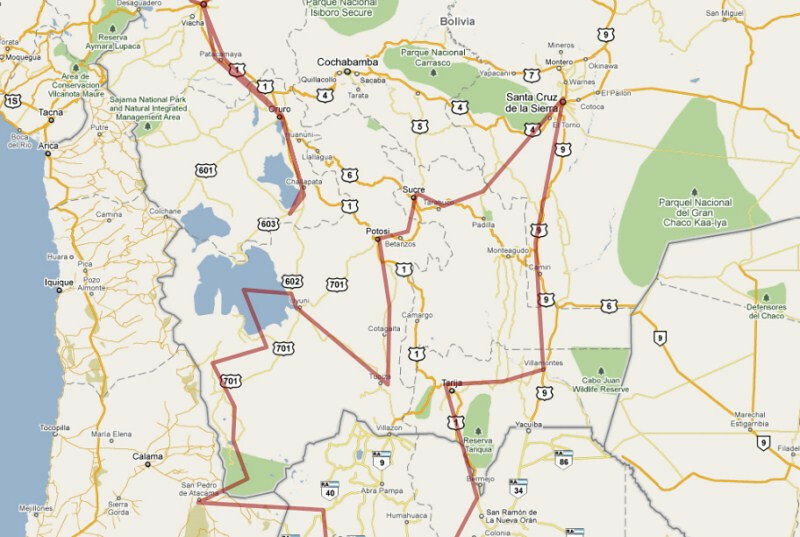 This is the principle route across southern Bolivia and traffic coming from Paraguay and the chaco of Argentina have to take this route to access Tarija and points westward of there. 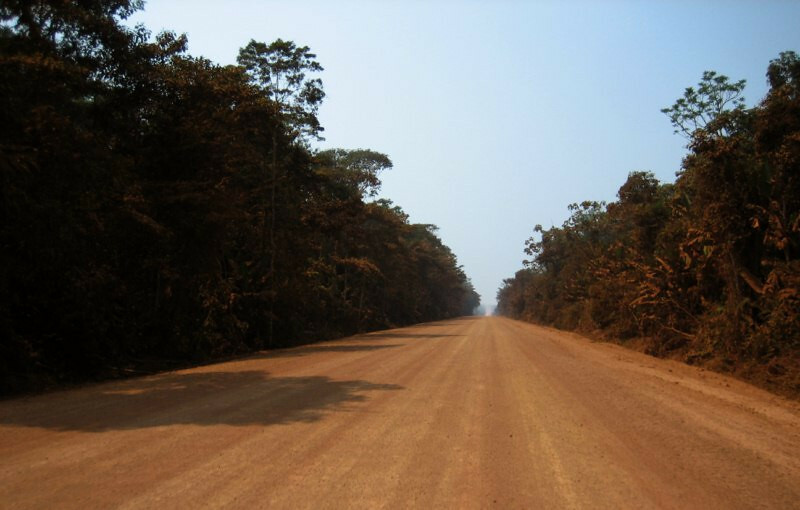 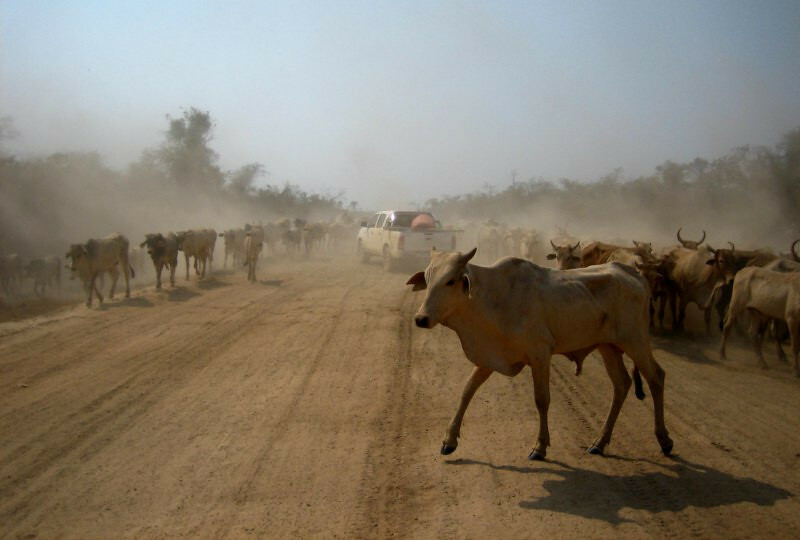 This was also the end of the dry season, with the last rains falling months before, so the surface was pulverized into fine sand in places. 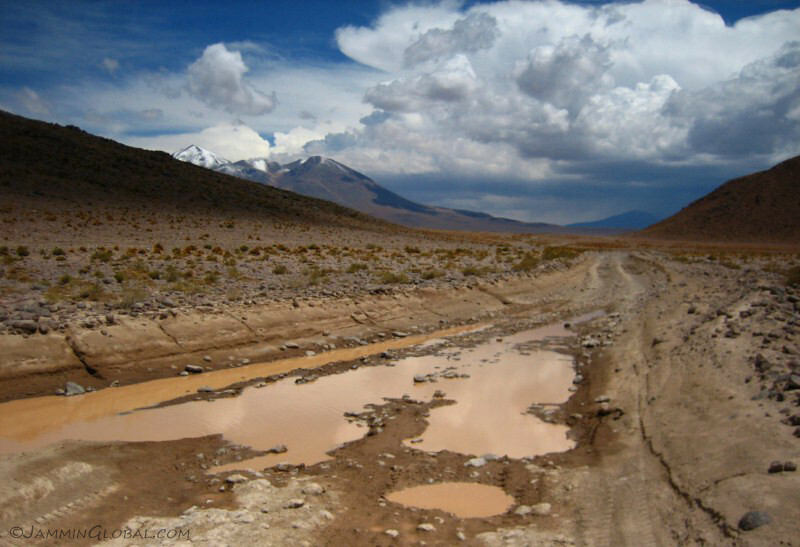 I was glad I made it back to Bolivia before the summer rainy season started and made many of these roads impassable. 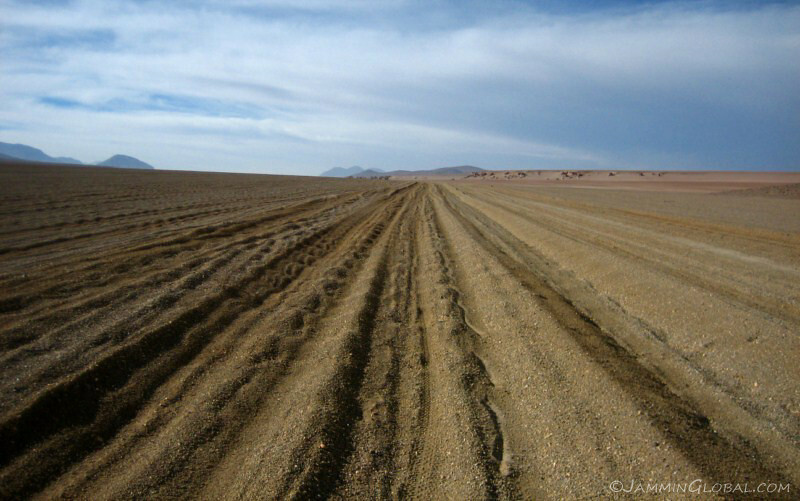 I’ll take choking dust over soups of mud any day. 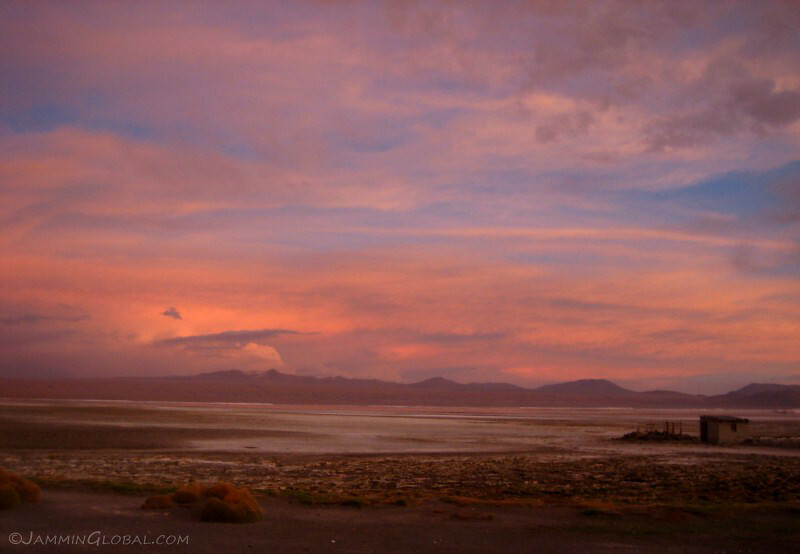 It was getting into late afternoon and the vivid colors were coming through stronger. 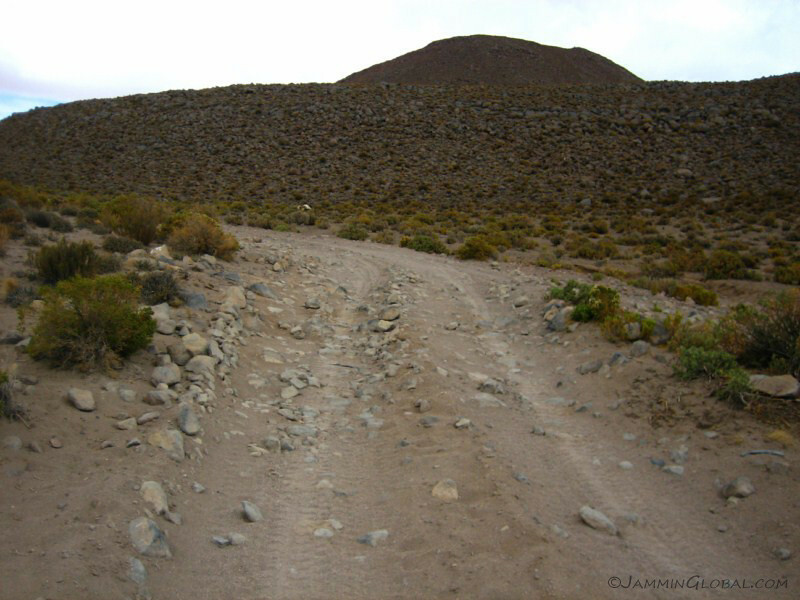 The narrowness of the route was dictated by huge boulders in places and dirt-lovers can rest assured this whole route wont be paved anytime soon. 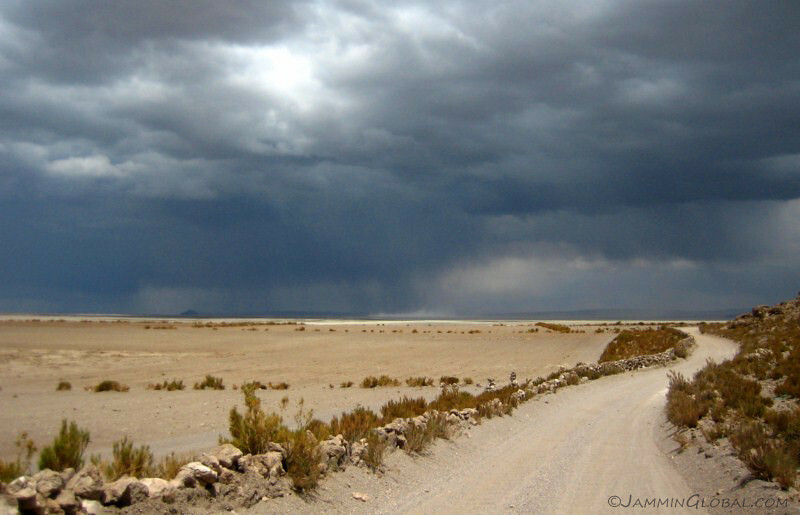 Darkening clouds changing the hues across the landscape. 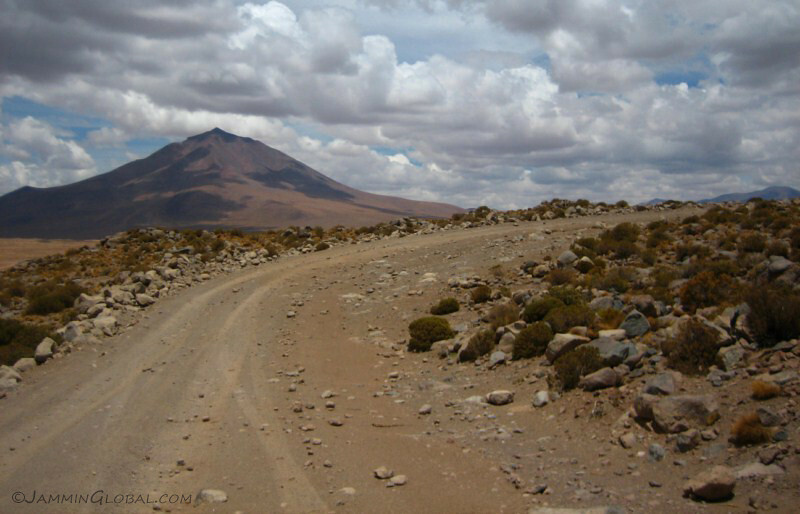 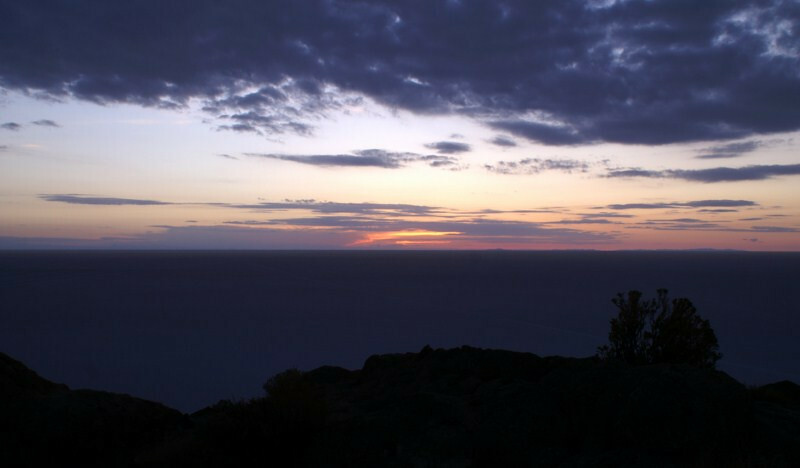 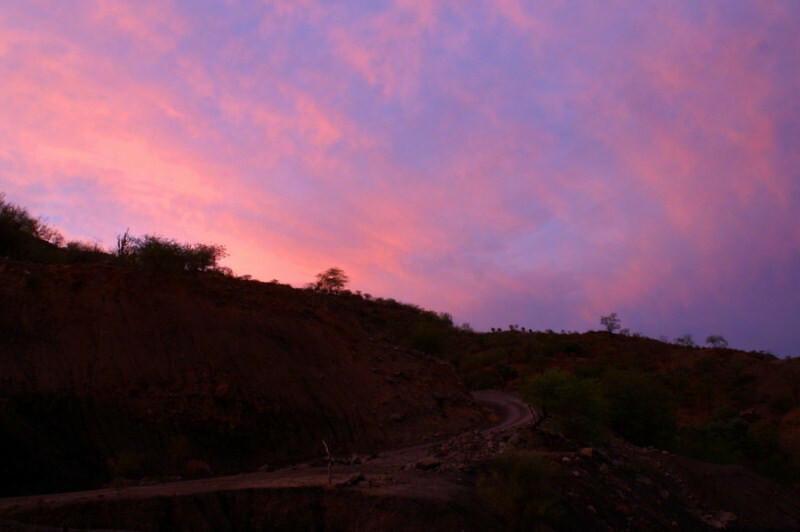 The on-going twists in the road kept the excitement up as the sun faded and I still had an hour to reach Villamontes. 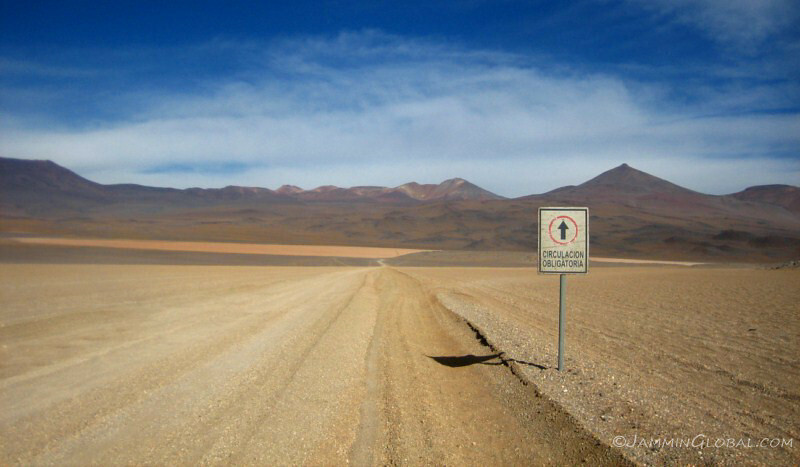 The universal ‘pavement ends’ sign. 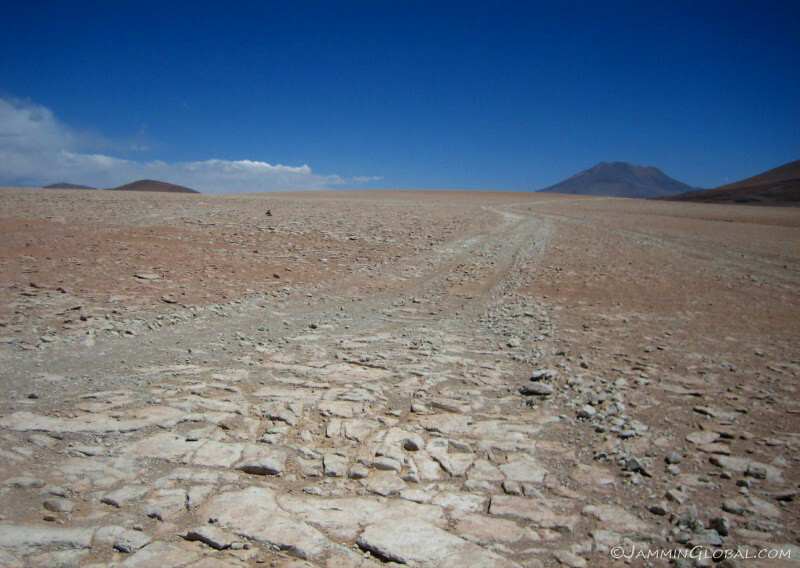 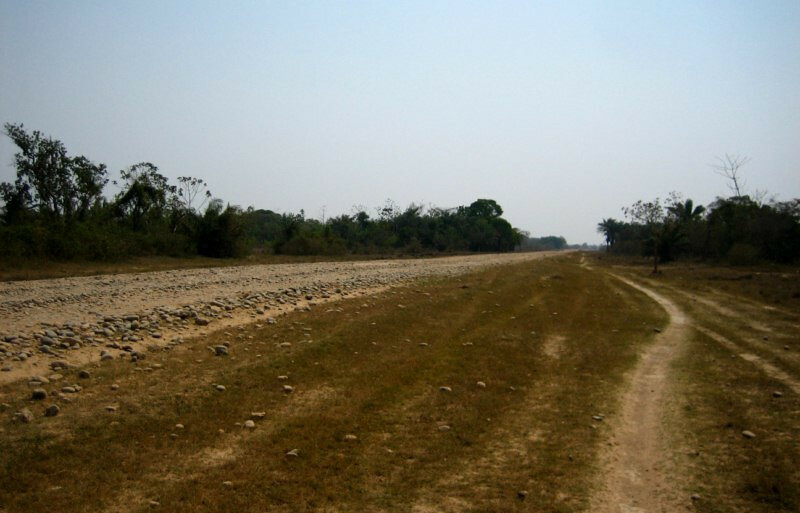 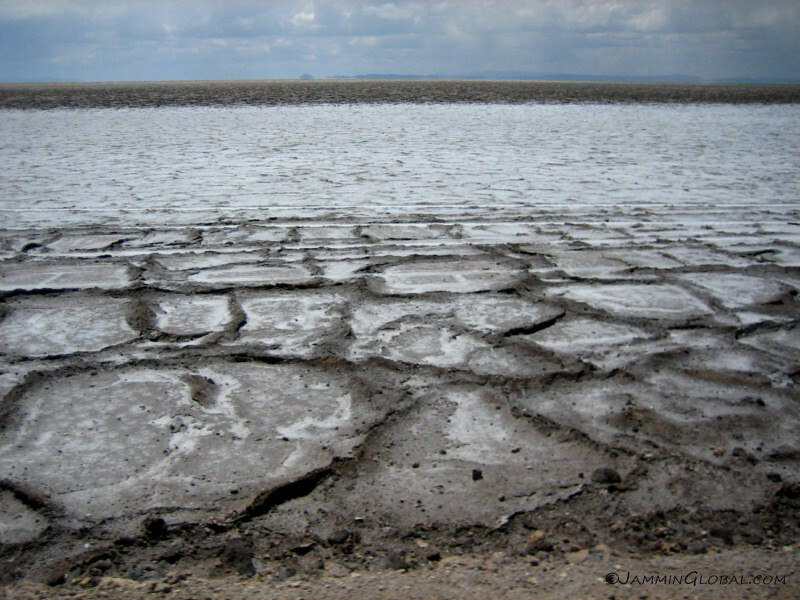 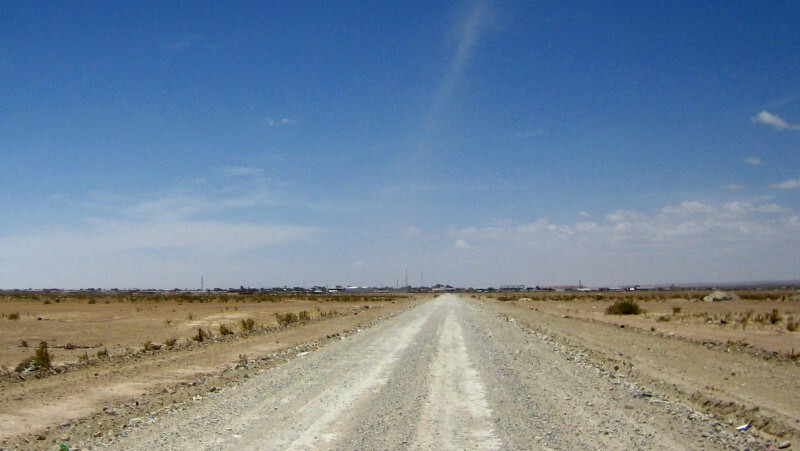 The dirt route resembling the dried river bed that it followed. 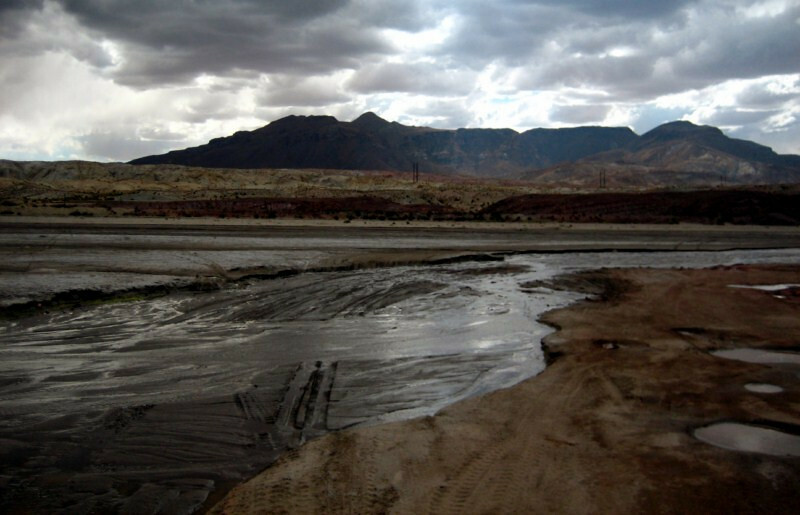 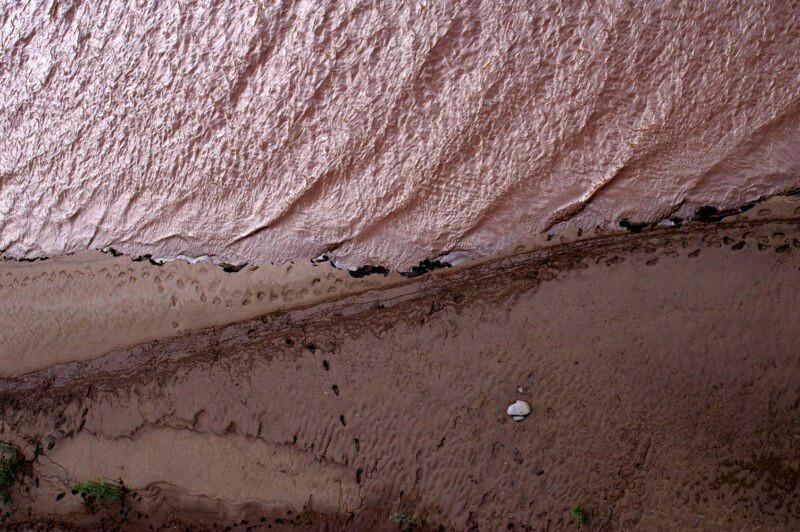 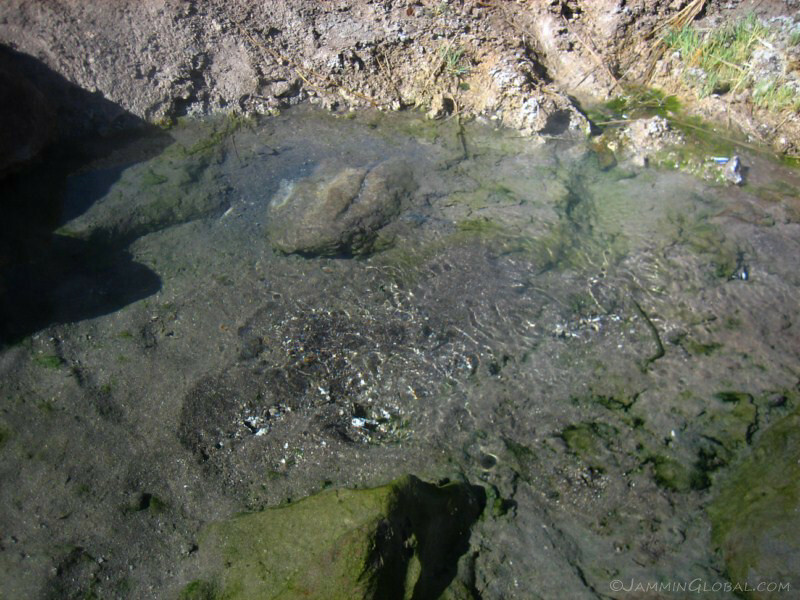 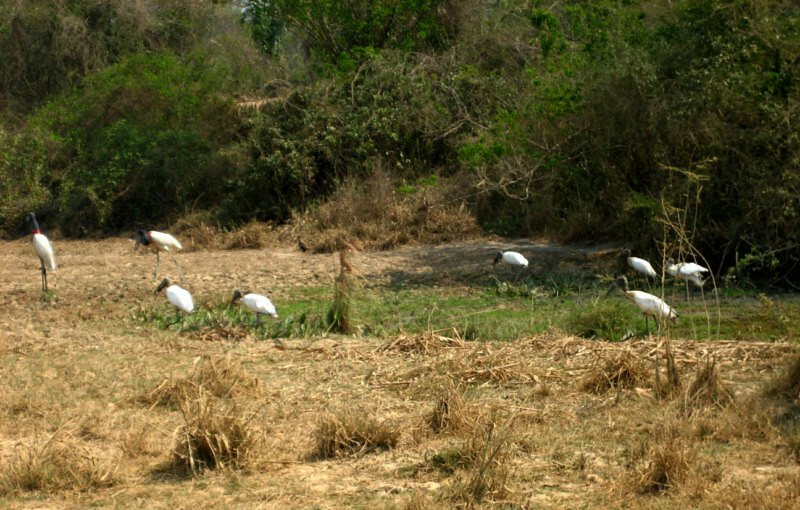 A panorama of about 170 degrees of a bend in a dried river bed. 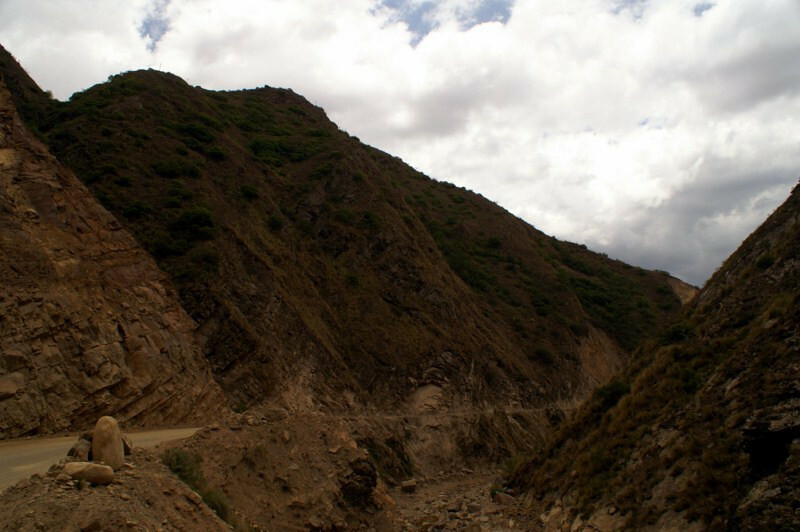 This whole area was just yearning for the first rains to fall. 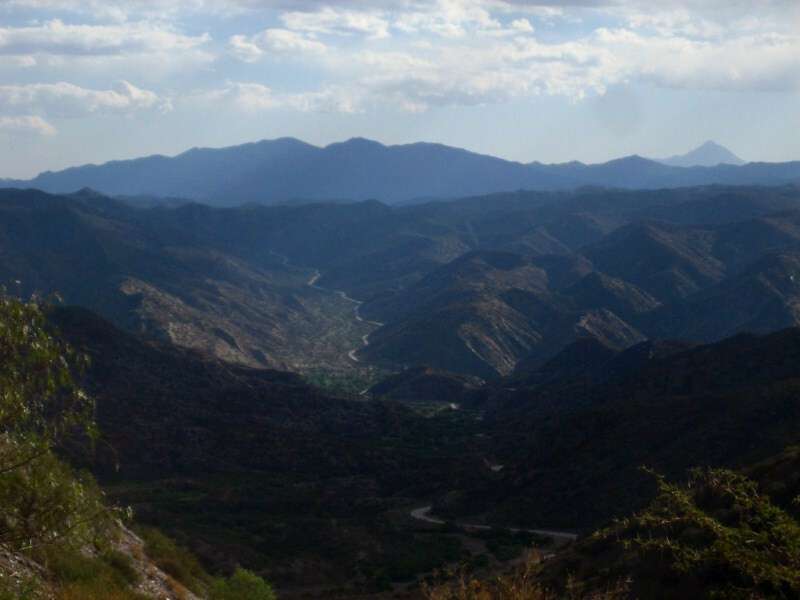 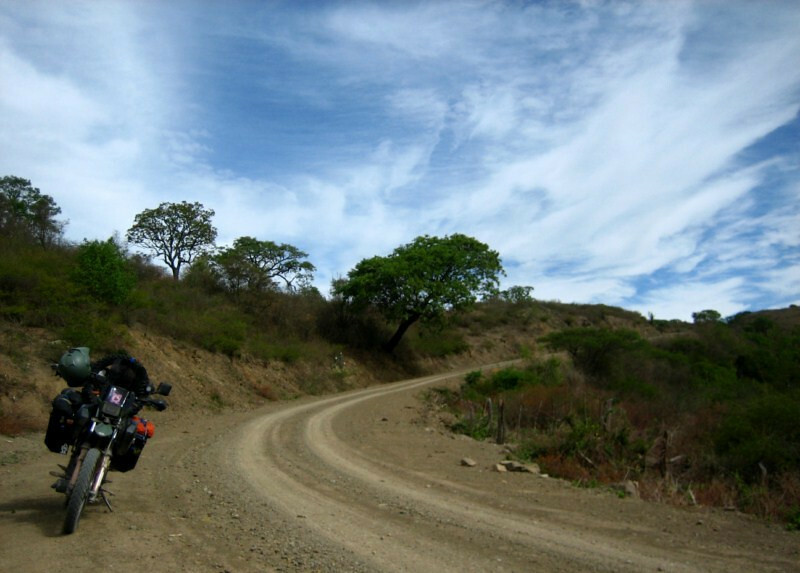 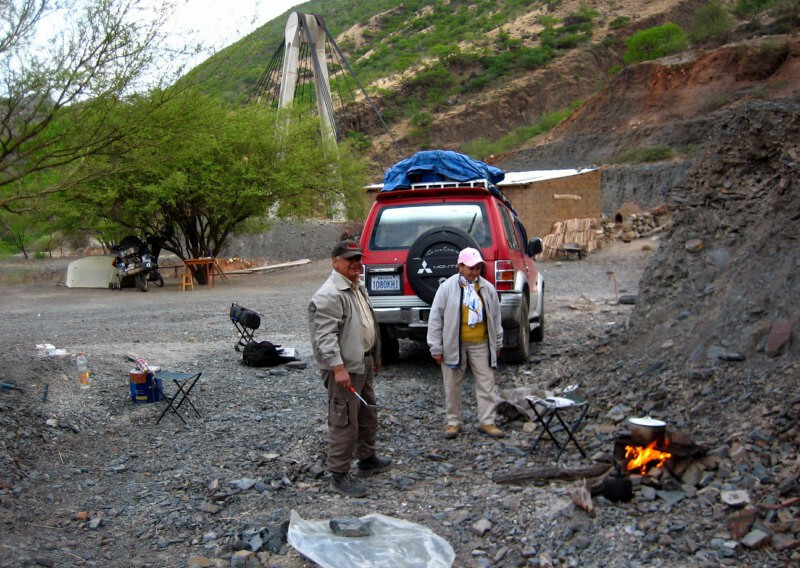 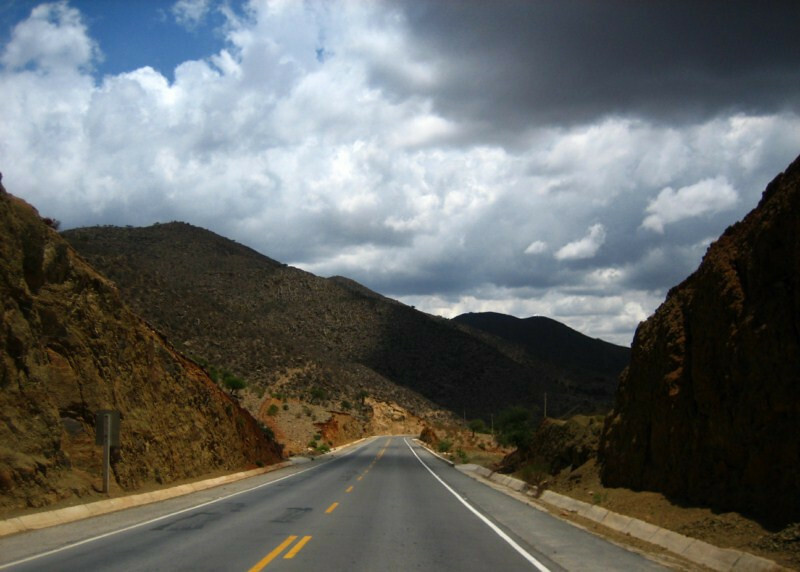 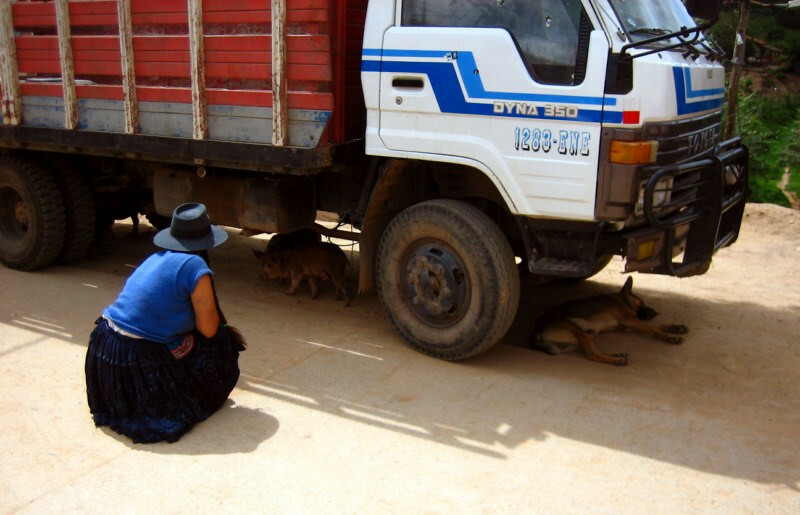 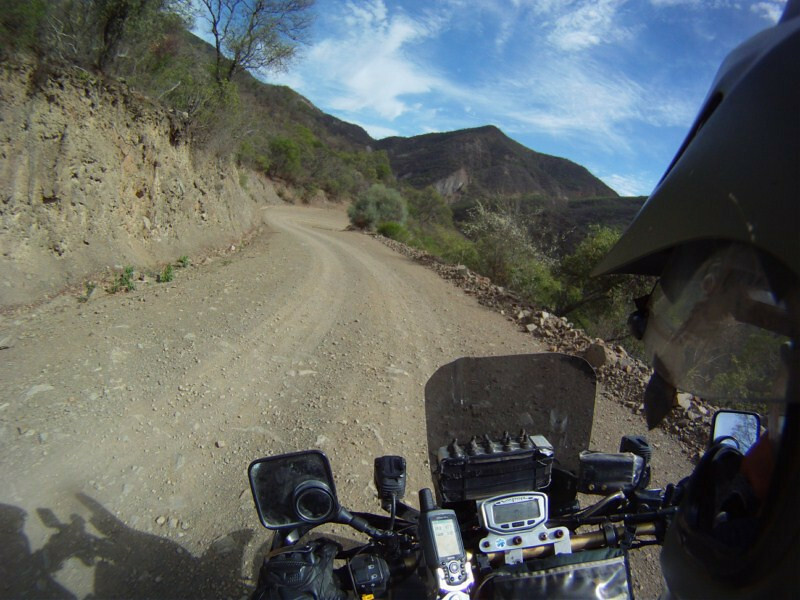 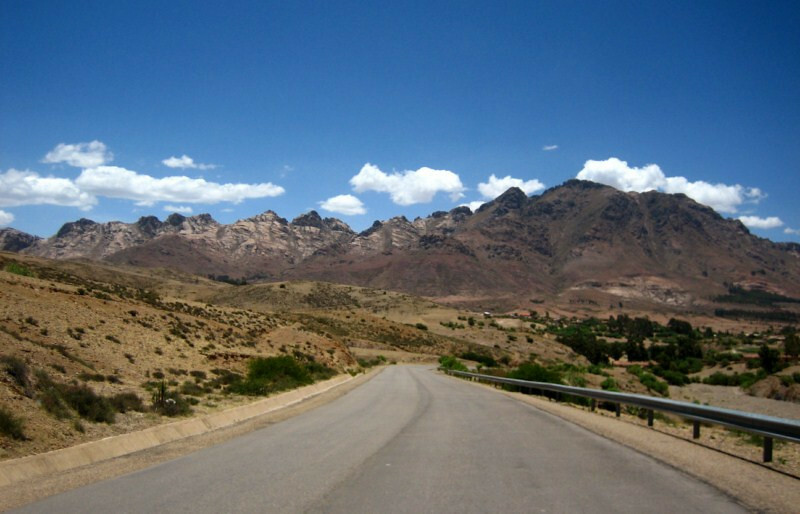 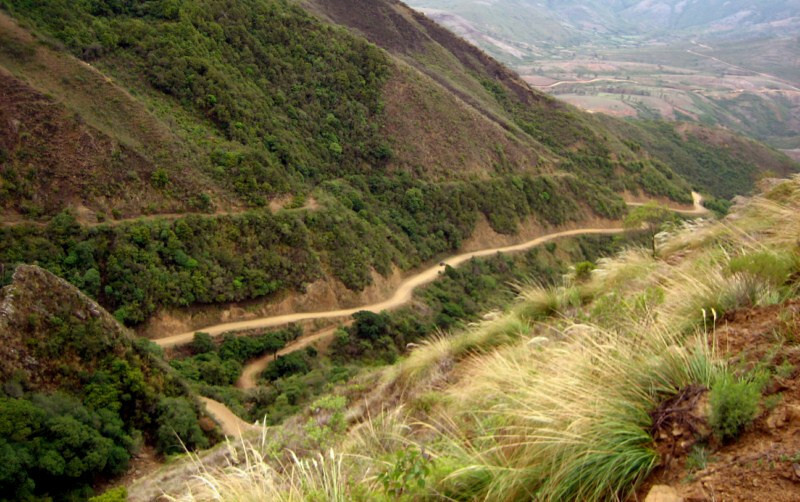 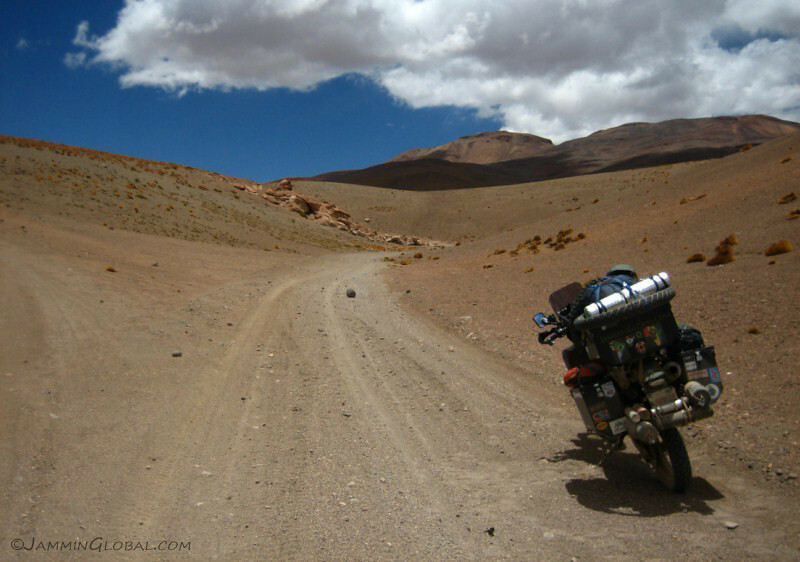 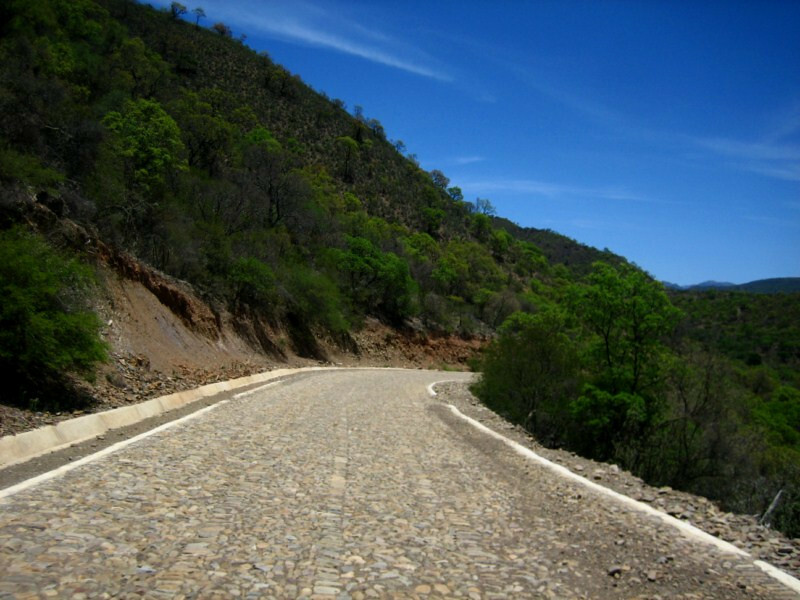 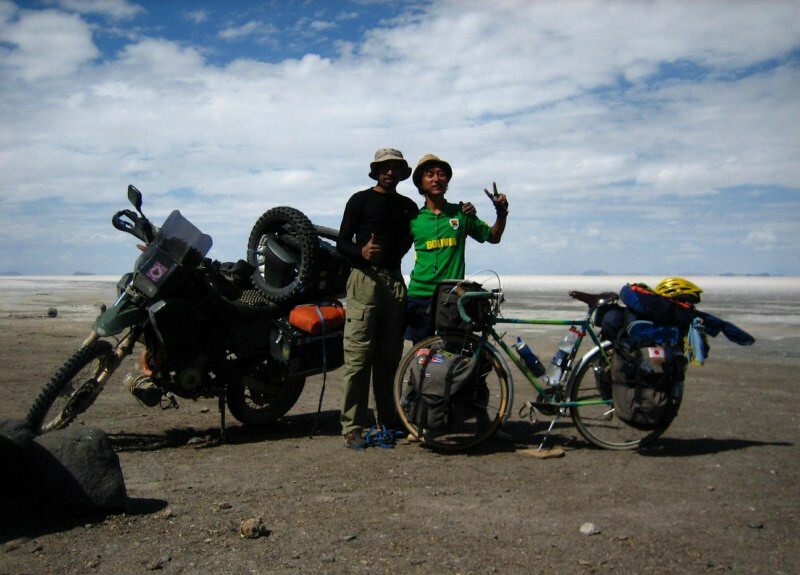 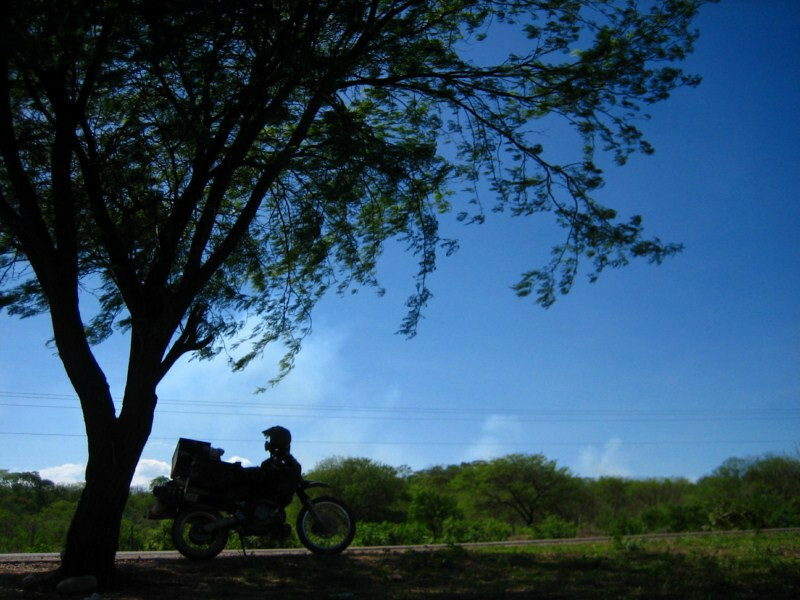 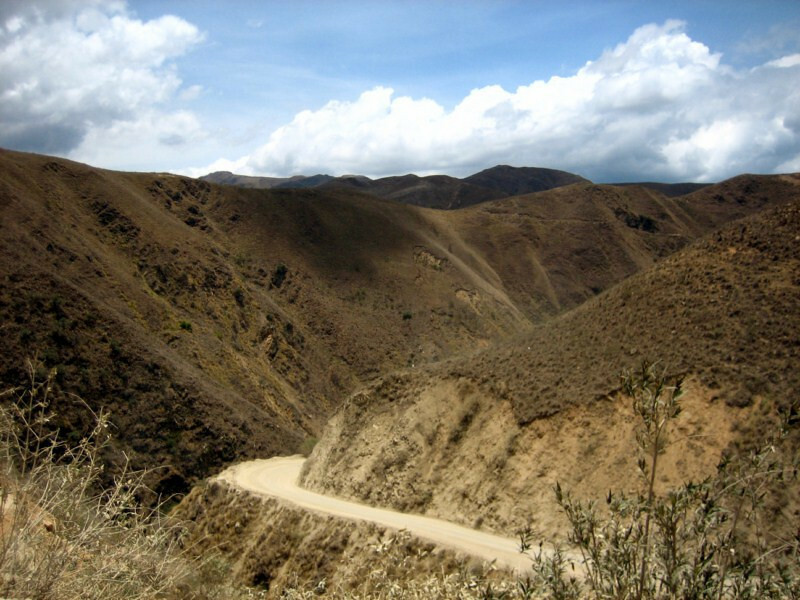 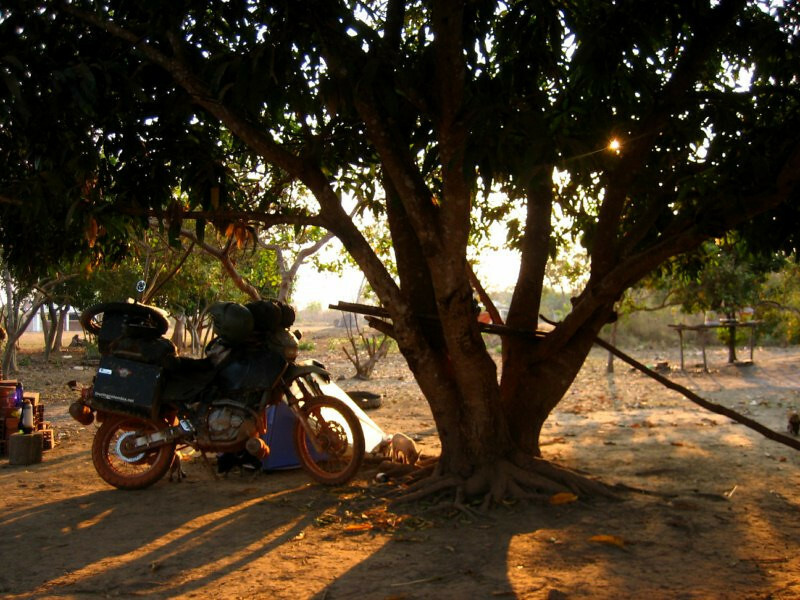 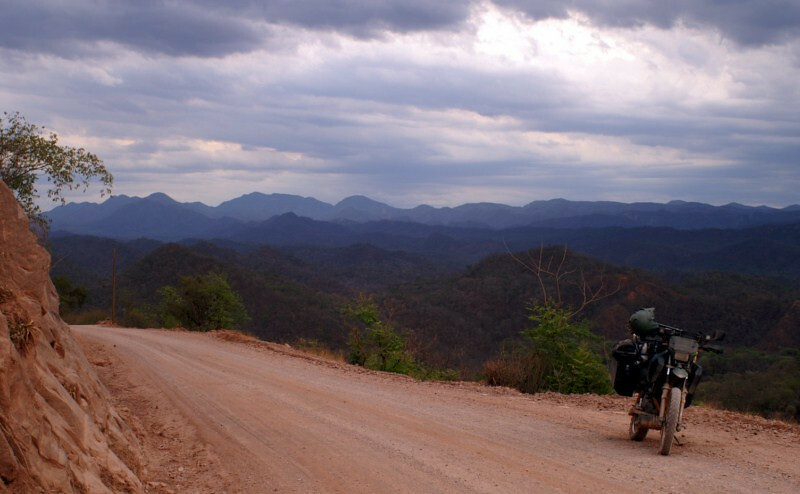 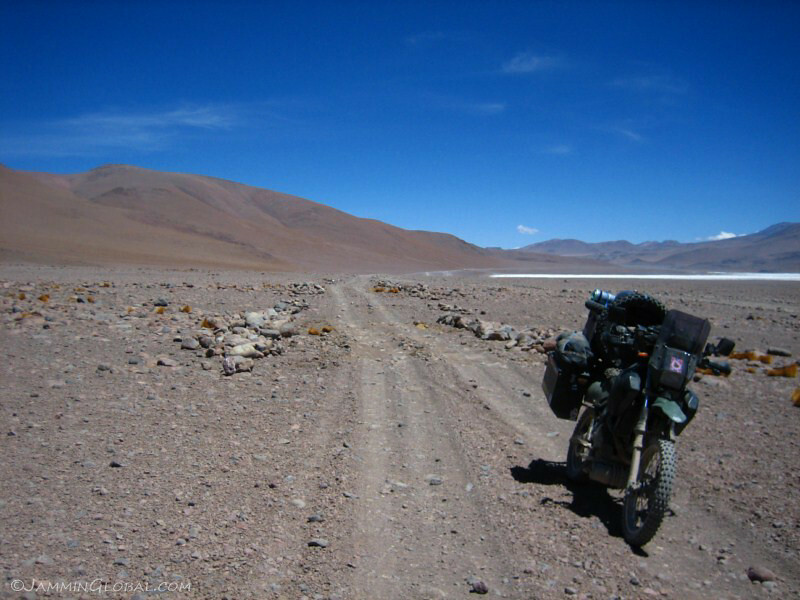 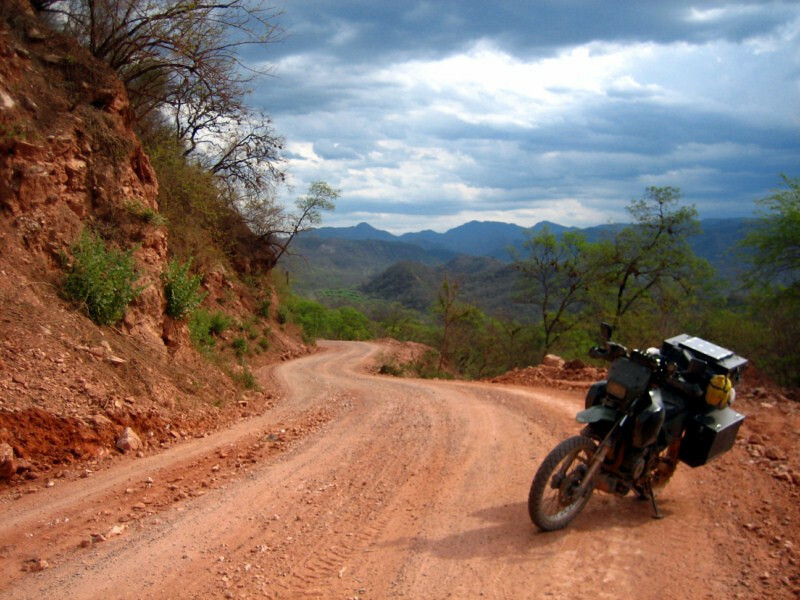 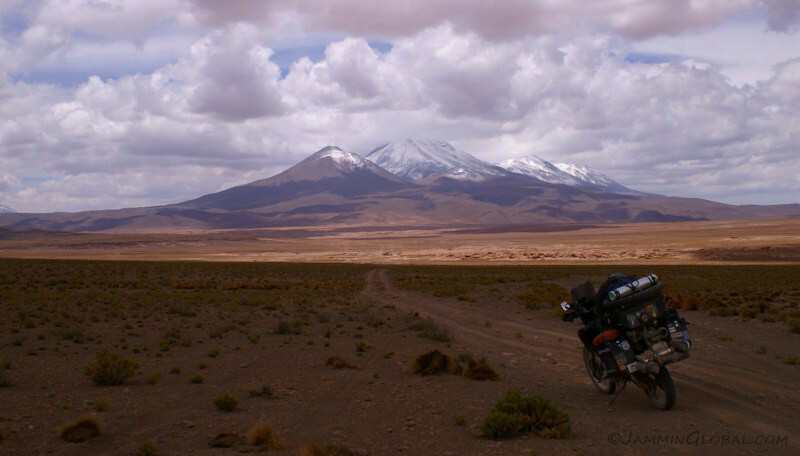 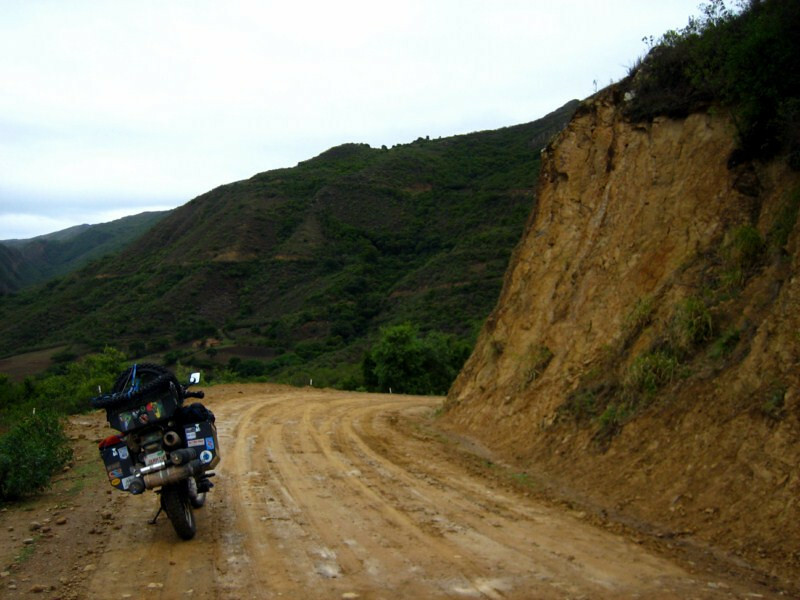 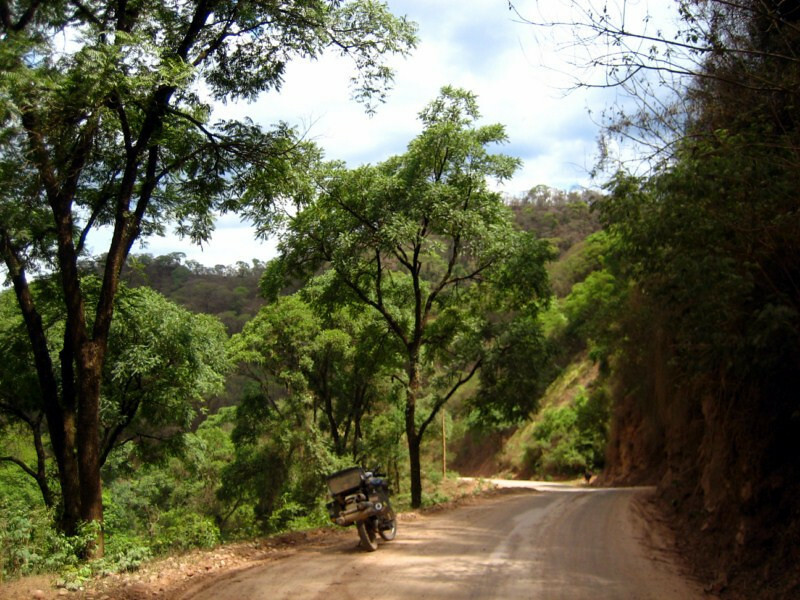 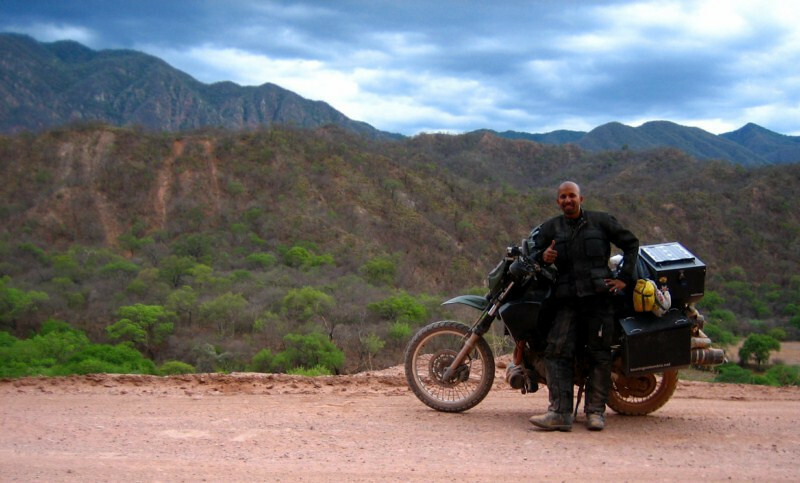 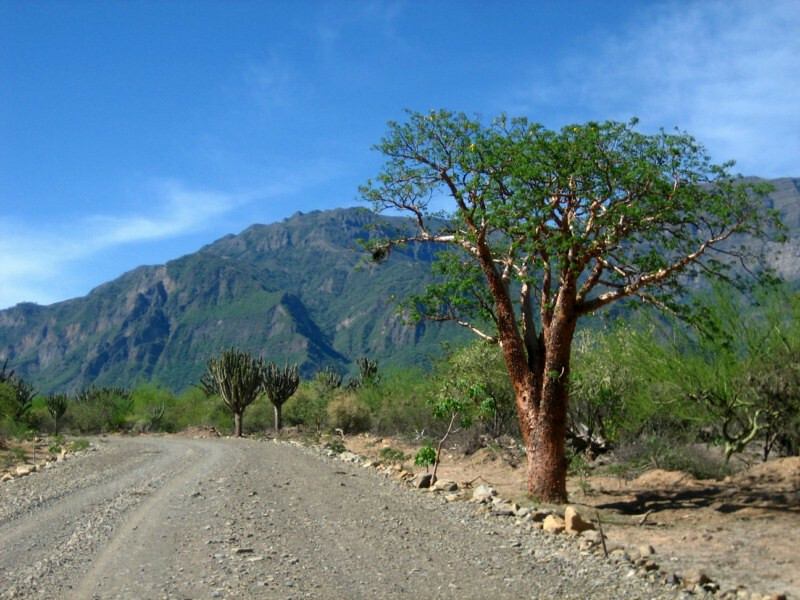 An enjoyable ride through southern Bolivia from Tarija to Villamontes. 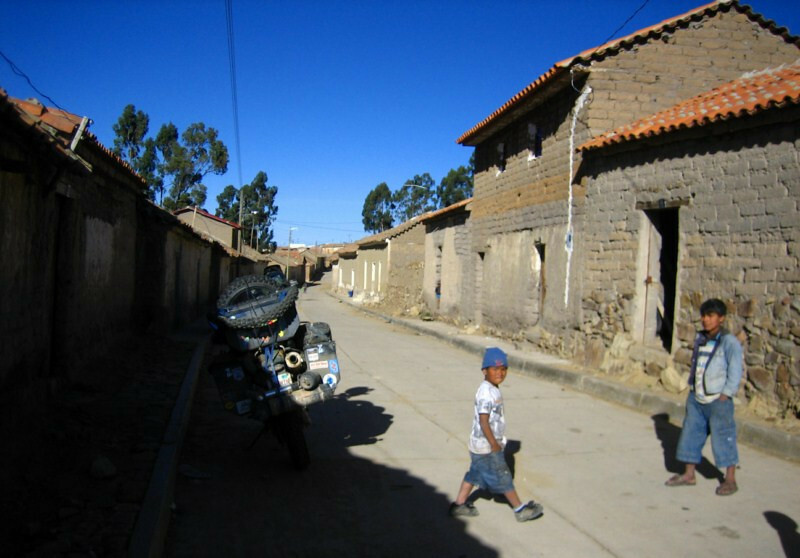 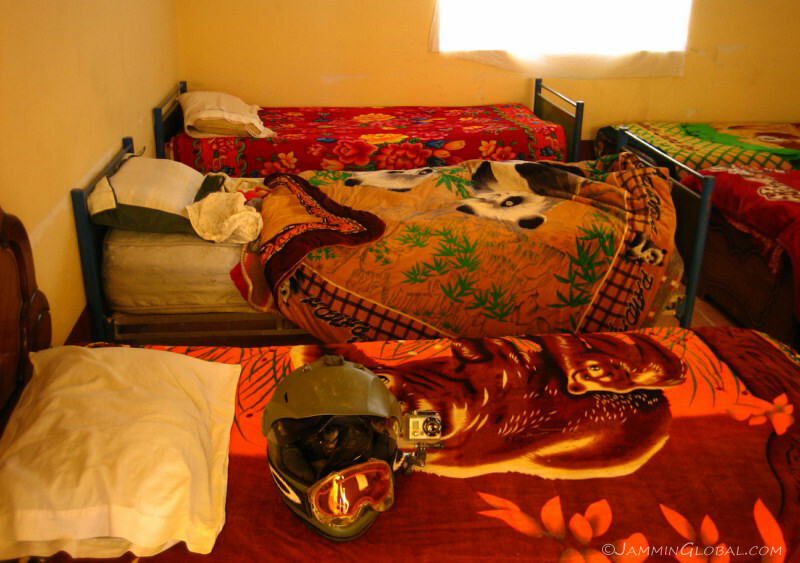 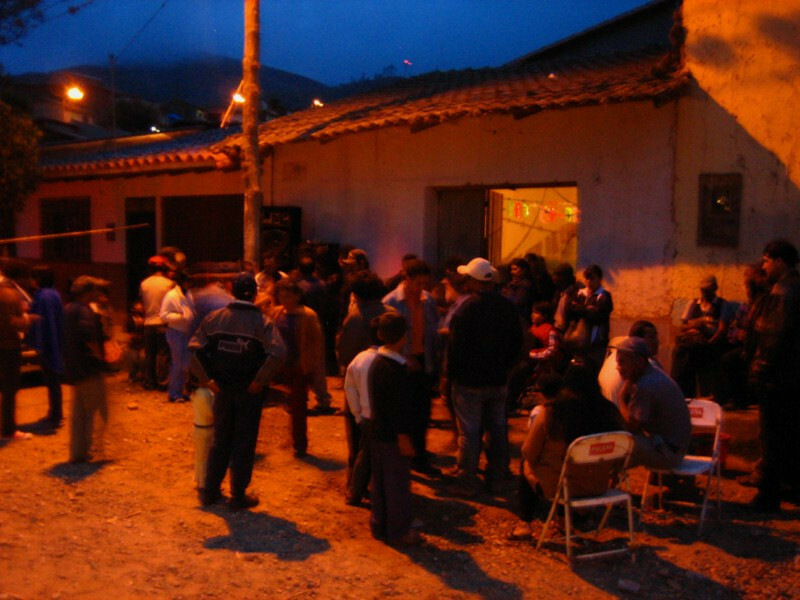 I spent the night in Villamontes, which is not much more than the first border town in southeastern Bolivia. 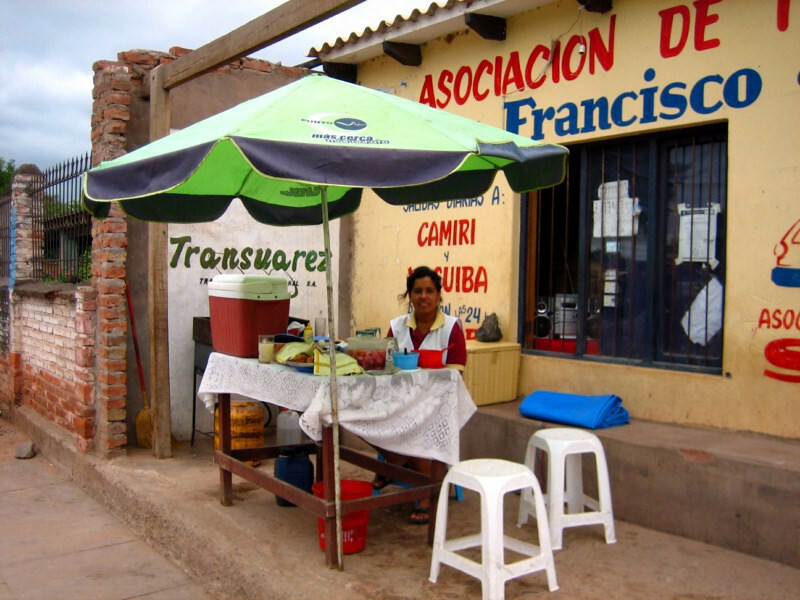 I had a good breakfast at this lady’s stall before setting off to Santa Cruz. 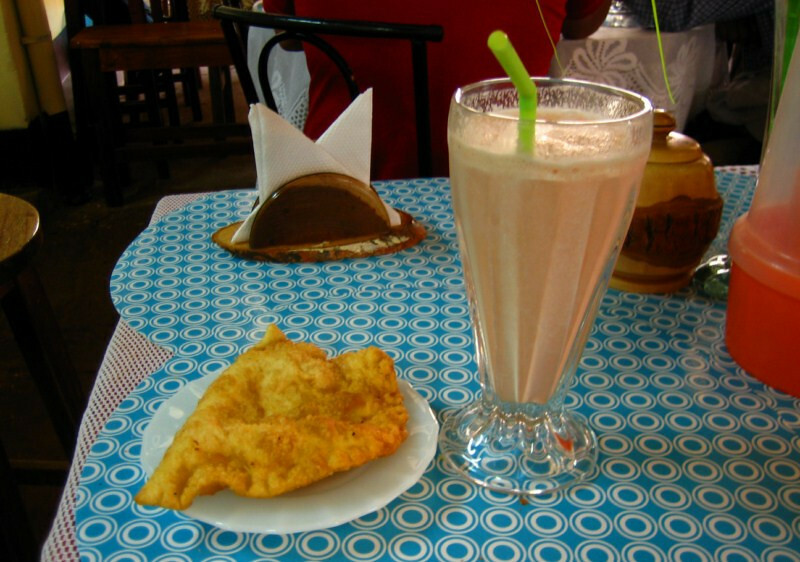 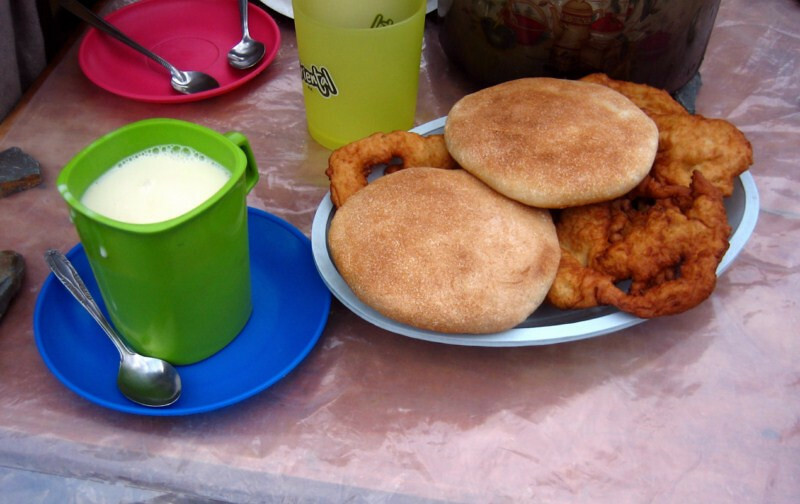 The culture of empanadas carrying over across the border as the cheap, street food. 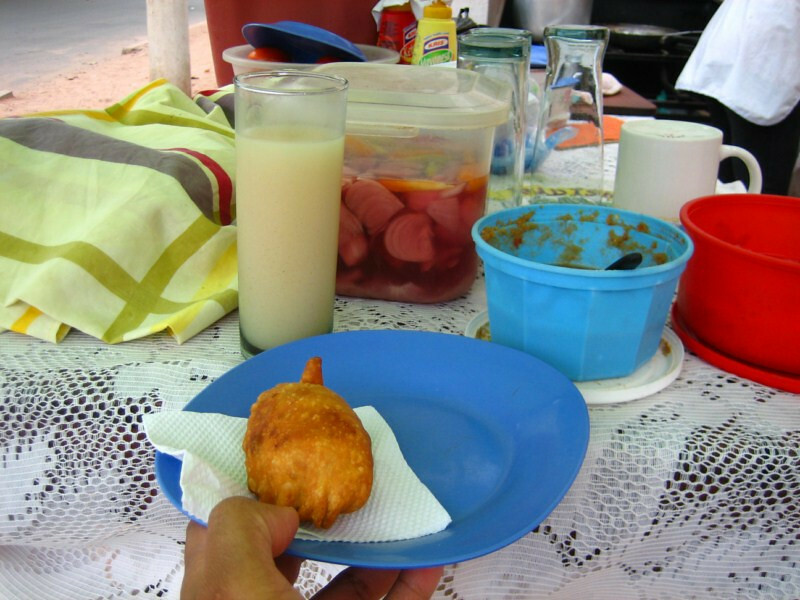 A fried puff with meat inside and an assortment of condiments (pickled vegetables, hot sauces, etc). 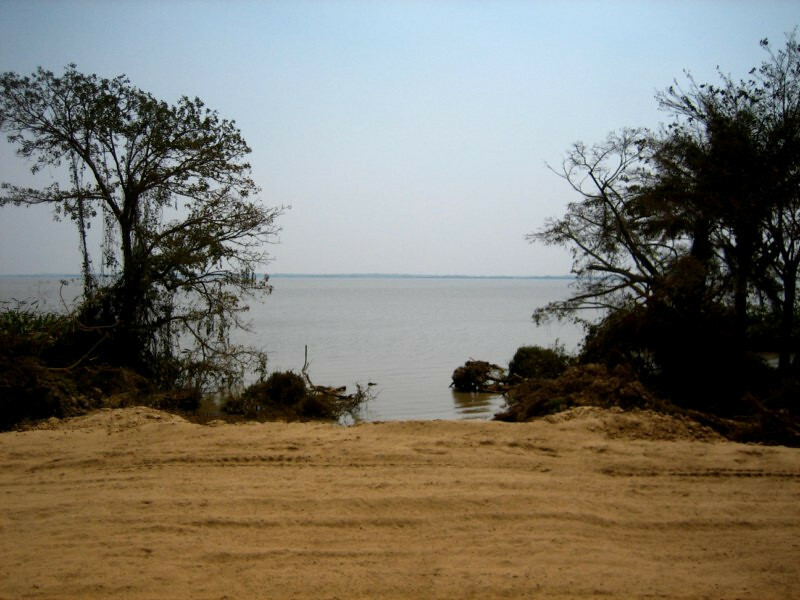 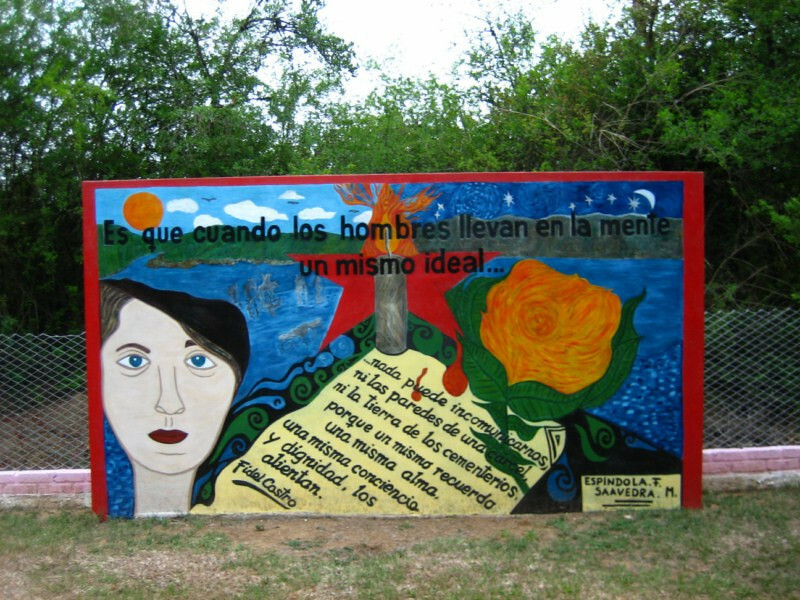 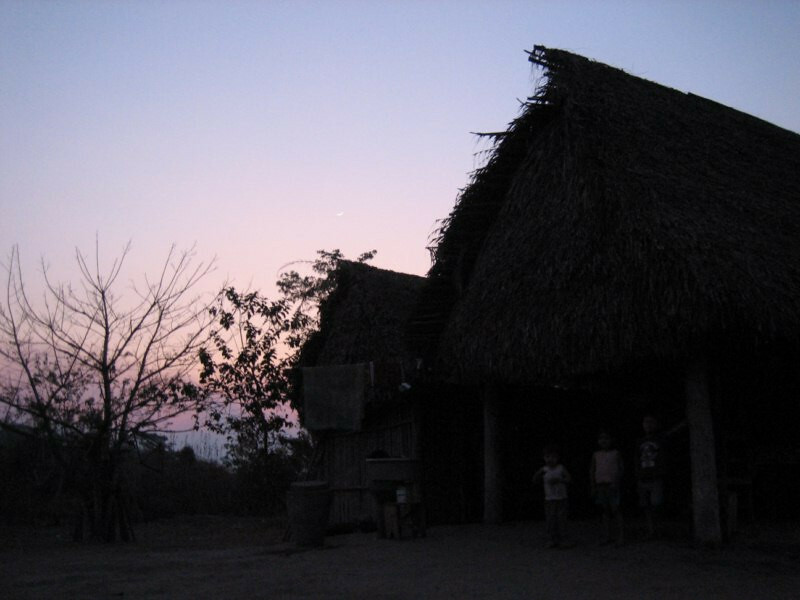 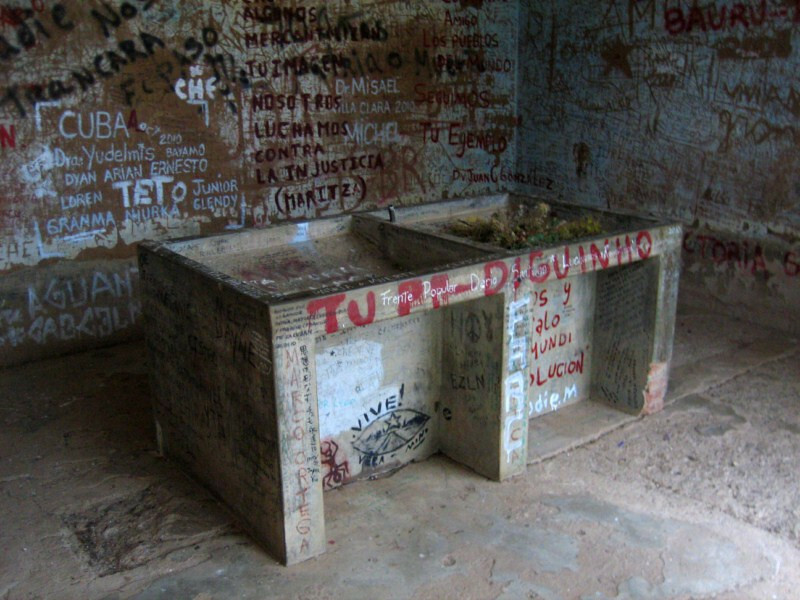 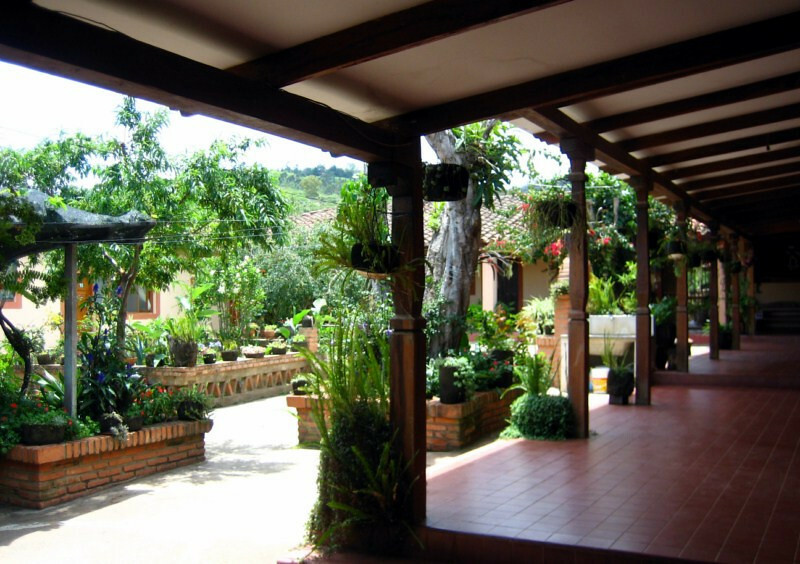 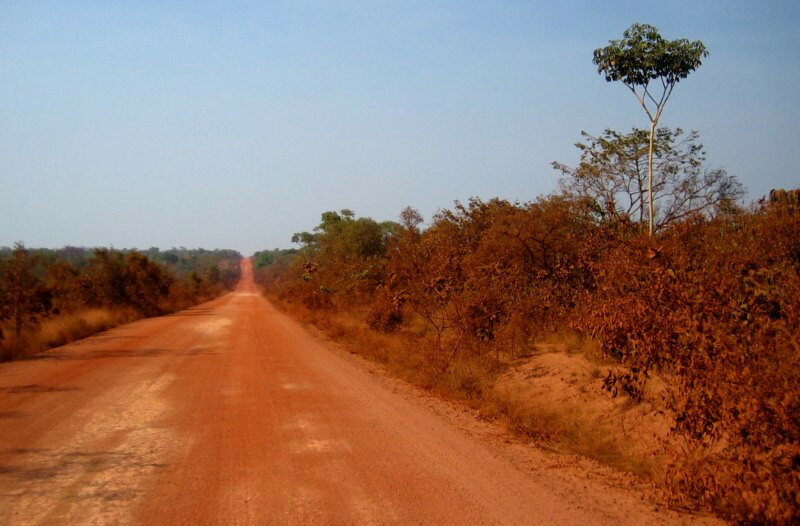 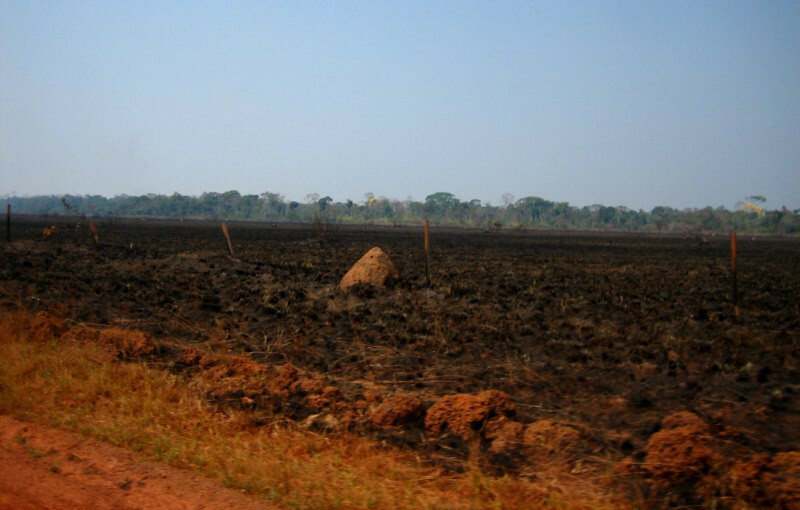 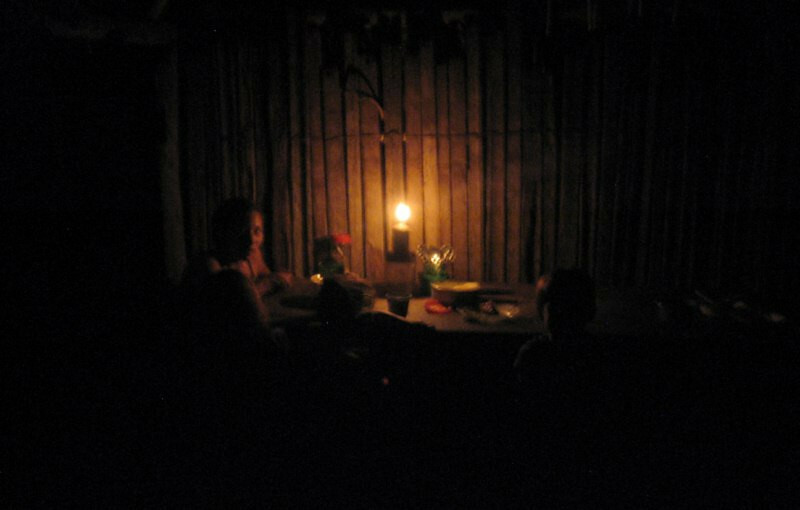 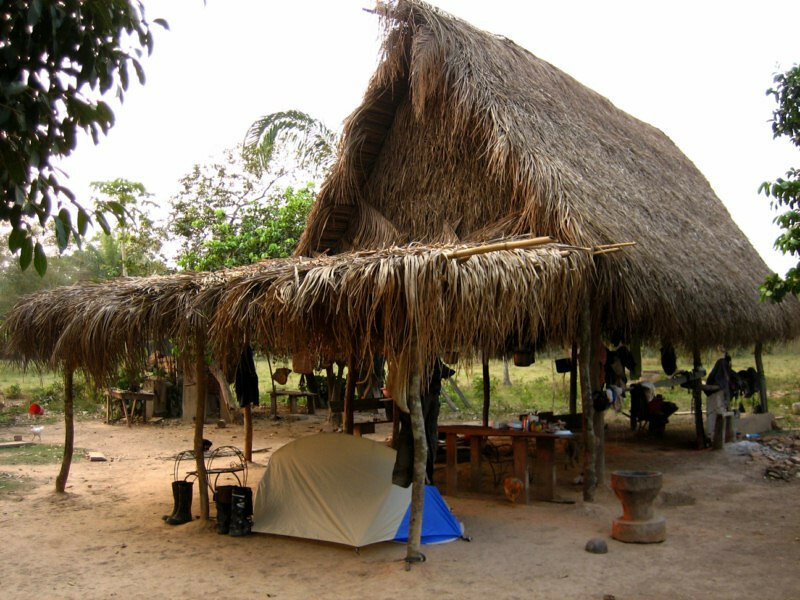 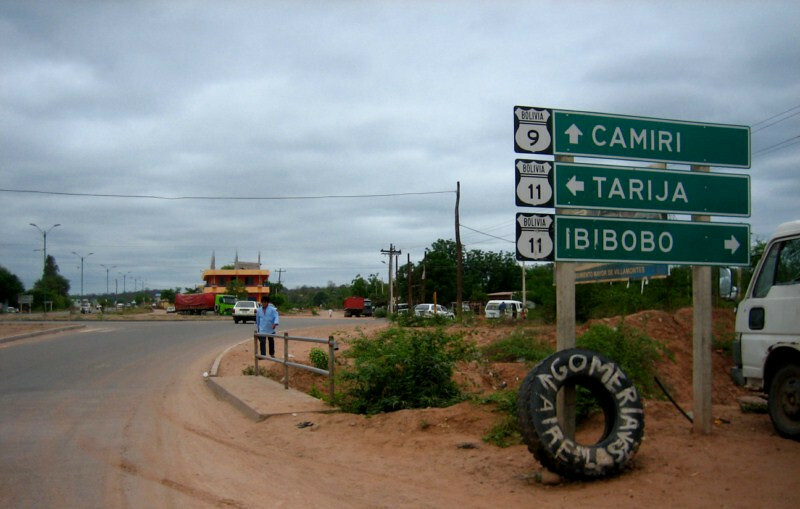 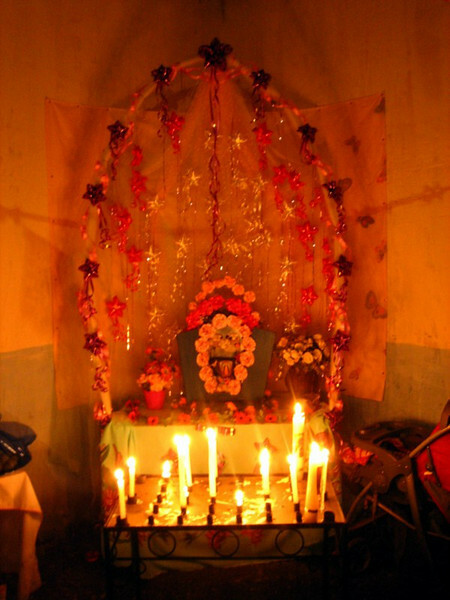 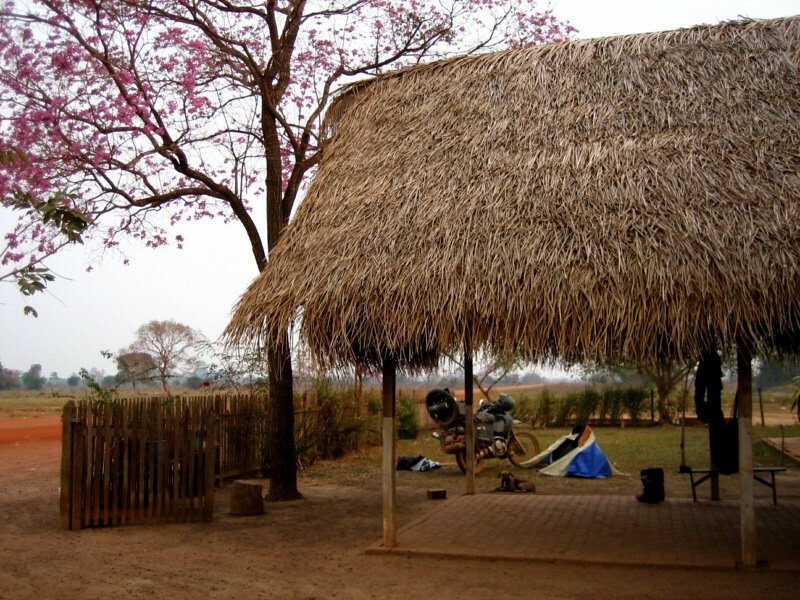 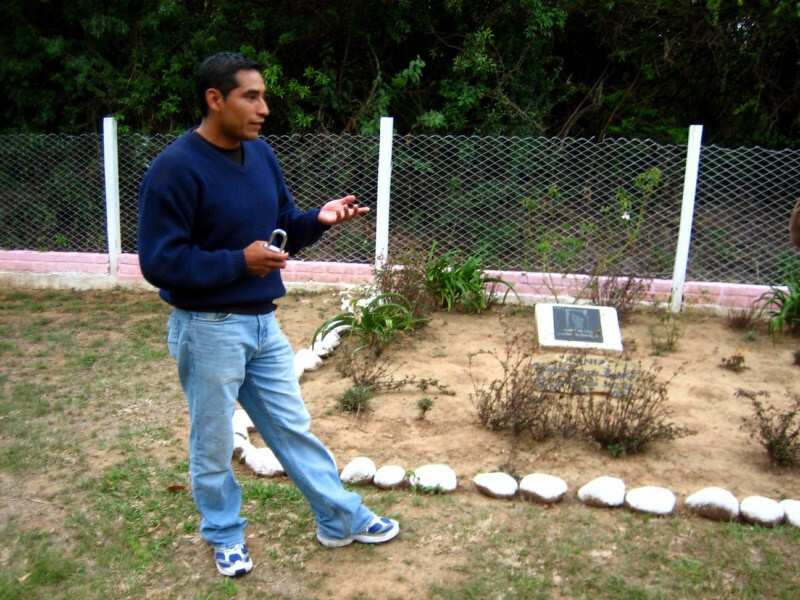 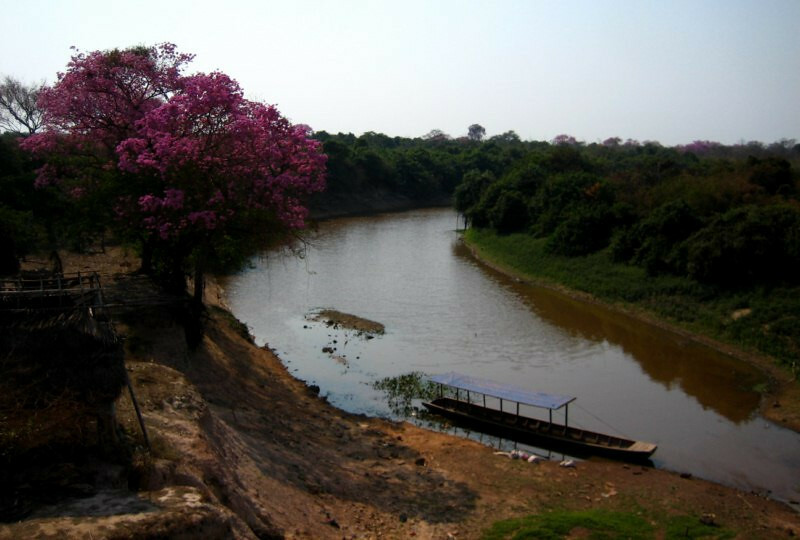 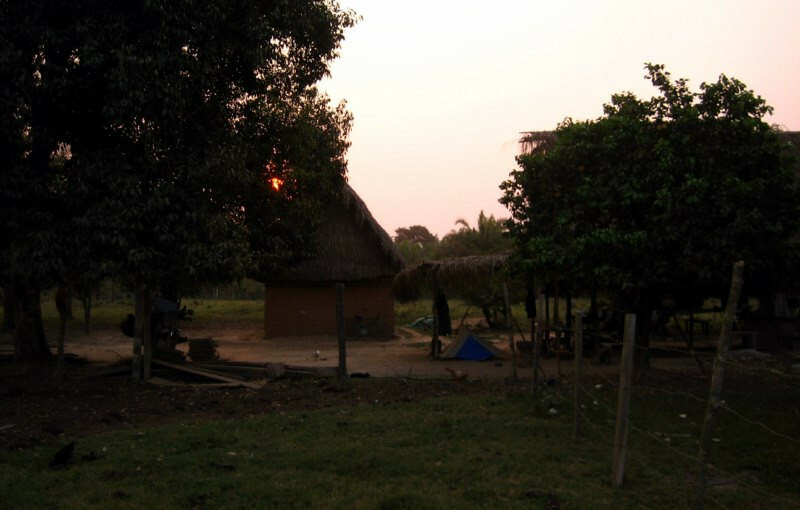 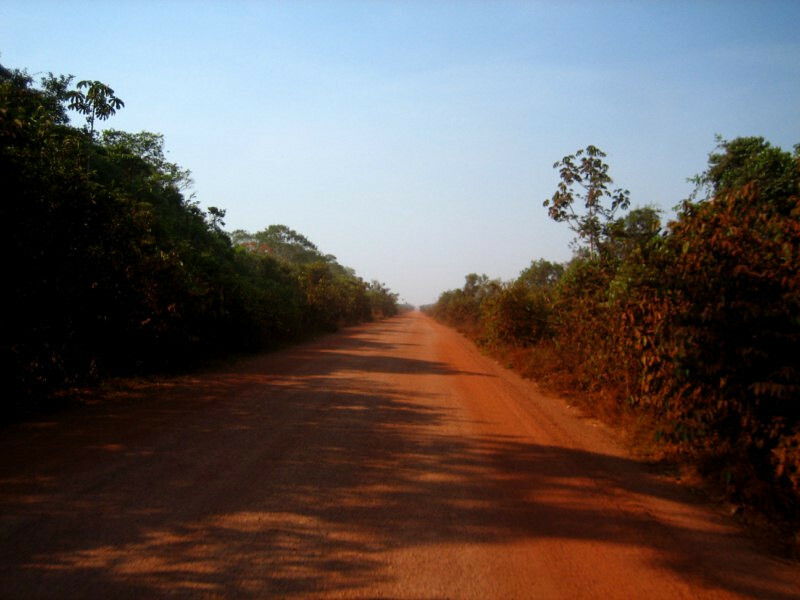 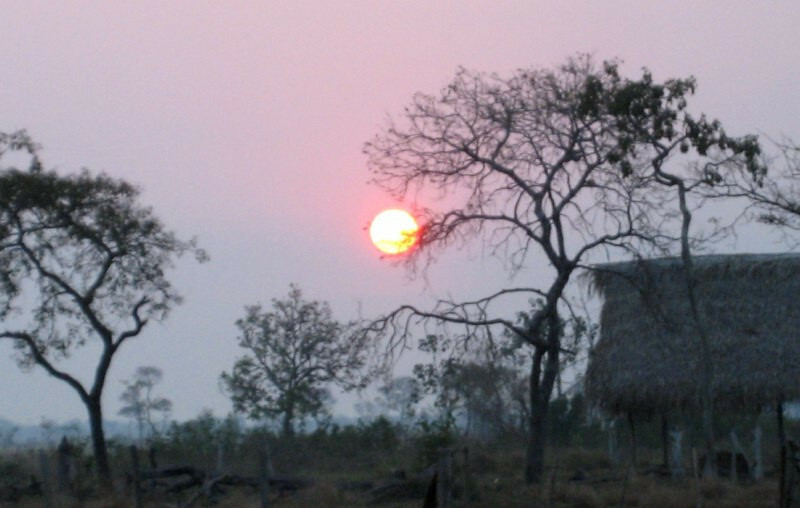 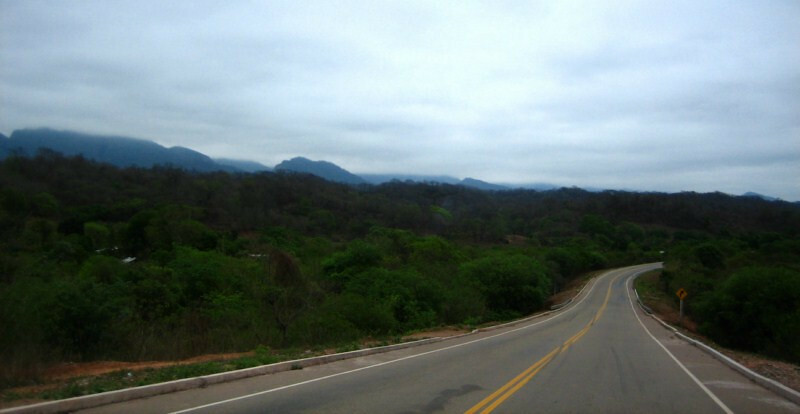 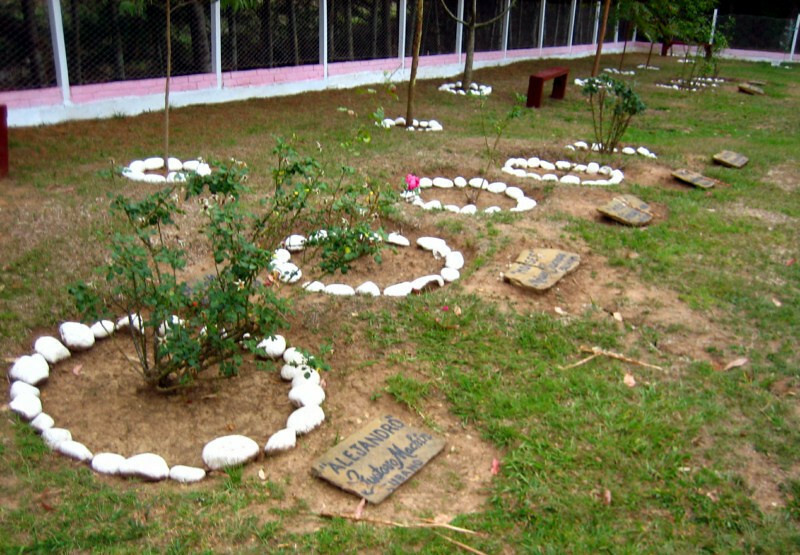 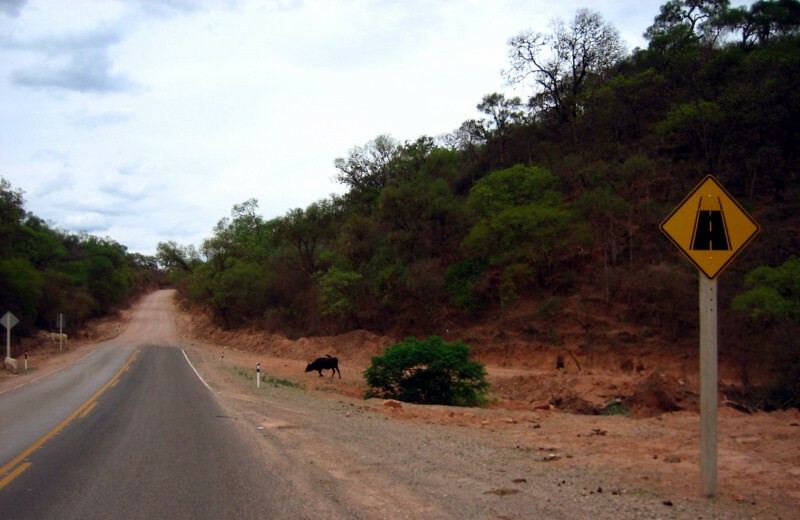 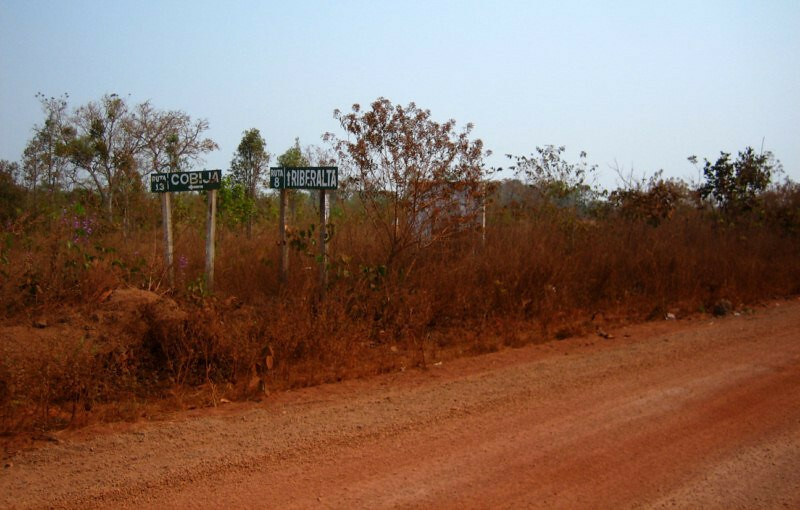 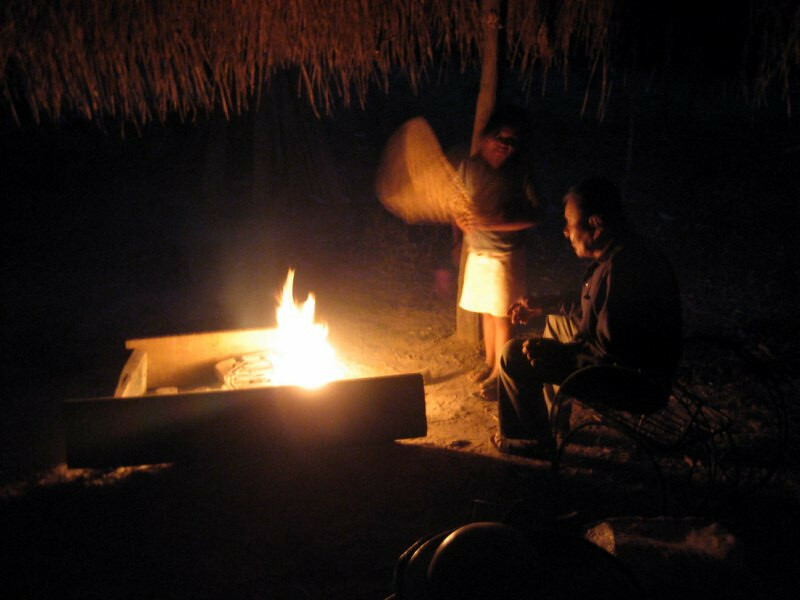 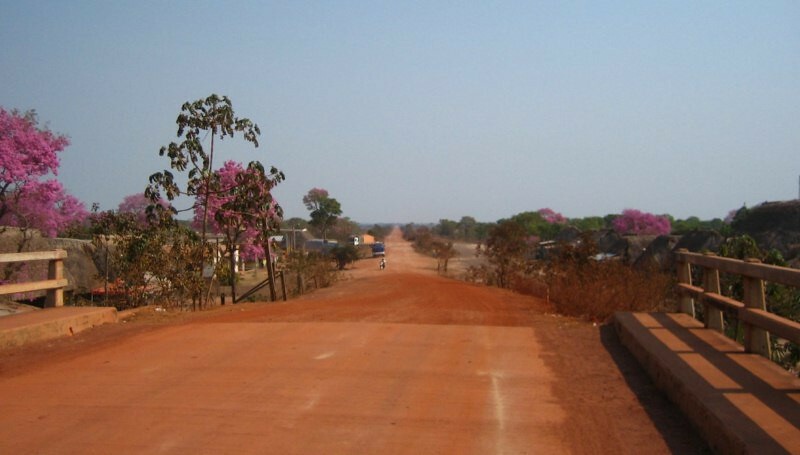 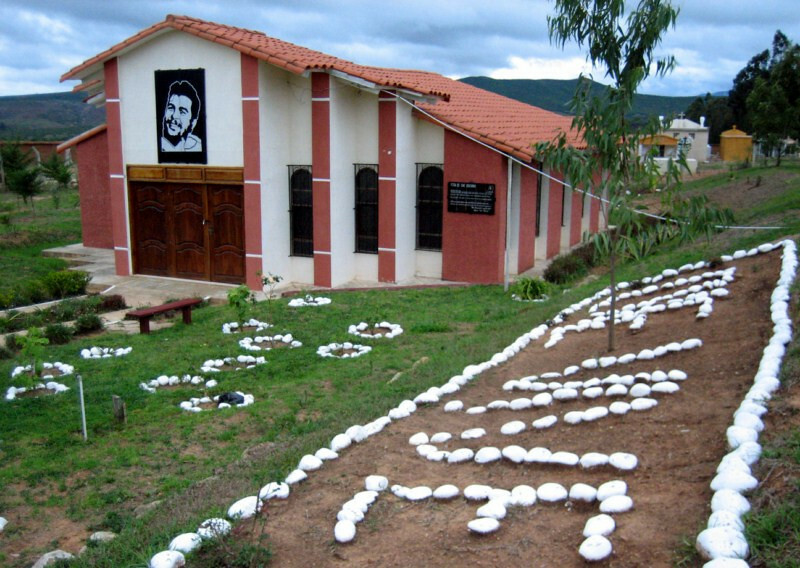 From Villamontes, you can head east to the border crossing at Ibibobo into Paraguay’s Chaco. 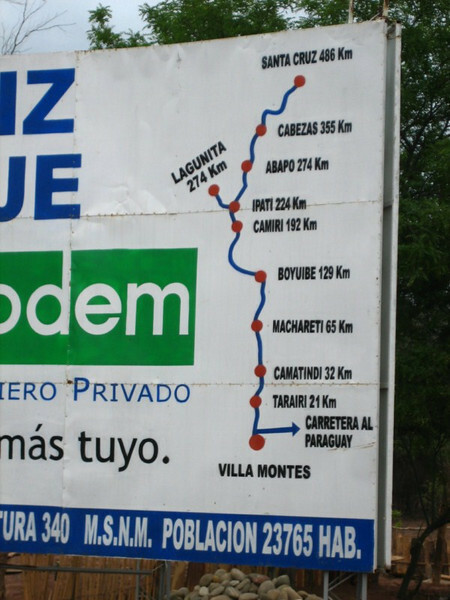 A distance board indicating the 500-odd kms to Santa Cruz. 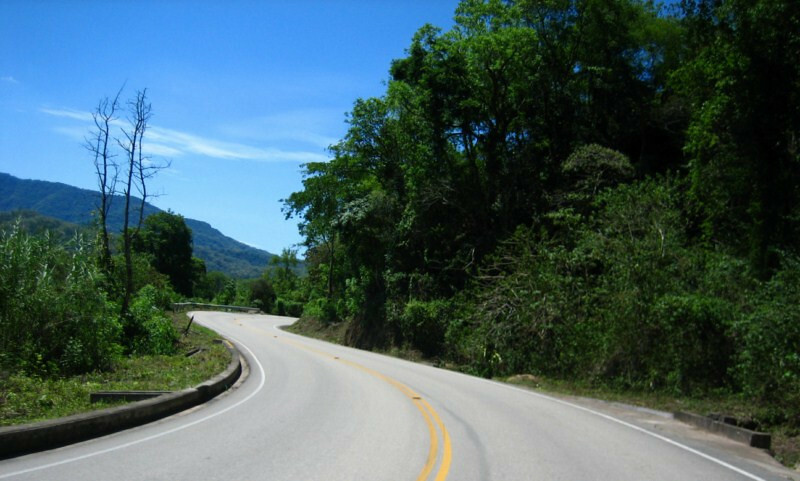 It was a flat ride on the well-maintained pavement with a few undulating hills and lots of greenery. 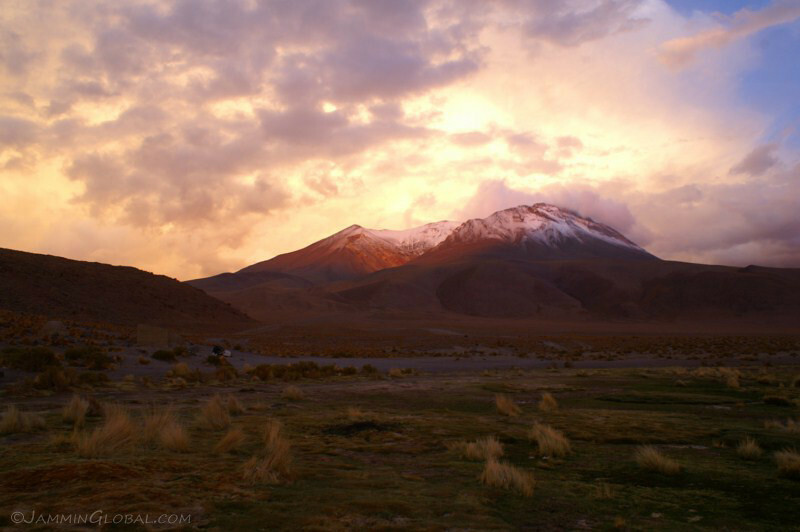 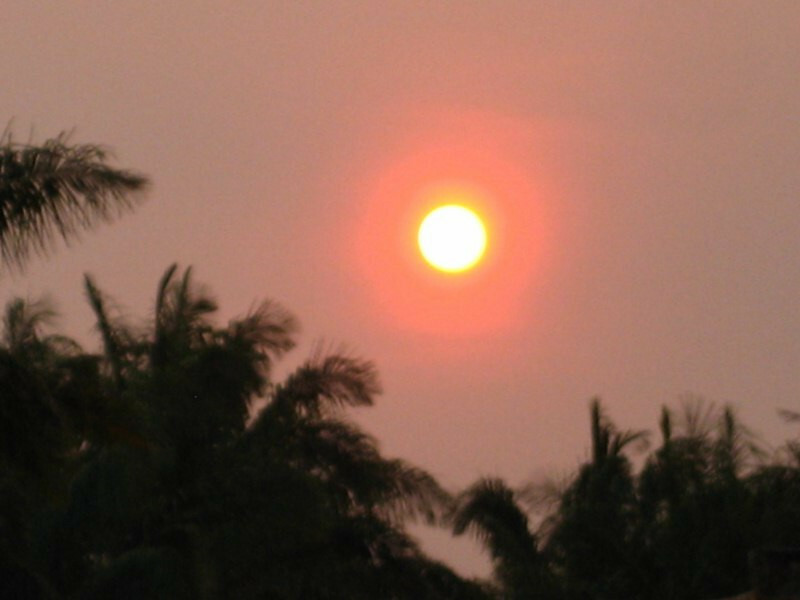 But the temperature picked up as the Andes dropped back to the west and the sun shone strong. 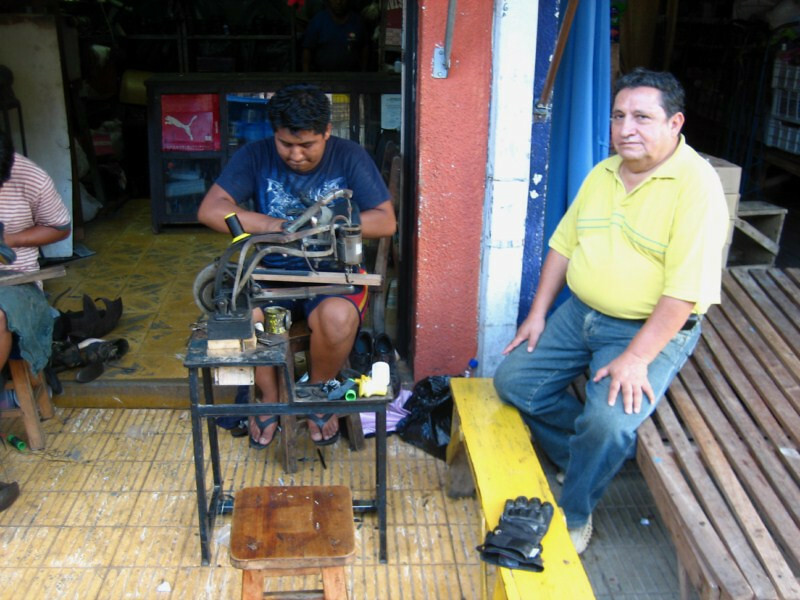 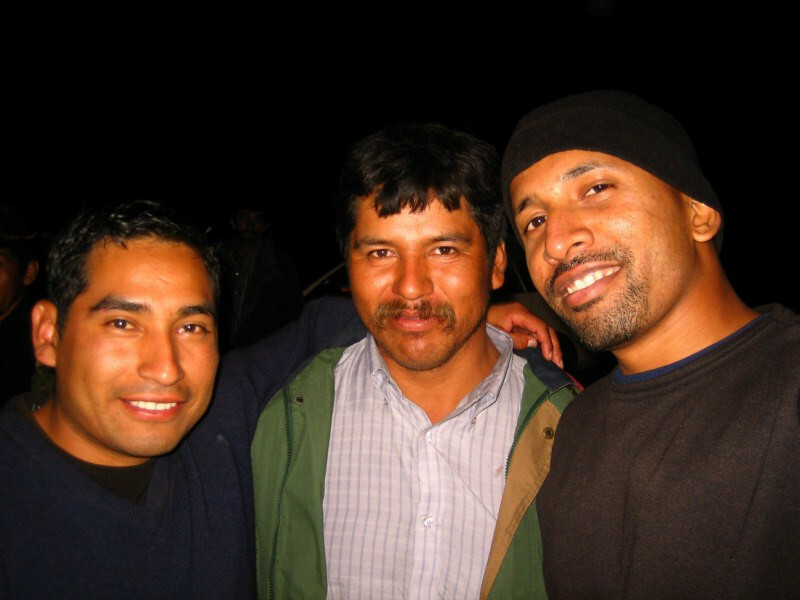 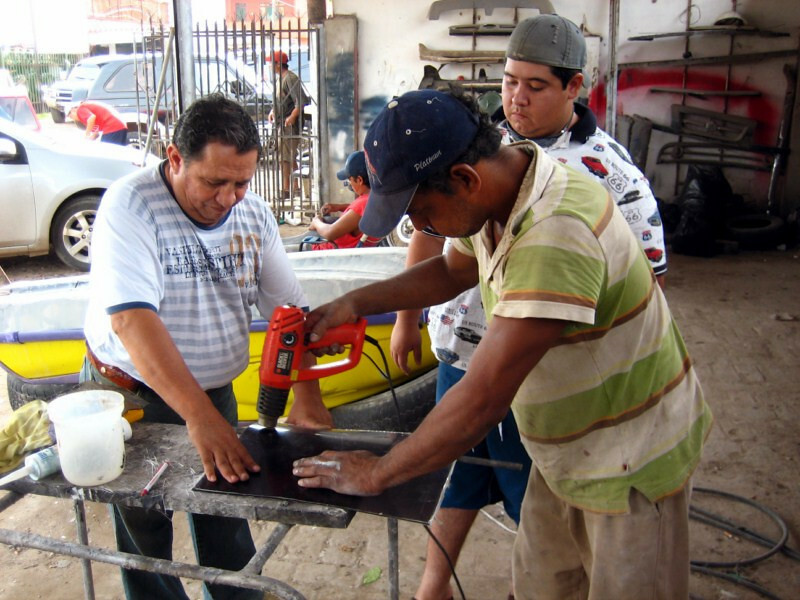 Alfonso (from La Paz) contacted his friend Oscar in Santa Cruz to help me get some bike maintenance done. 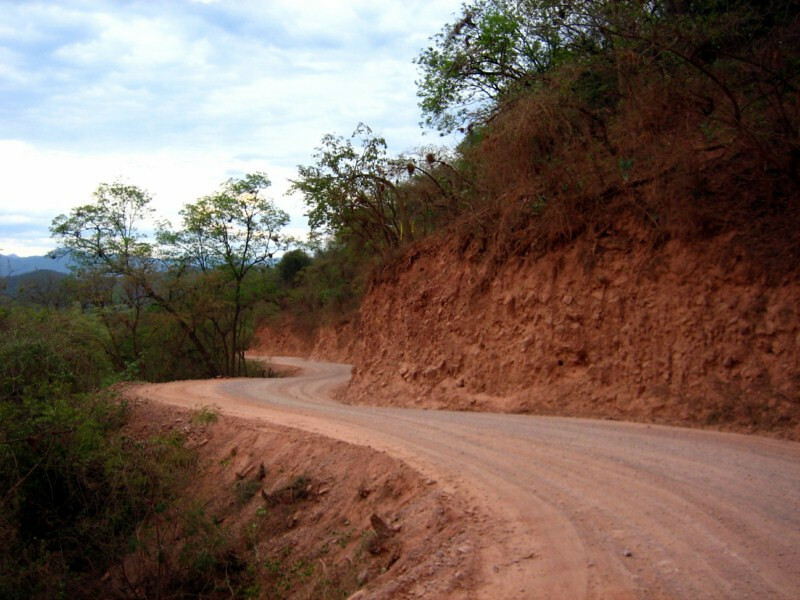 He and his son, Miguel are gear heads, as well, but of the 4×4 kind, doing rallies in a modified Range Rover. 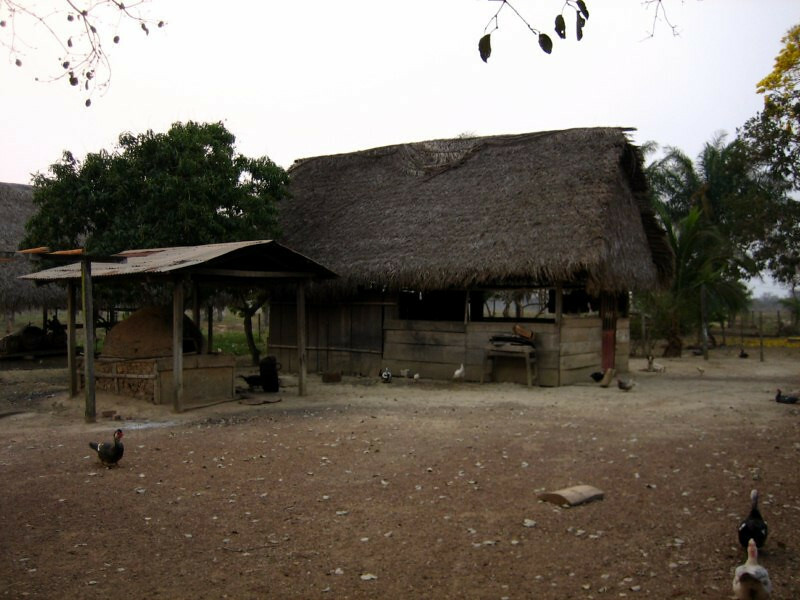 We’re having a Sunday meal with his mother at a country-style restaurant. 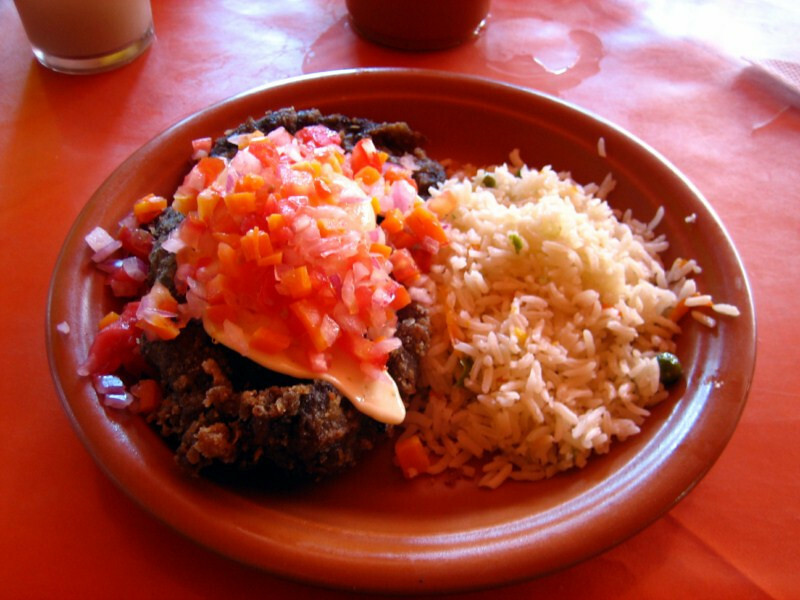 Steak, a-la milanesa style (breaded and fried) with rice and salad. 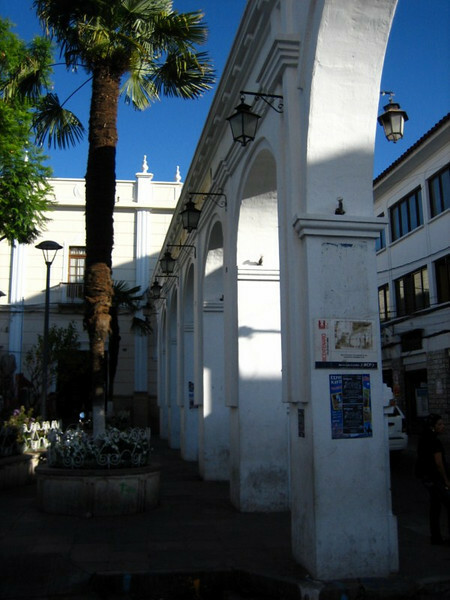 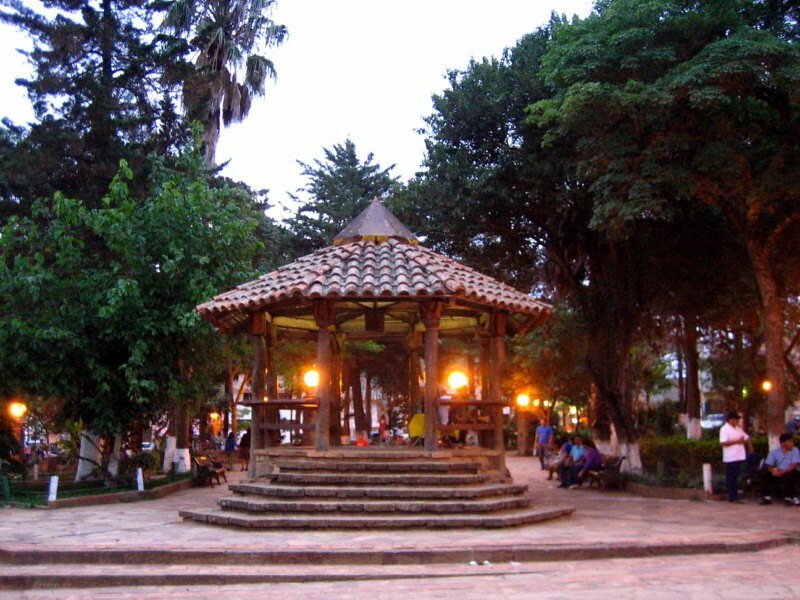 The shady central plaza of Santa Cruz de la Sierra, the most populous city in Bolivia (all though La Paz and its neighboring cities seem more crowded). 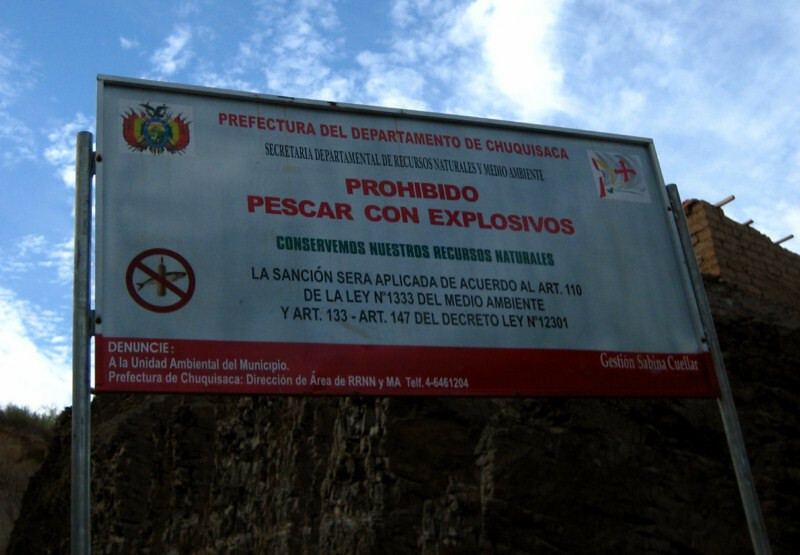 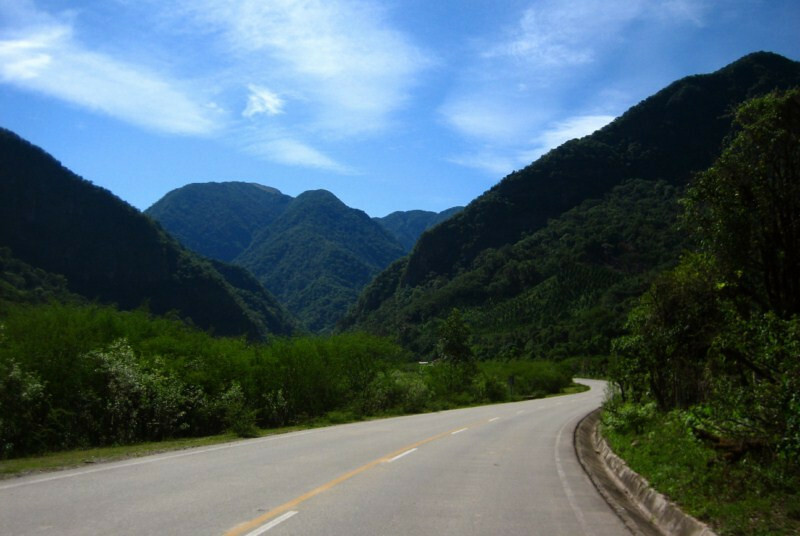 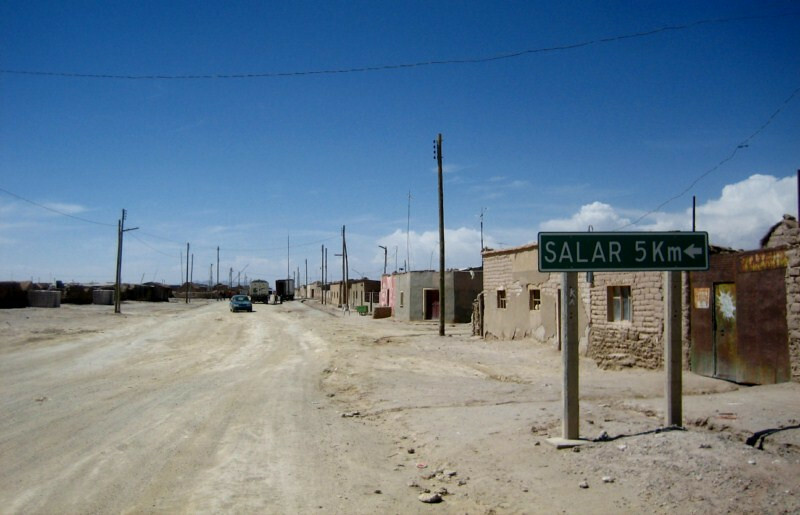 This city has been in the news recently after discoveries of huge natural gas reserves nearby and their continued demand for autonomy from the rest of Bolivia. 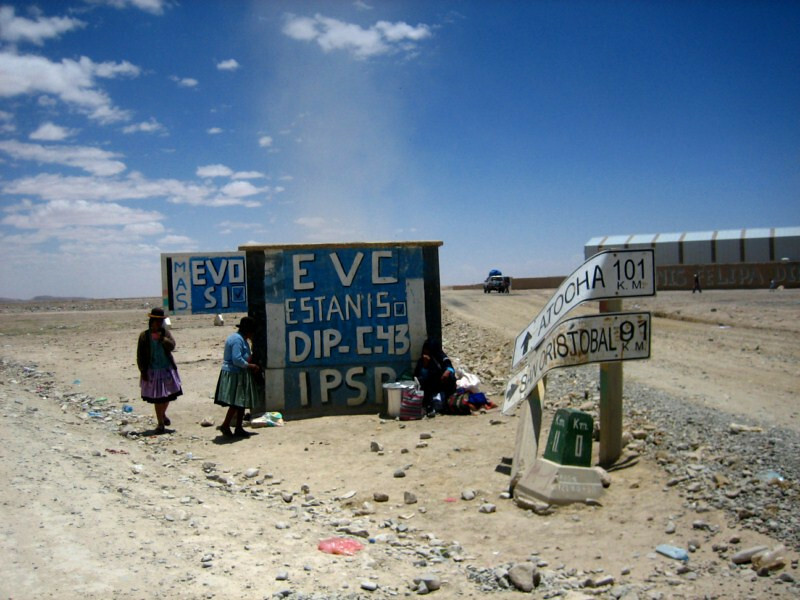 The population has been more right-leaning than Evo Morales’ left-leaning La Paz and the Andean side of Bolivia. 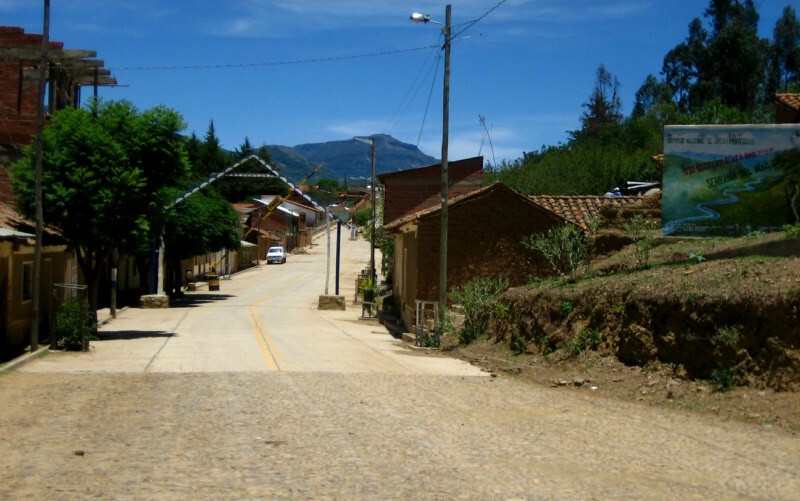 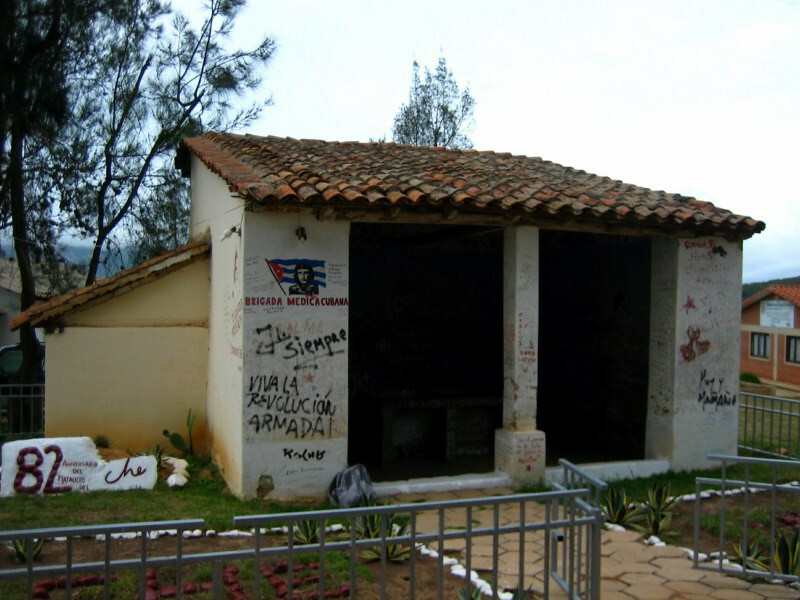 Their desire to move away from federal Bolivia shows through with the locals considering themselves more Brazilian than Bolivian and the climate seems to agree with that, as well. 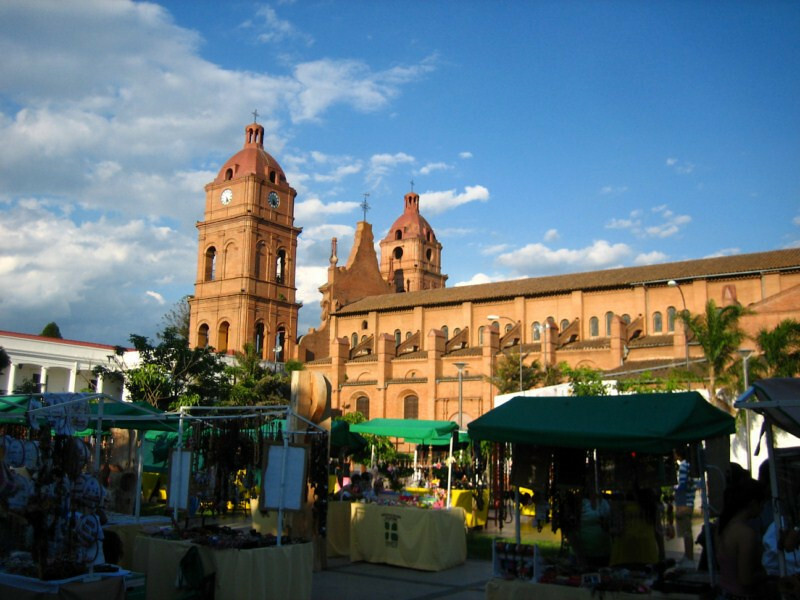 The large Jesuit-styled cathedral with a weekend crafts market in its shadows. 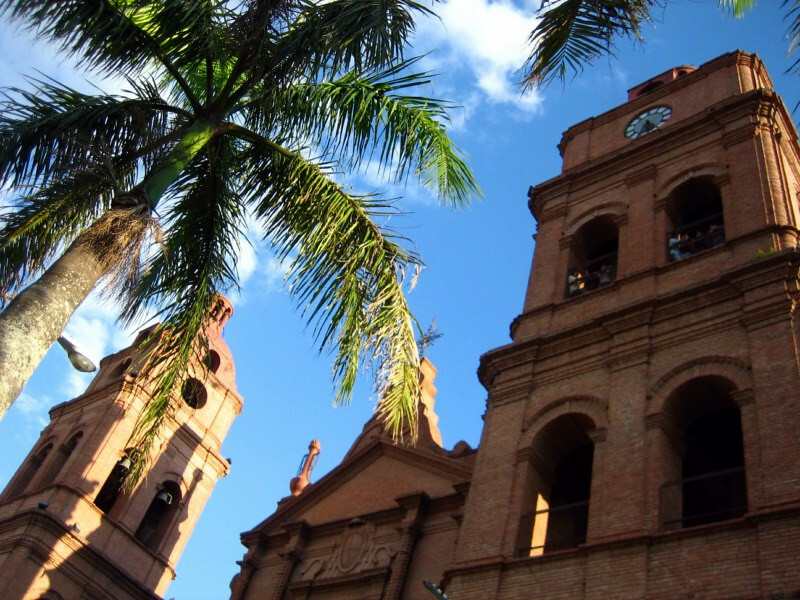 The brick face towers over the central plaza, but I was told most people are only religious here for ceremonial reasons and more easily bow down to El Dinero than hesus. 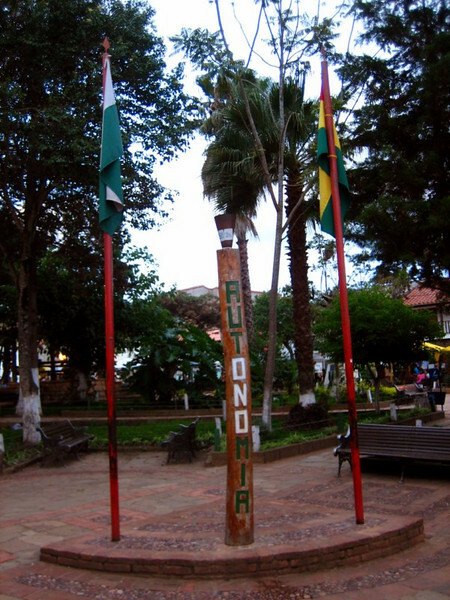 The government house proudly displaying the green and white flag of a hoped autonomous Santa Cruz rather than Morales’ multi-colored flag. 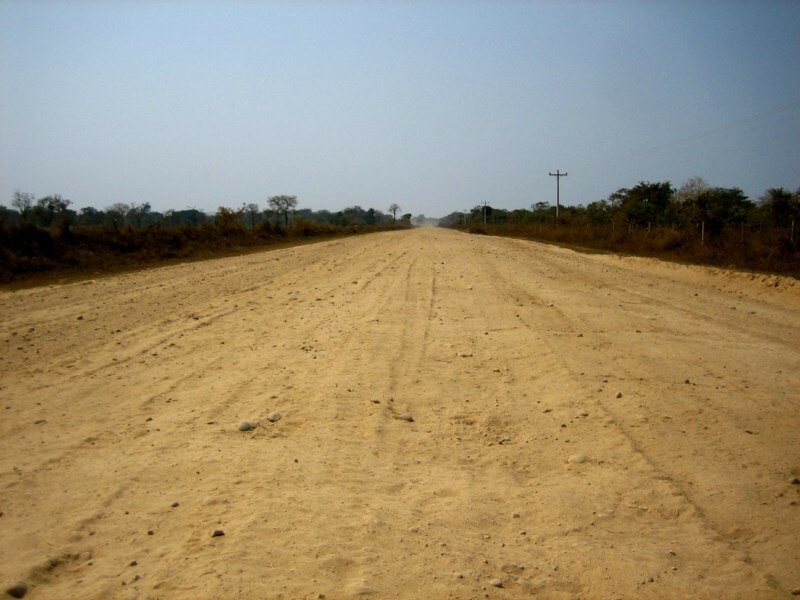 I thought seeking autonomy was still in the discussion stages, but with the local government touting it, they must be serious about their demands. 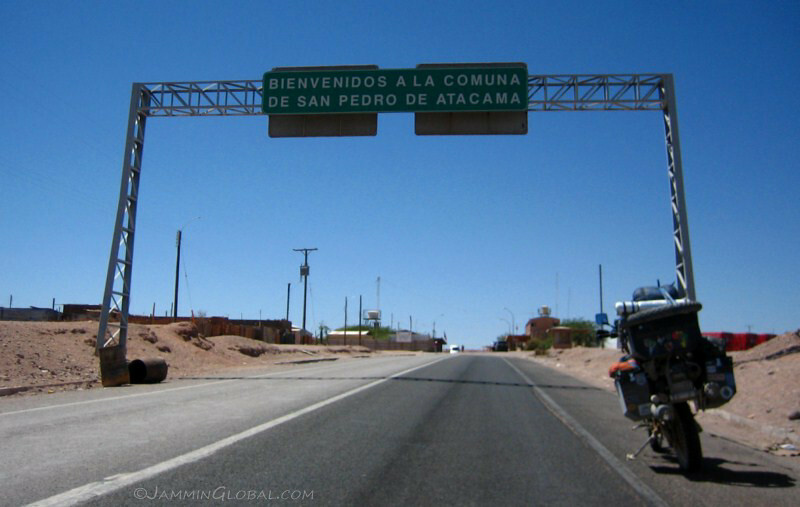 The northern states (where I passed through heading to the Amazon) were also seeking autonomy since they feel the federal government in La Paz doesn’t do enough for them and this all works against Morale’s drive to centralize things around the capital. 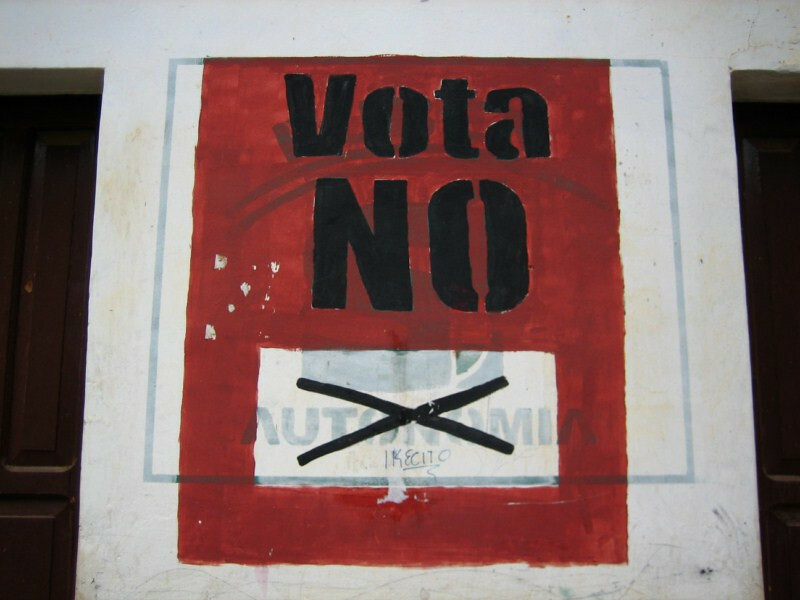 While I initially supported the voice of indigenous people finally gaining stature in this country, it now appears he’s heading for single-party autocracy rather than a true multi-party democracy. 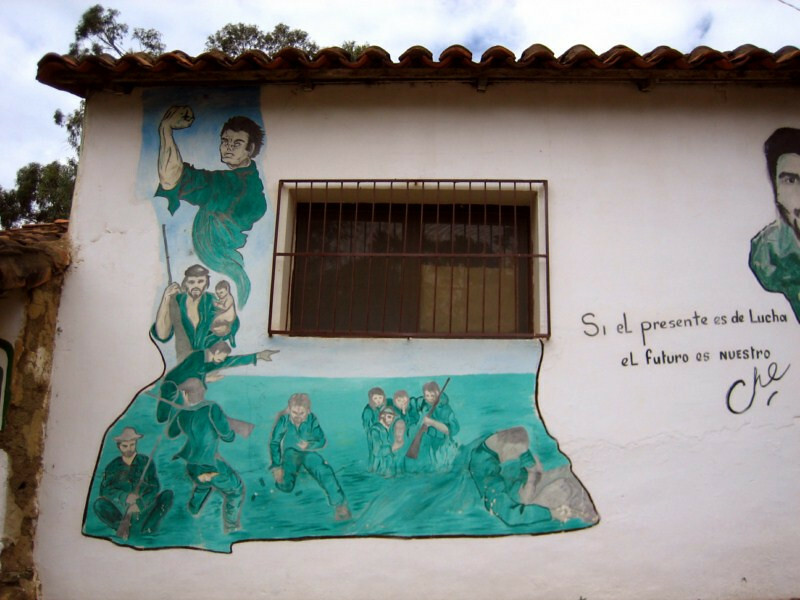 Power corrupts all. 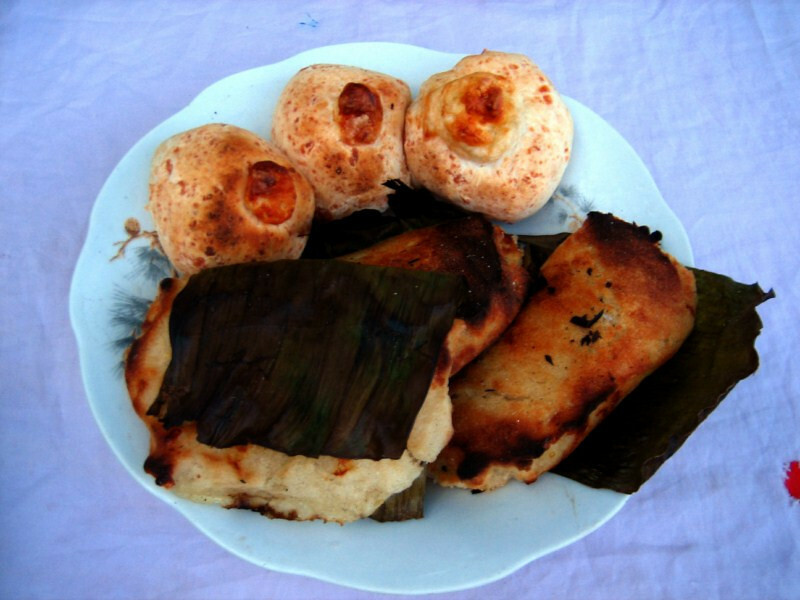 Getting a plate of various rice and corn dough grilled snacks. 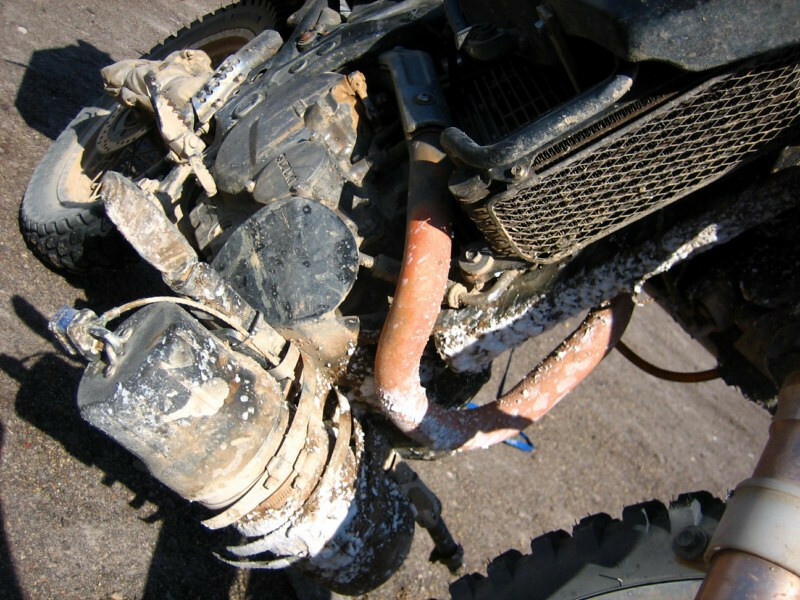 And then it was down to the business of preparing sanDRina for the extended off-road riding coming up. 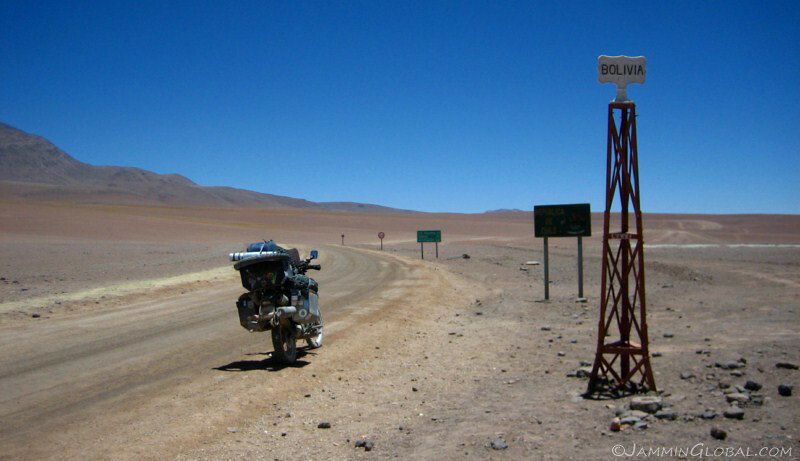 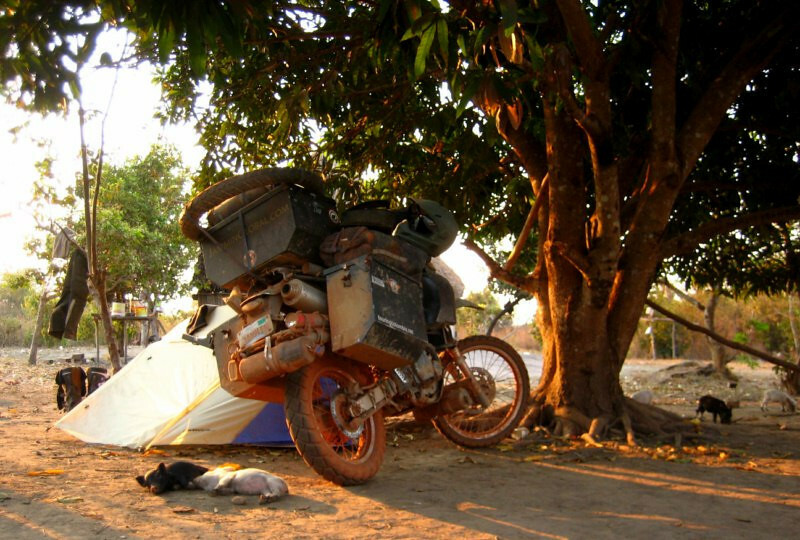 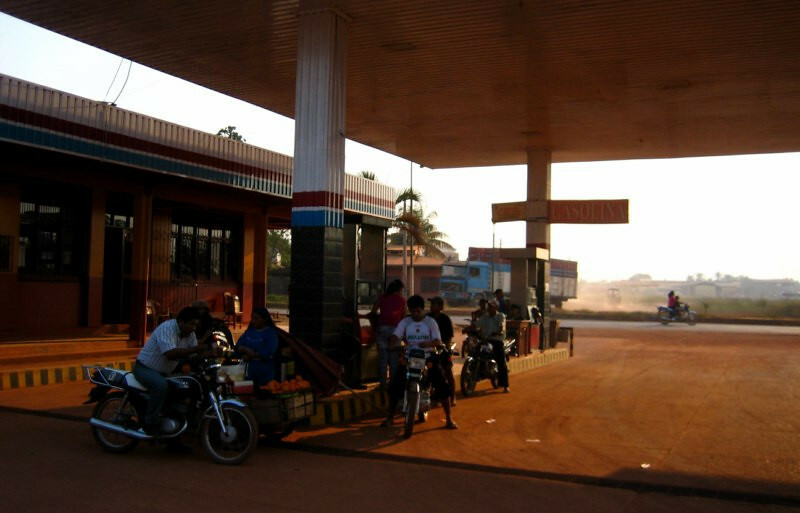 I waited till I got to Bolivia to replace some big-ticket items on the bike since everything is much cheaper here compared to the neighboring countries. 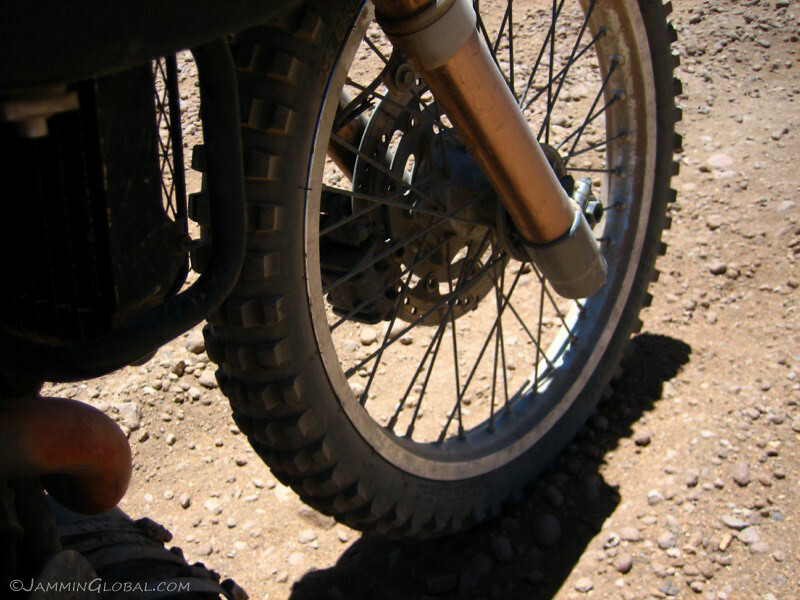 I found the tires I needed at Becar Motos, a well-known shop in the motorcycling community. 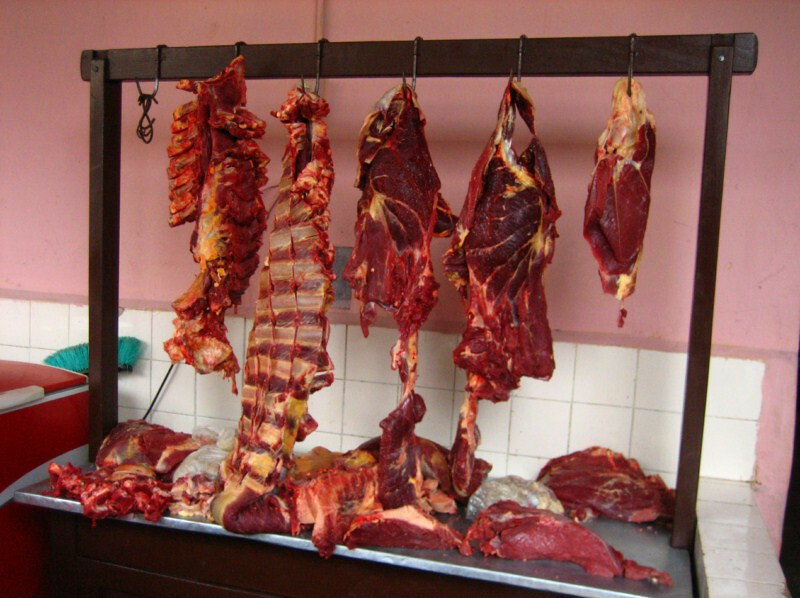 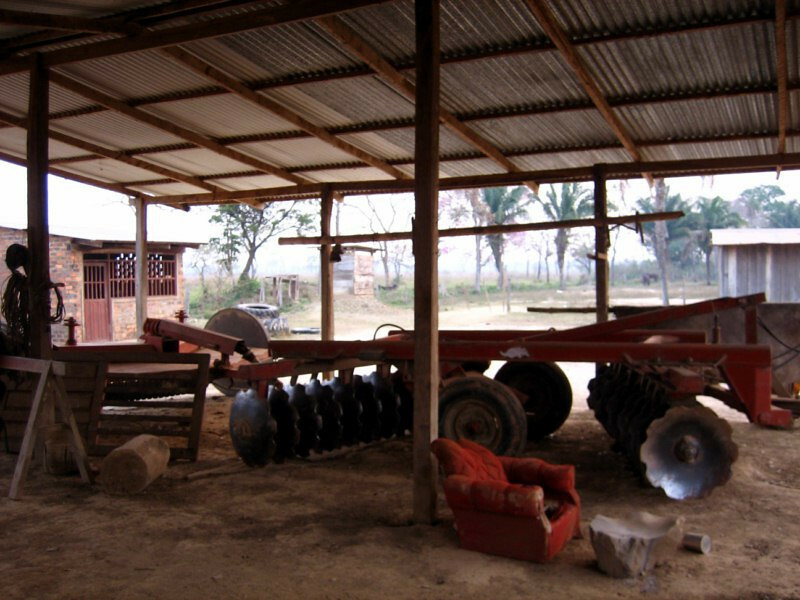 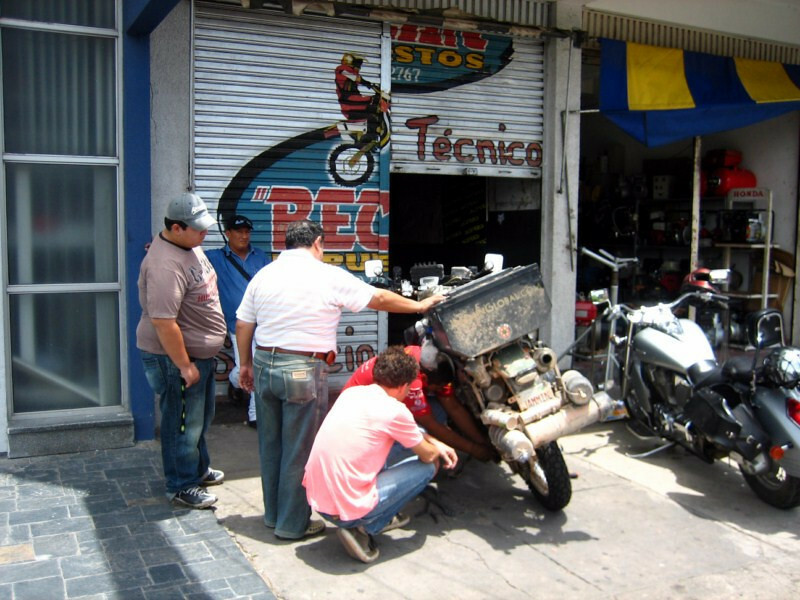 In Bolivia, if you buy something from a shop, you can usually mount it or have it serviced there for free. 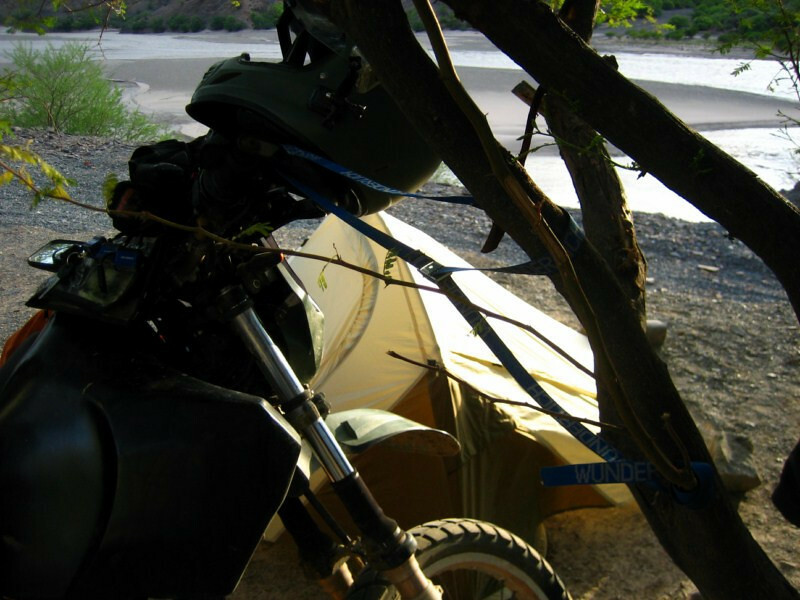 I bought a rear Pirelli MT-60, which is a 50/50 tire and a cheaper set of Kenda tires; a rear K270 (another 50/50) and a more aggressive K257D for the sandy Lagunas Route. 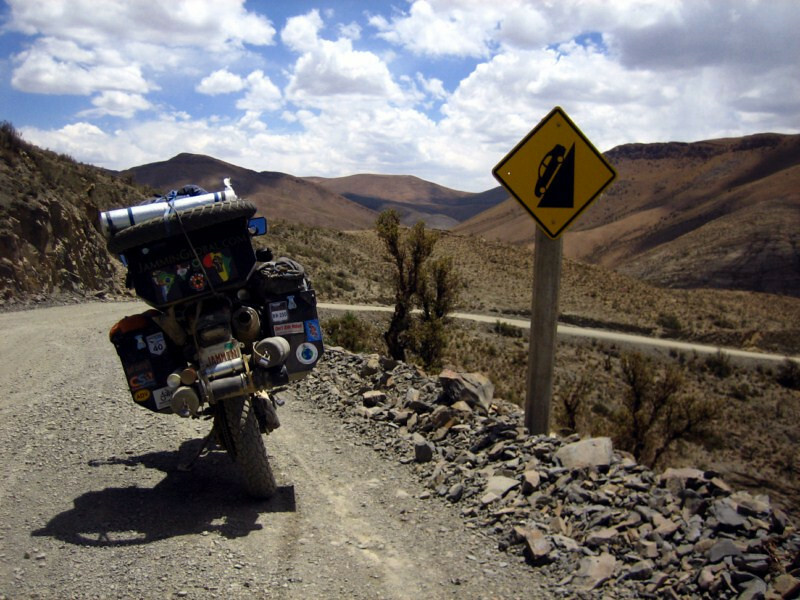 I wanted to make sure that I could make it back to Buenos Aires without needing to buy tires in expensive Patagonia. 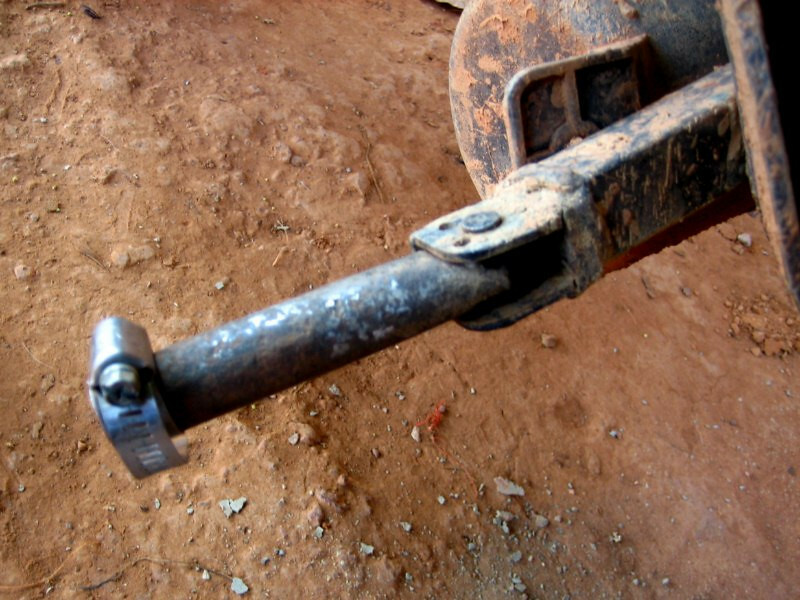 I also found some high quality DID chains and I mounted one and kept one as a spare. 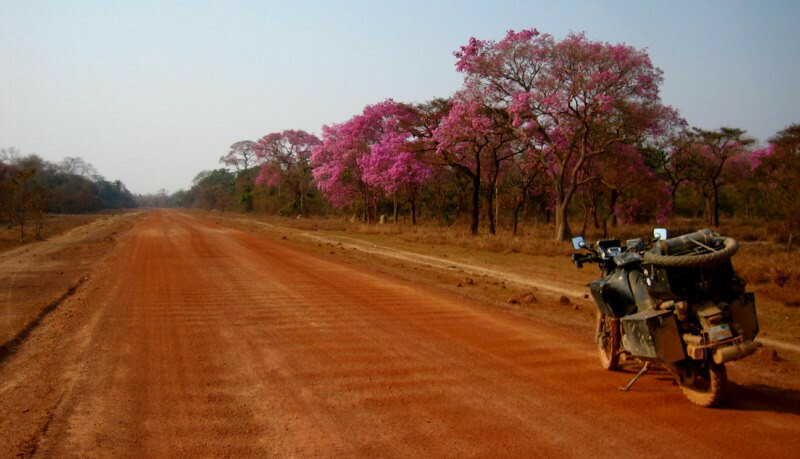 They were not the preferred cross-ring style, but o-ring nonetheless and it would be much better than the Iris chain that I mounted in Sao Luis, Brazil that stretched and formed kinks in its links within just 13,000 kms (8,125 mi), which is around half the life of a good quality chain. 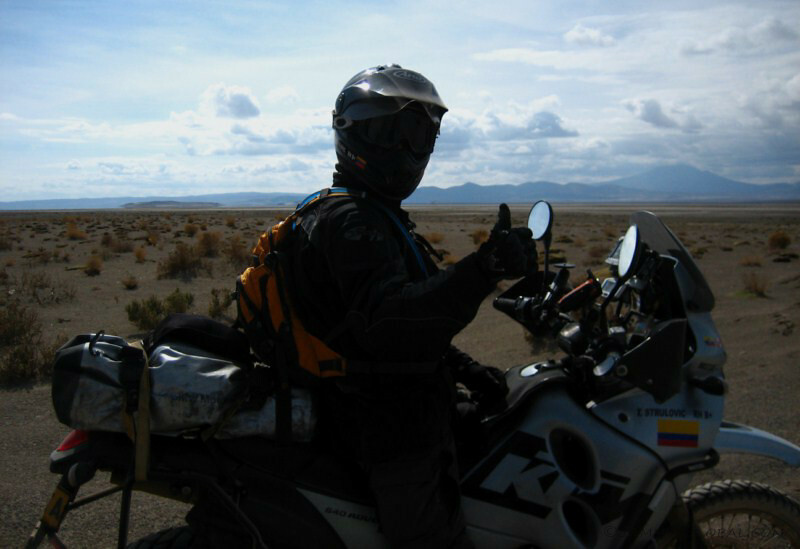 Iris is a brand from Spain and I would not recommend it, as other riders concur. 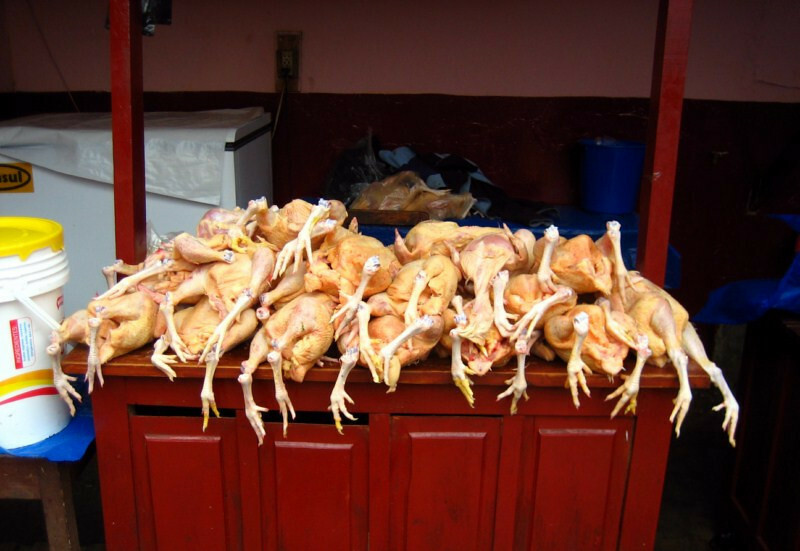 It’s easily available all through Latin America but lasts much shorter than quality Japanese chains. 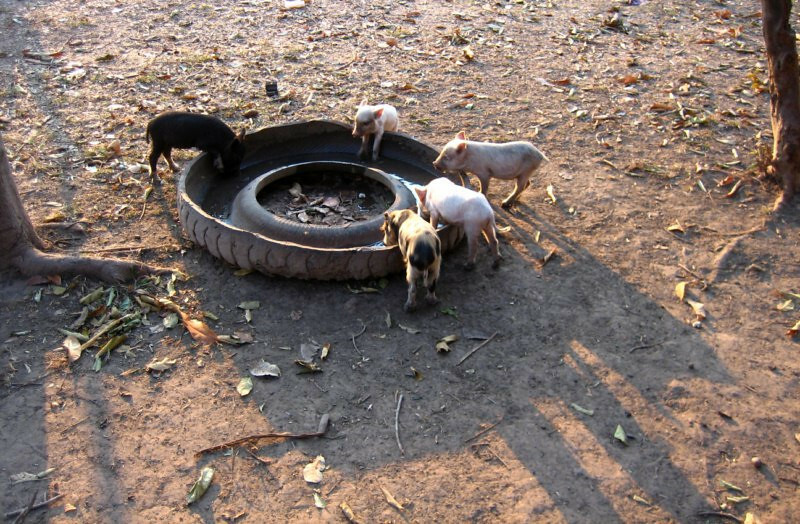 This is Gert here throwing in a helping hand. 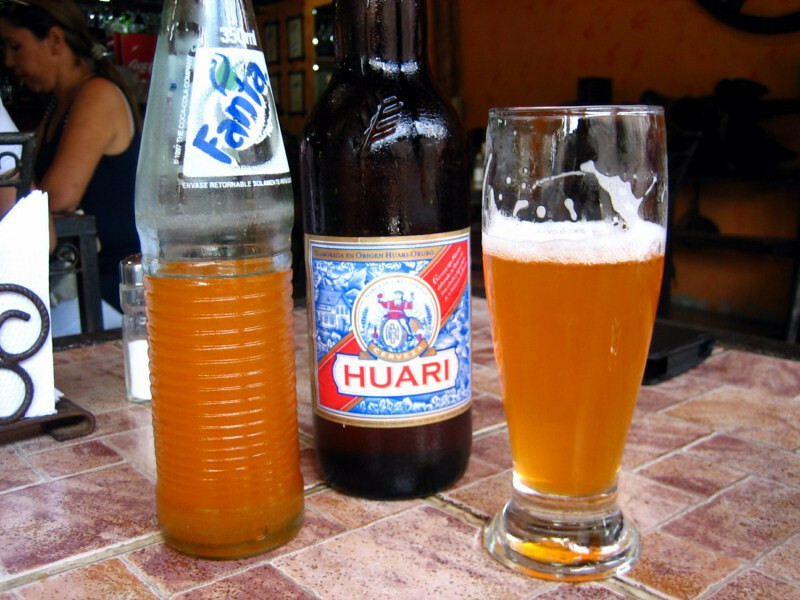 I contacted Gert through the HorizonsUnlimited communities page and he informed me of Becar Motos and introduced me to drinking a beer Santa Cruz-style, where you mix some Fanta with the lager. 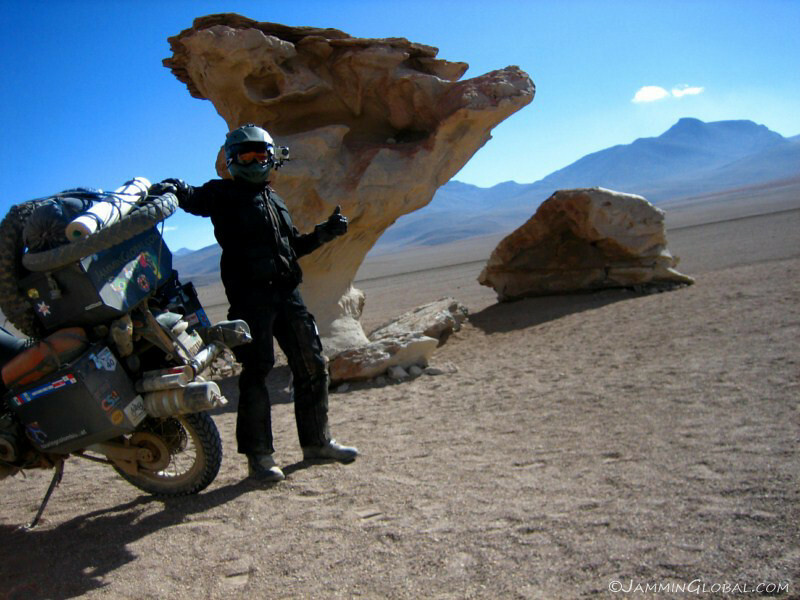 He’s from the Netherlands and ended up here after a bike trip down the Americas and now has setup a few businesses. 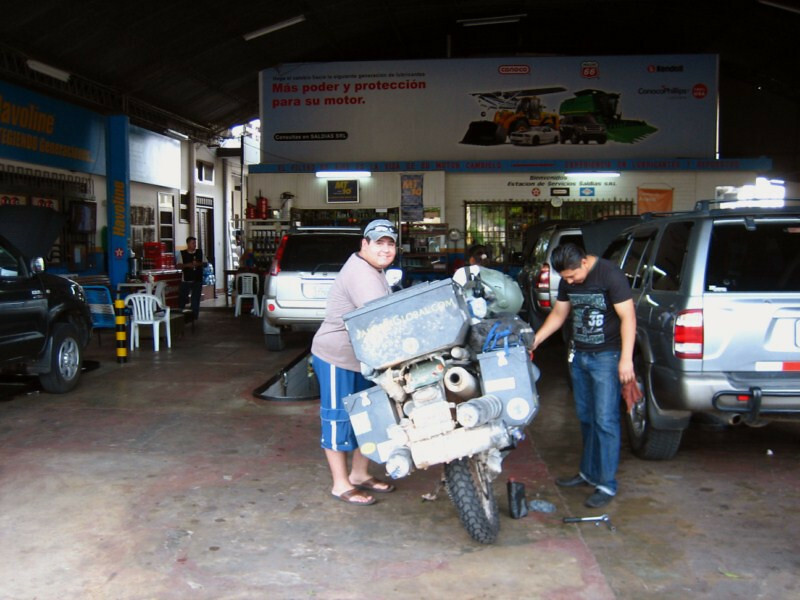 Changing engine oil and as explained, you only have to pay for the new oil and they change it for free. 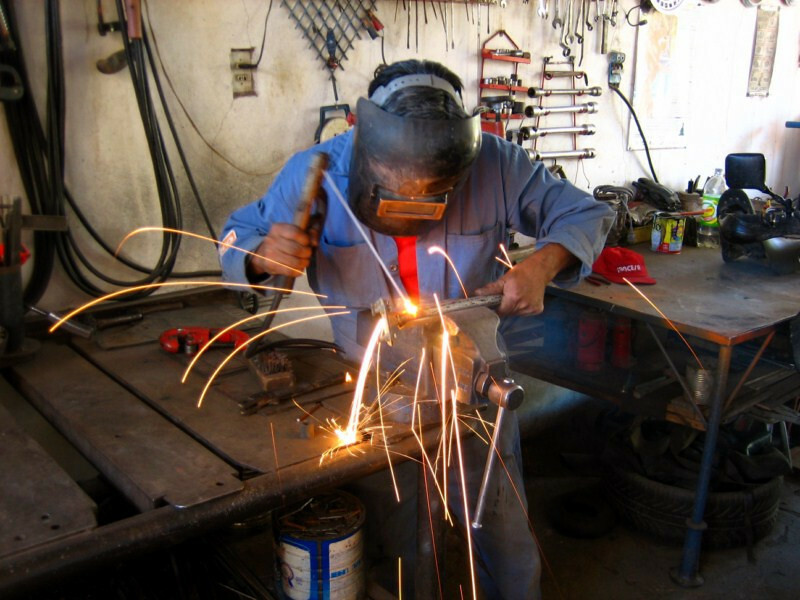 However, since I don’t like to let anyone else put a tool on sanDRina (unless I highly trust them), I did the oil change myself, but they provided everything I needed, including some diesel to clean the reusable Scotts stainless-steel mesh oil filter. 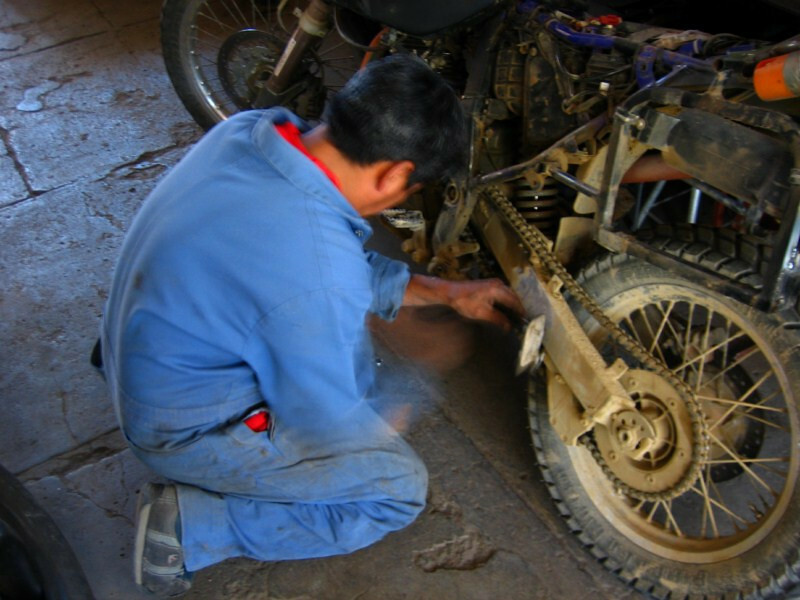 Getting a spare key made from an original Suzuki blank for B50 (US$7). 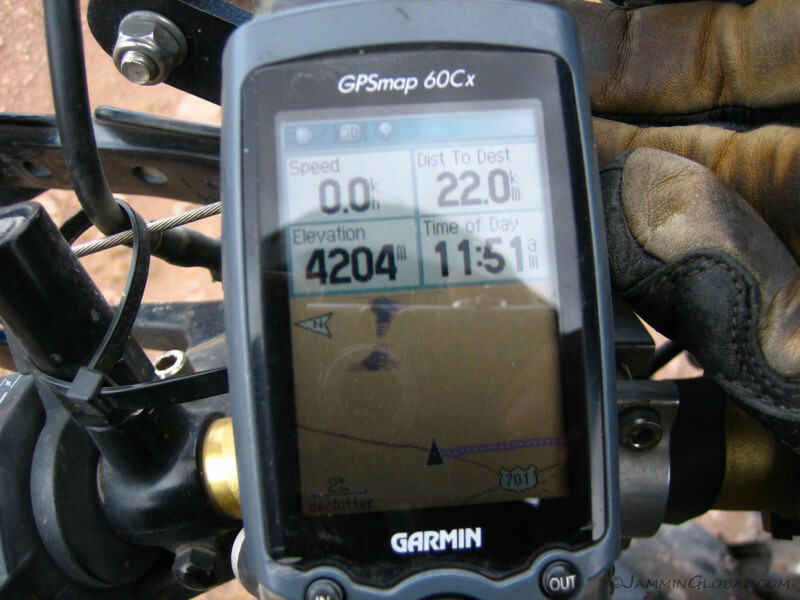 My old key was the original that came with the bike and it was 12 years old and slightly smoothed over. 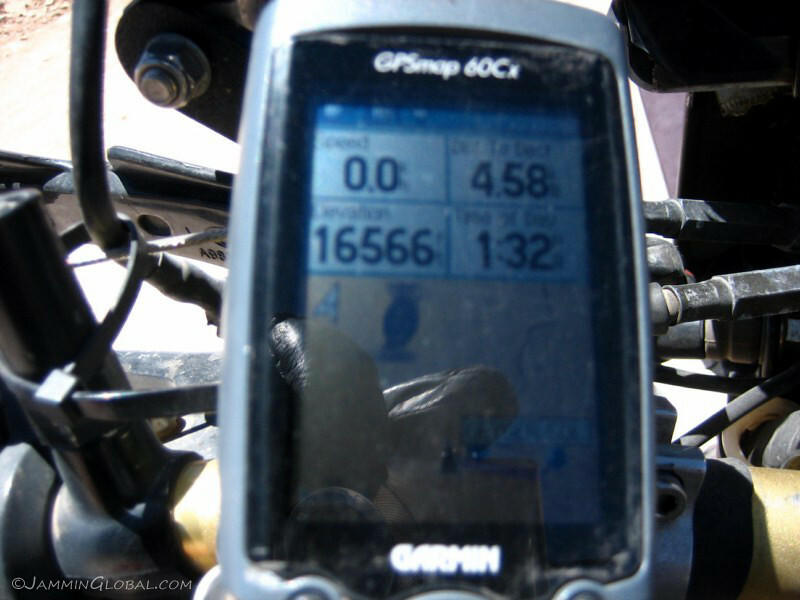 The new key felt crisp in the ignition. 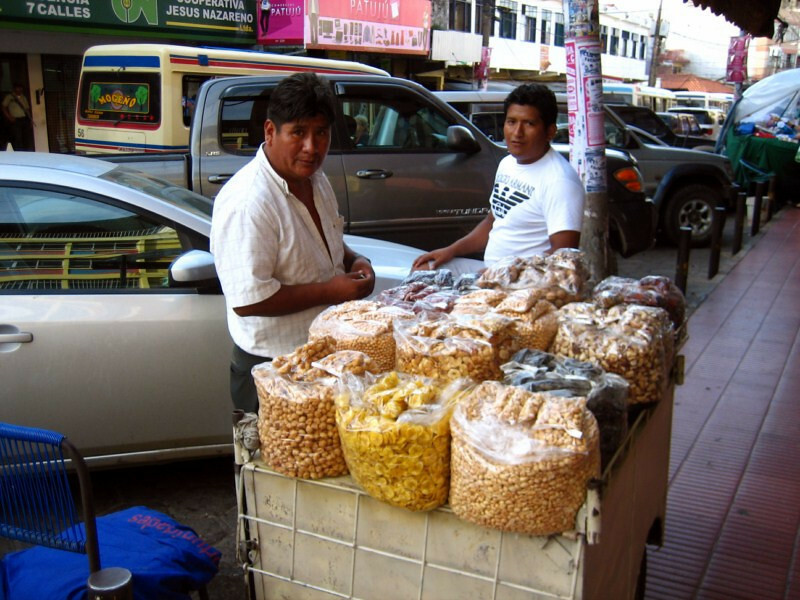 Stocking up on dried fruits and nuts. 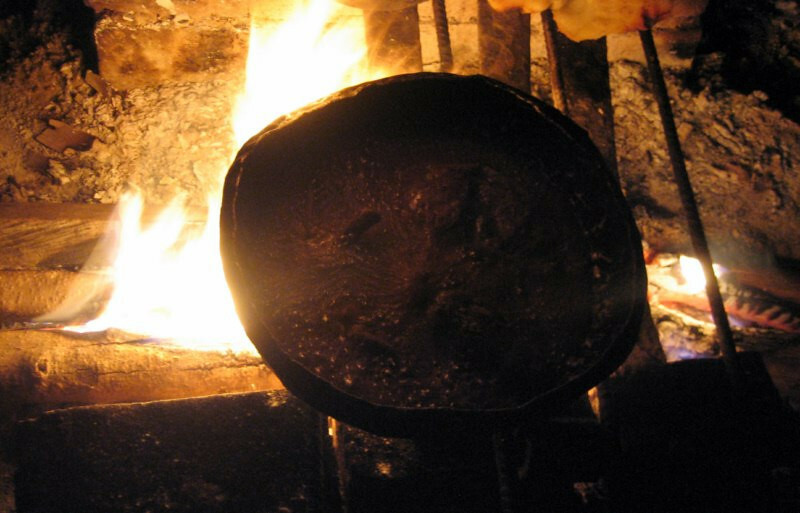 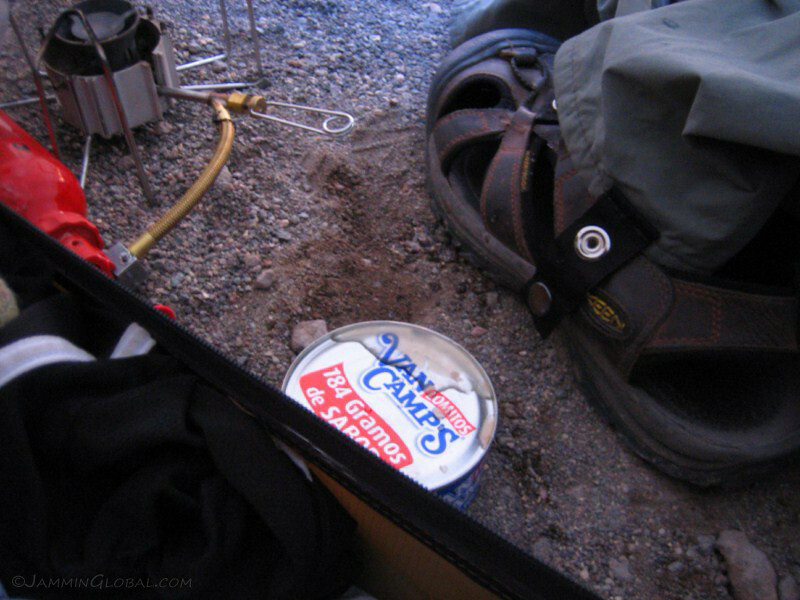 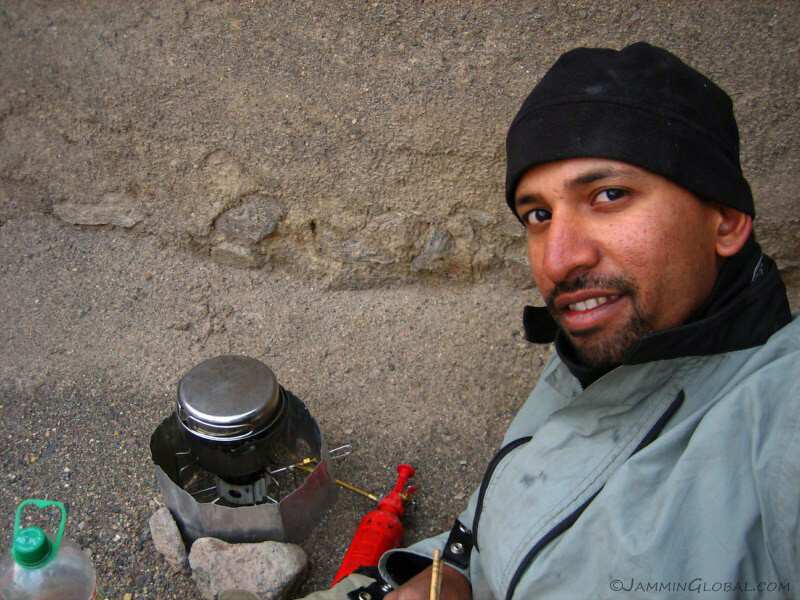 I like dehydrated prunes since they have a lot of fiber and help keep up healthy bowel movements, which can become constrained while camping in rough places. 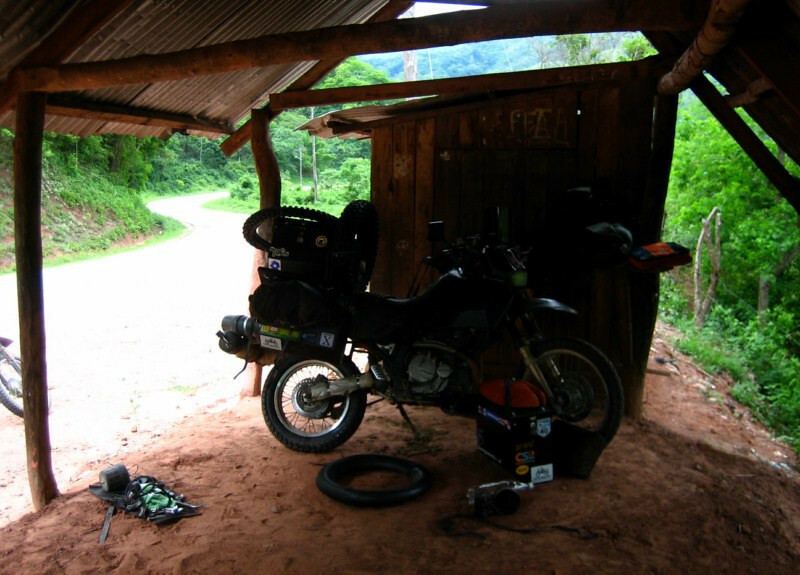 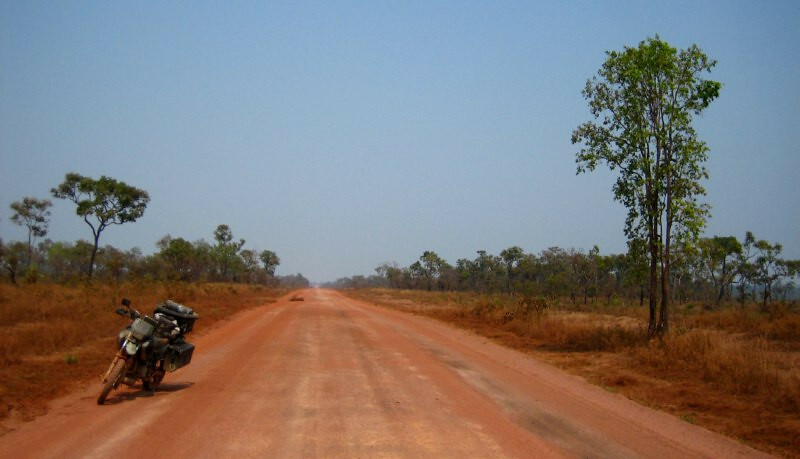 And usually when I’m riding off-road through remote places, I don’t stop for lunch and instead just snack on prunes and walnuts through the day. 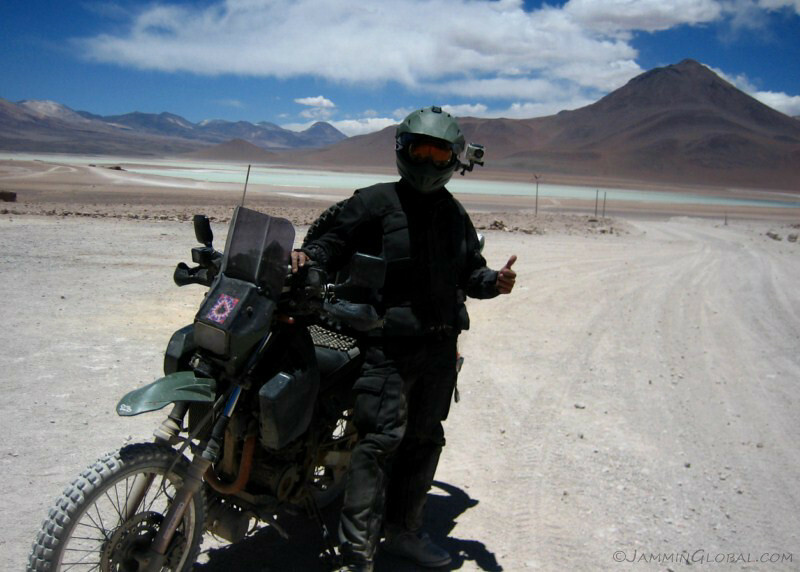 One major item I wanted to repair while in Bolivia was my primary riding gloves. 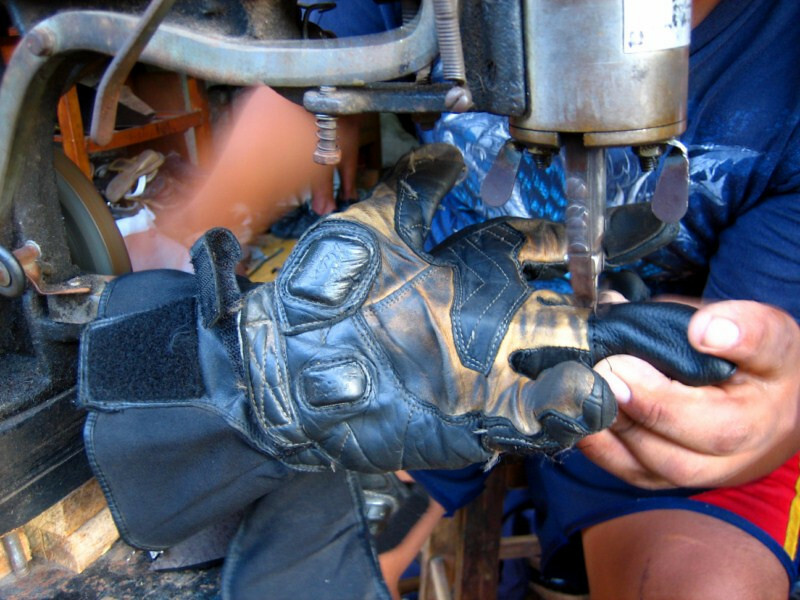 The Teknic Speedstar summer gloves have served me well but after about three years of use, the stitches in the fingers were coming loose and I knew I could have them repaired in good ol’ Bolivia, compared to Brazil or Argentina. 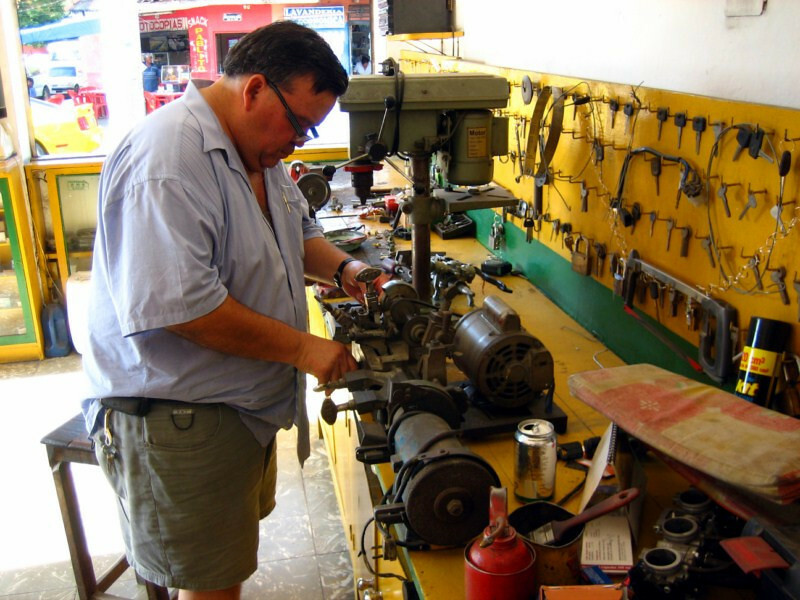 But even here, I was surprised at the number of cobblers that refused to repair them because it was going to be a complicated job. 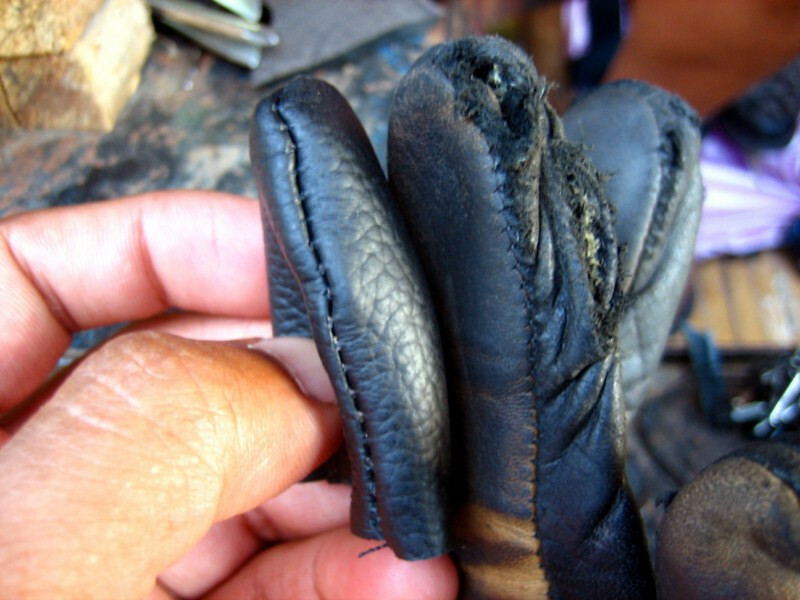 The cobbler had to slide the gloves onto a thin enough support to get the stitches to stick between the new leather cover and the older kangaroo hide. 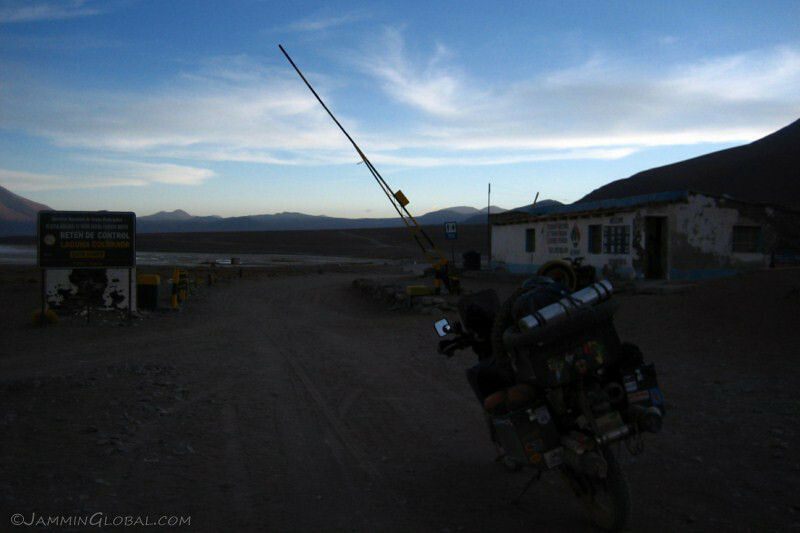 I also finally got the chance to make a new windshield, after breaking the earlier one as I left Bolivia for Brazil. 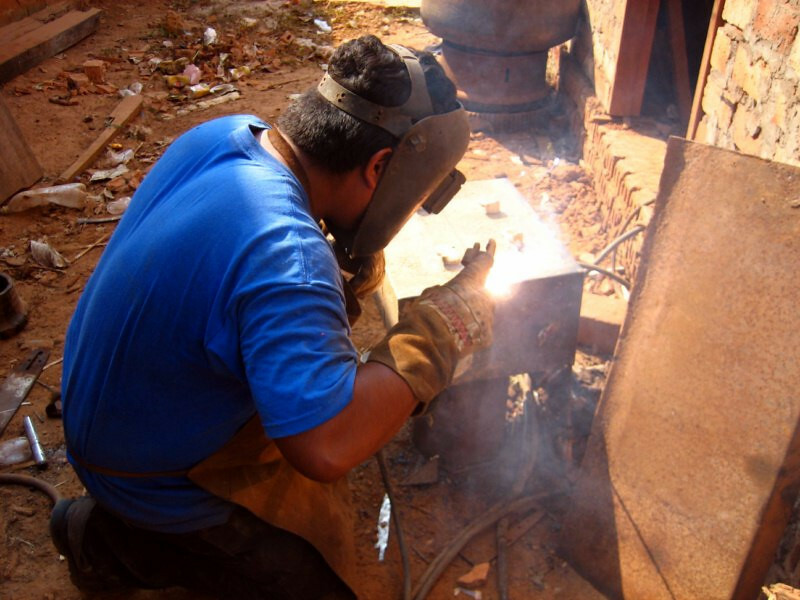 Having the experience of making the original shield in Chicago, I knew what materials and tools were needed. 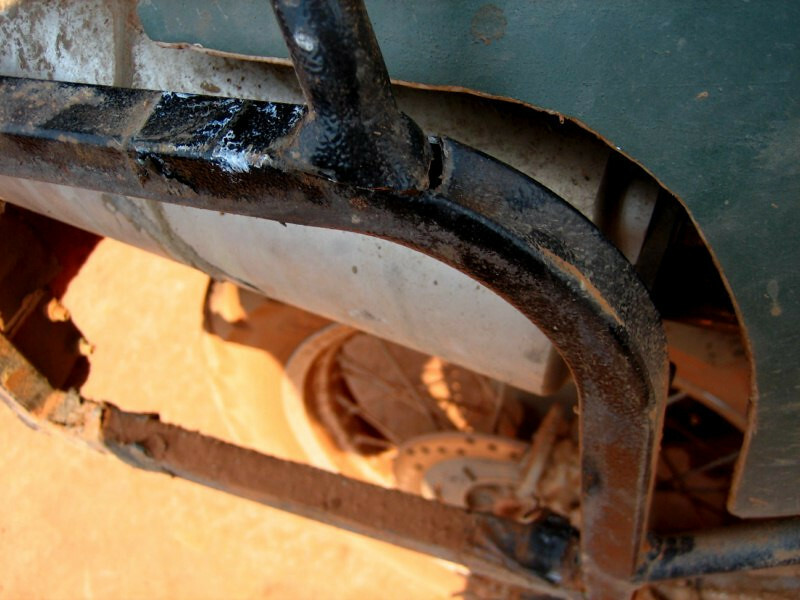 We sourced some tinted Lexan and found an autobody shop that had a heat gun to put the bends in the Lexan. 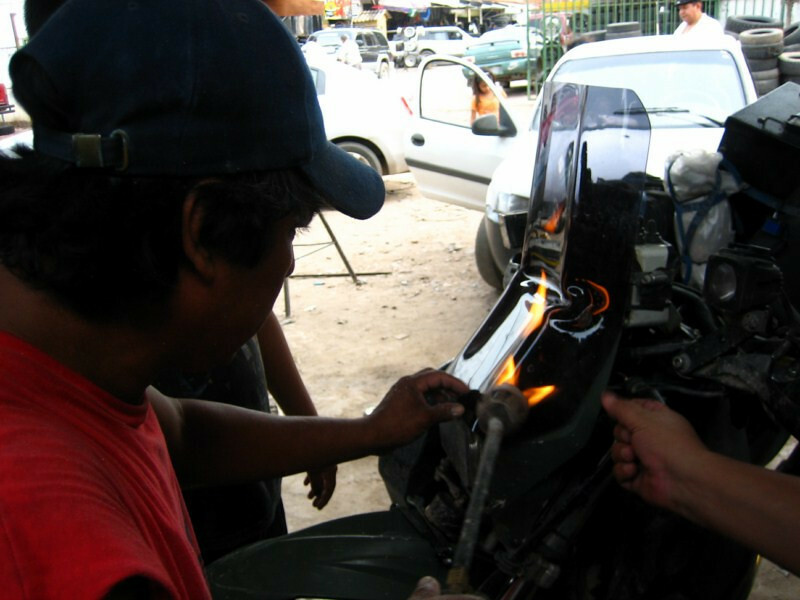 Molding the shield with a mini flame-thrower for the final adjustments on the headlight cowl. 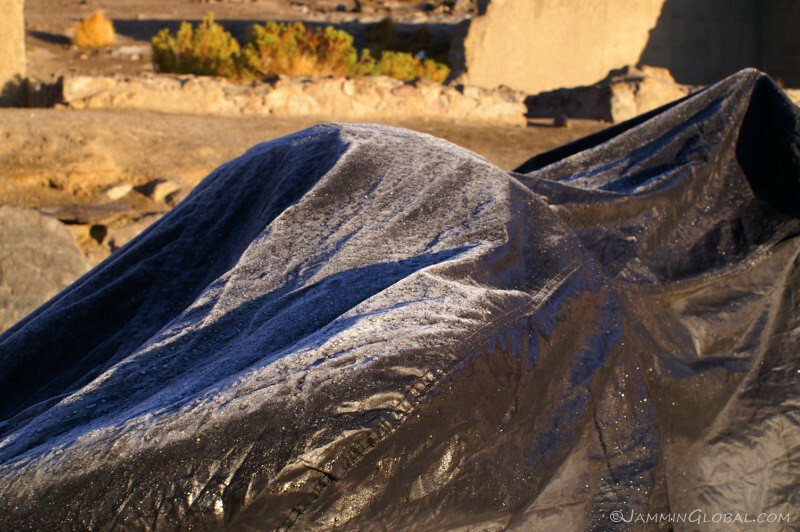 It’s small enough not to block too much air in hot climates and would provide adequate protection from the winds in Patagonia.